Description: Pastel Red Axanthic Caramel 1/11 x Ivory "PHOG" 1/11. 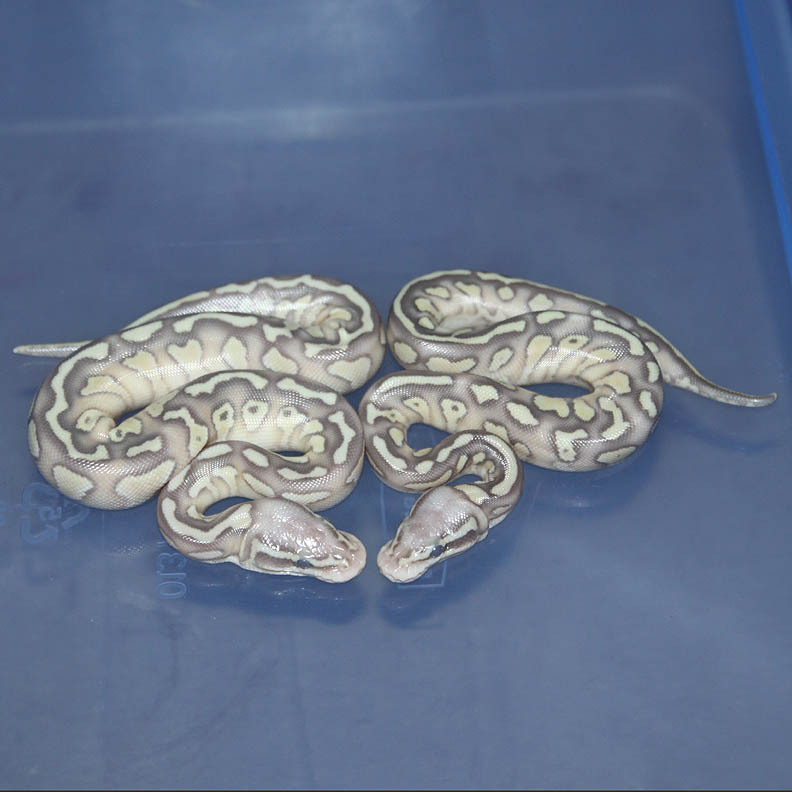 I wanted more females but I'll take what I can get. 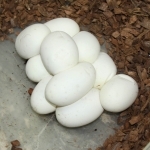 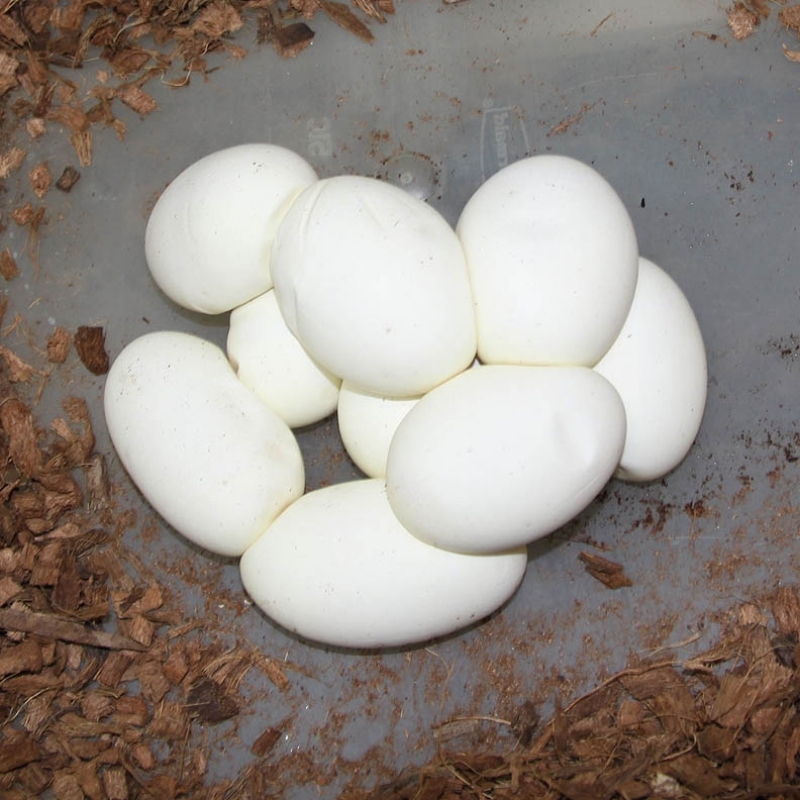 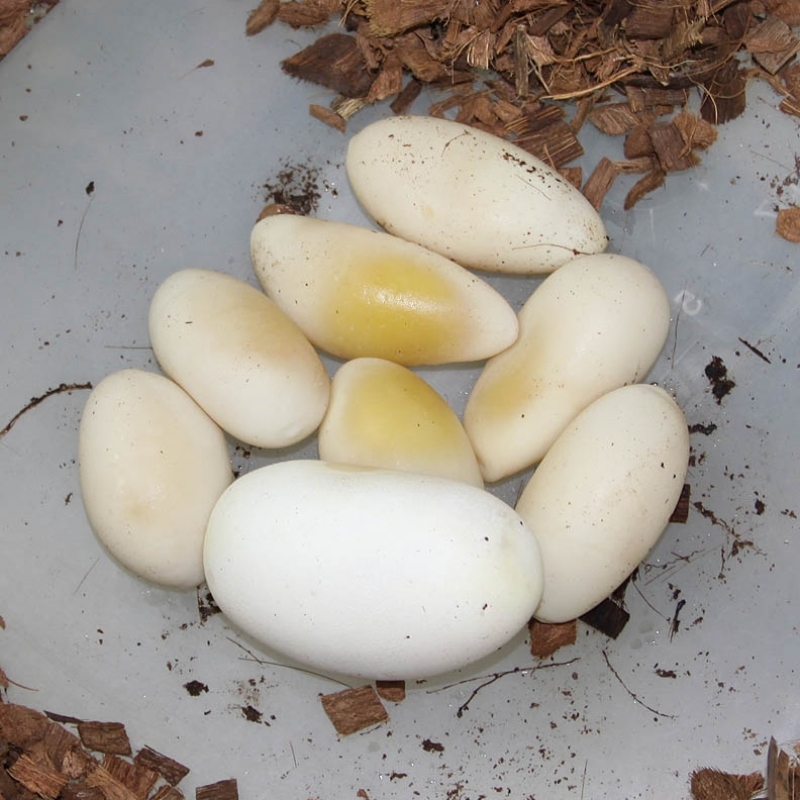 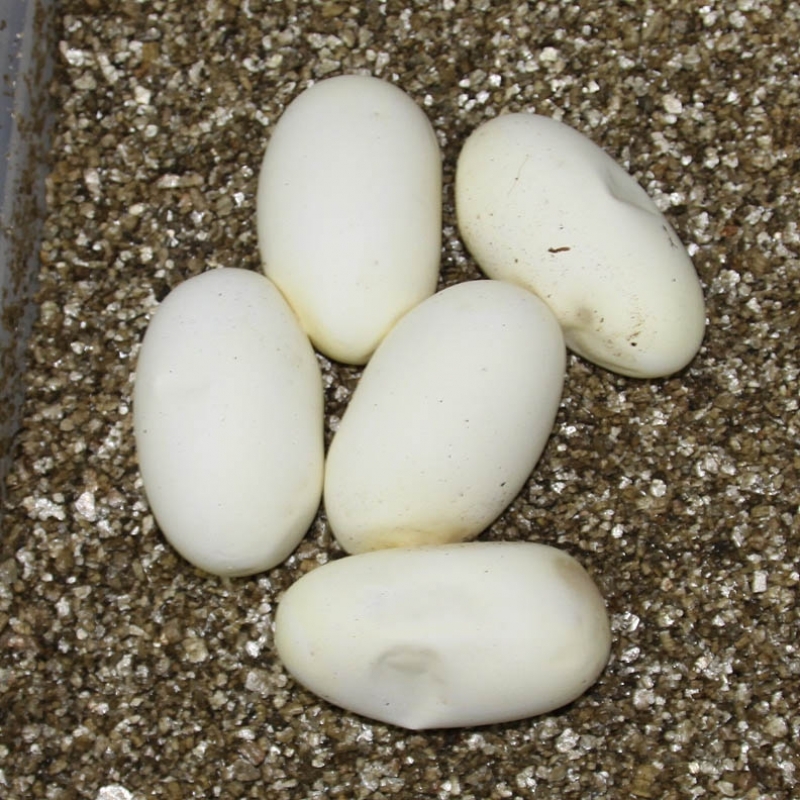 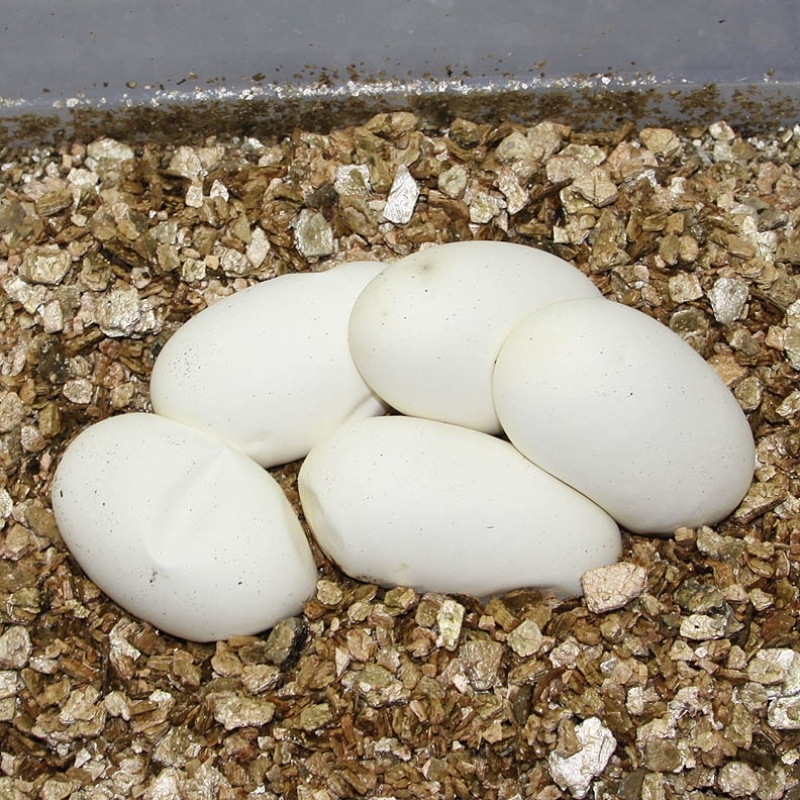 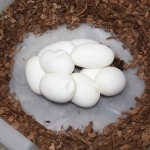 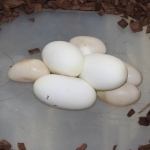 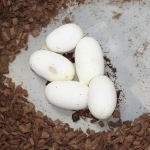 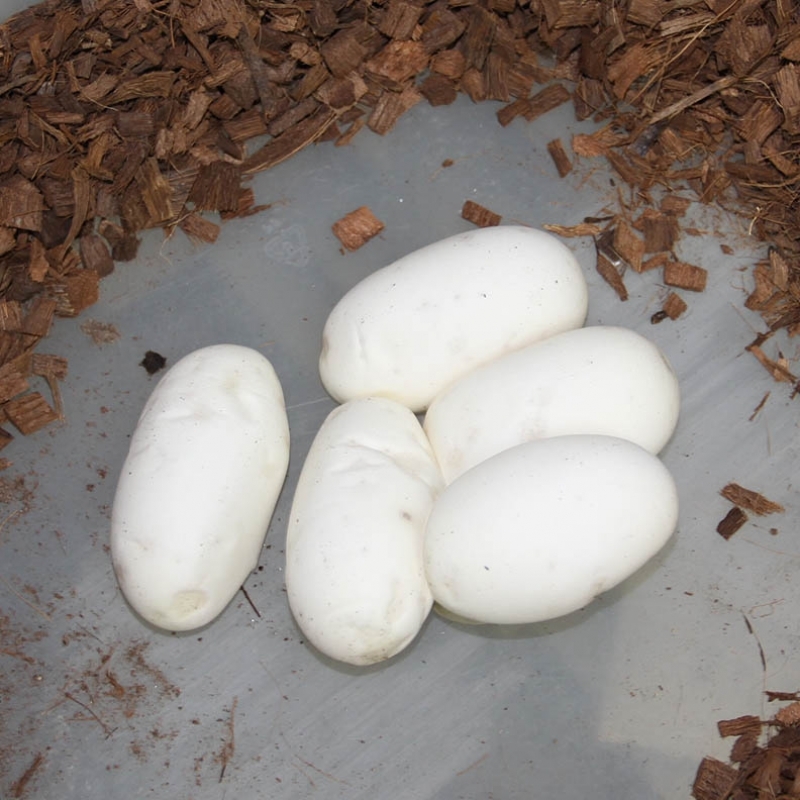 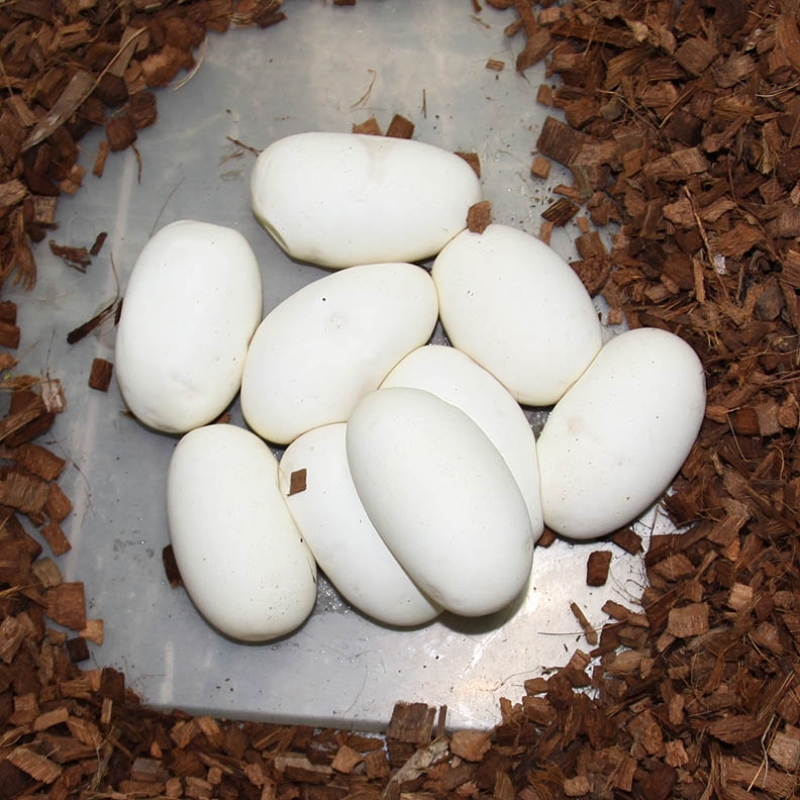 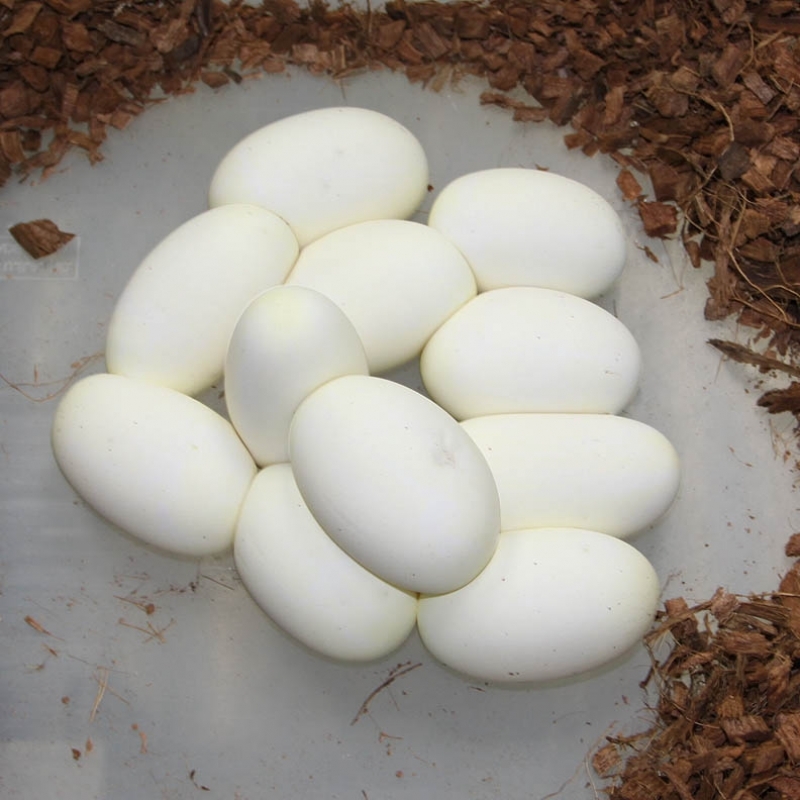 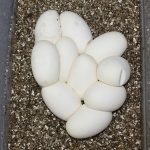 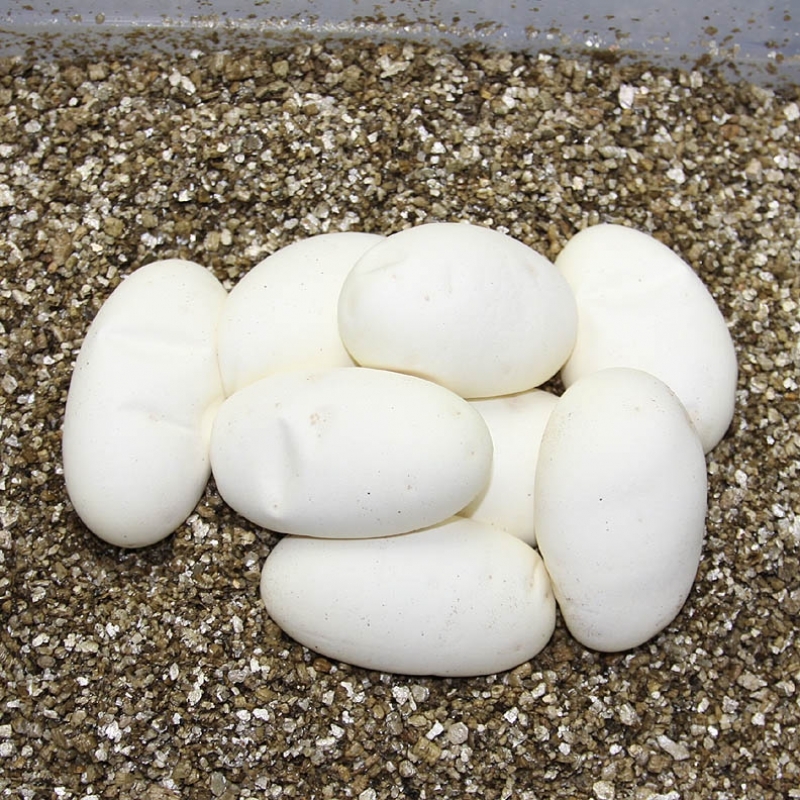 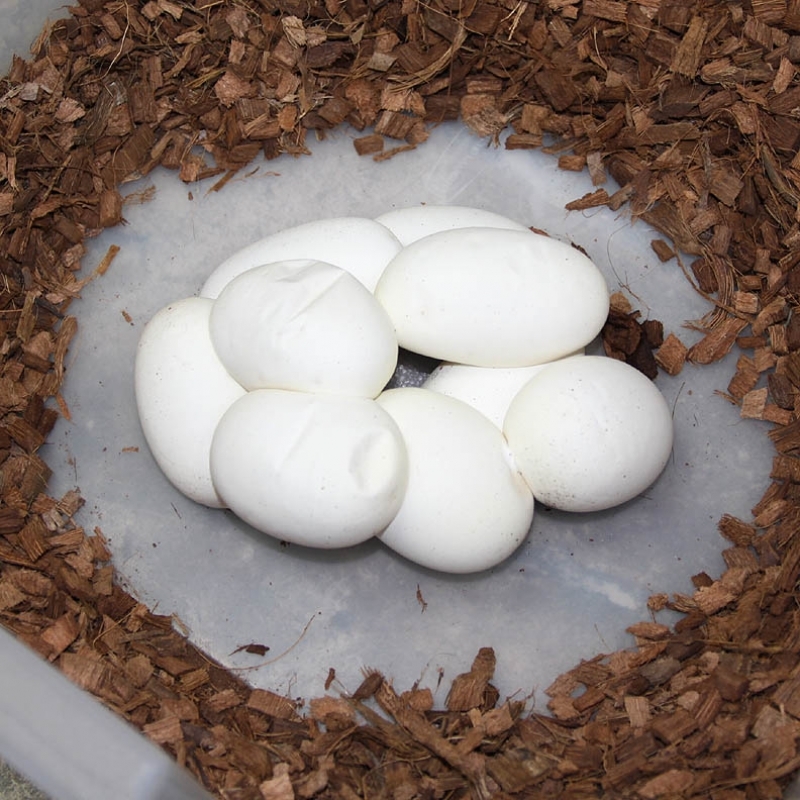 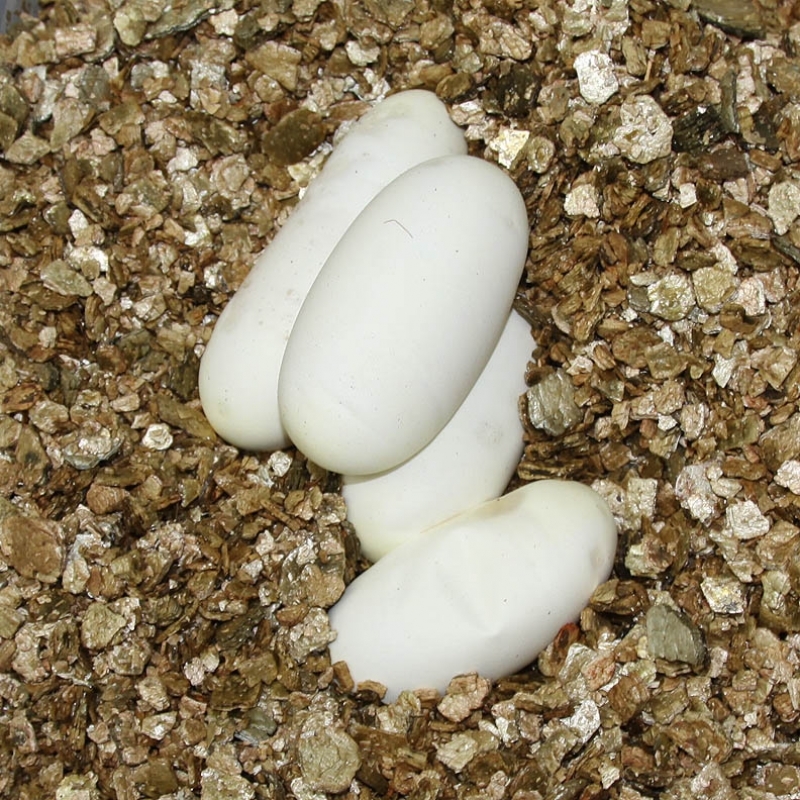 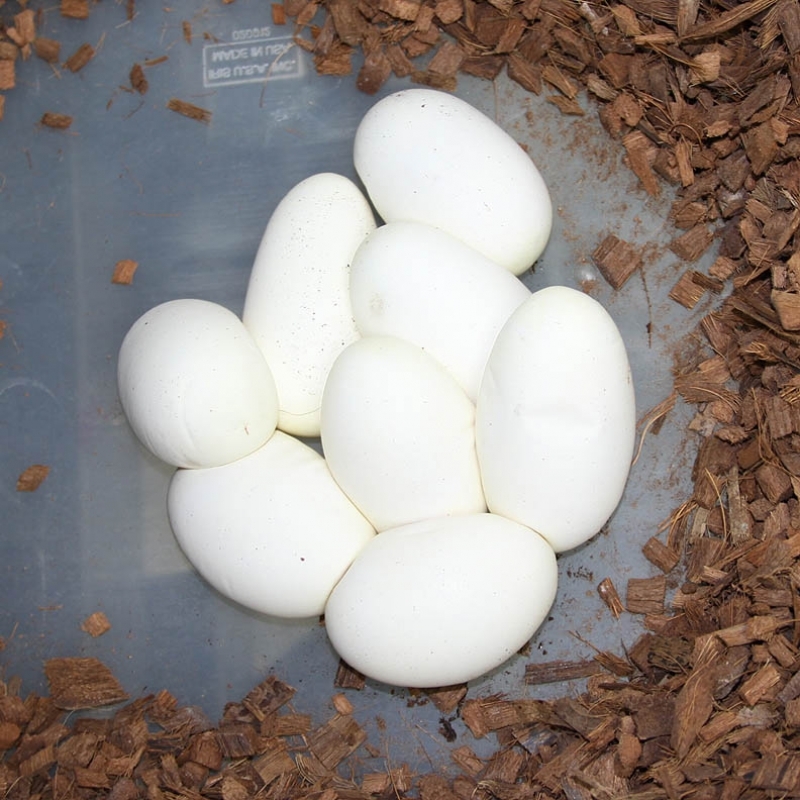 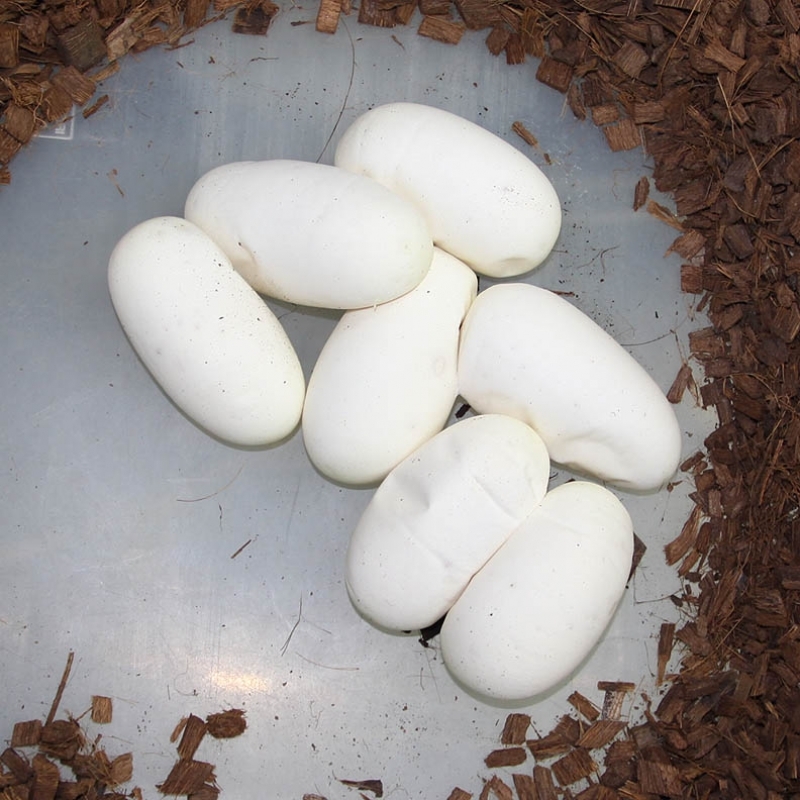 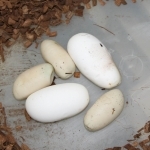 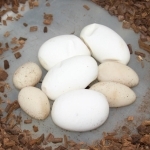 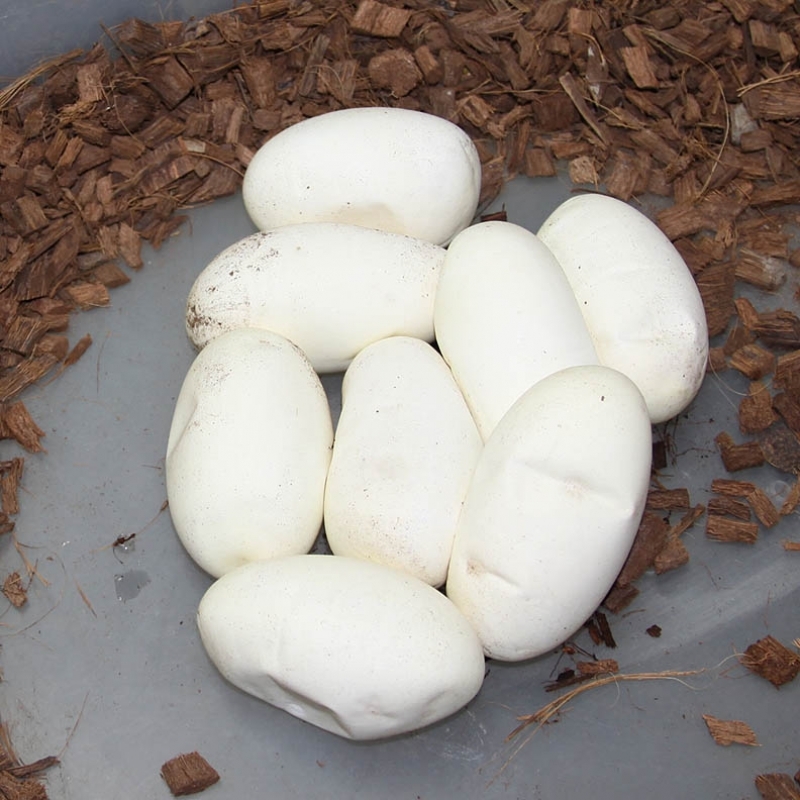 I produced 3 females in another clutch so I've got 5.4 YB crosses Het Caramel so I'm happy! 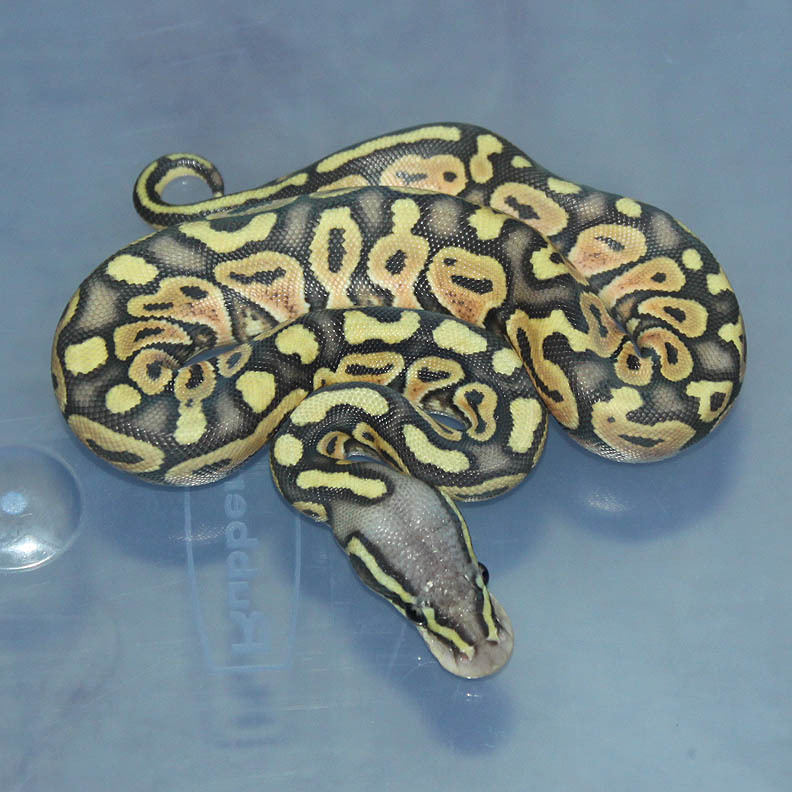 Description: Pastel DH OG/GS 2/11 x Orange Ghost PHGS 1/10. 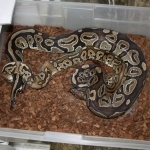 Description: POGL (Green) 1/07 x Chocolate Pos Het Green Ghost 1/11. 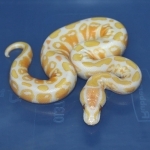 Description: Super Pastel Puzzle 1/12 x Red Axanthic Orange Ghost (RAOG) 1/10. 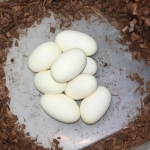 Well, I received my ratio it was just backwards! 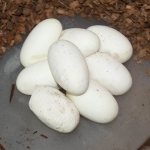 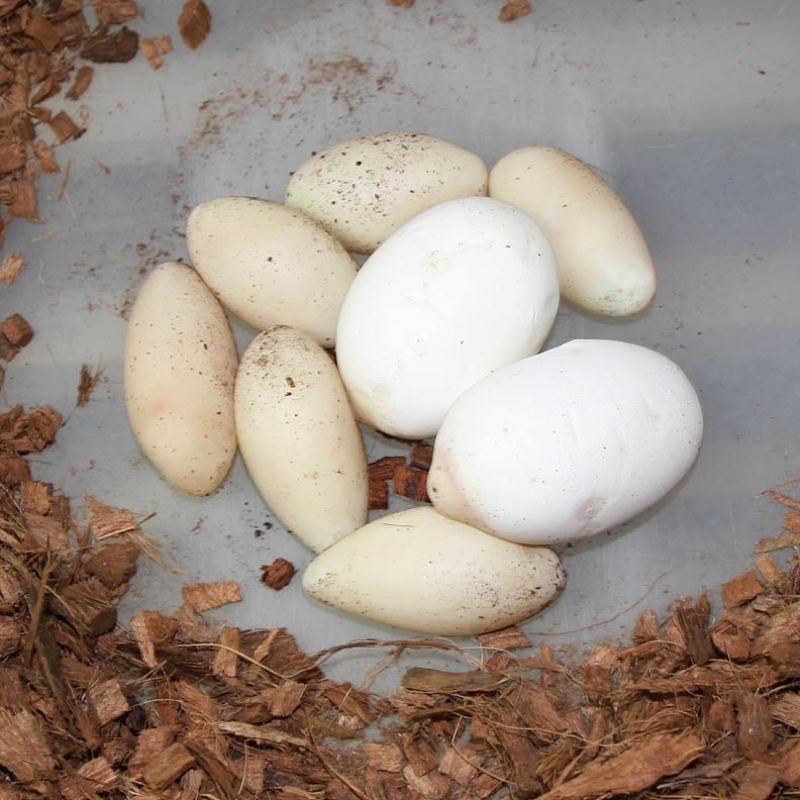 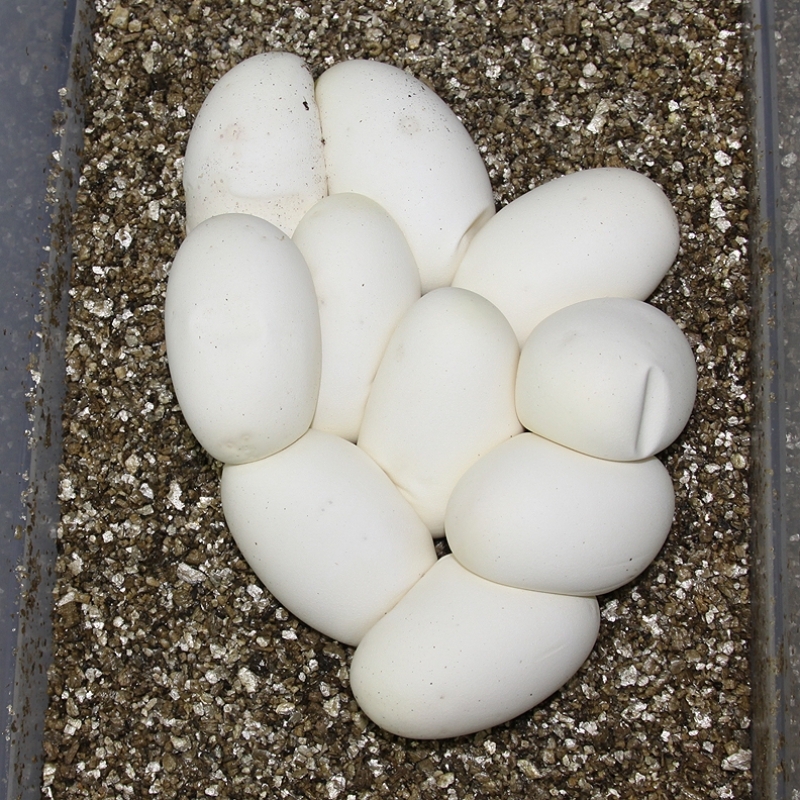 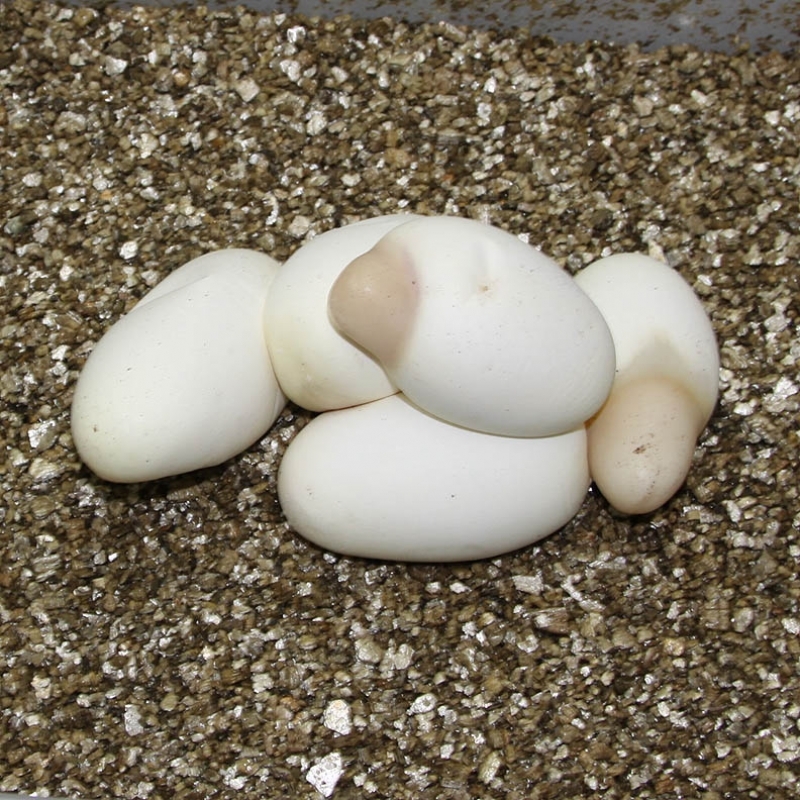 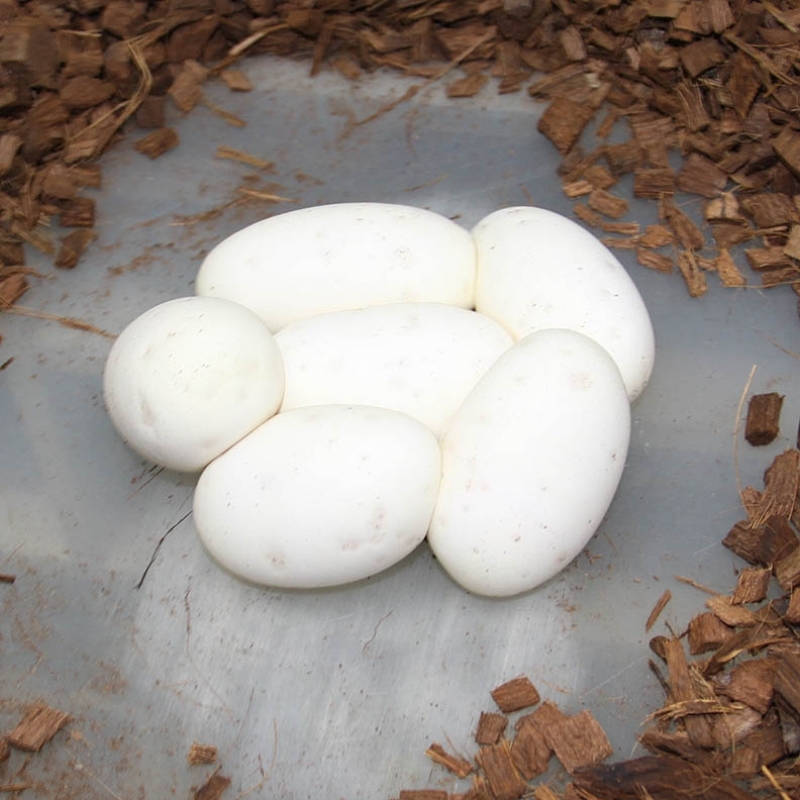 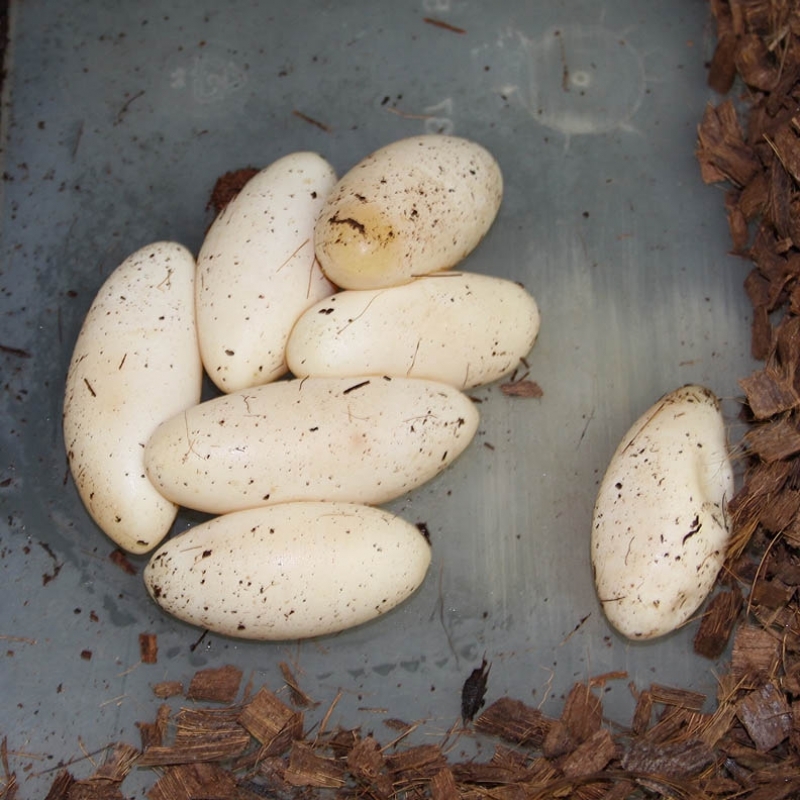 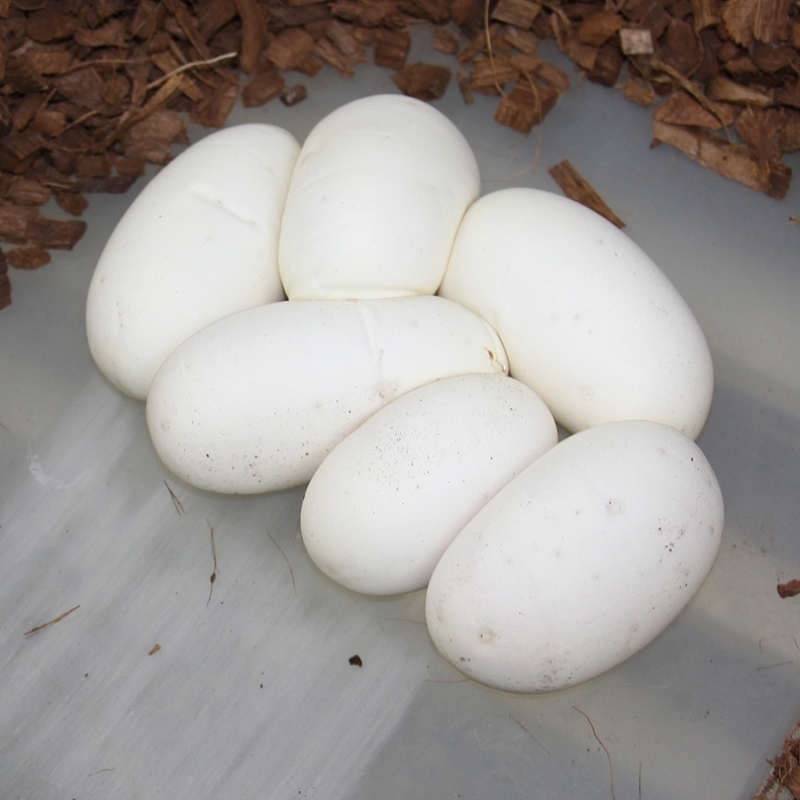 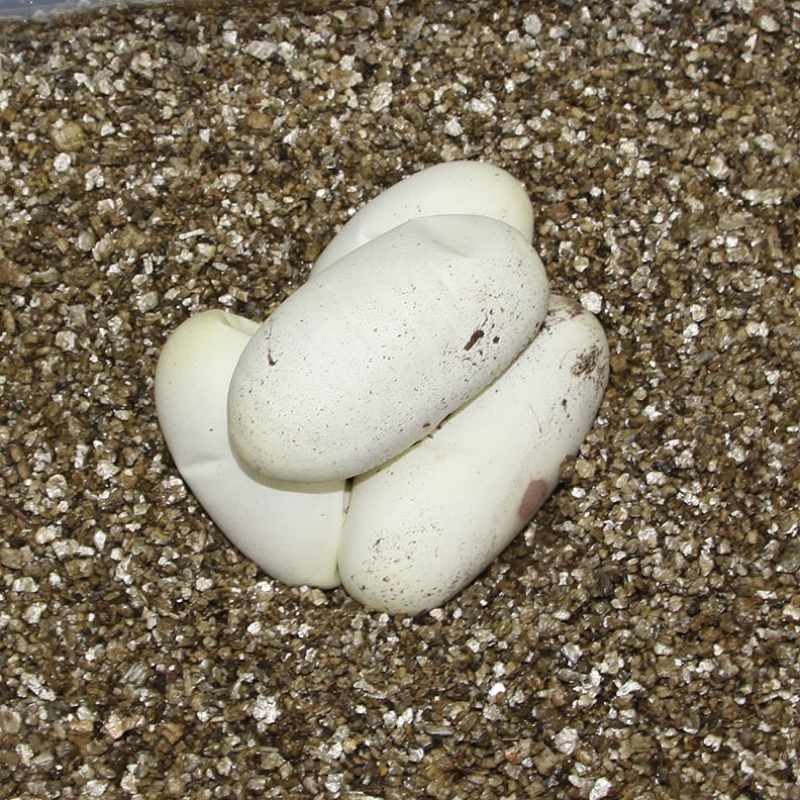 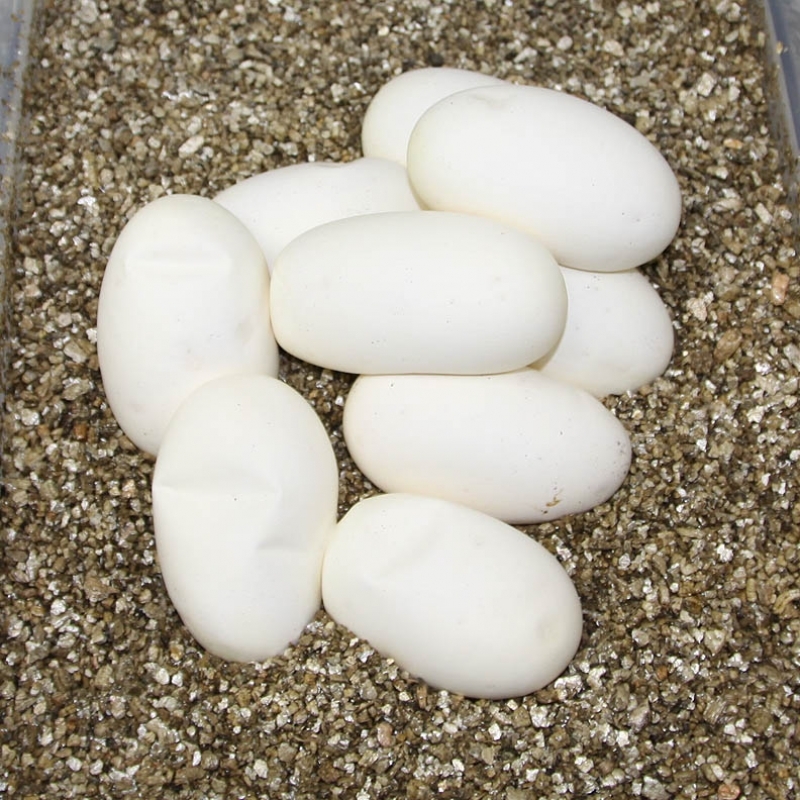 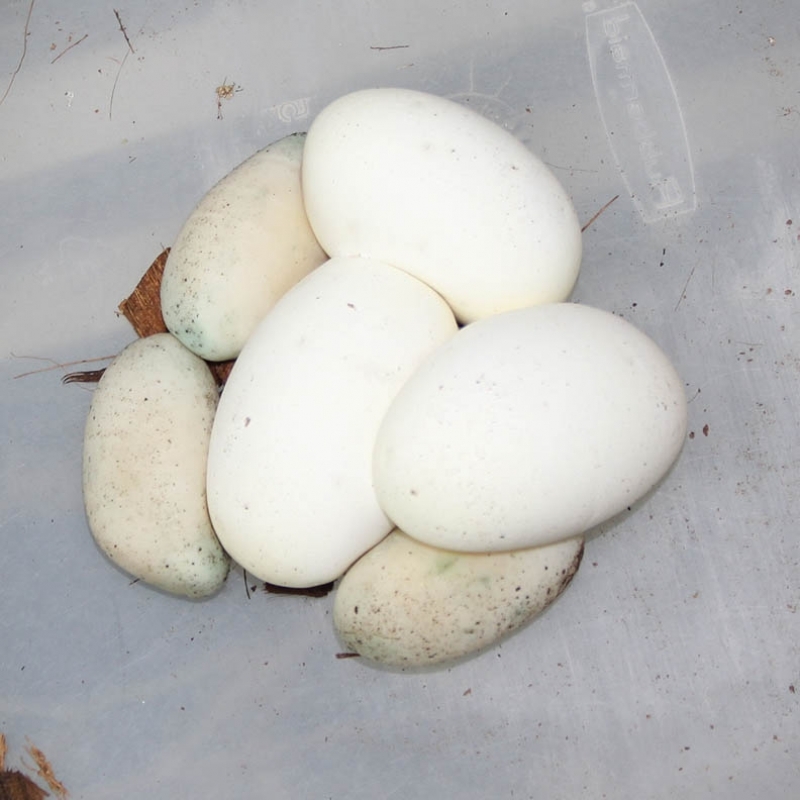 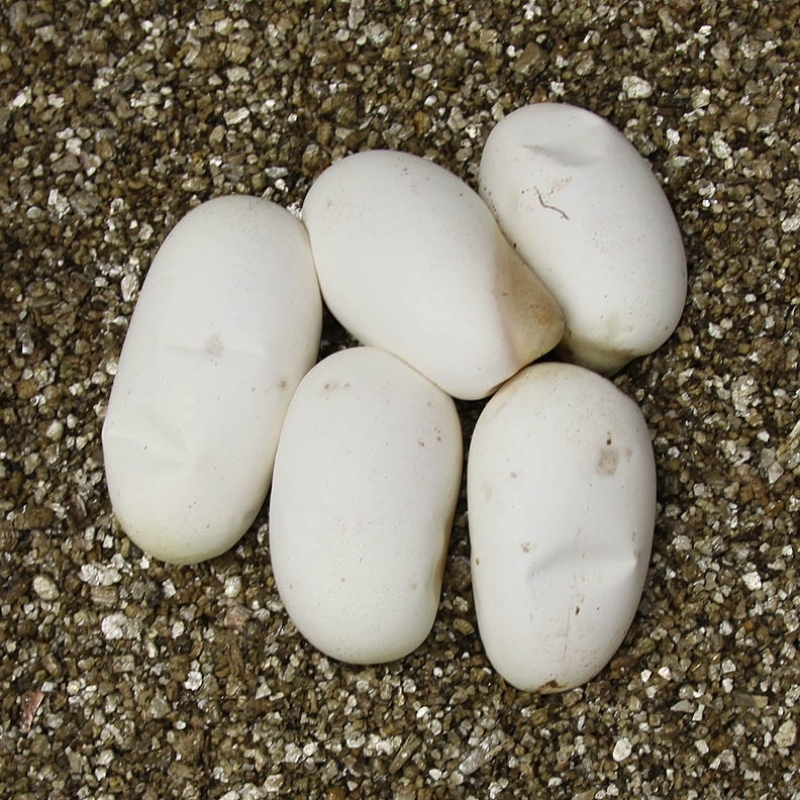 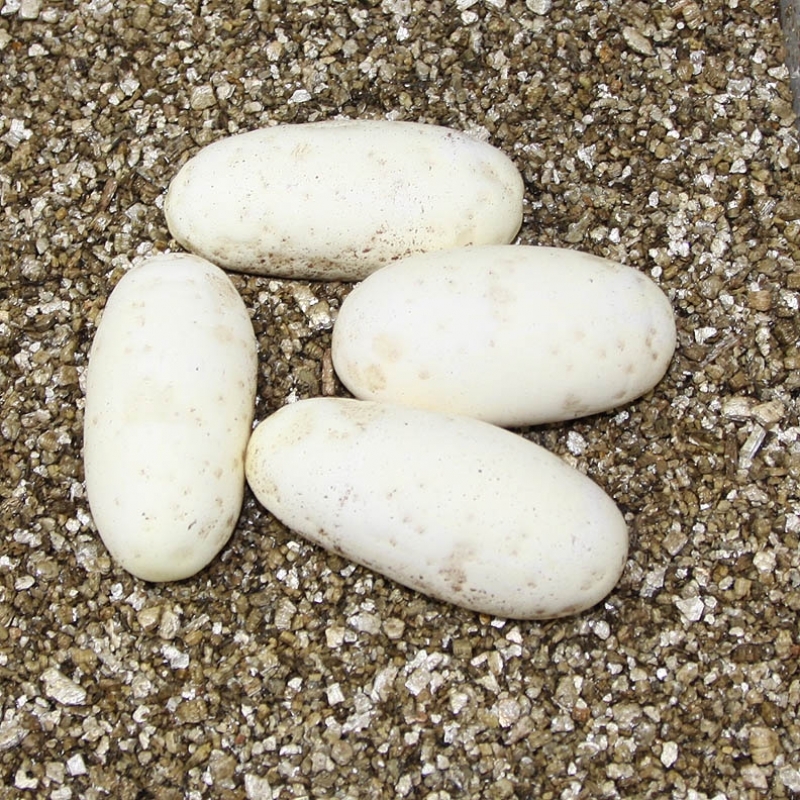 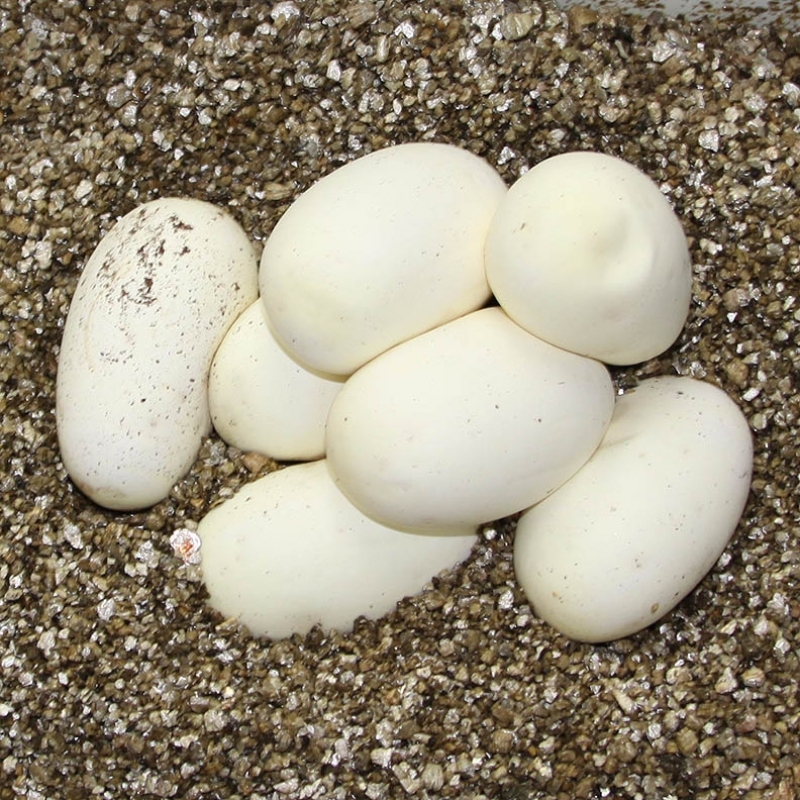 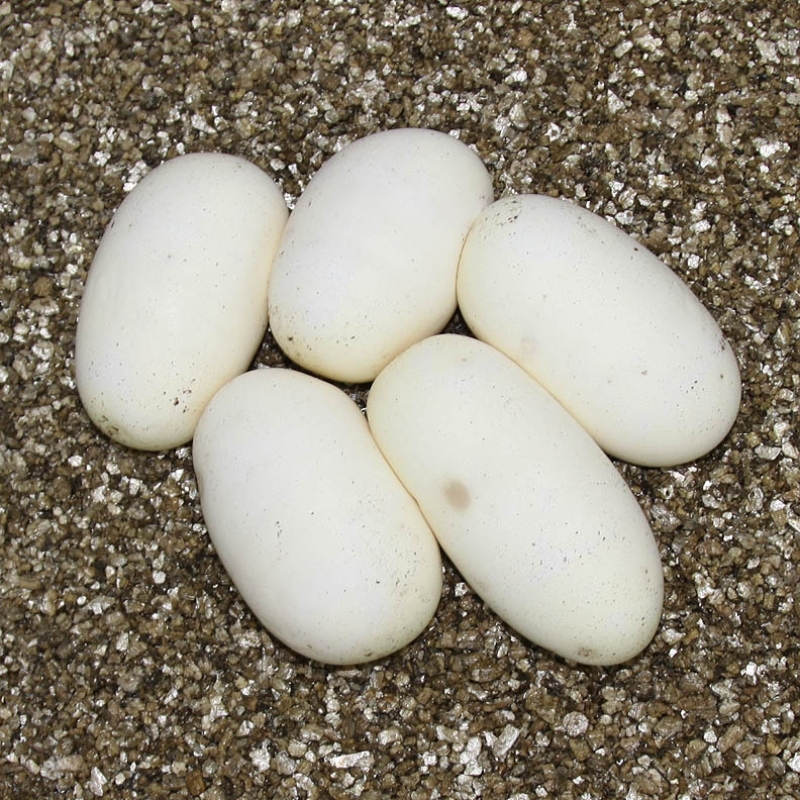 This clutch is consistent with all of the Het Puzzle clutches hatched so far this season in being very high male! 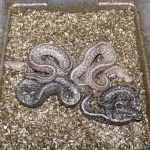 Description: POG Red Axanthic 1/11 x Lesser HOG 2/06. 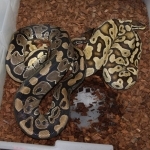 Description: Lesser PHCS 3/12 x Het CS 3/06. 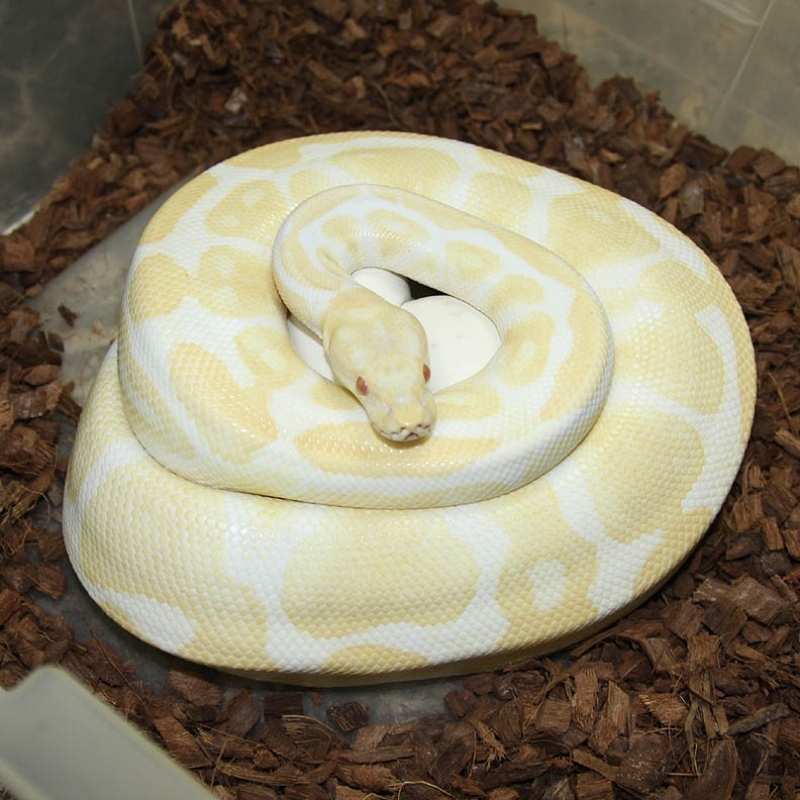 Description: Albino Yellow Belly 2/11 x HY YB 6/09. 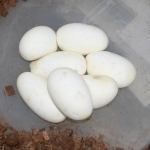 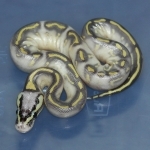 Description: Pastel DH OG/Pied 1/10 x DH OG/Pied 5/11. 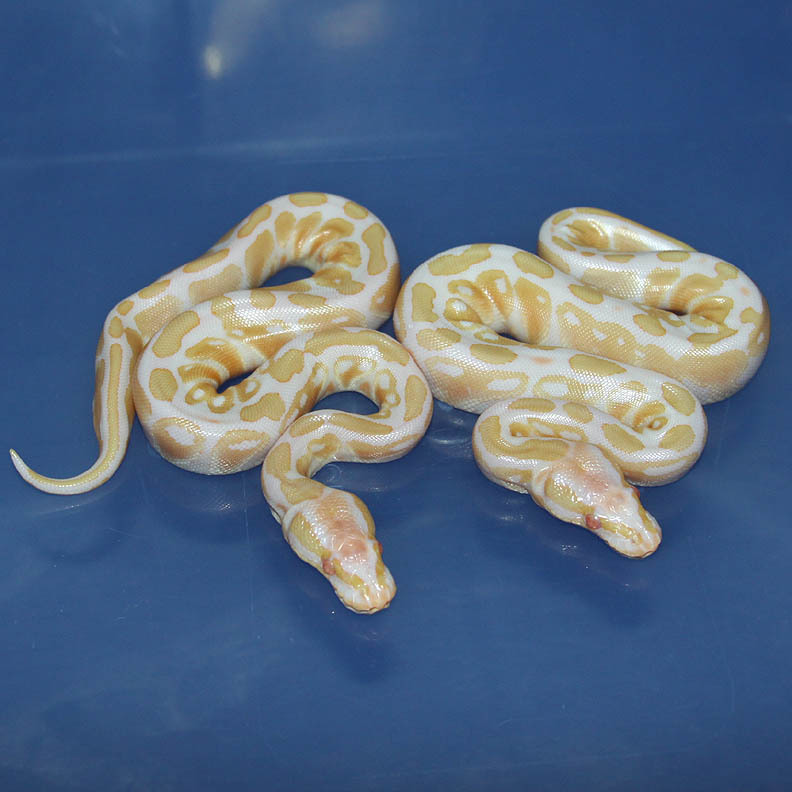 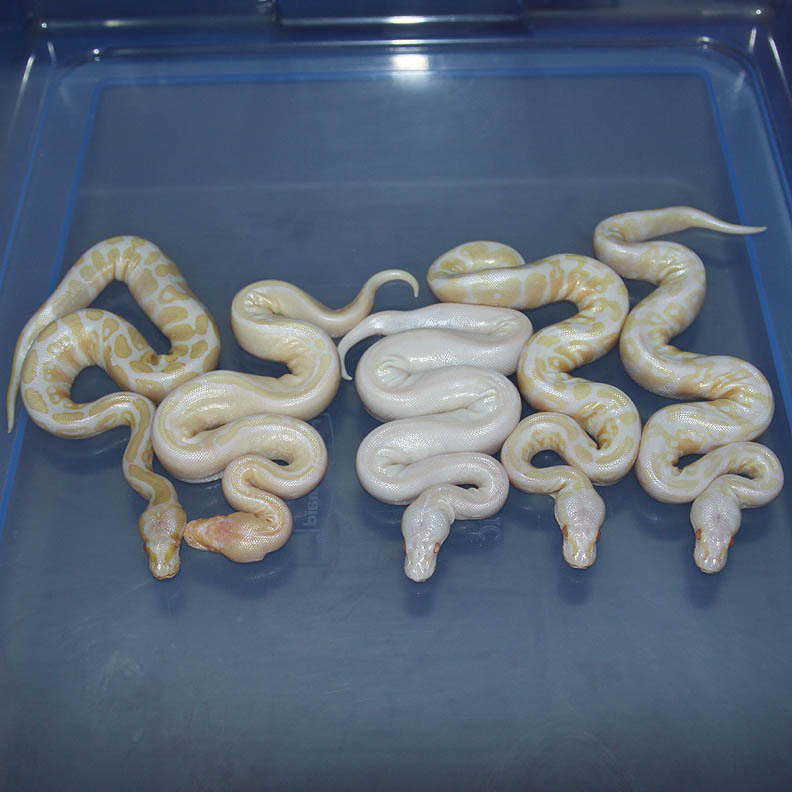 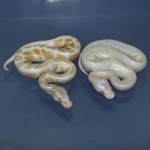 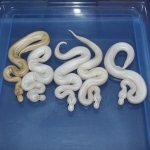 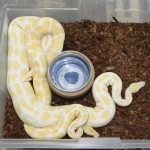 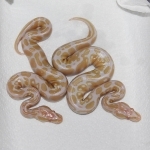 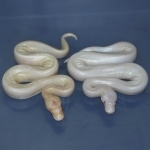 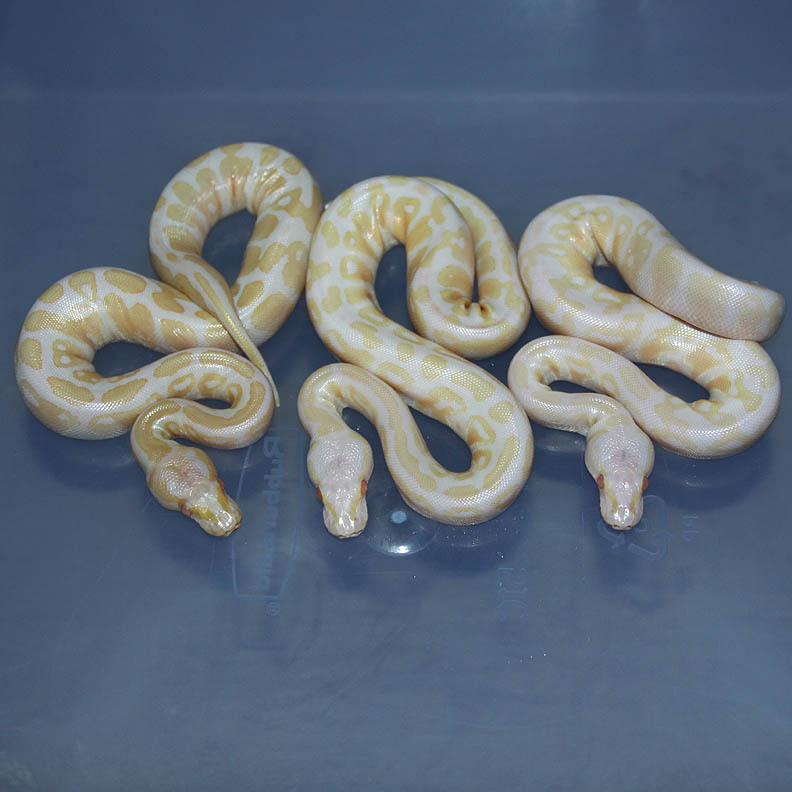 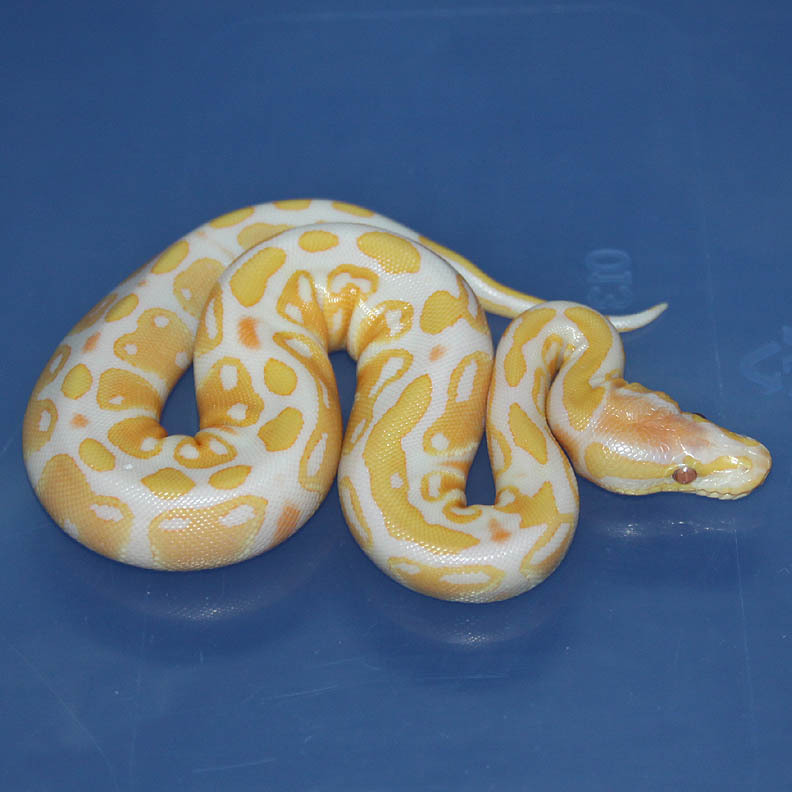 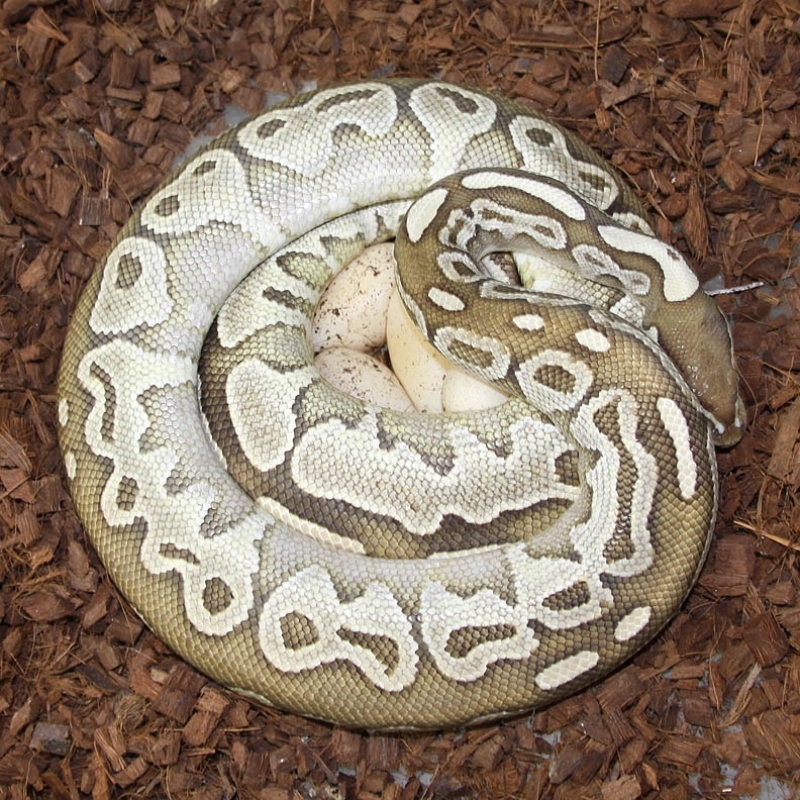 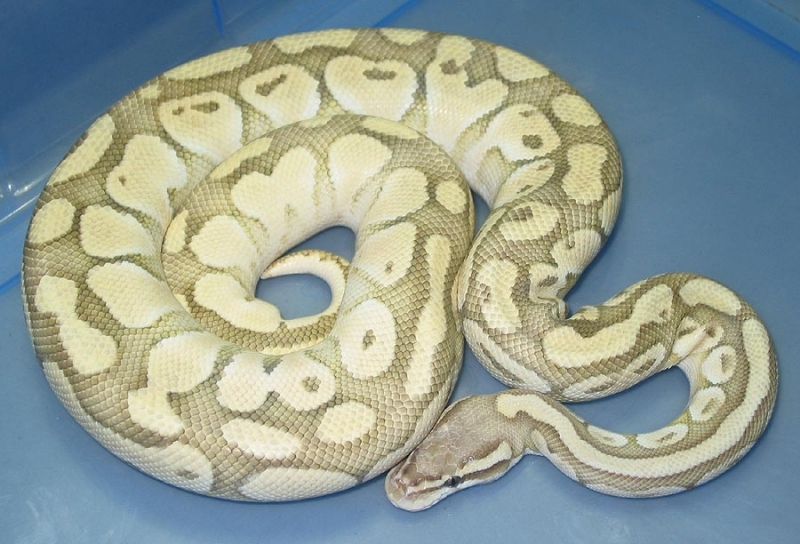 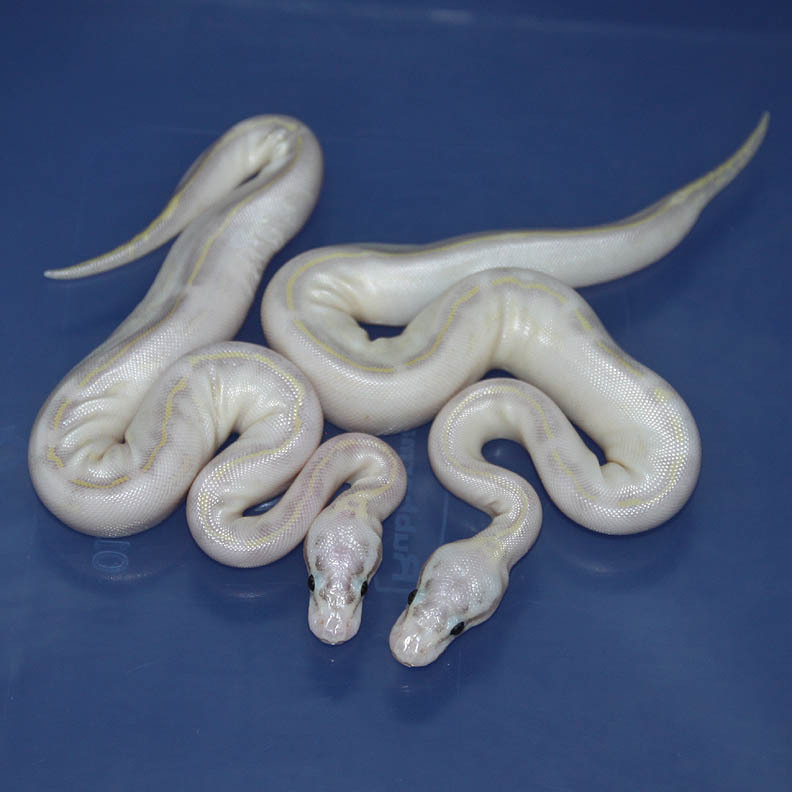 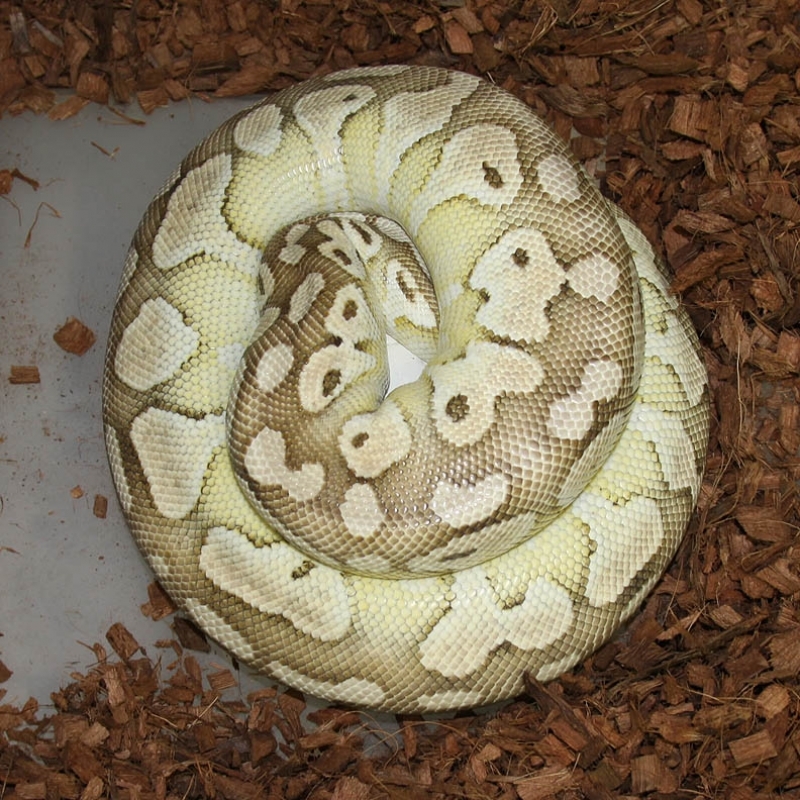 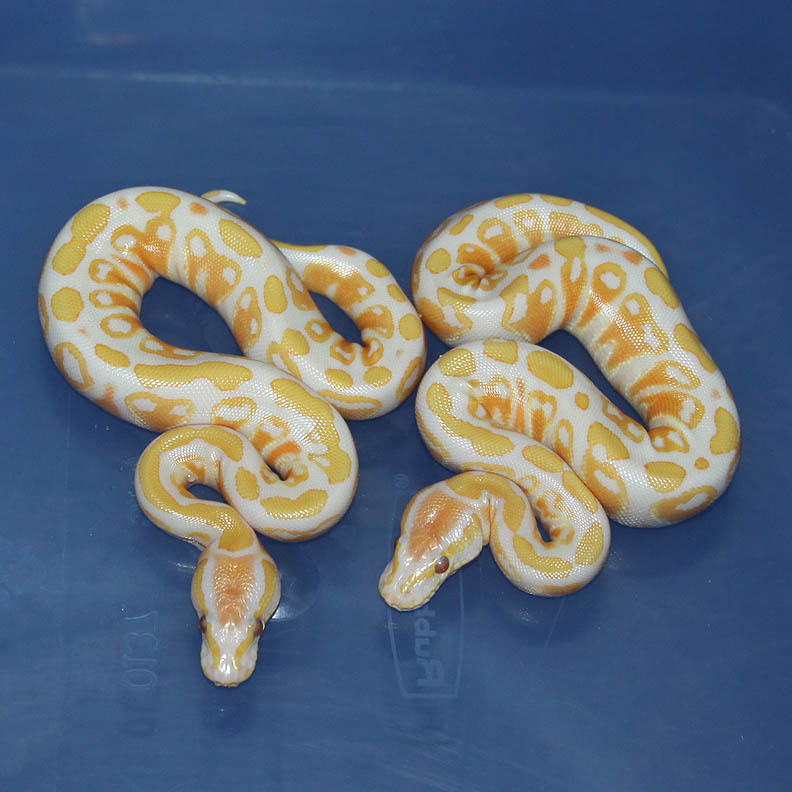 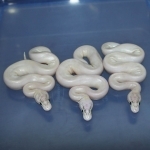 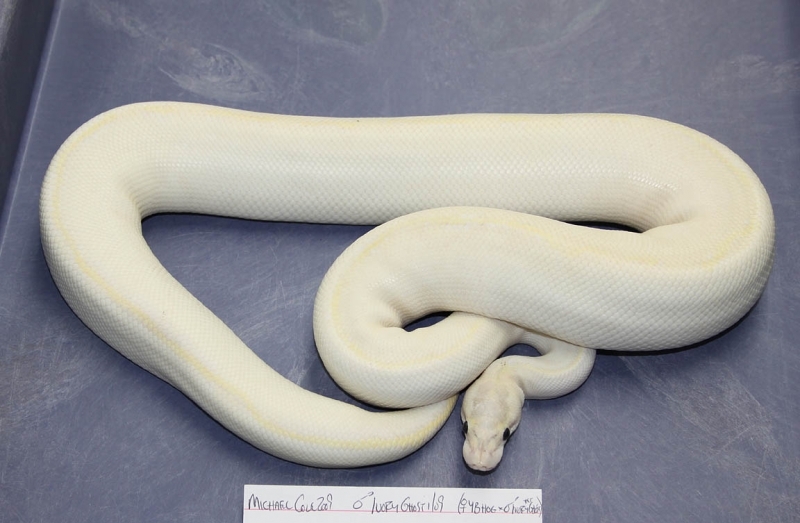 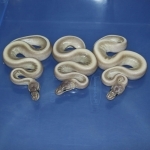 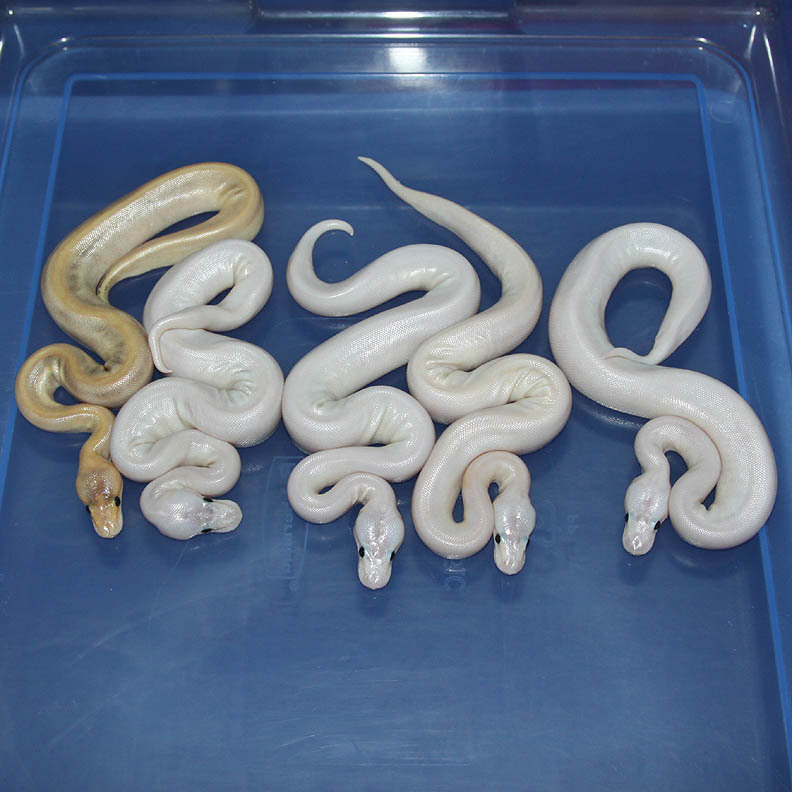 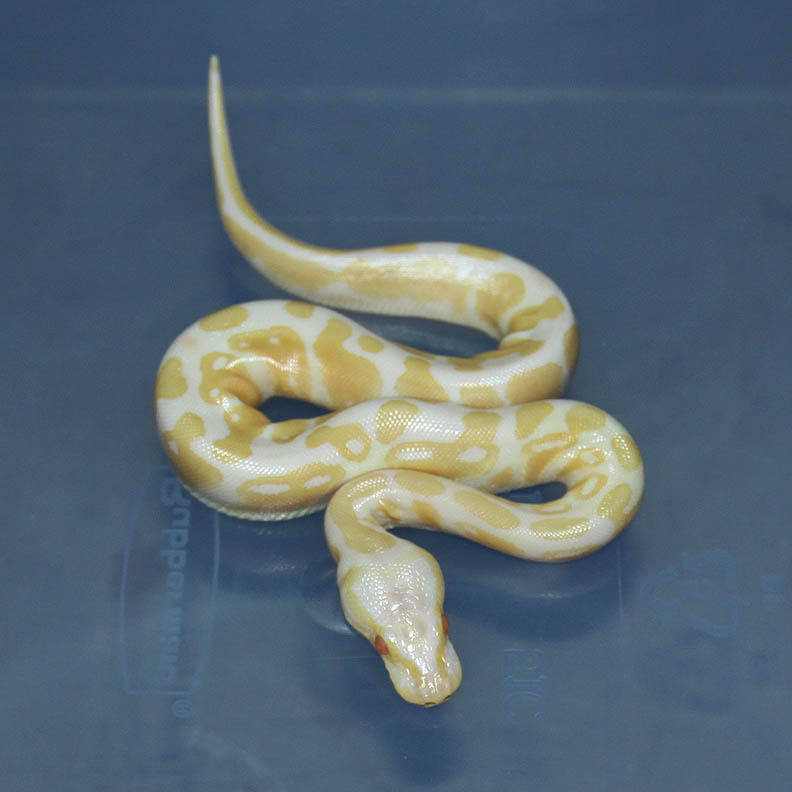 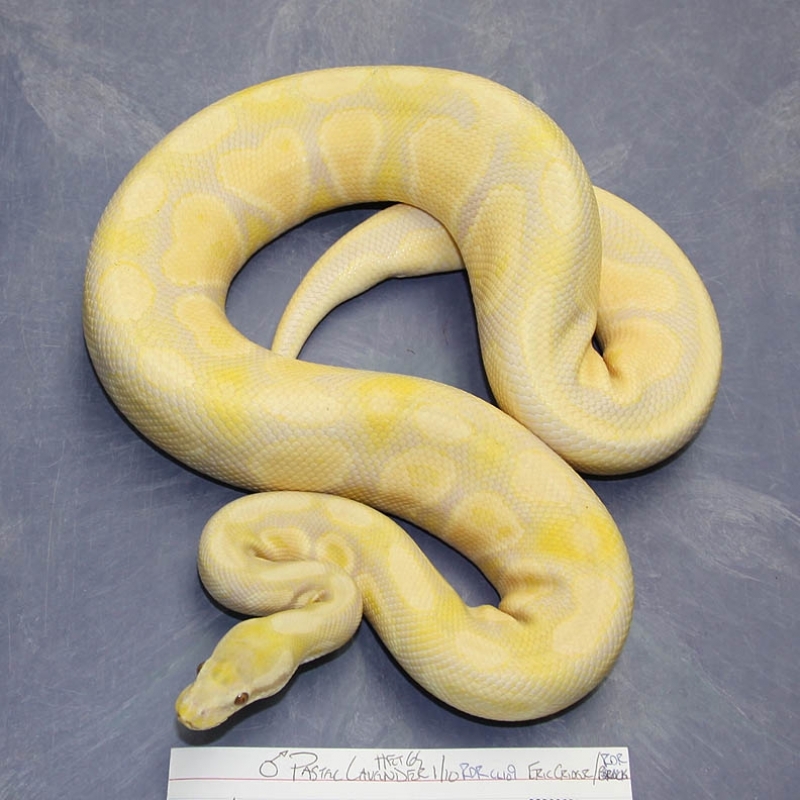 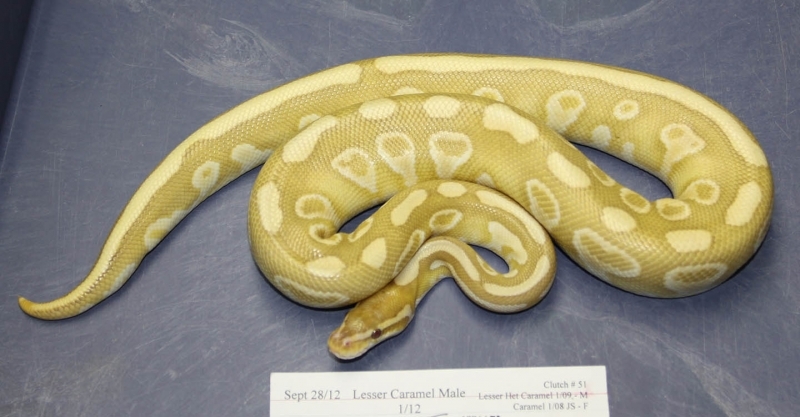 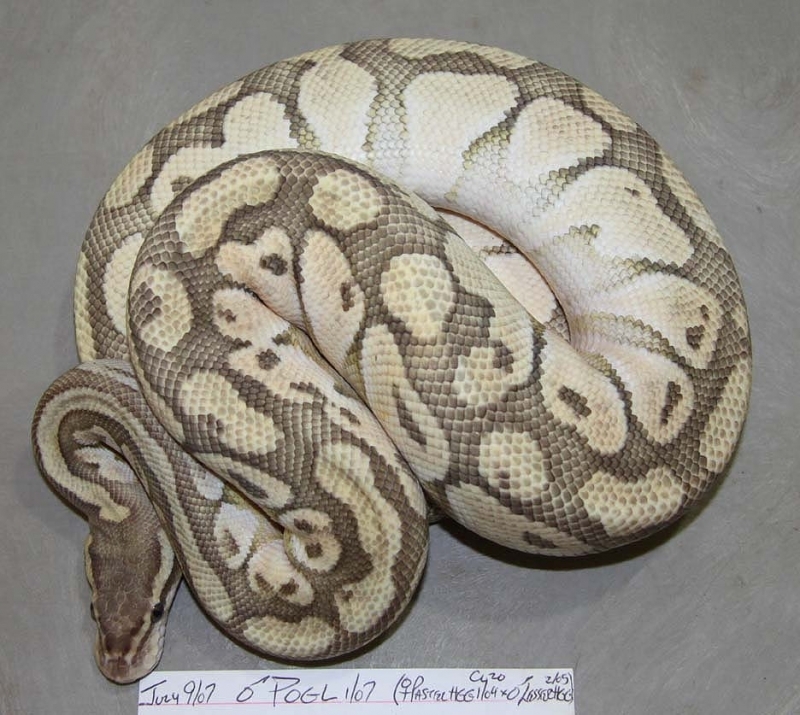 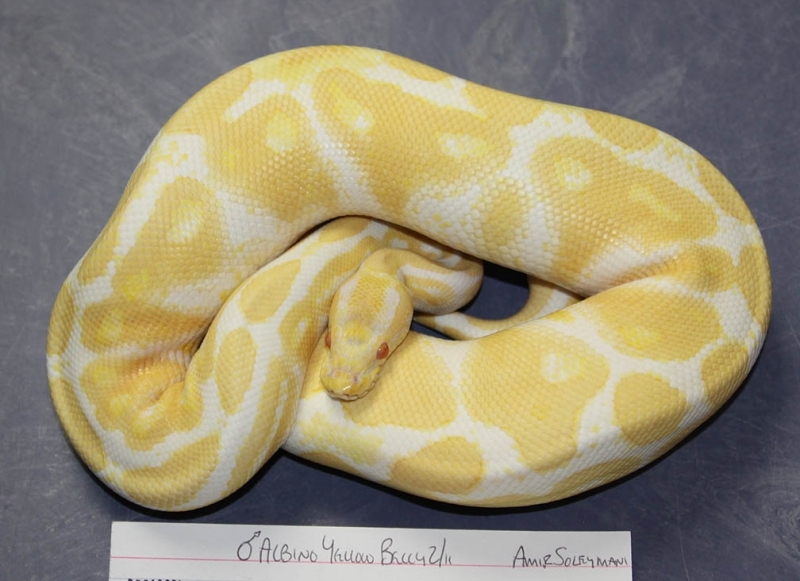 Description: Pastel Champagne Het Albino 1/11 x Albino 4/06. 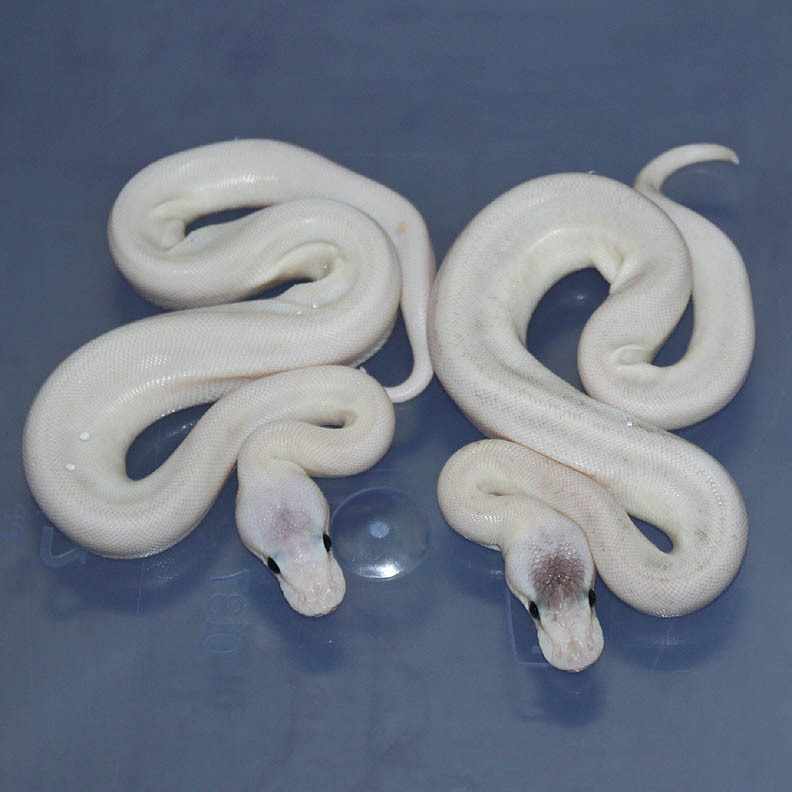 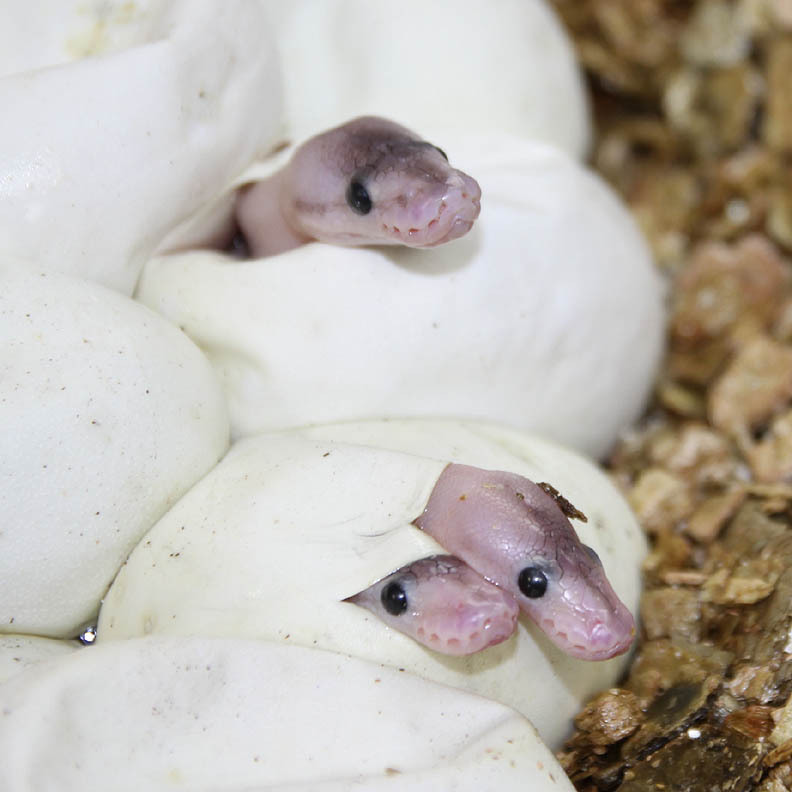 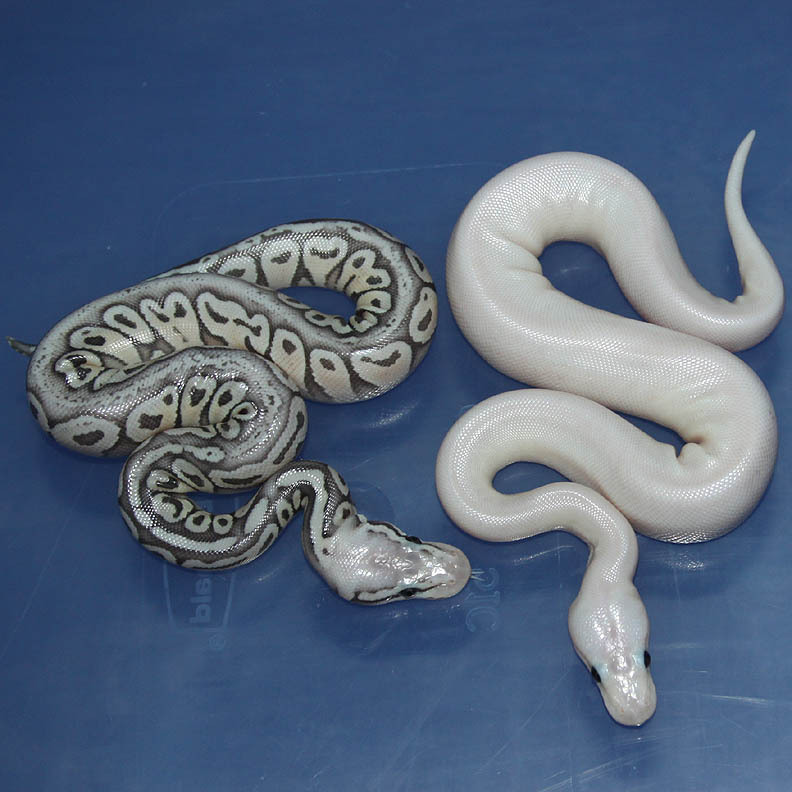 I love Champagne Albinos and Pastel Champagne Albinos. 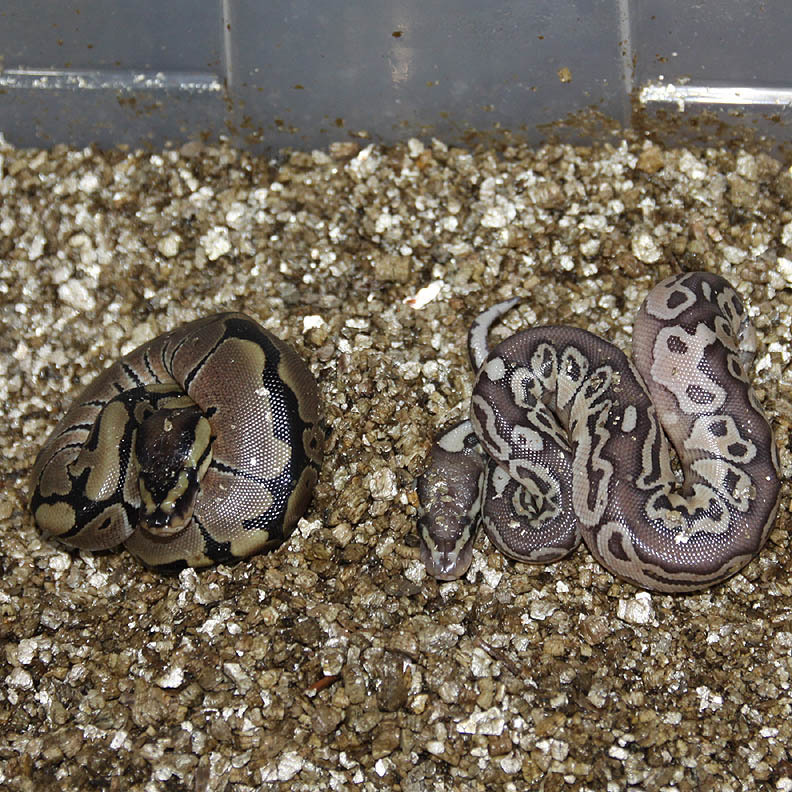 Also, another set of Twins! 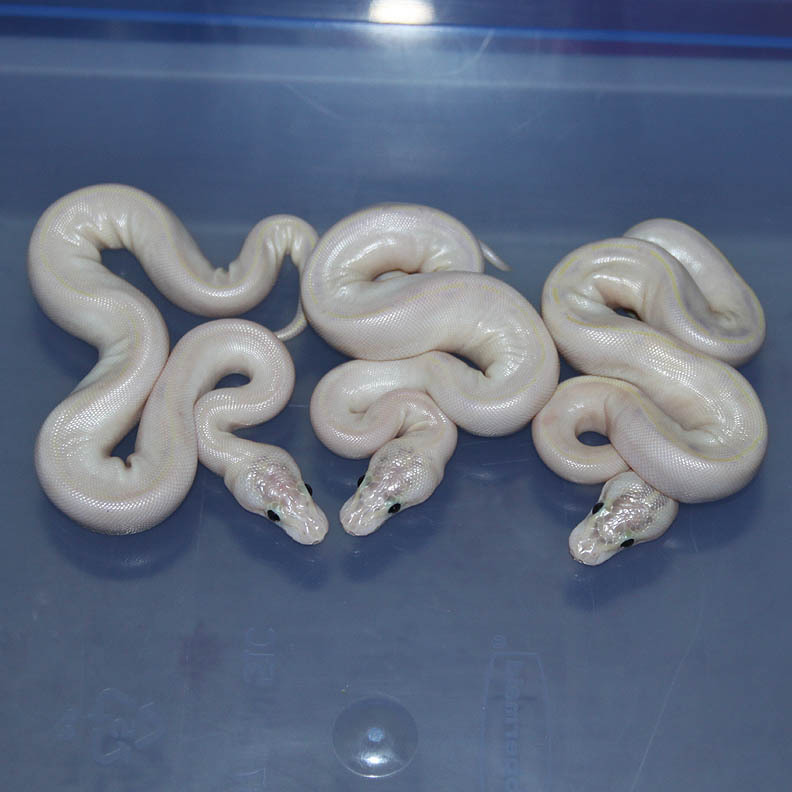 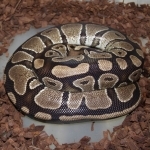 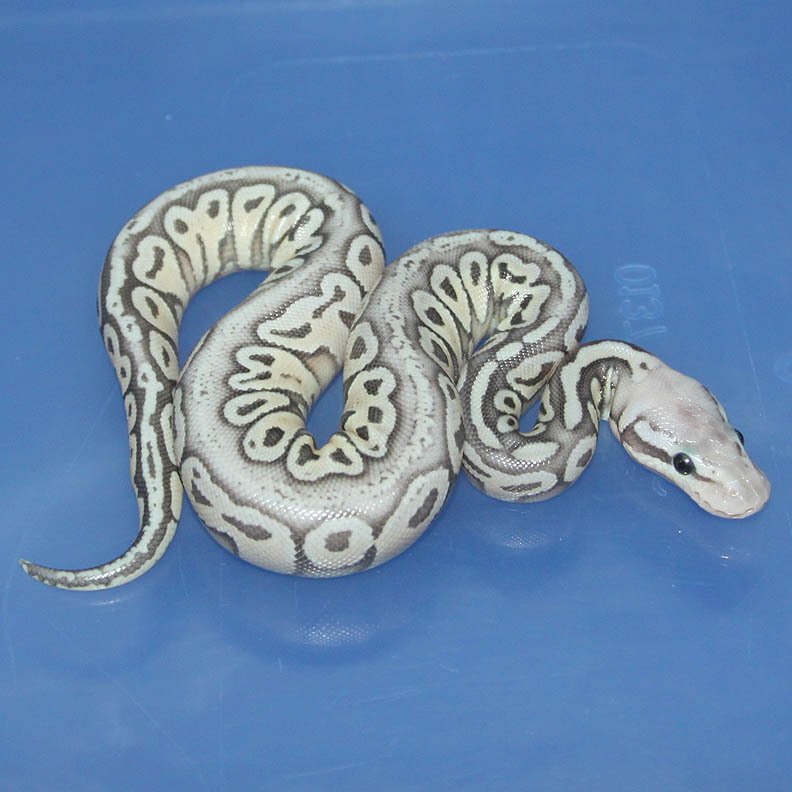 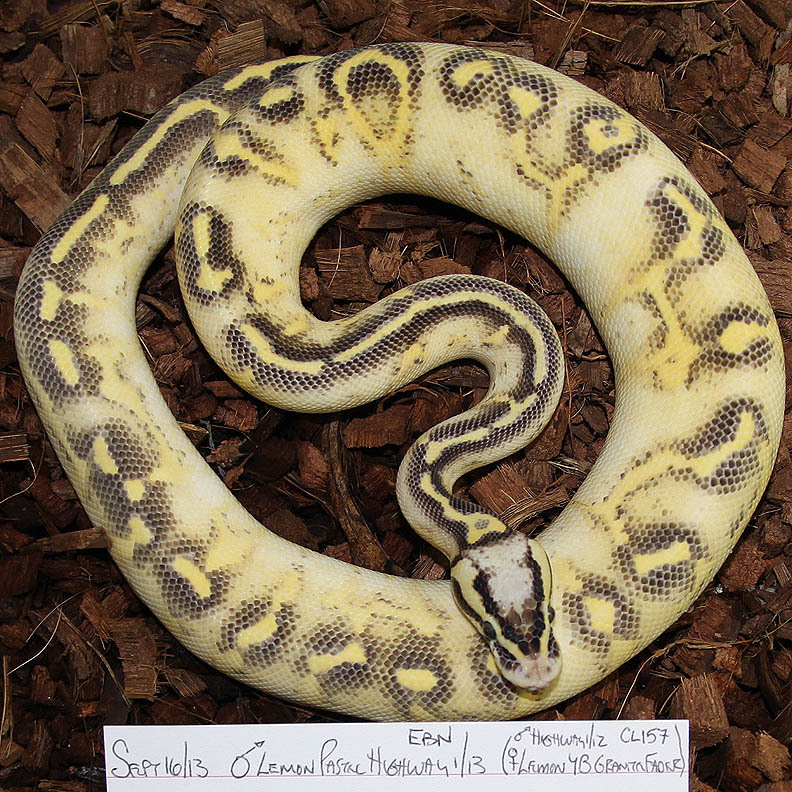 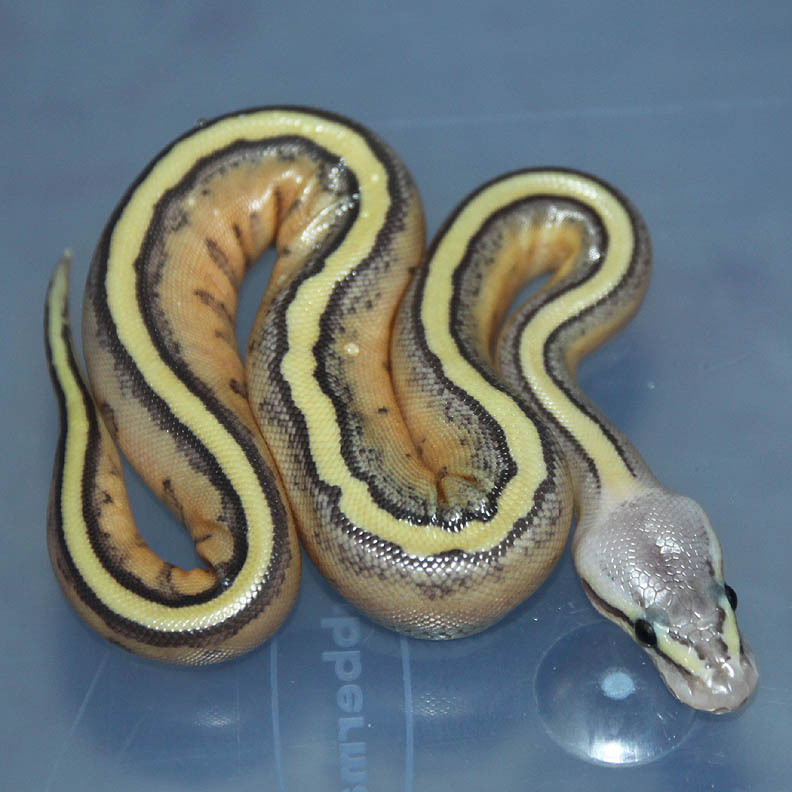 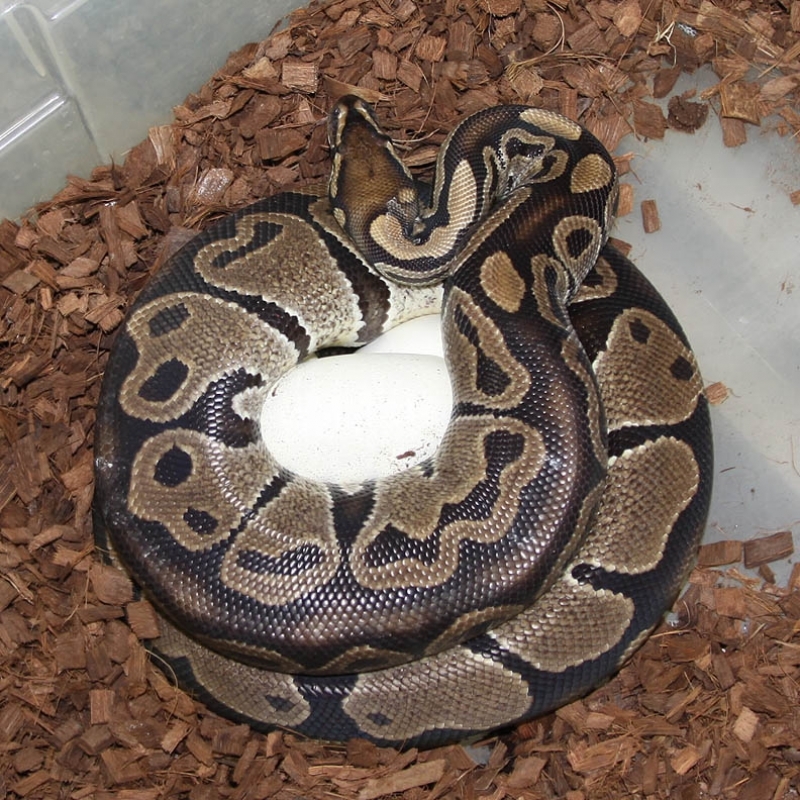 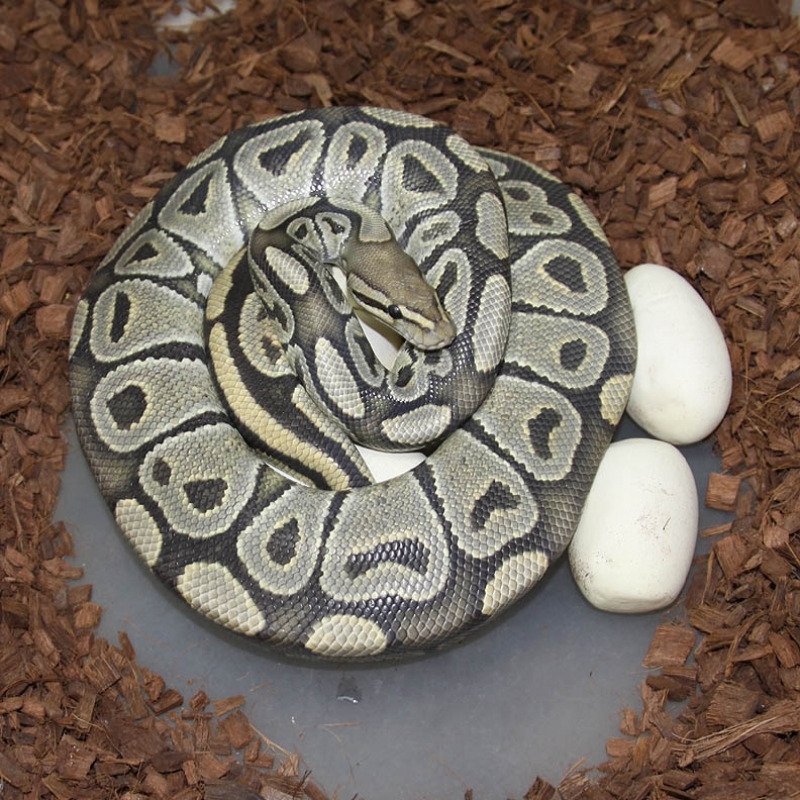 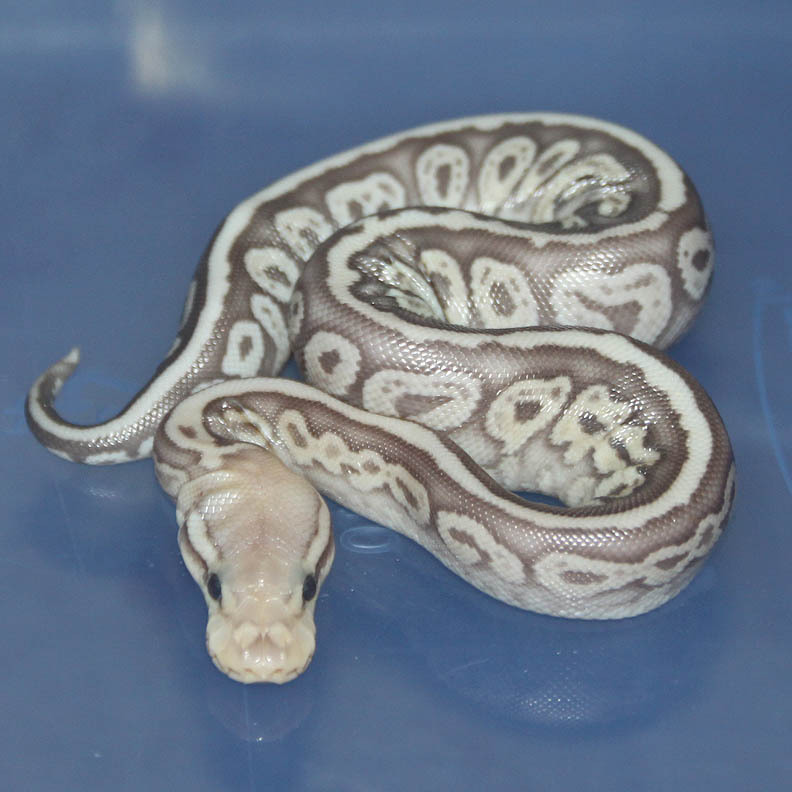 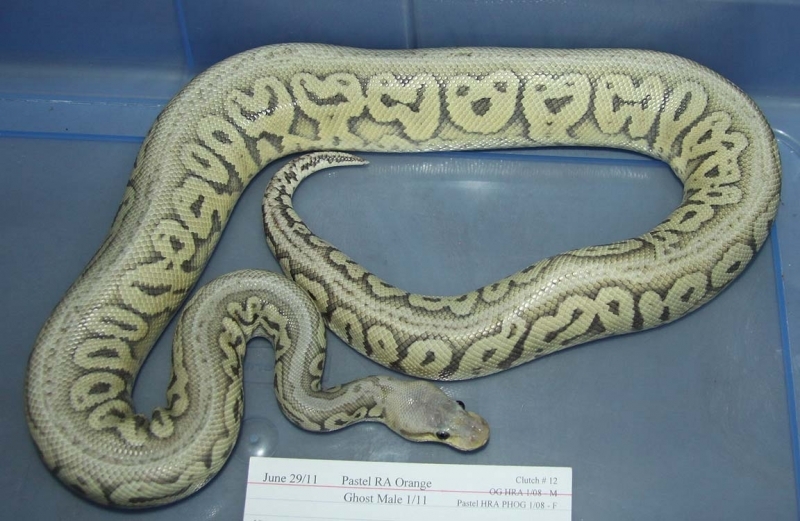 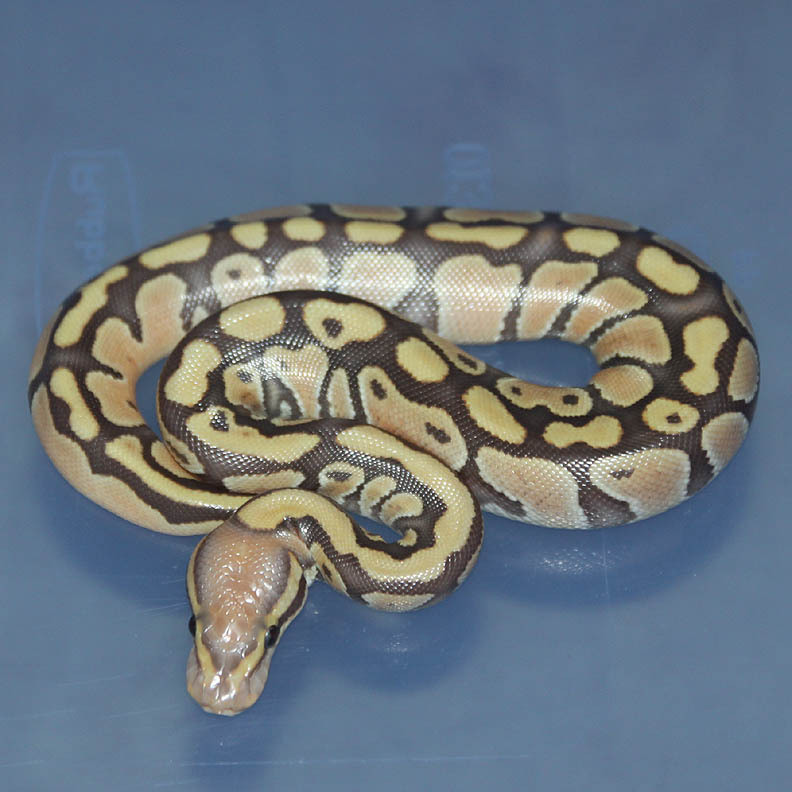 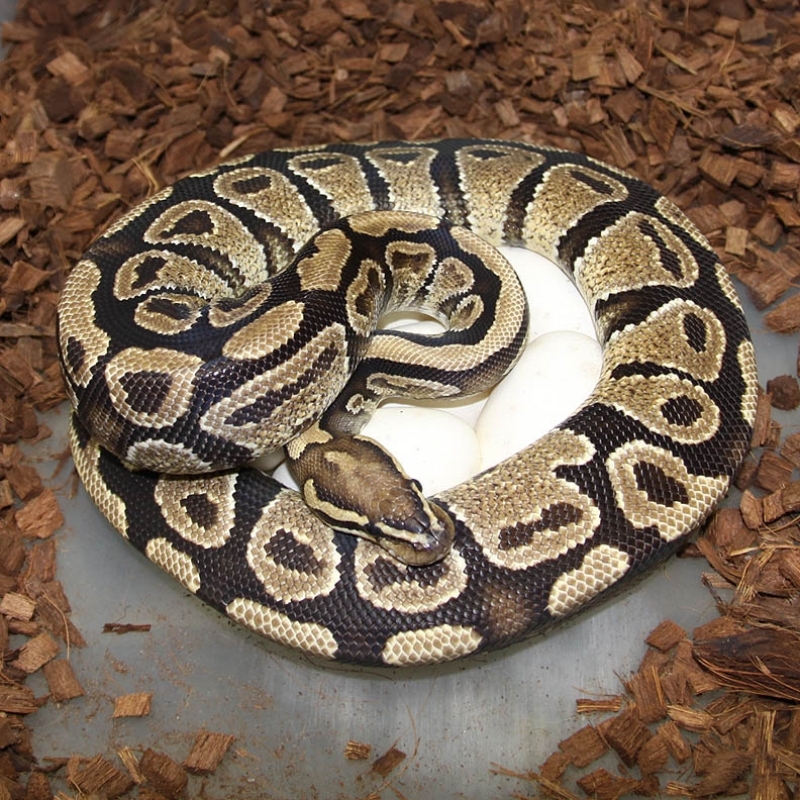 Description: Pastel Champagne Het Albino 1/10 x Black Stripe Het Albino 4/07. 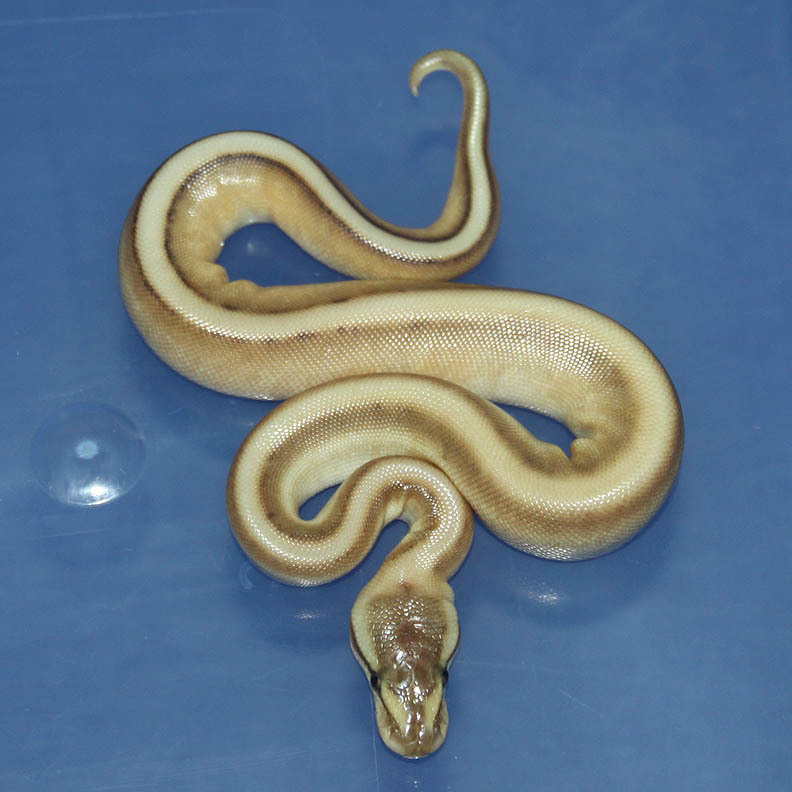 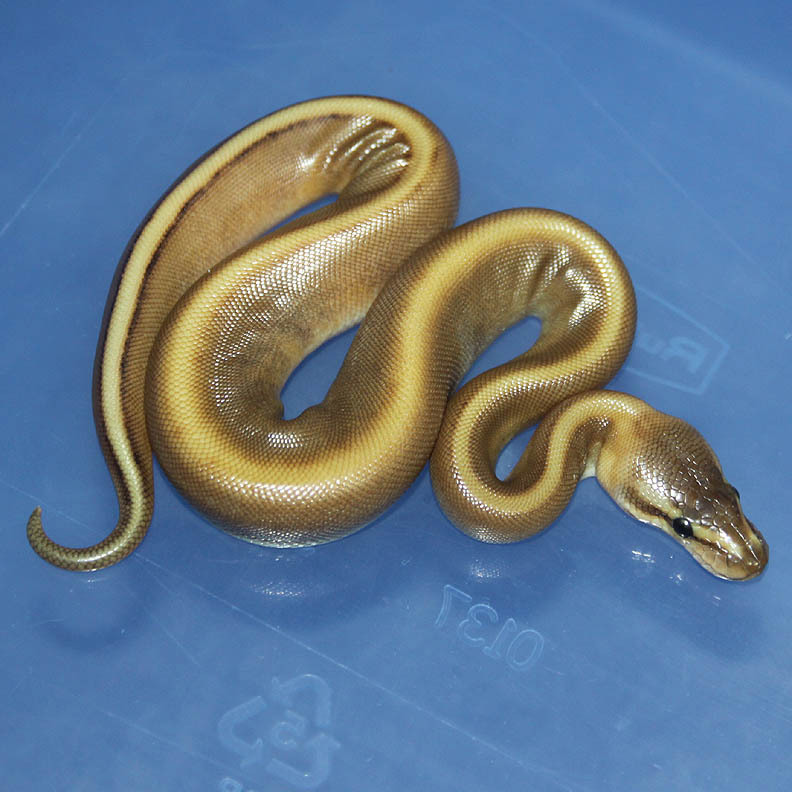 Description: Pastel Caramel HRA 1/11 x Genetic Stripe 3/06. 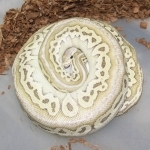 Description: Pastel Ivory 1/11 x HY YB 3/09. 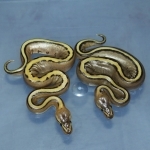 Description: Different HRA 1/10 x HRA 8/06. I produced this guy randomly in 2010. 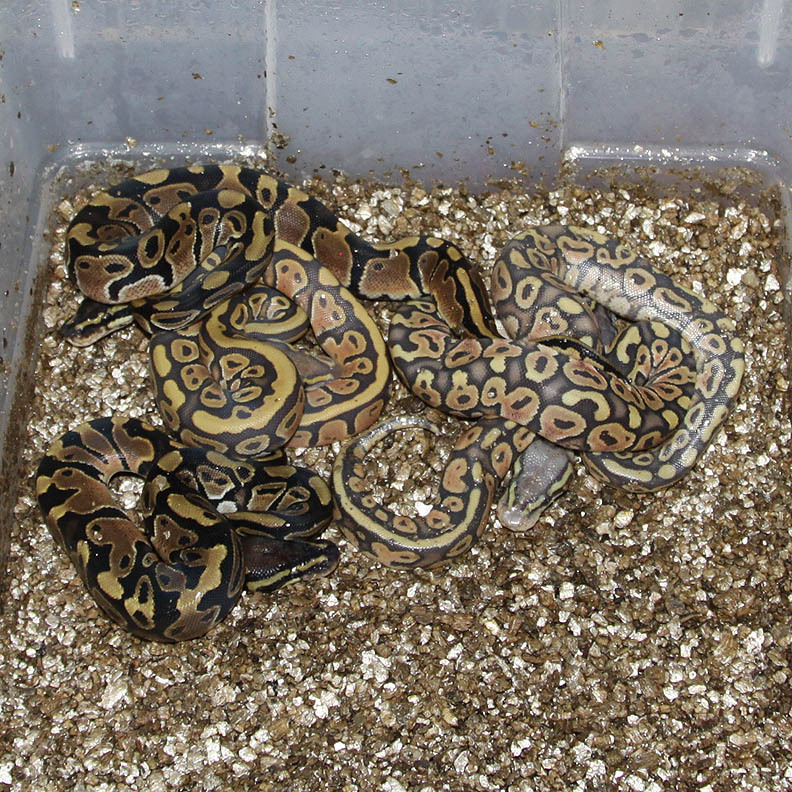 The clutches produced this year will help me figure out if he is genetic or just a random anomaly. 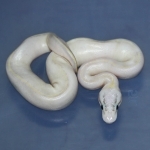 Description: Ivory "Ghost" 1/09 x Pastel YB DH OG 4/11. 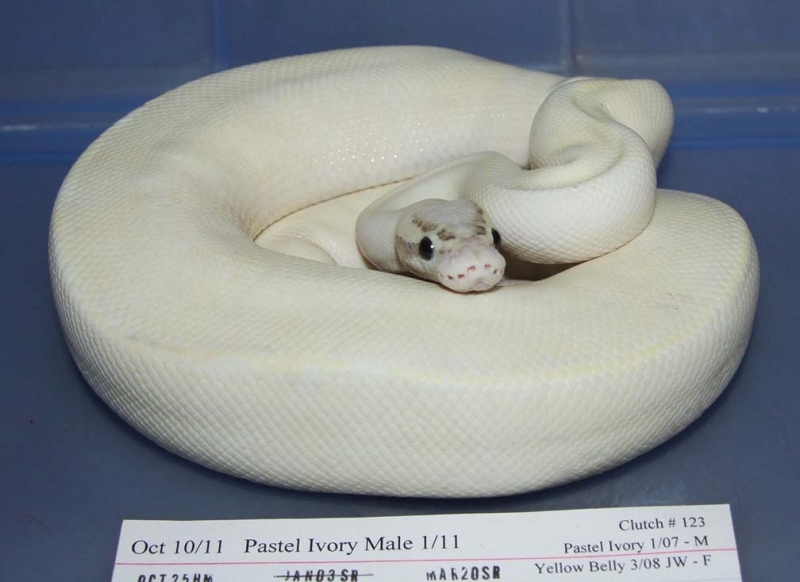 This is one of the Ivory Ghosts daughters. 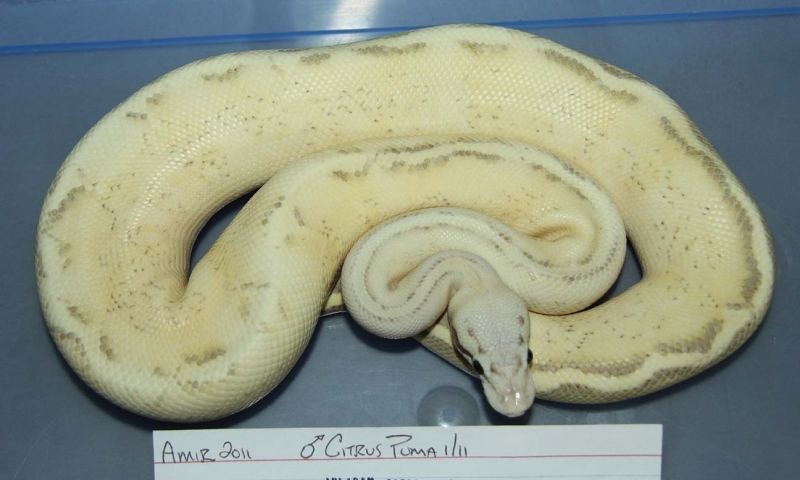 Description: Citrus Puma 1/11 x Spark 2/11 Amir. 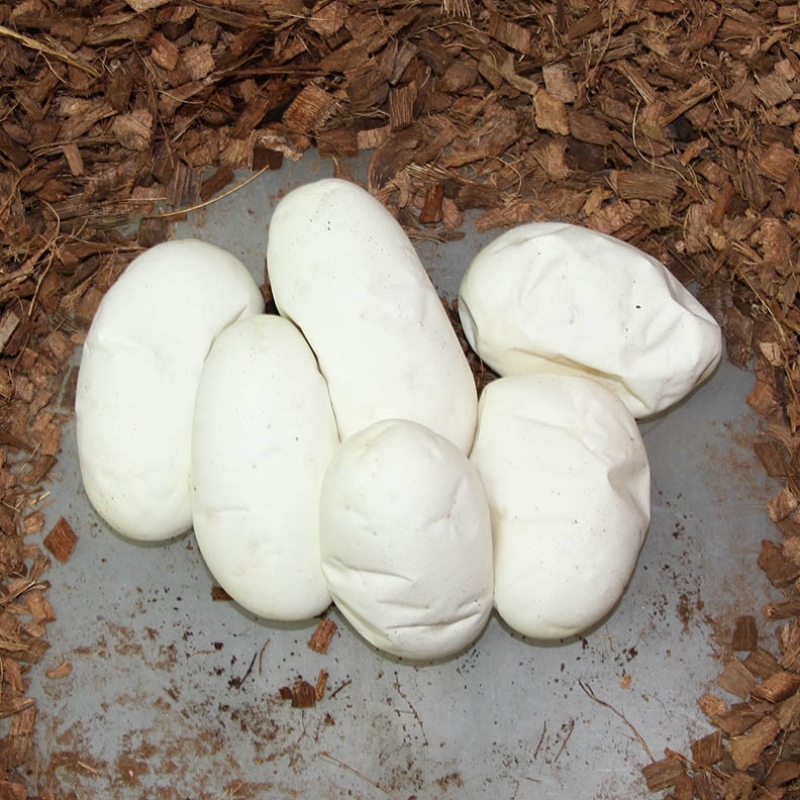 This clutch can potentially produce Super Sparks and Citrus Super Sparks as well as the Puma combos. 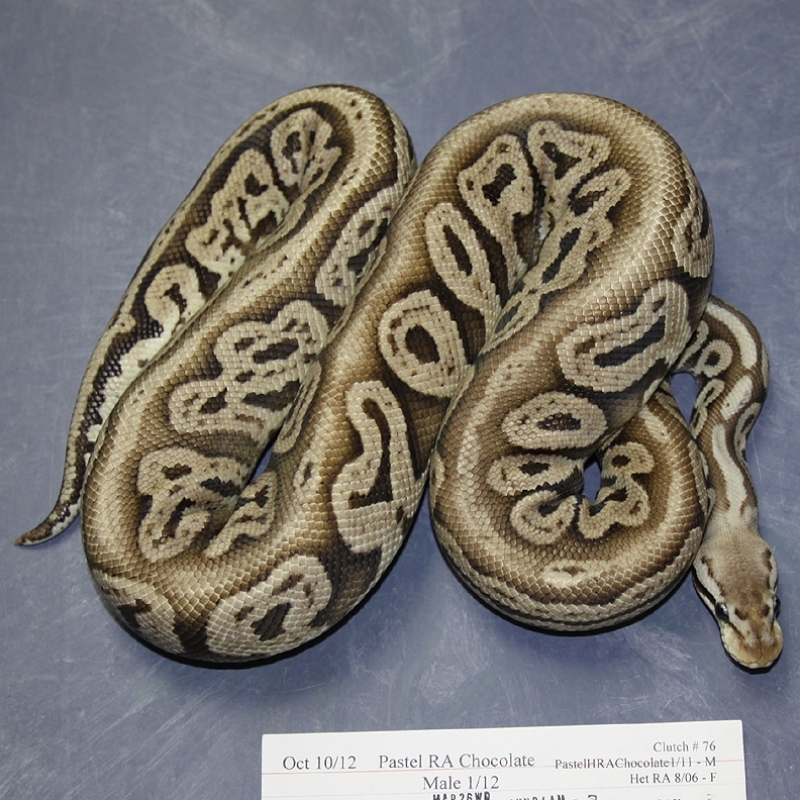 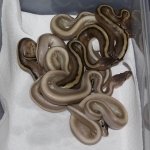 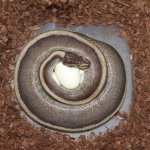 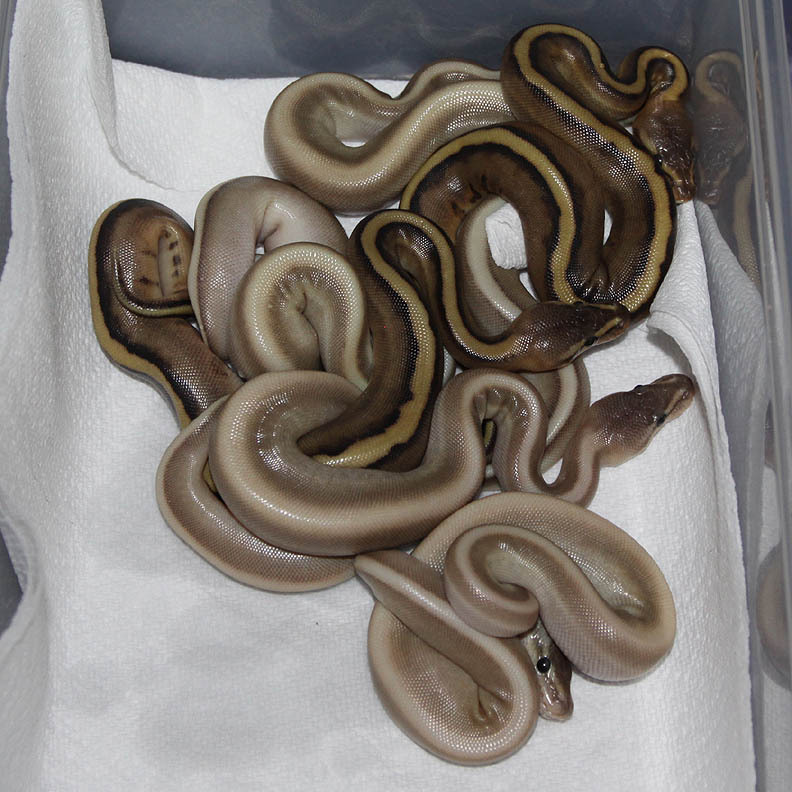 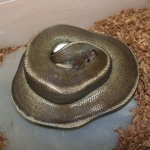 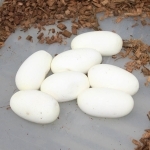 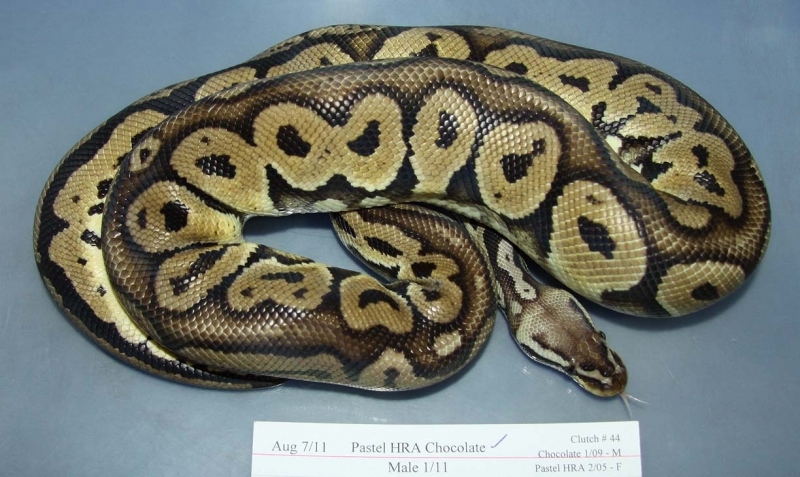 Description: Pastel Chocolate HRA 1/11 x Het Red Axanthic 16/06. 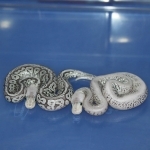 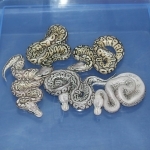 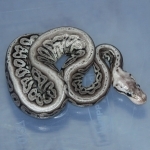 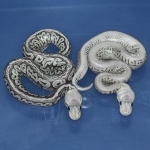 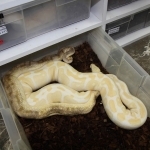 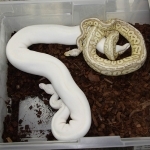 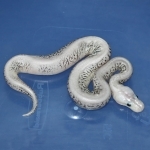 Description: Ivory Ghost 1/09 x Pastel Pin Champ Red Axanthic 1/12. 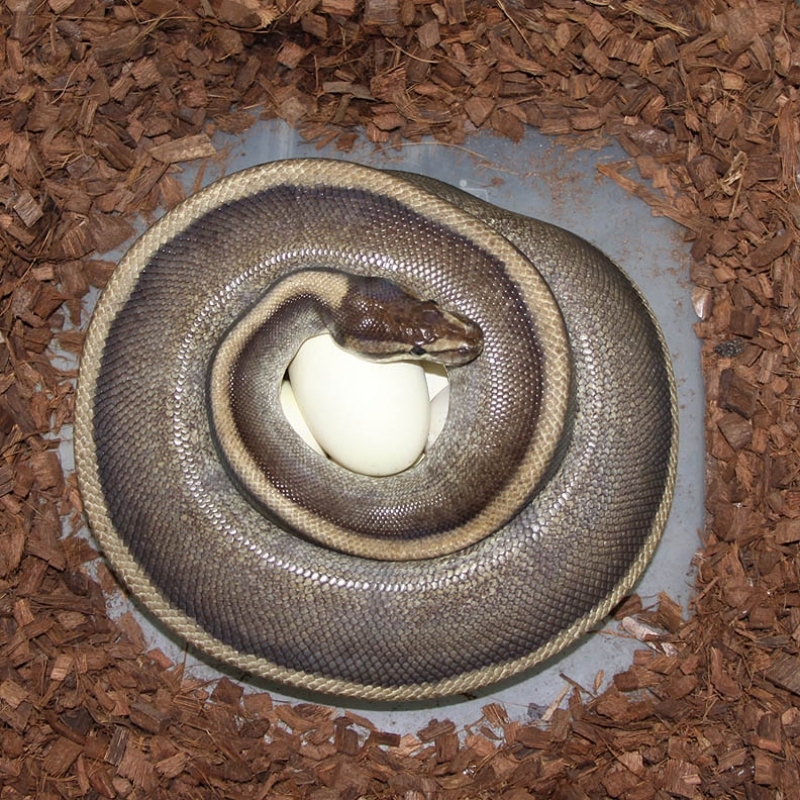 It was getting into March and this female was small but had not yet been bred. 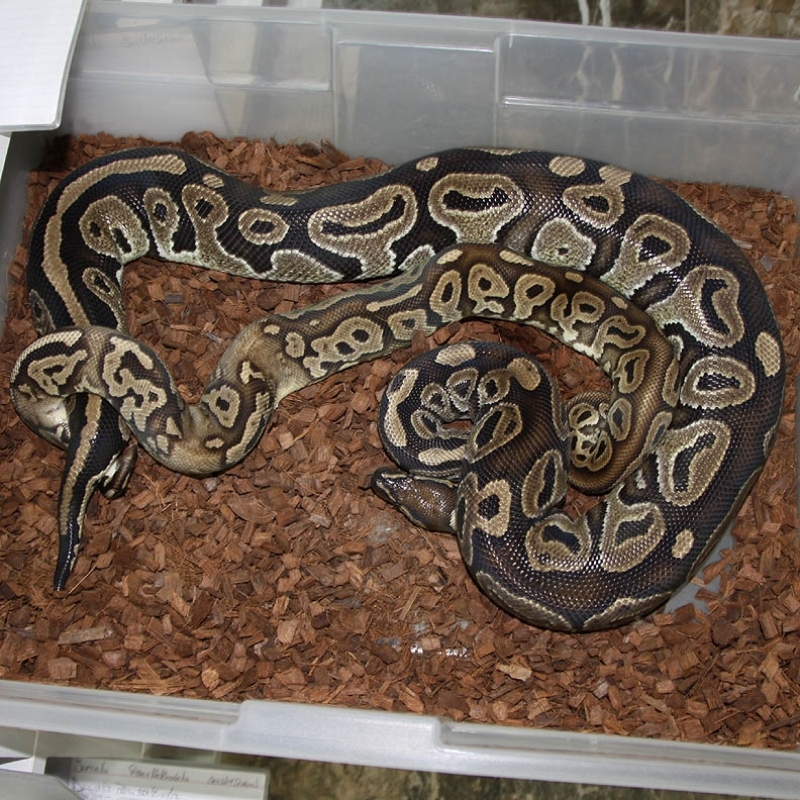 I didn't think she was going to go but I wanted to give her the breeding experience so that she would know what was going on for next year. 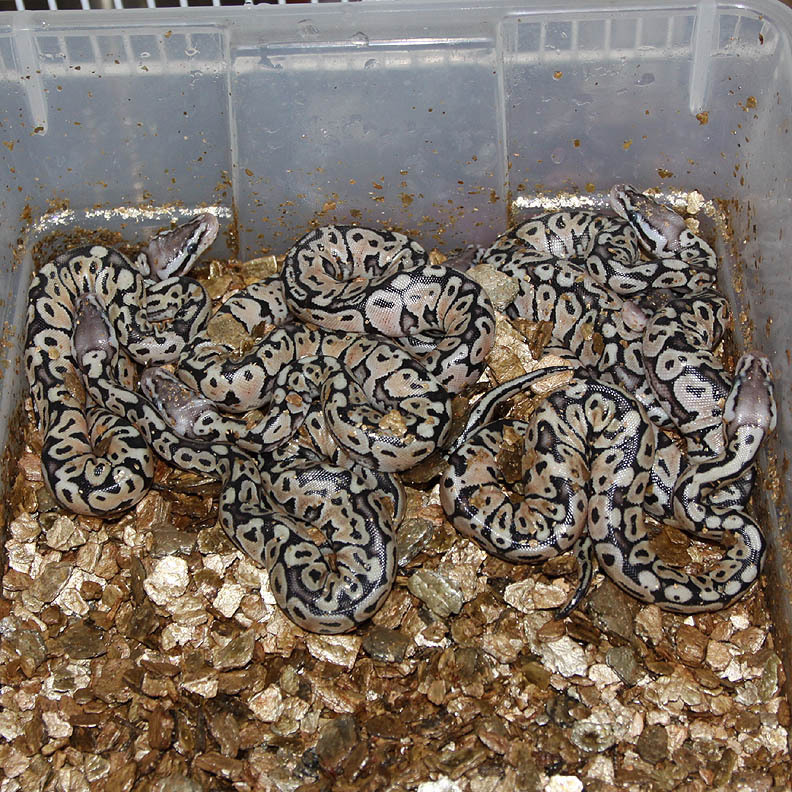 I don't like over breeding my males. 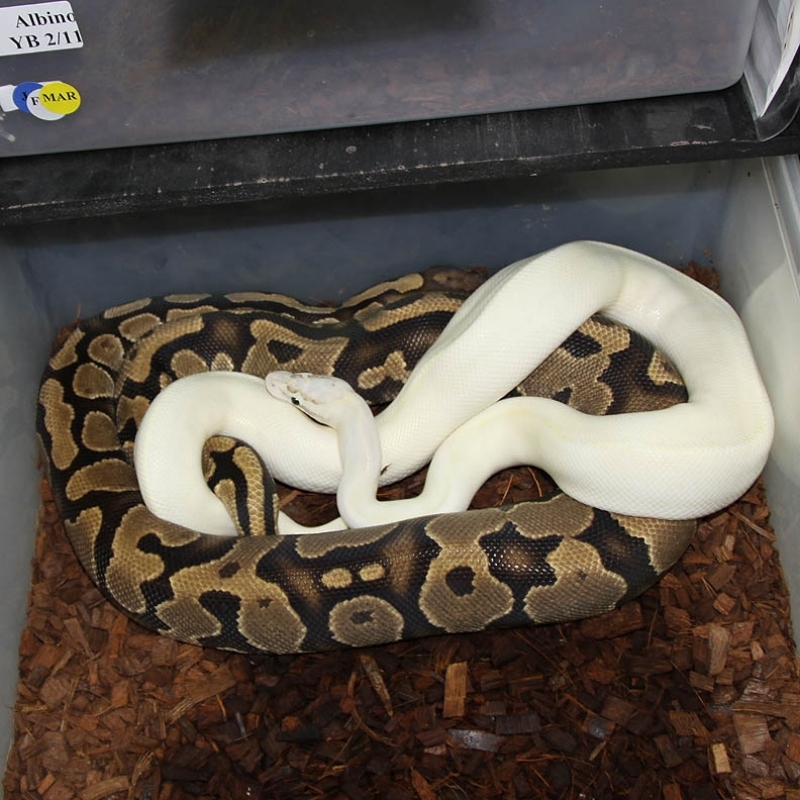 Since the Ivory "Ghost" male had only been bred to 3 females I put him in with this female thinking it wouldn't matter since she wasn't going to produce eggs anyways. 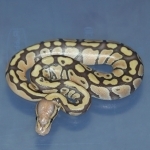 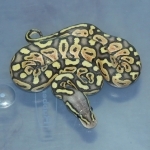 Description: Pastel DH OG/Pied 1/10 x DH OG/Pied 5/10. 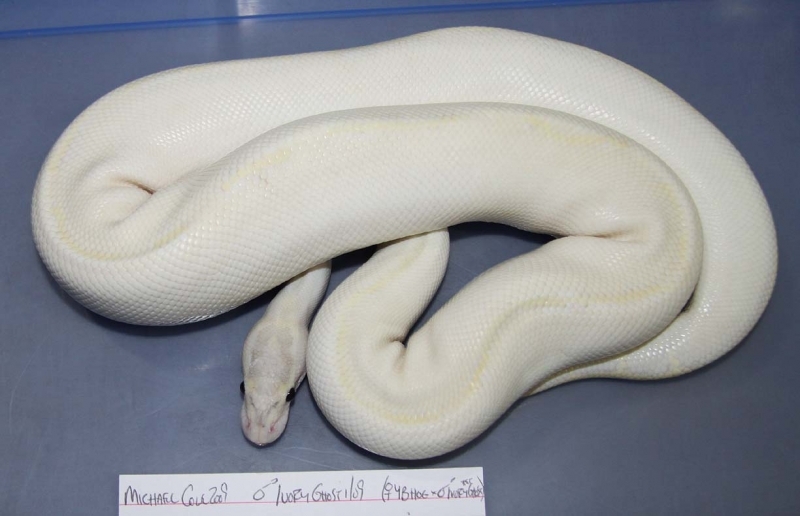 The POG Pied female is really low white! 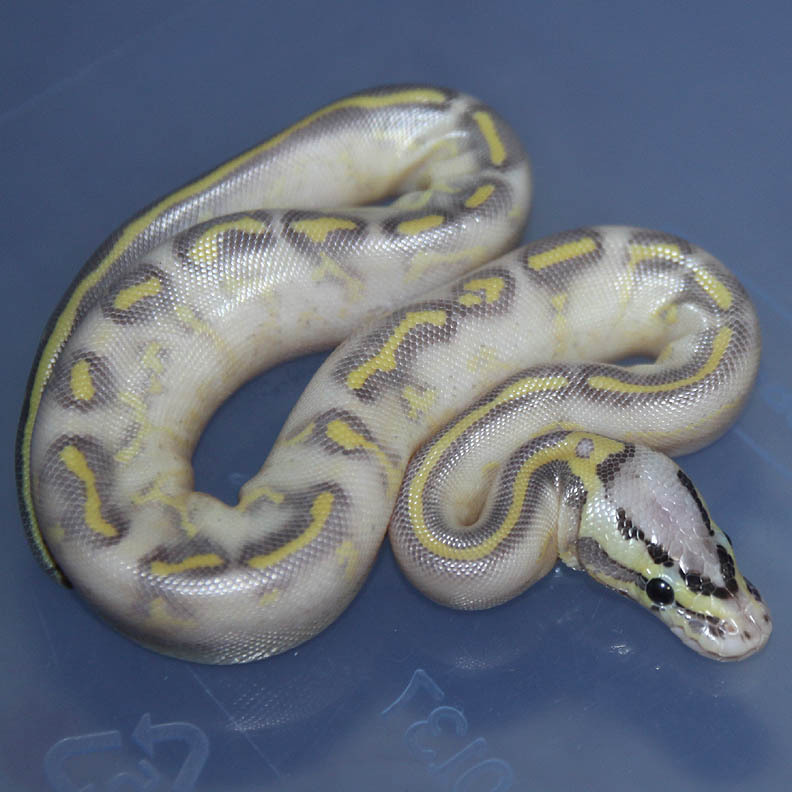 Description: Lemon Pastel Highway 1/13 x HY YB 2/09. 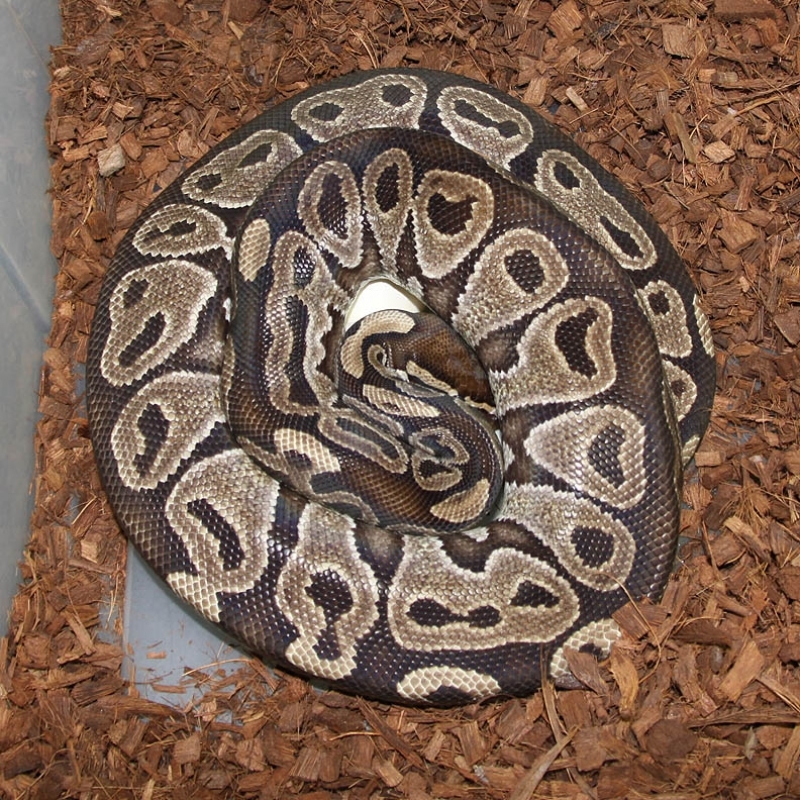 This male is a Bill Brant (The Animal Company) line Highway purchased from Sean @ EBN. 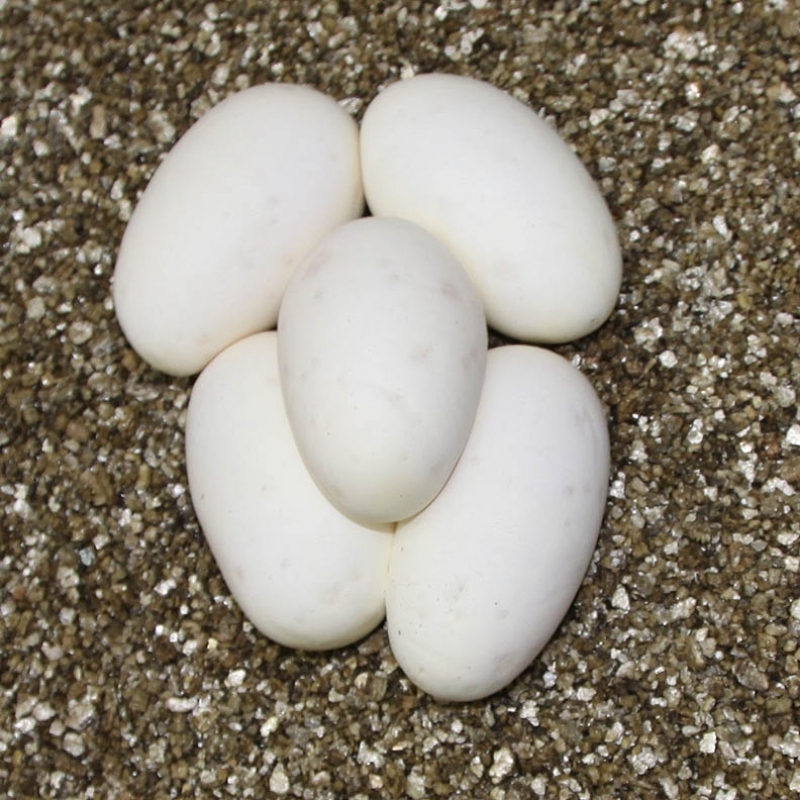 The odds of producing Highways and Ivories was the same. 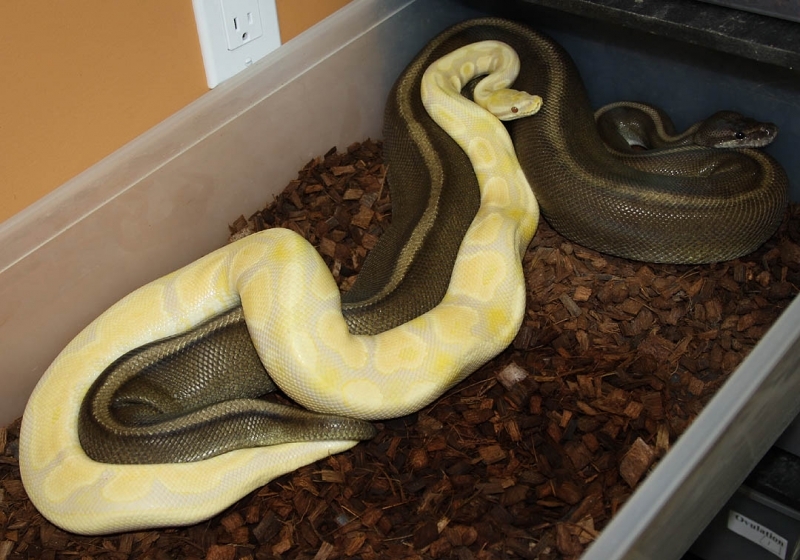 I wish the odds were reversed but I'll take what I can get! 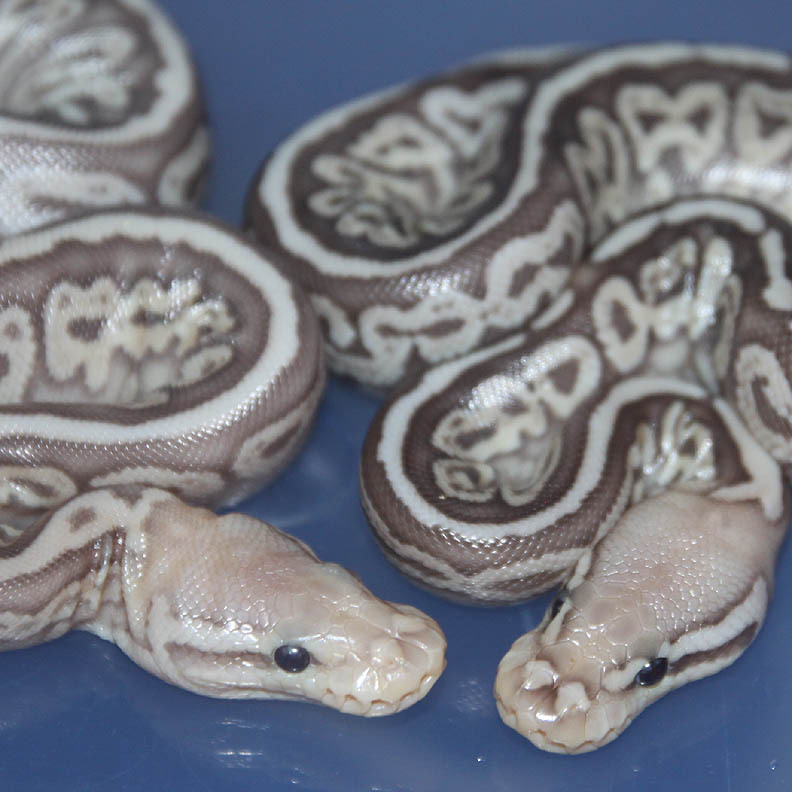 I'm definitely happy with these 2 girls!! 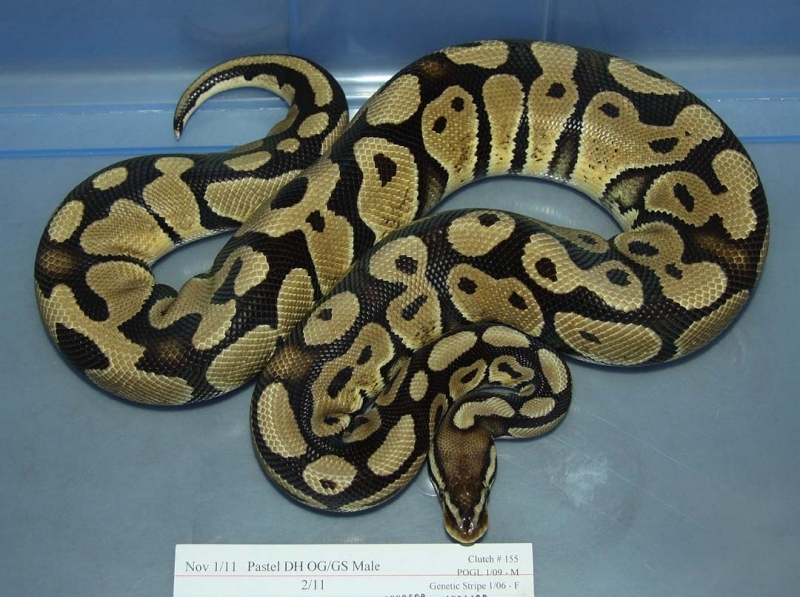 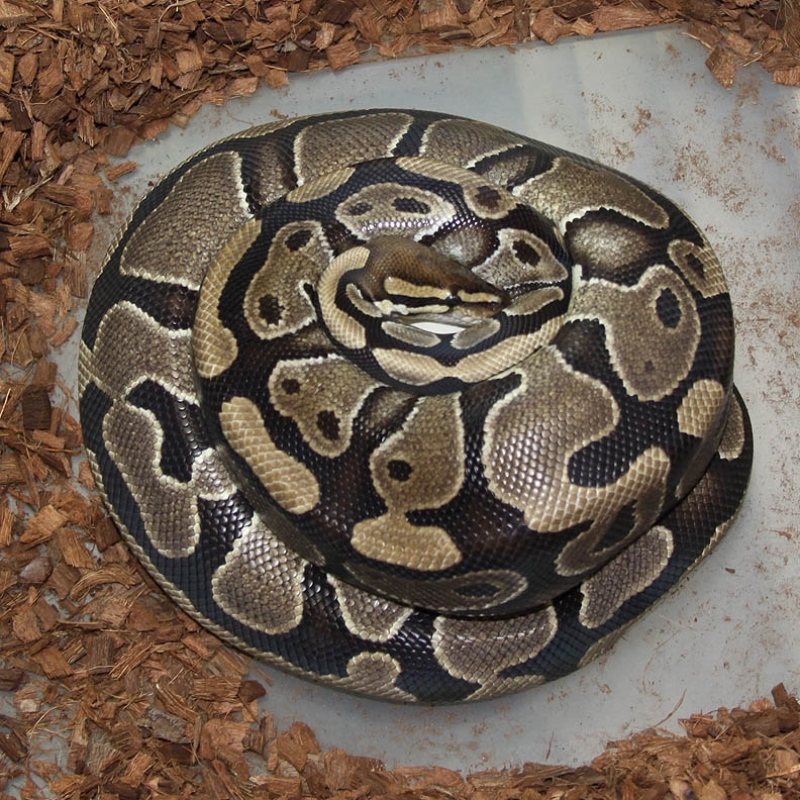 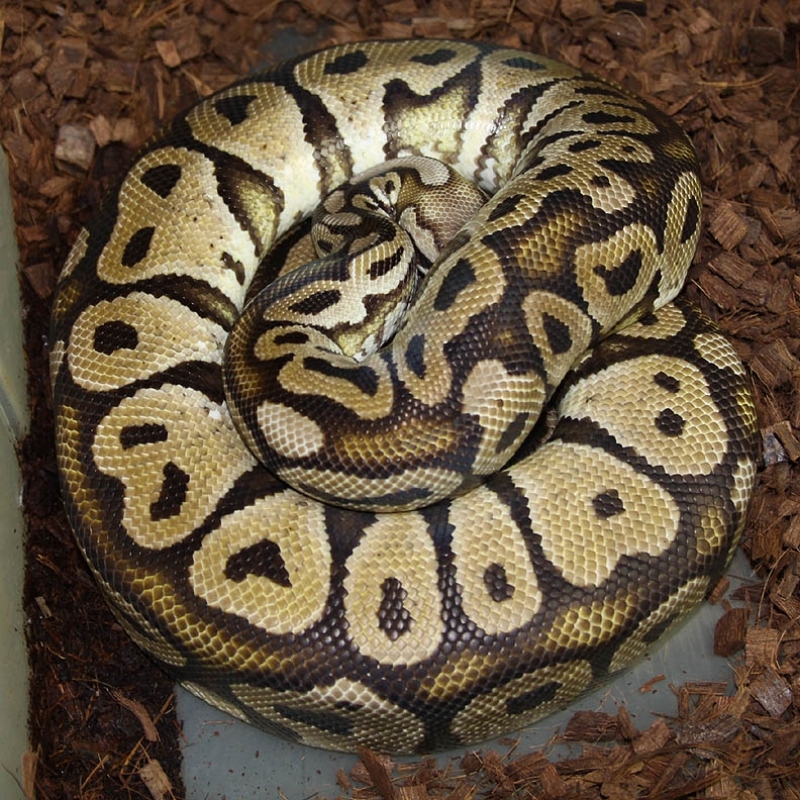 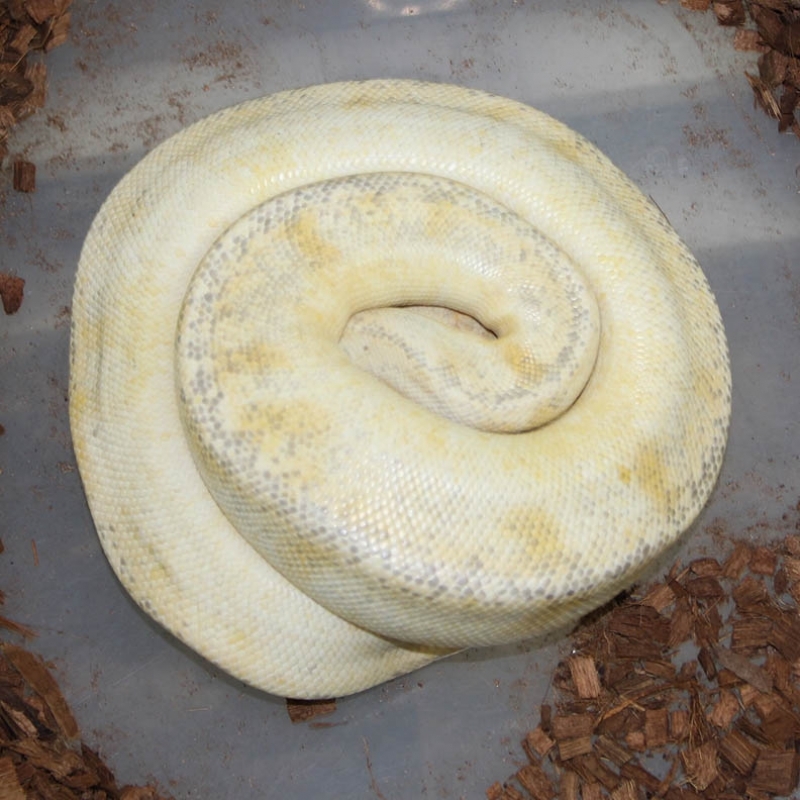 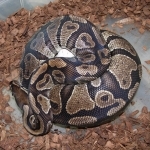 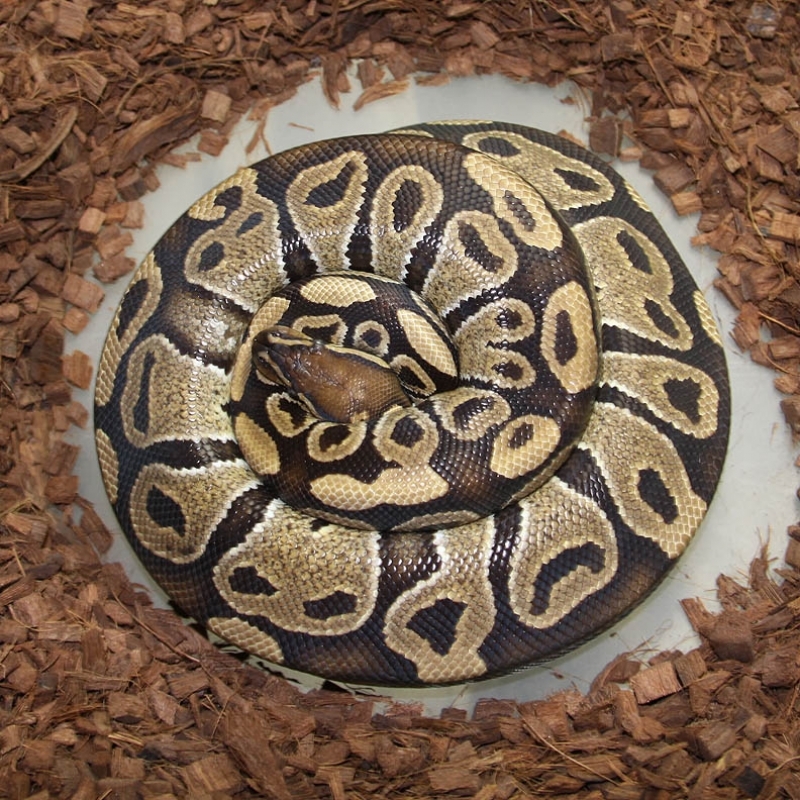 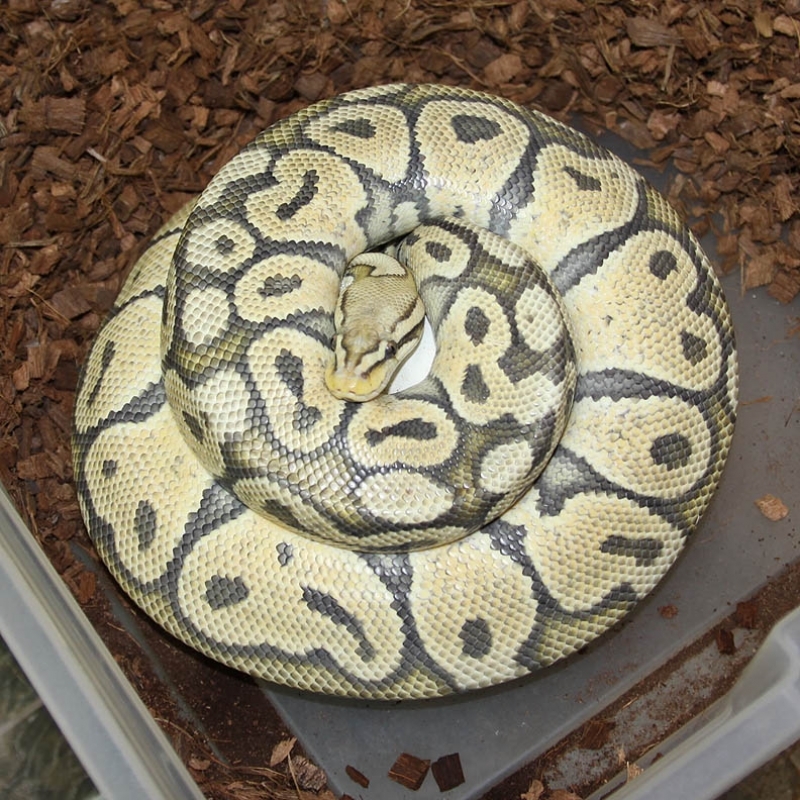 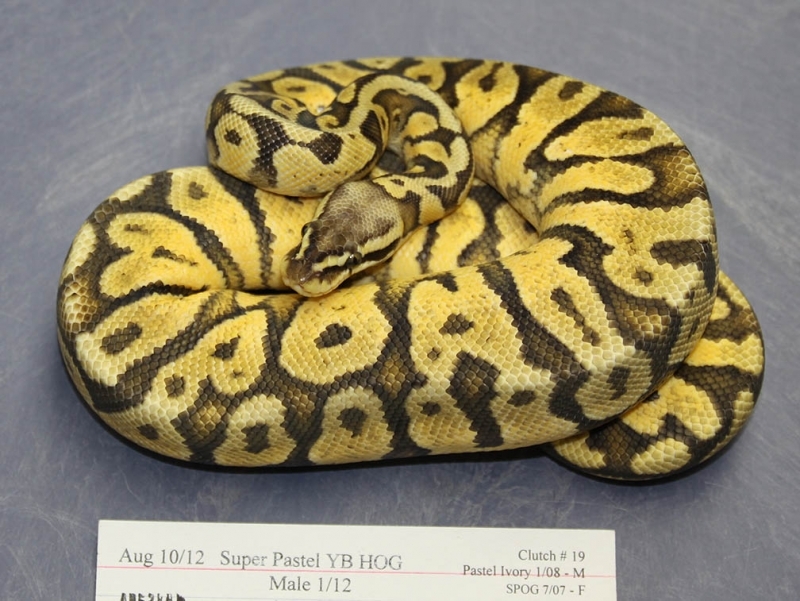 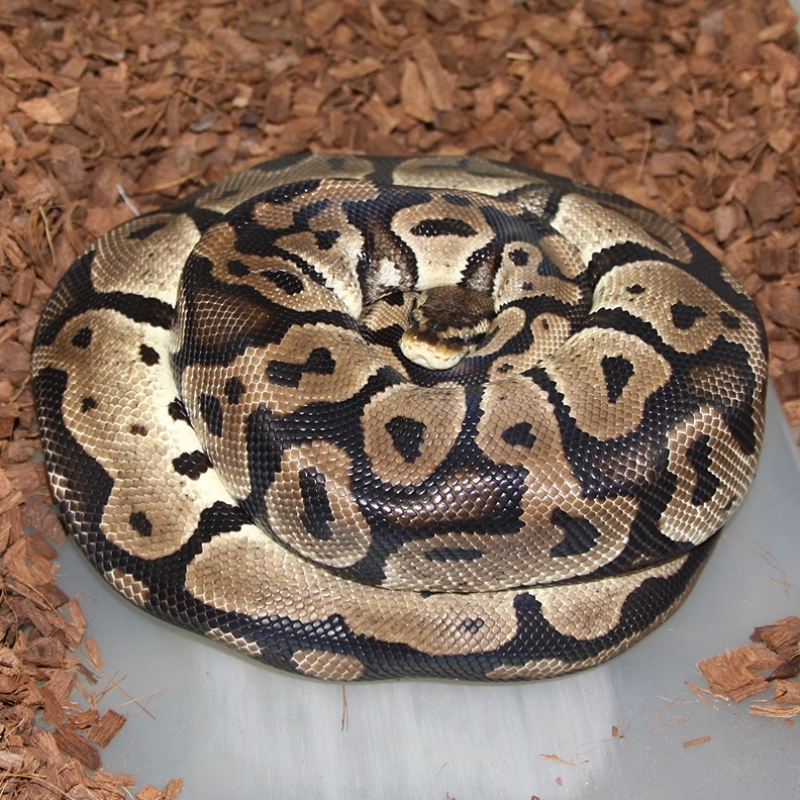 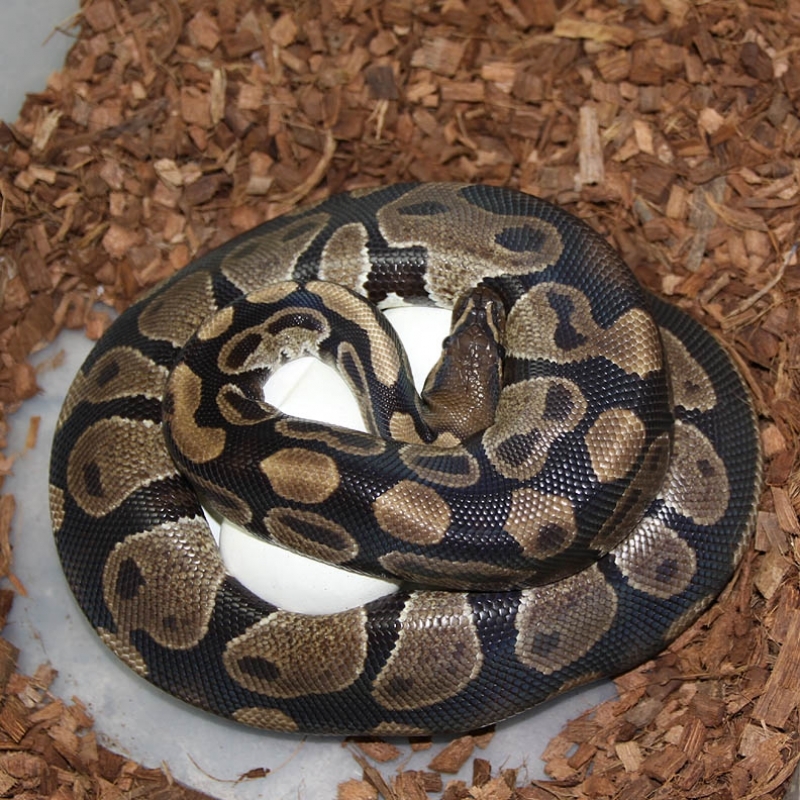 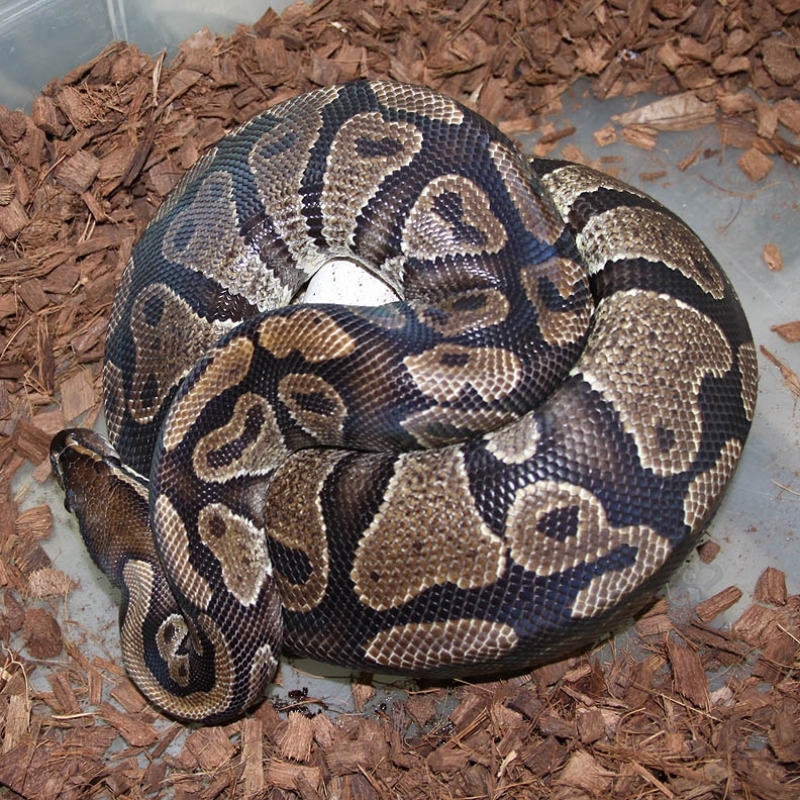 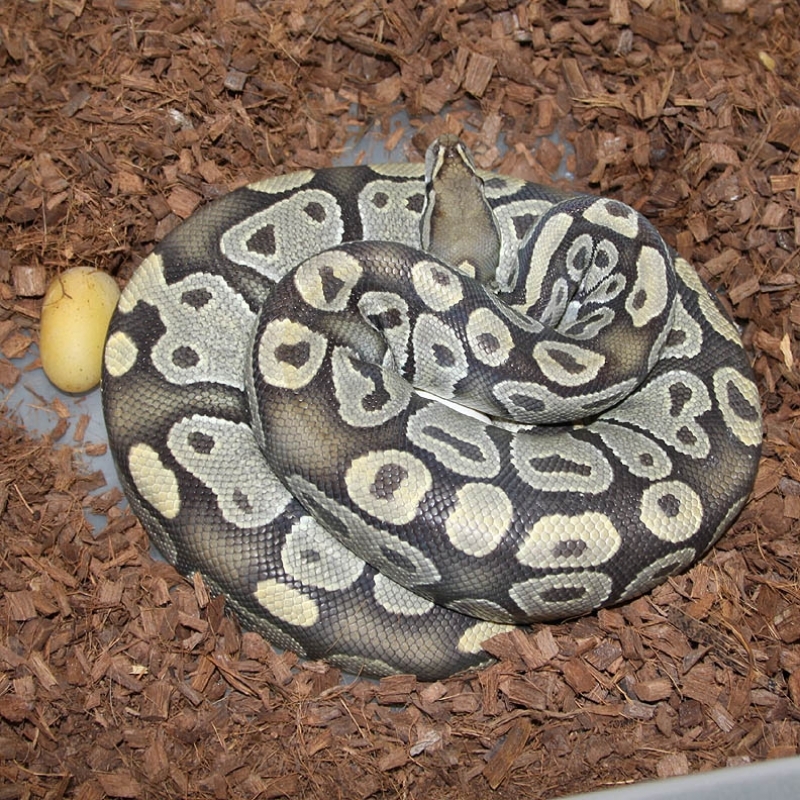 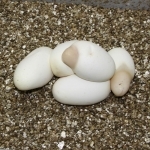 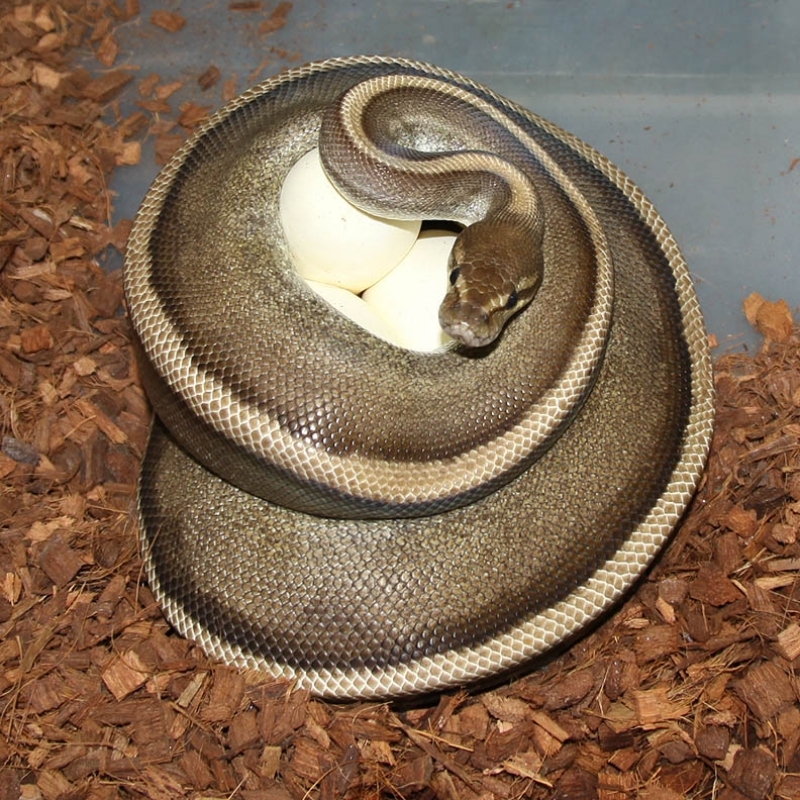 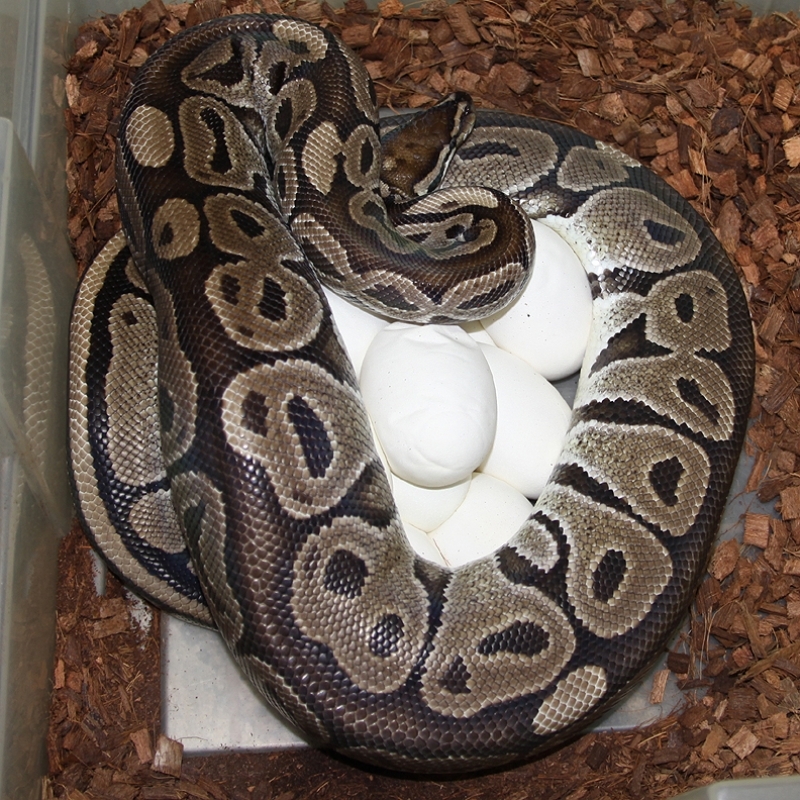 Description: Super Pastel Yellow Belly Het Orange Ghost (SPYBHOG) 1/12 x Het RA/OG 1/06. 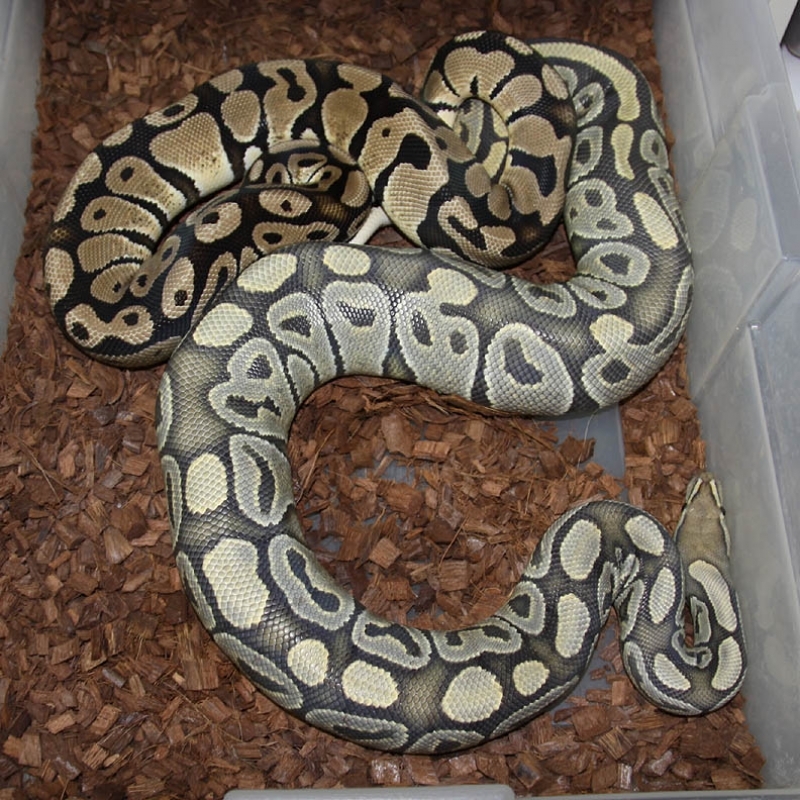 I only seen this male breed this female 1 time back on Feb 21 2014. 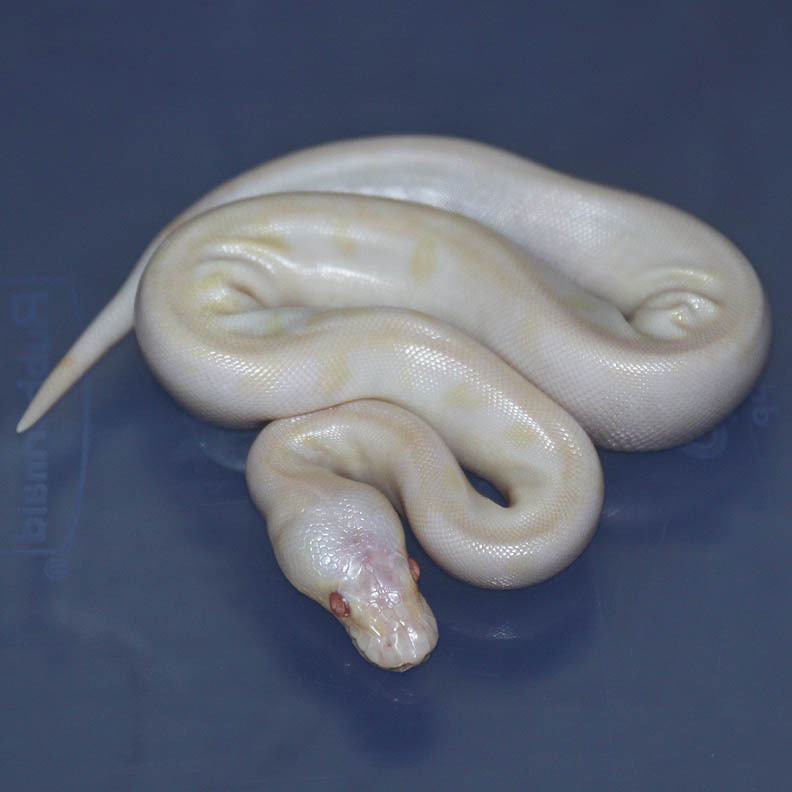 Description: Albino YB 2/11 x Albino 3/10. 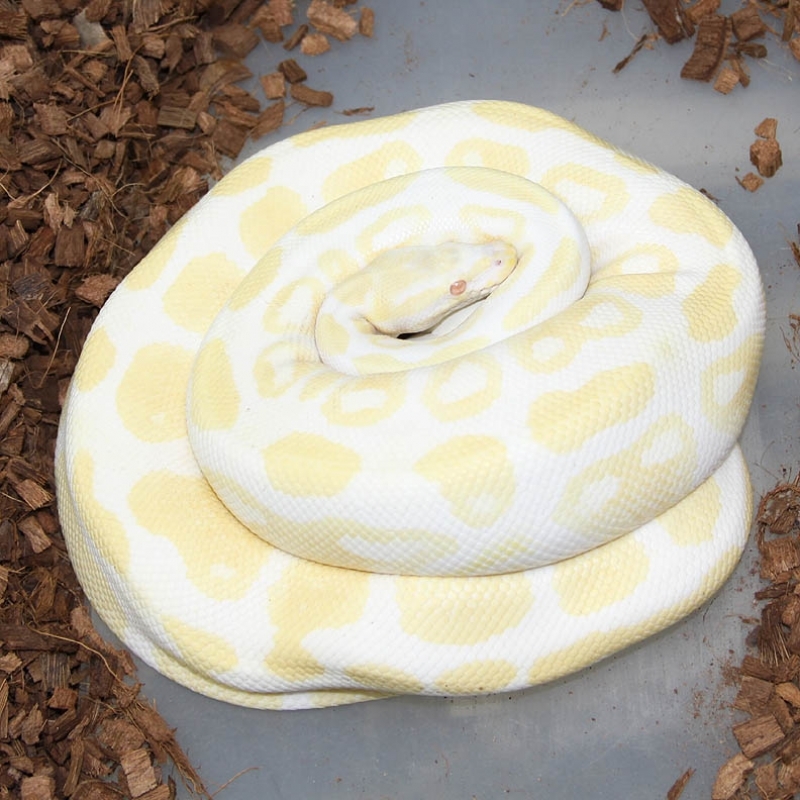 The Albino "YB" is not a Yellow Belly. So, this pairing was Albino X Albino...............Arggggg.. 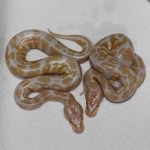 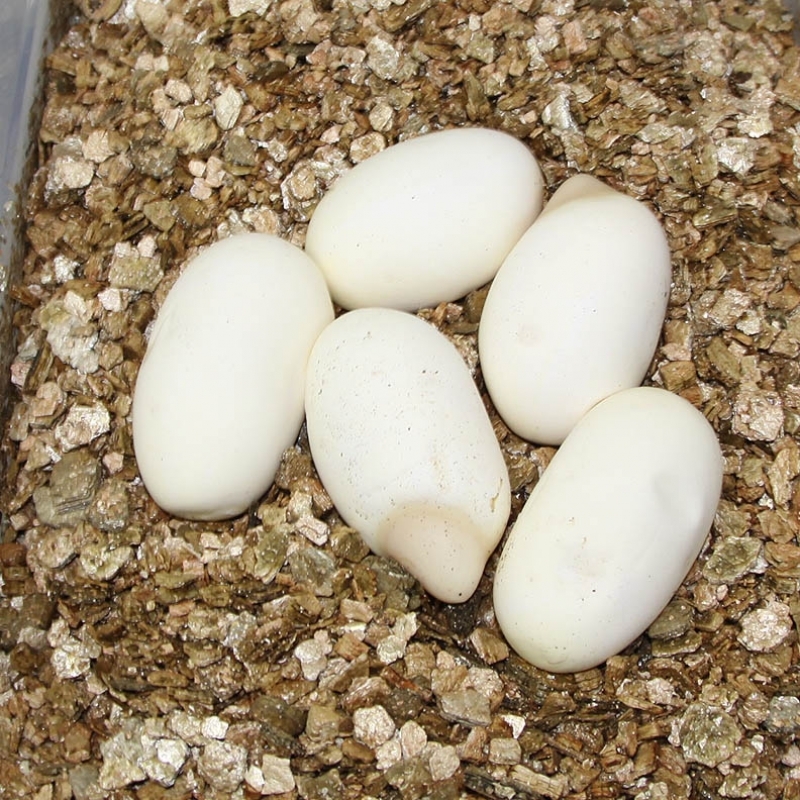 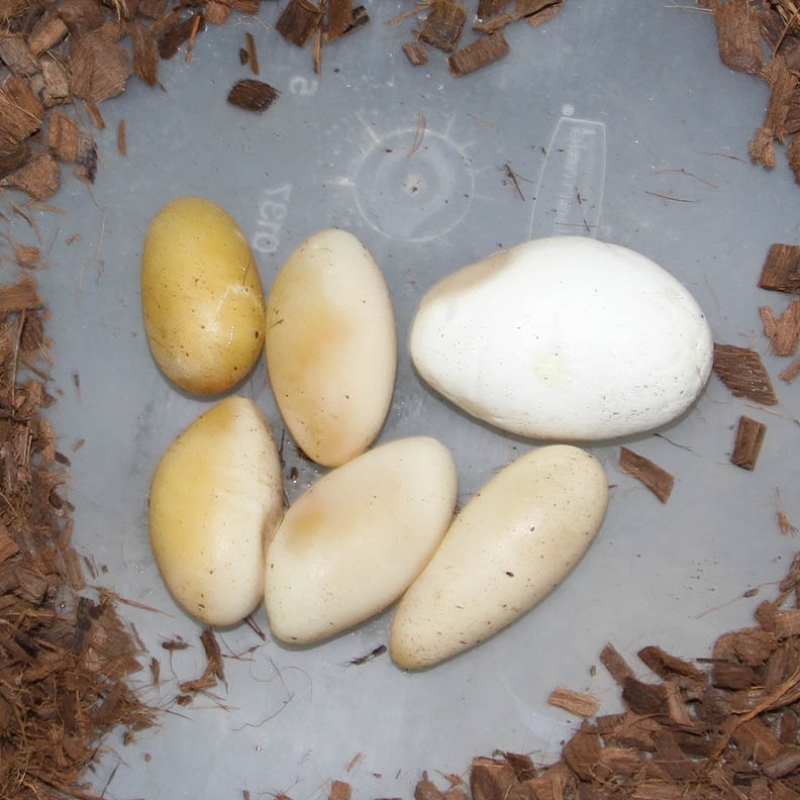 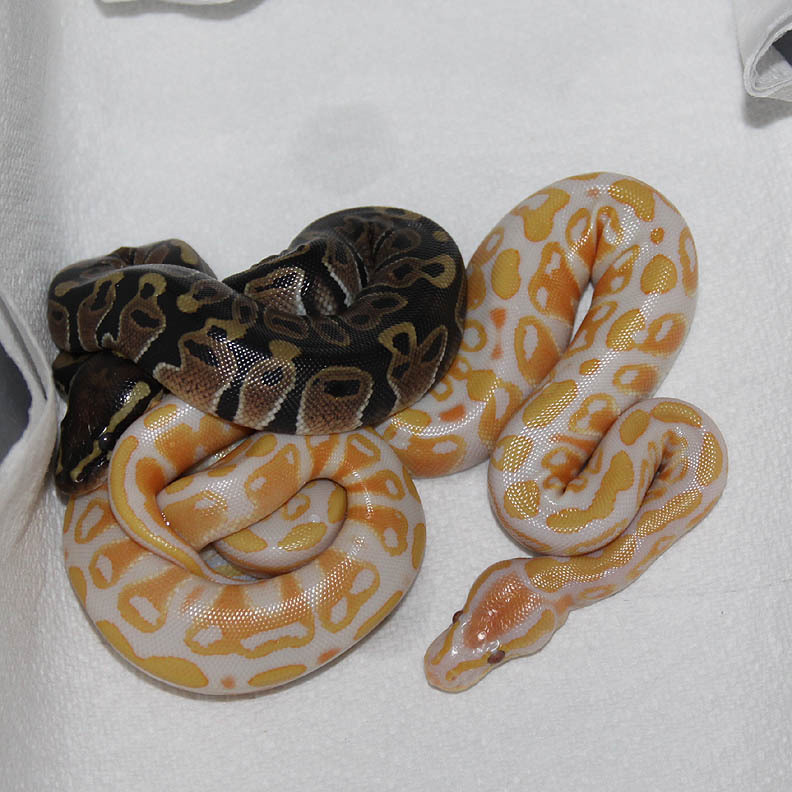 Description: Pastel Champagne Het Albino 1/11 x Het Albino 6/07. 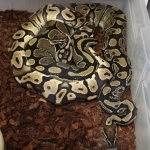 Description: POGL (Green) 1/07 x Green Ghost 1/08. 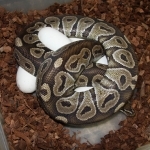 This is disappointing. 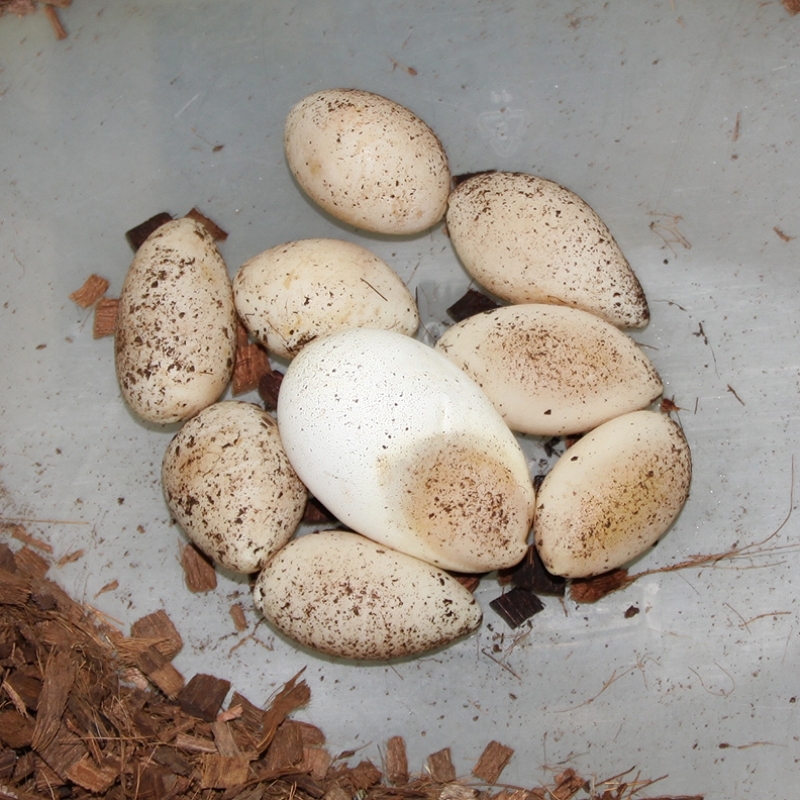 Although, 1 egg is better than none! 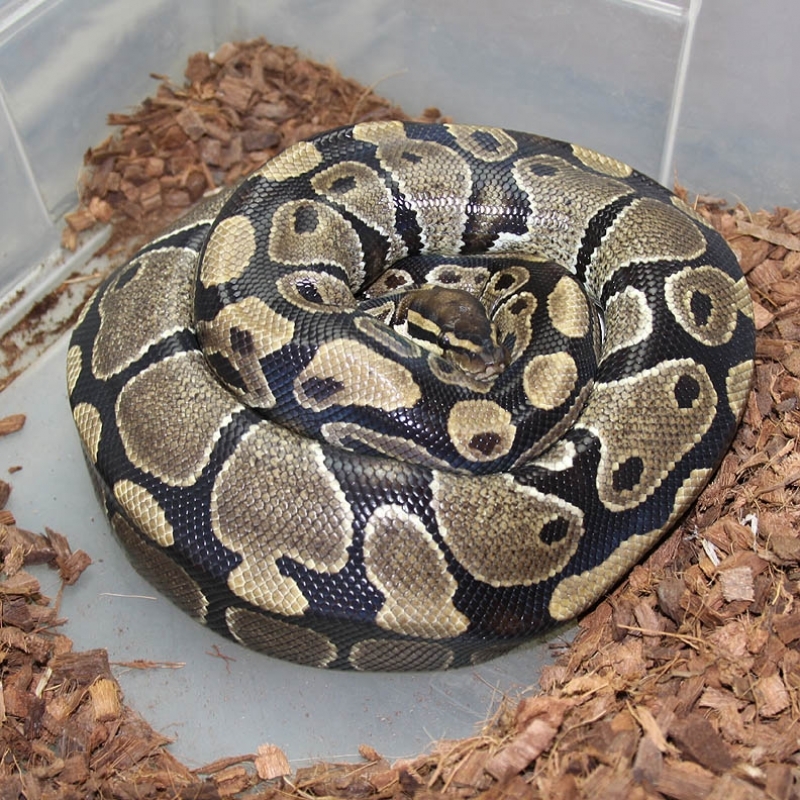 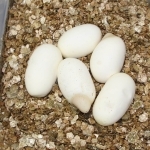 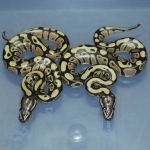 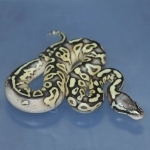 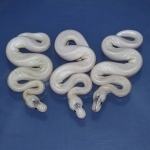 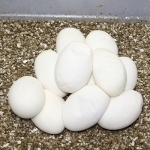 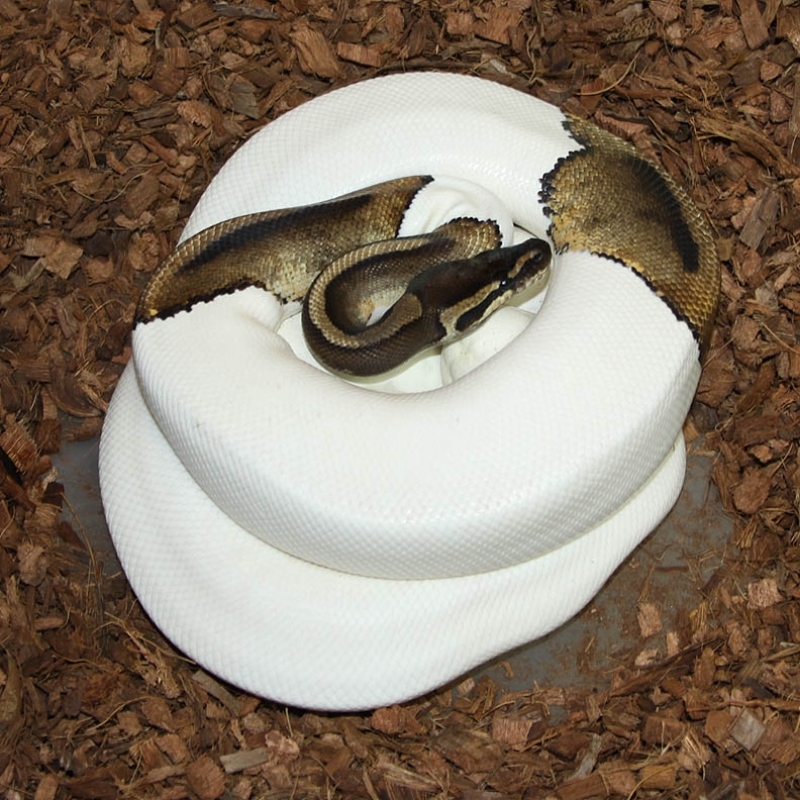 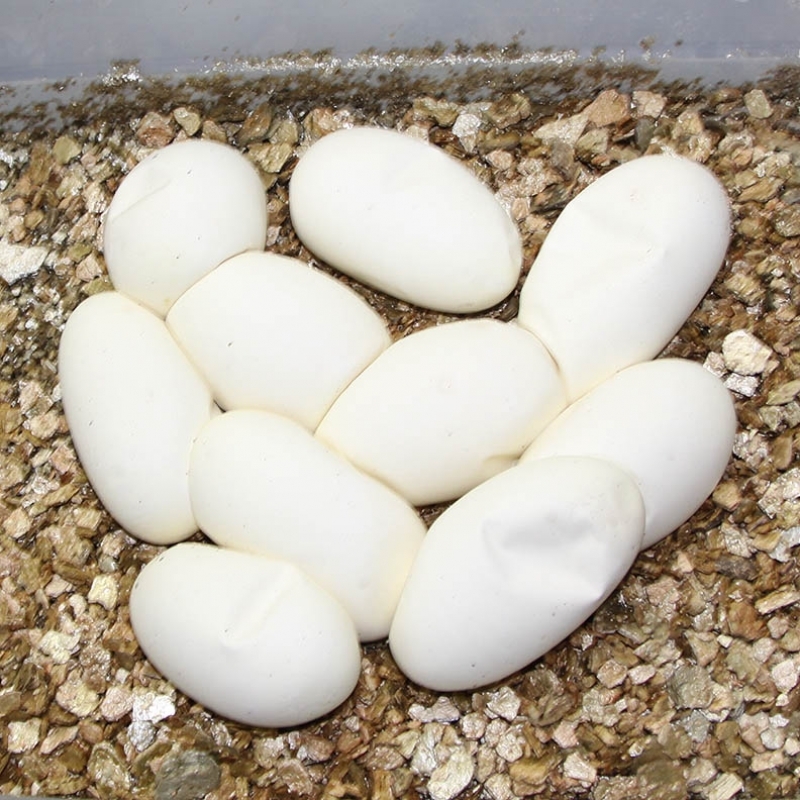 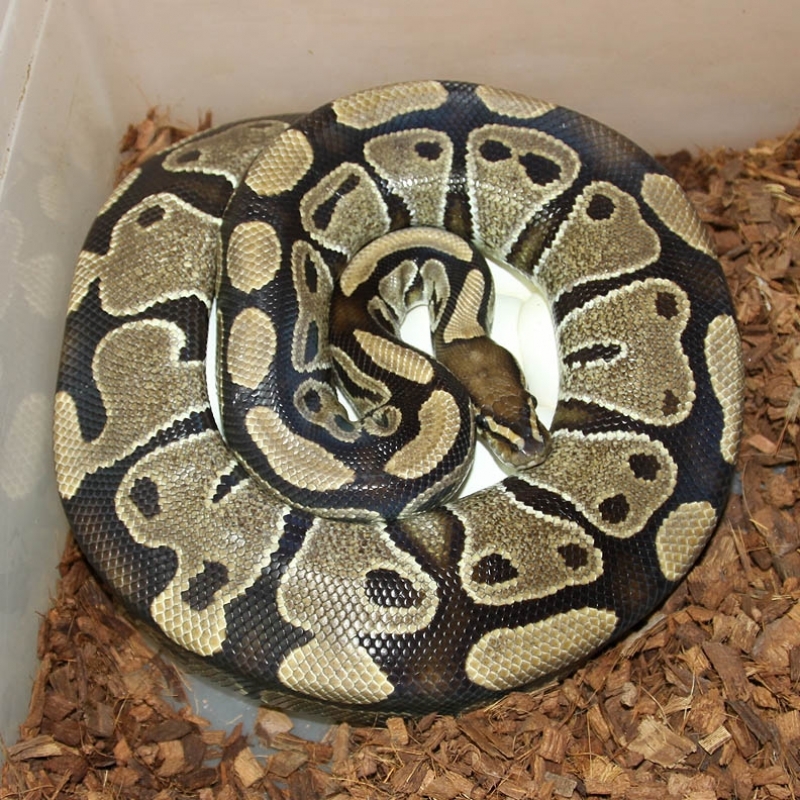 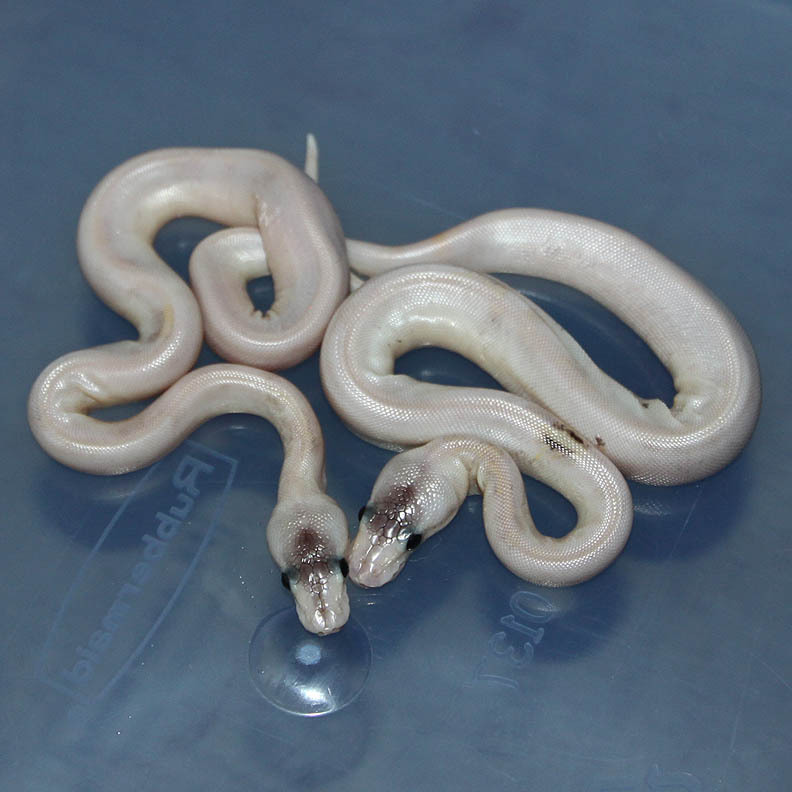 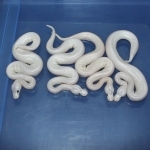 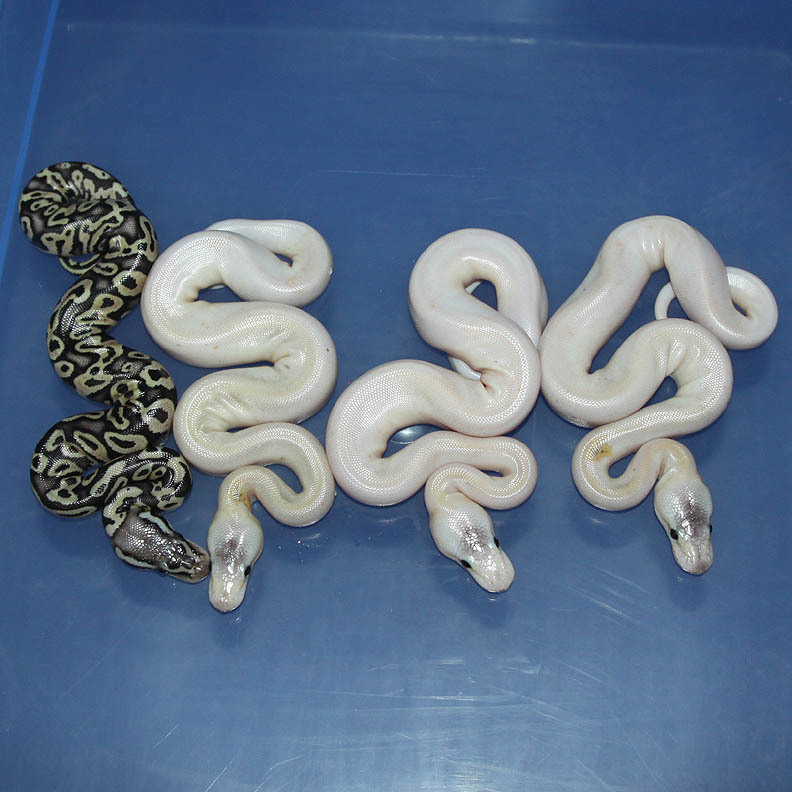 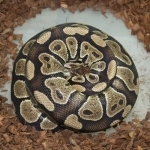 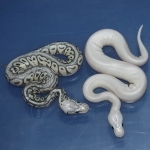 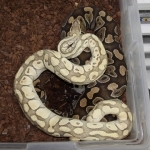 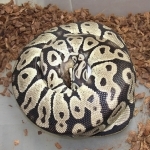 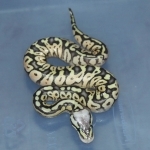 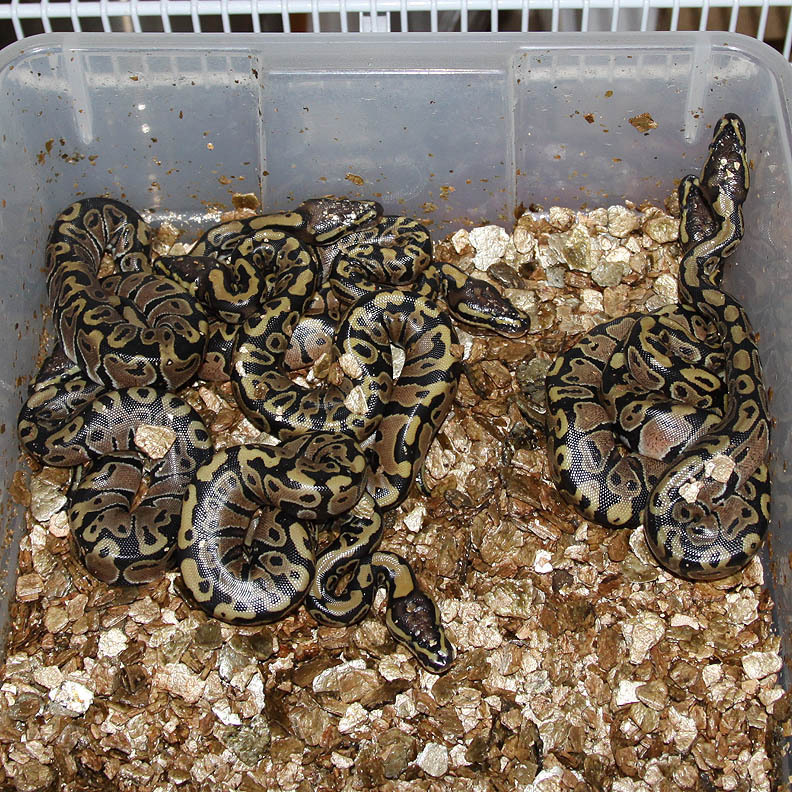 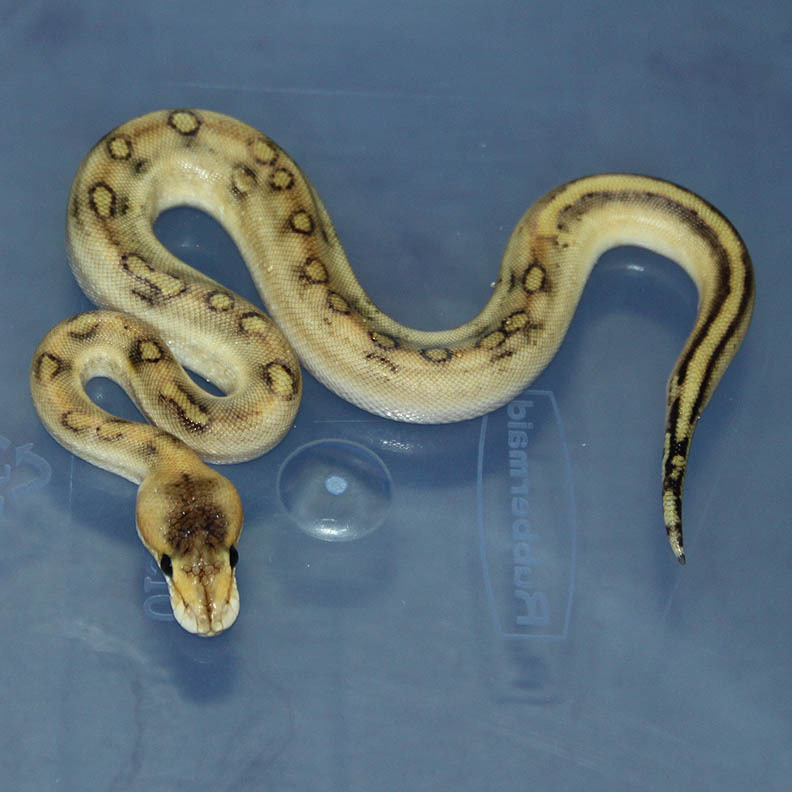 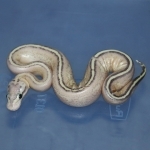 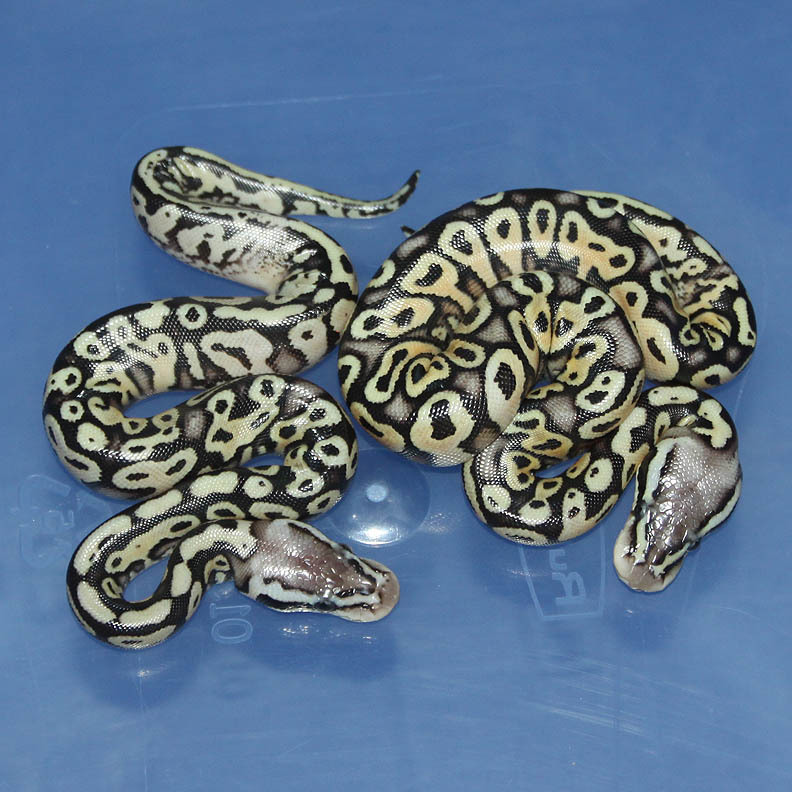 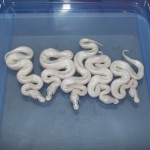 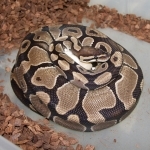 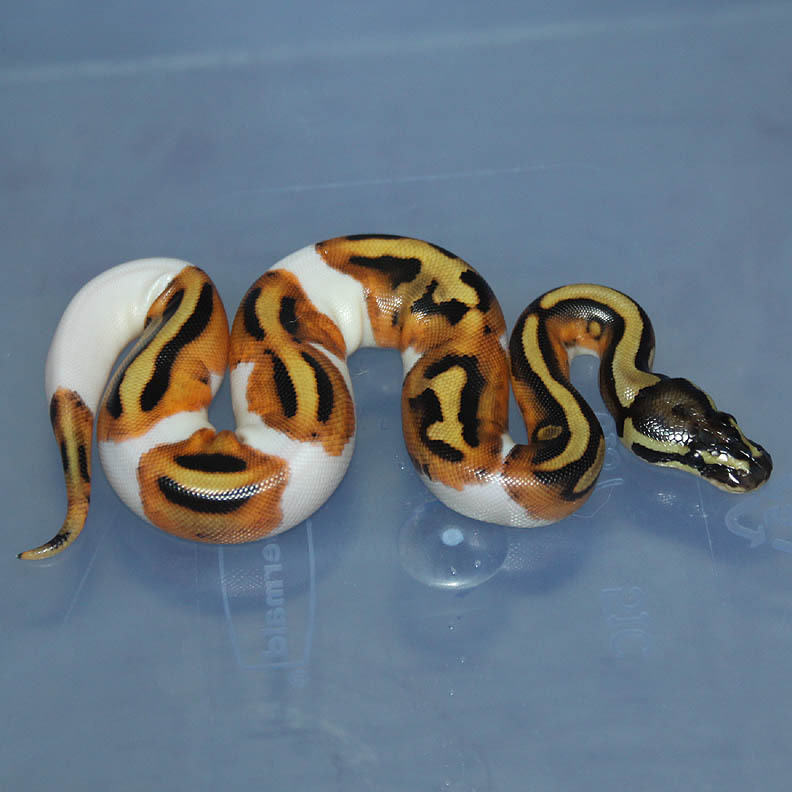 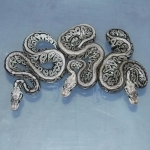 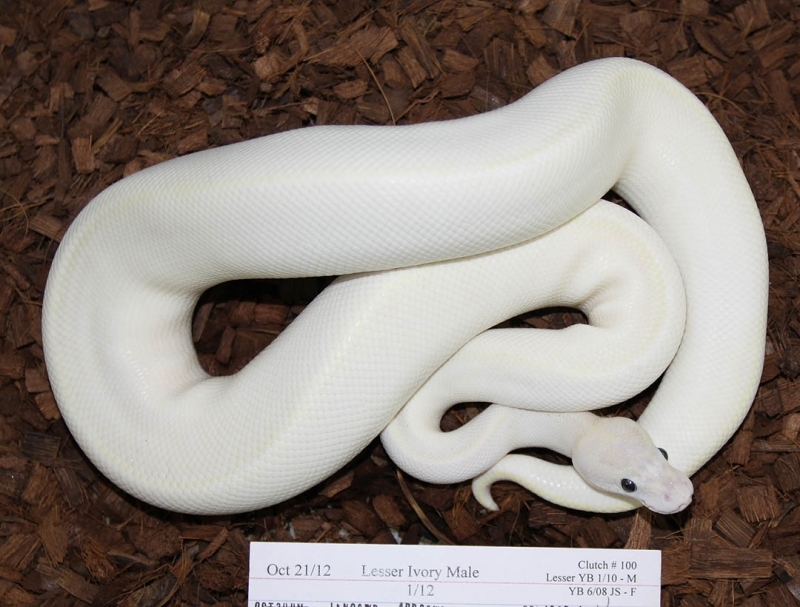 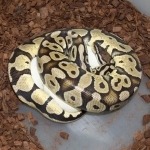 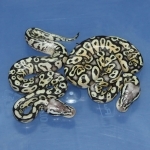 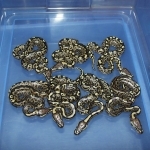 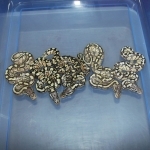 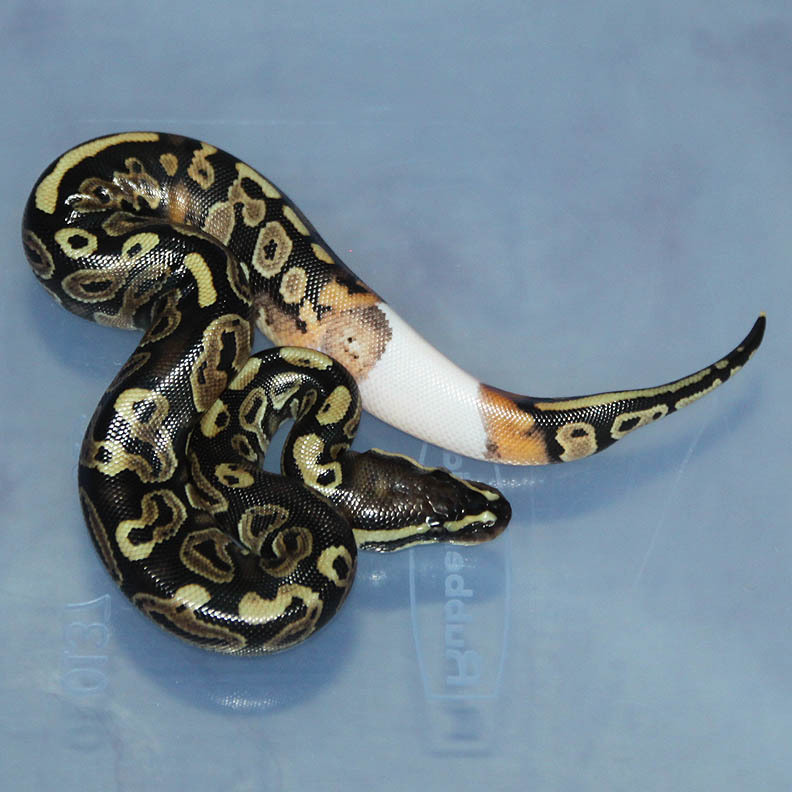 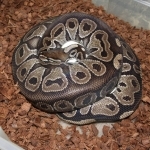 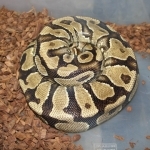 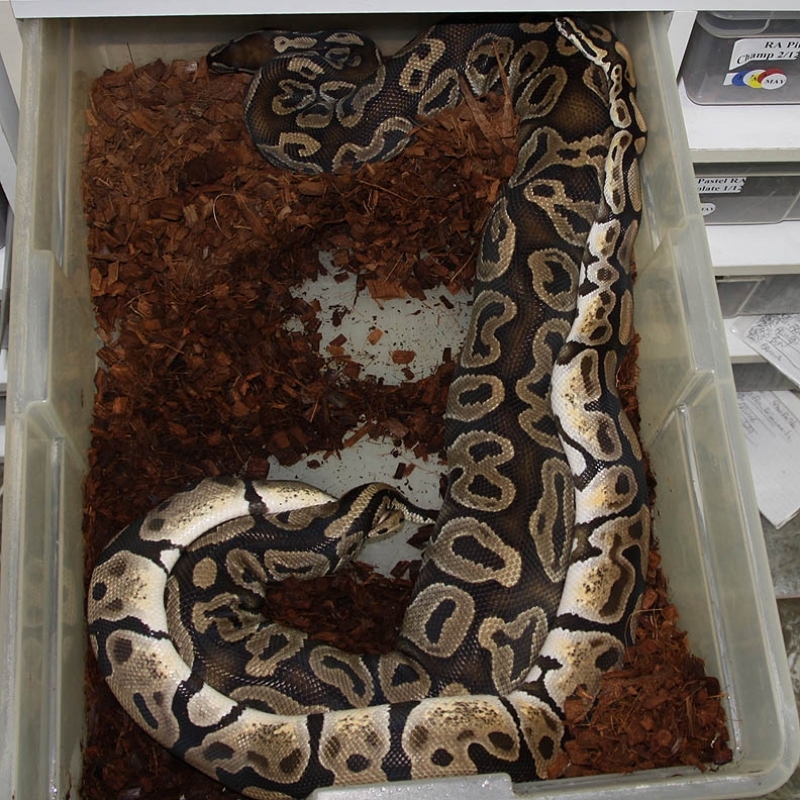 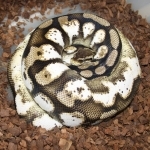 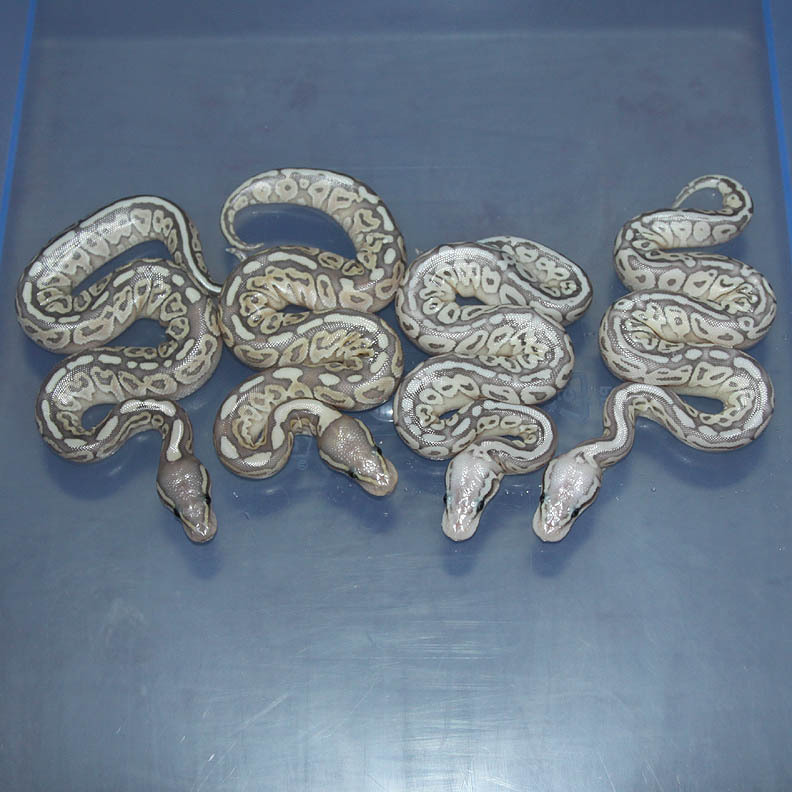 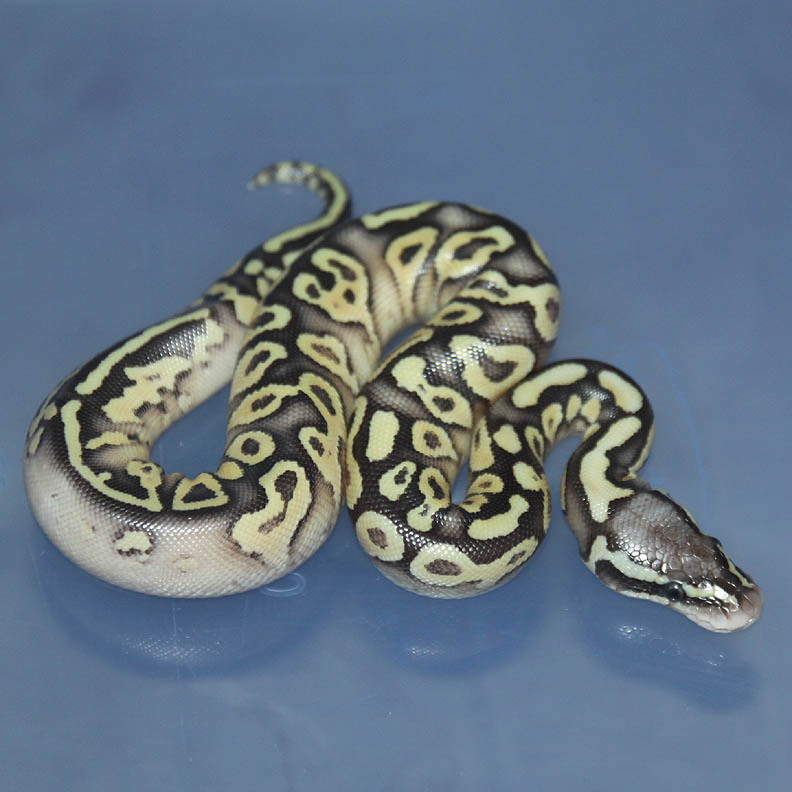 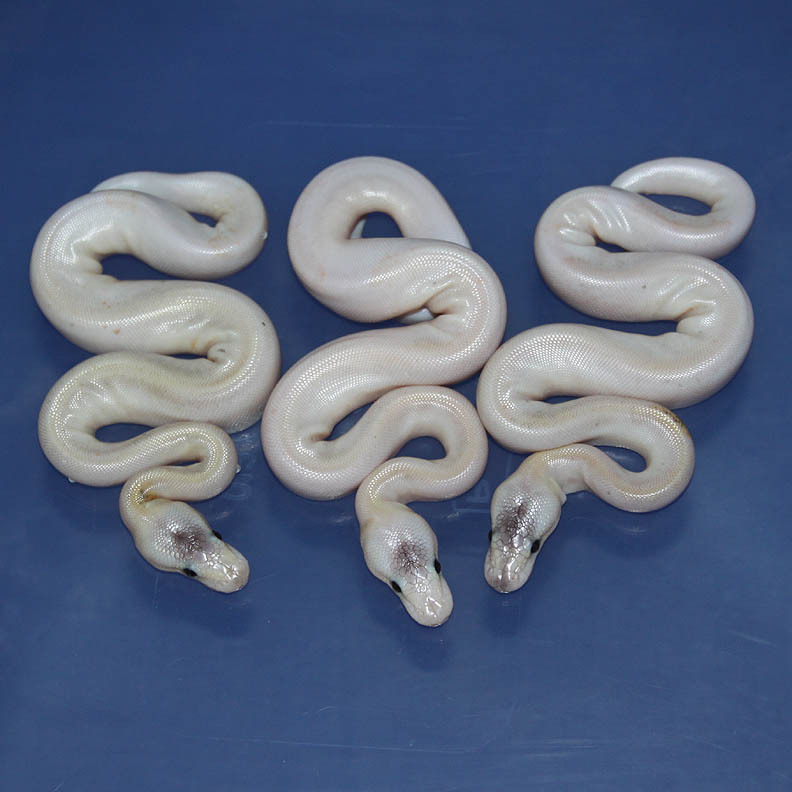 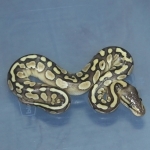 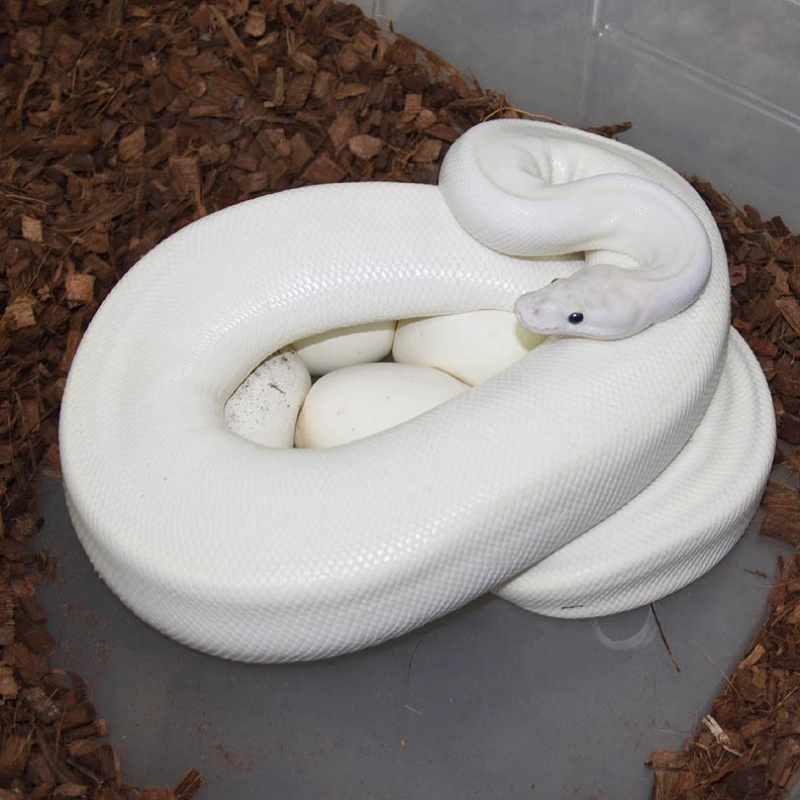 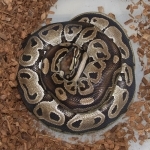 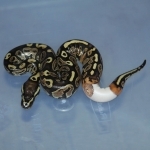 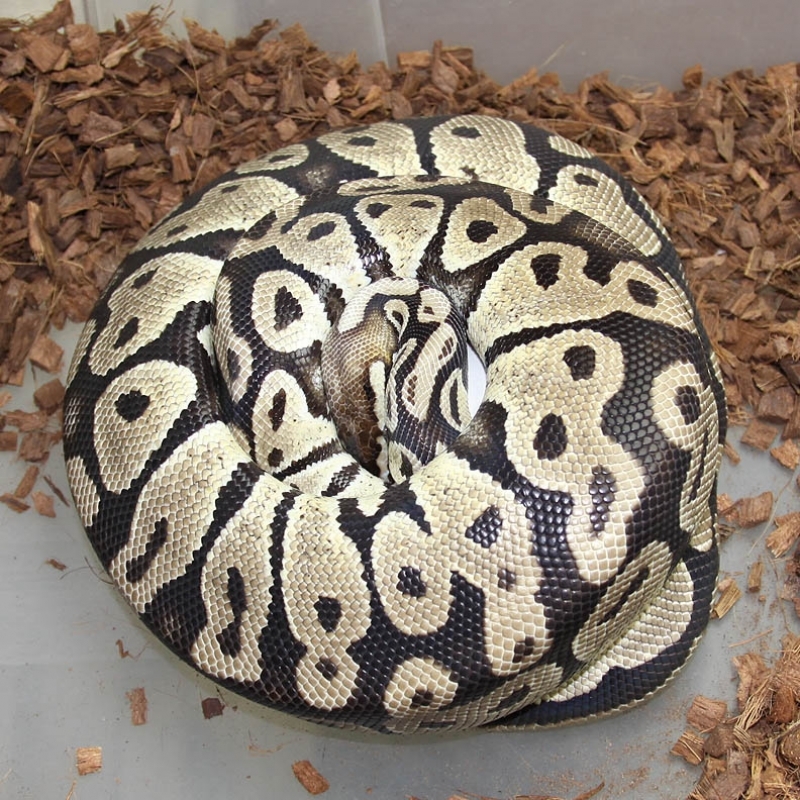 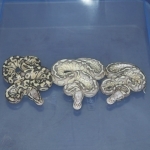 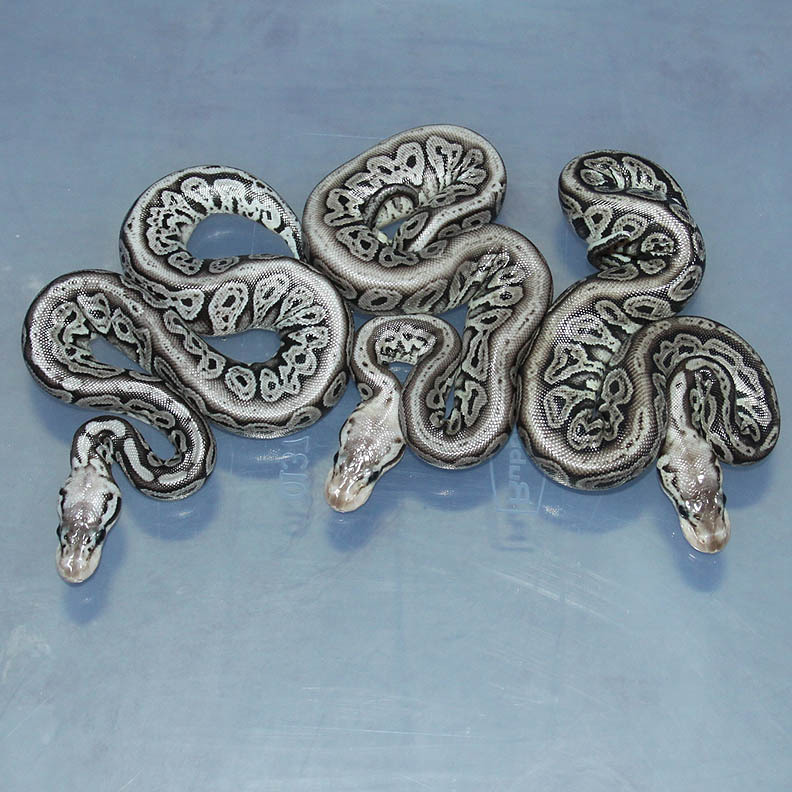 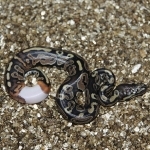 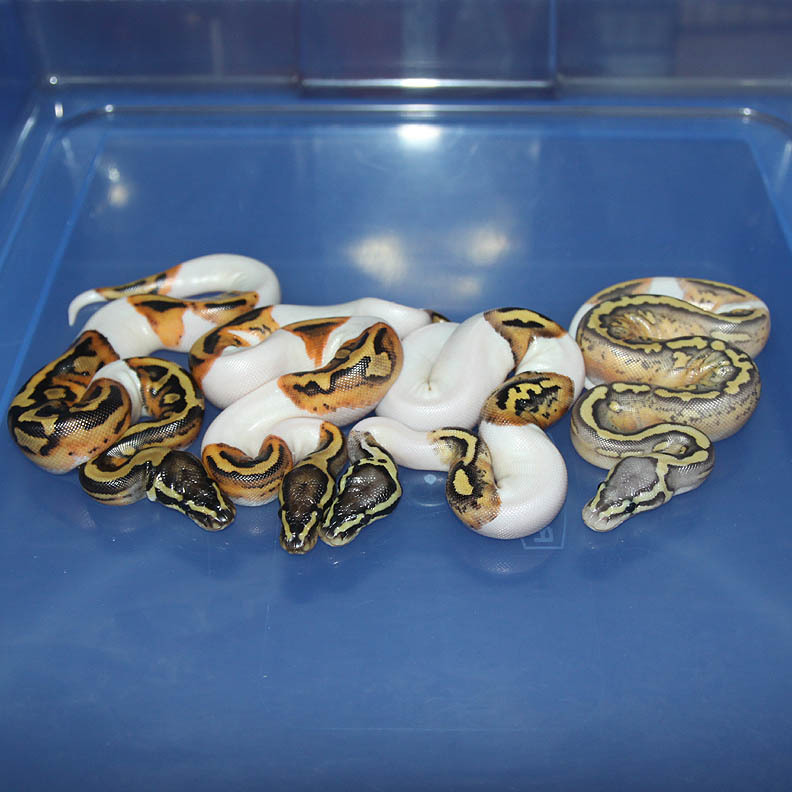 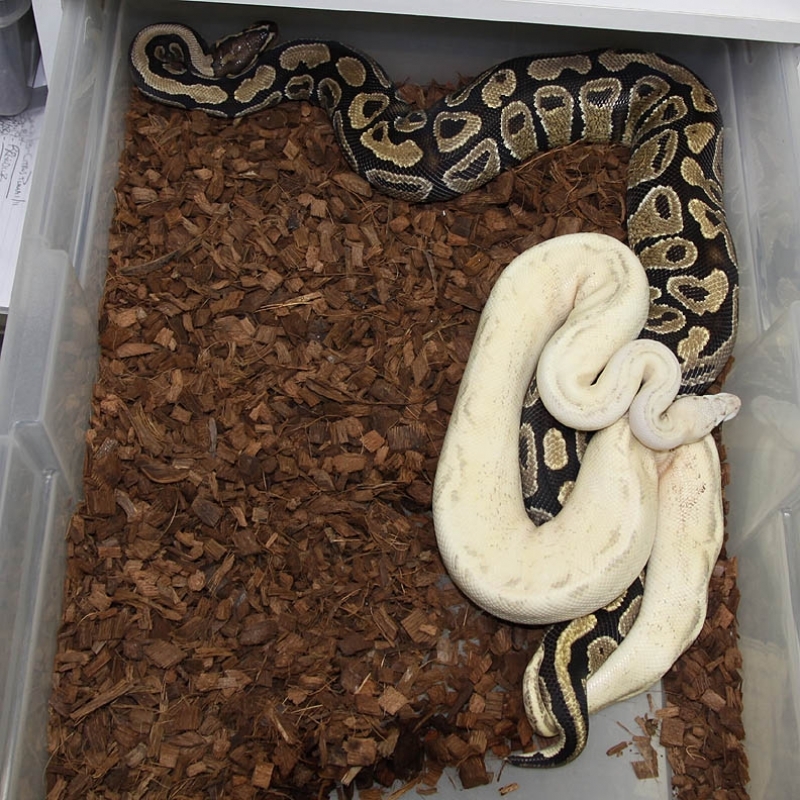 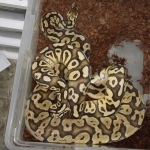 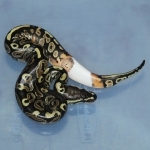 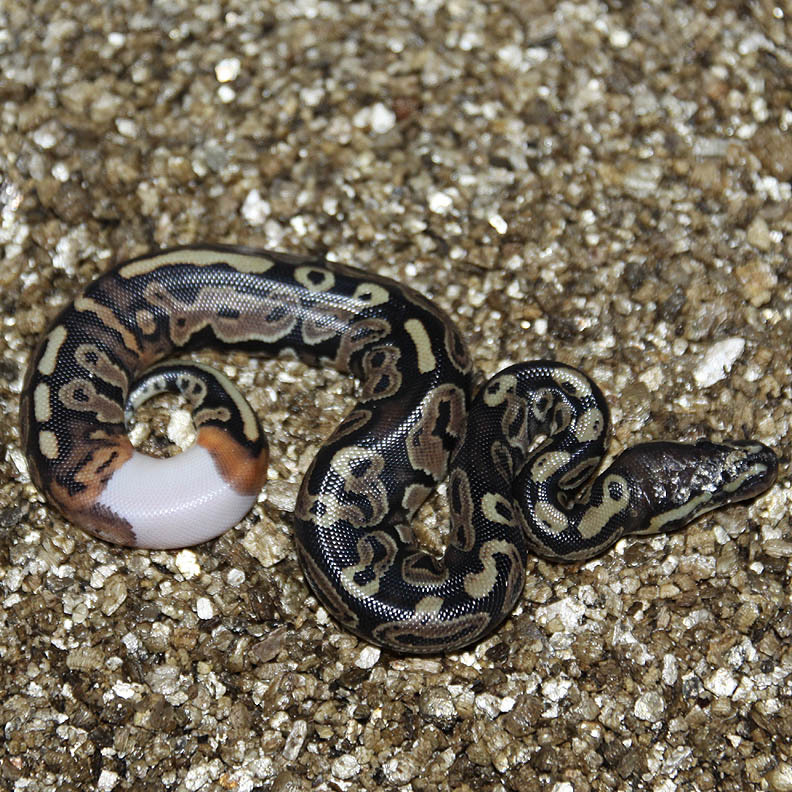 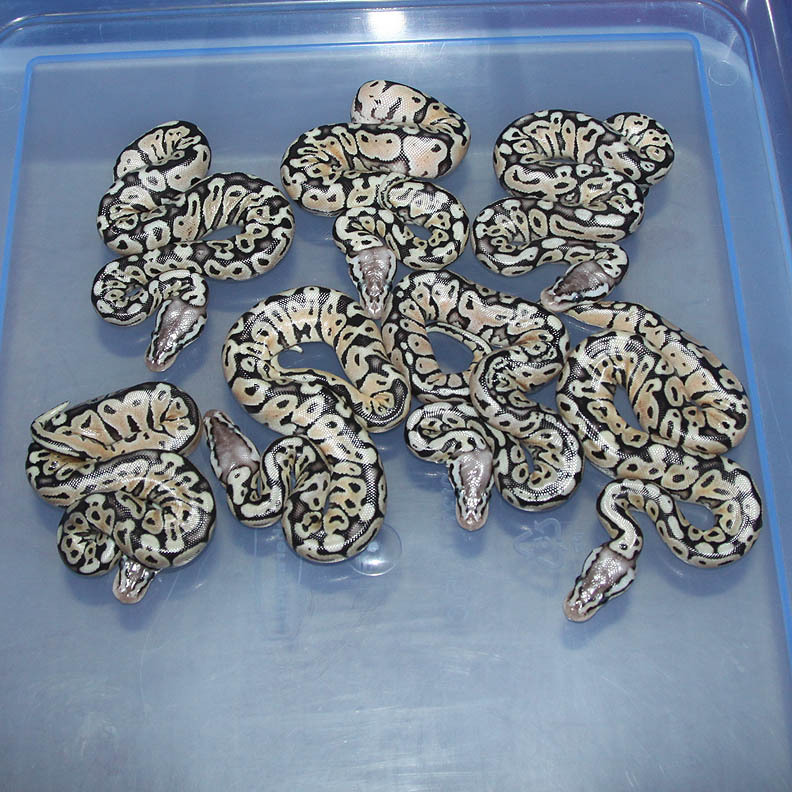 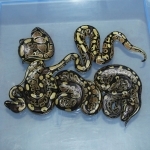 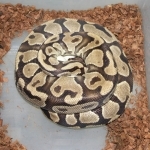 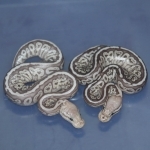 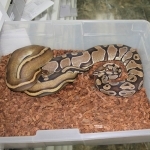 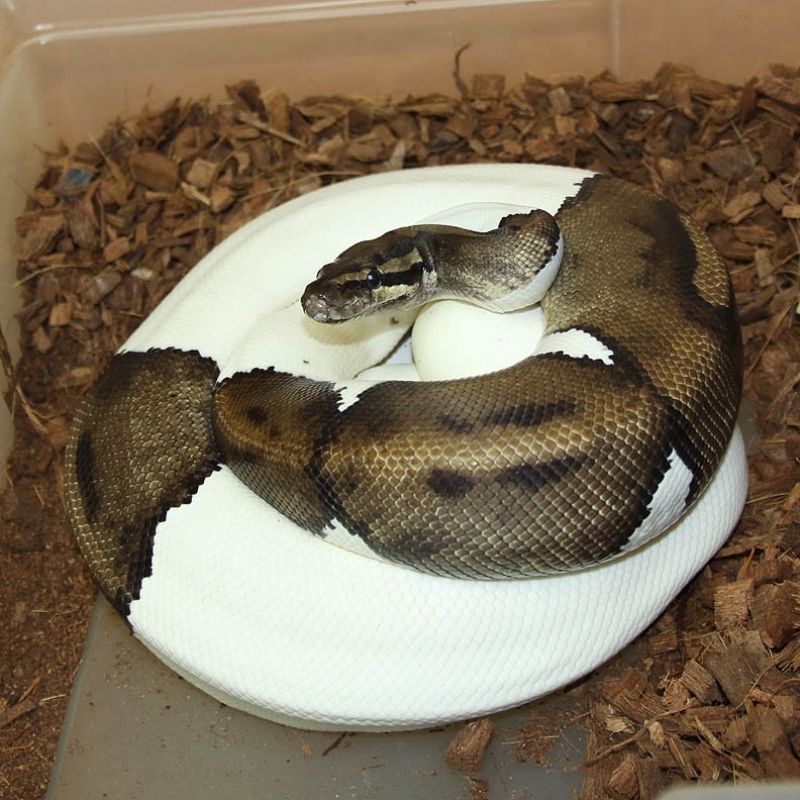 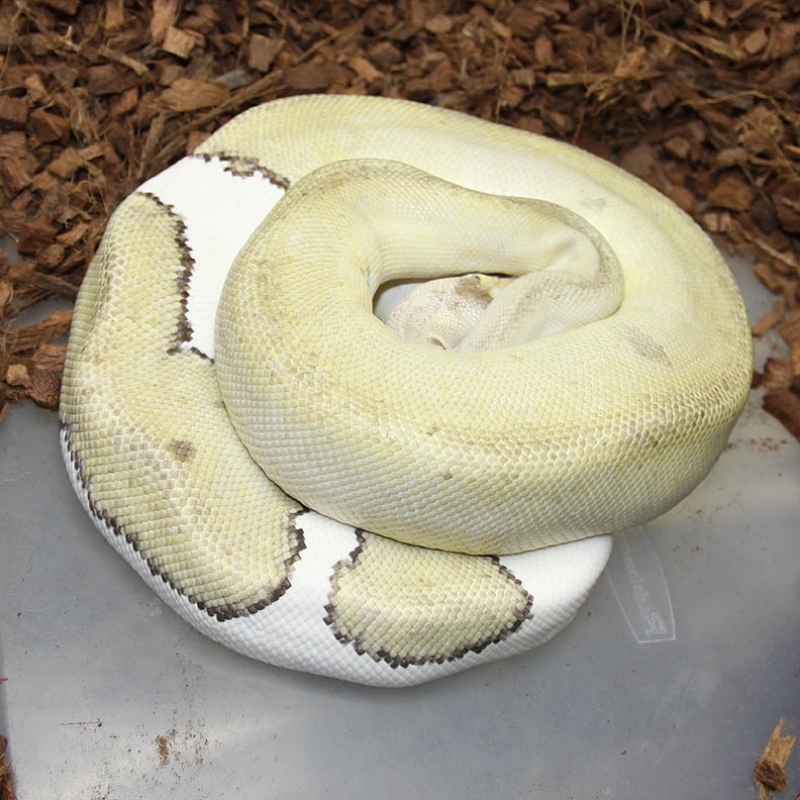 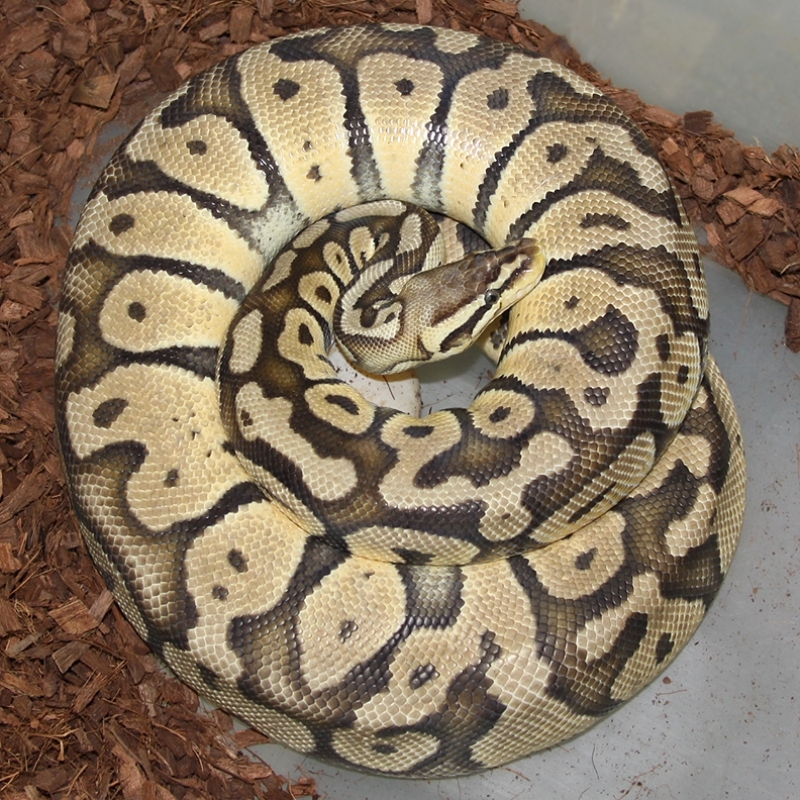 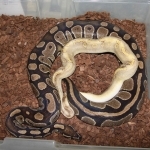 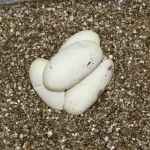 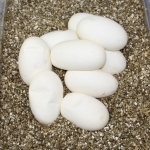 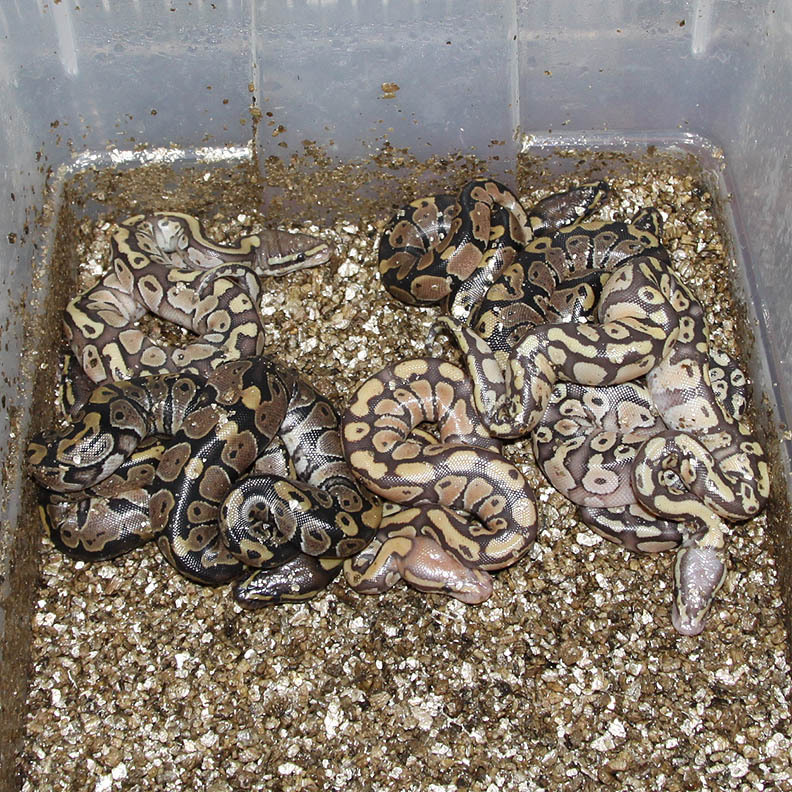 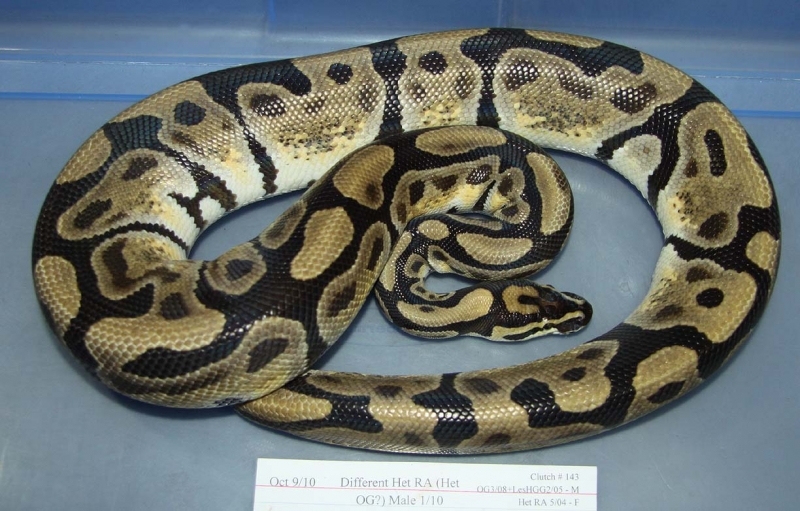 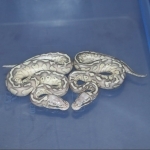 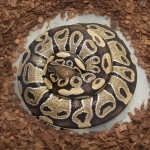 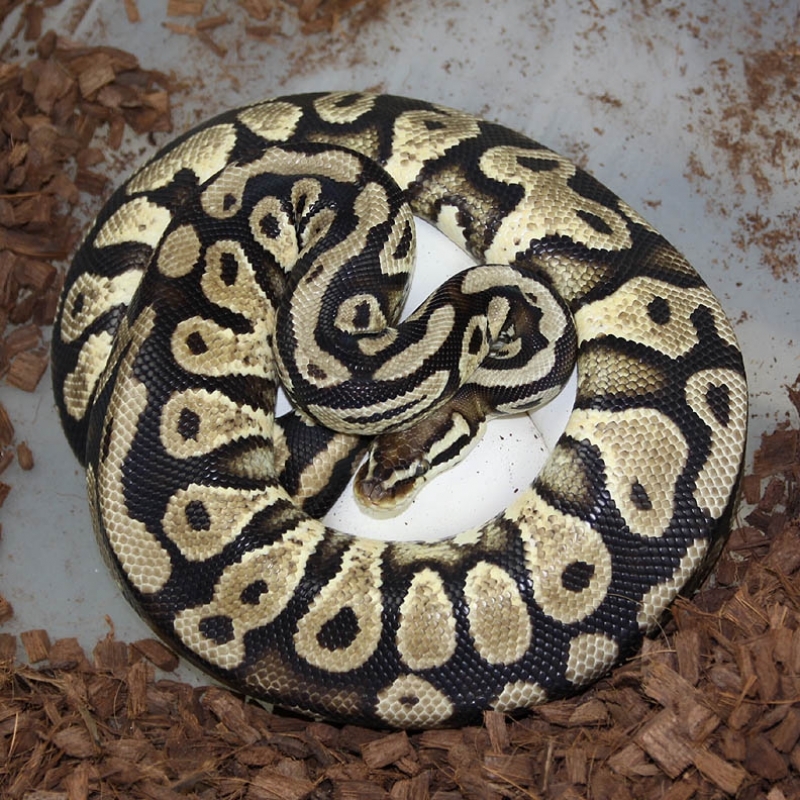 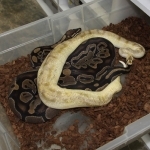 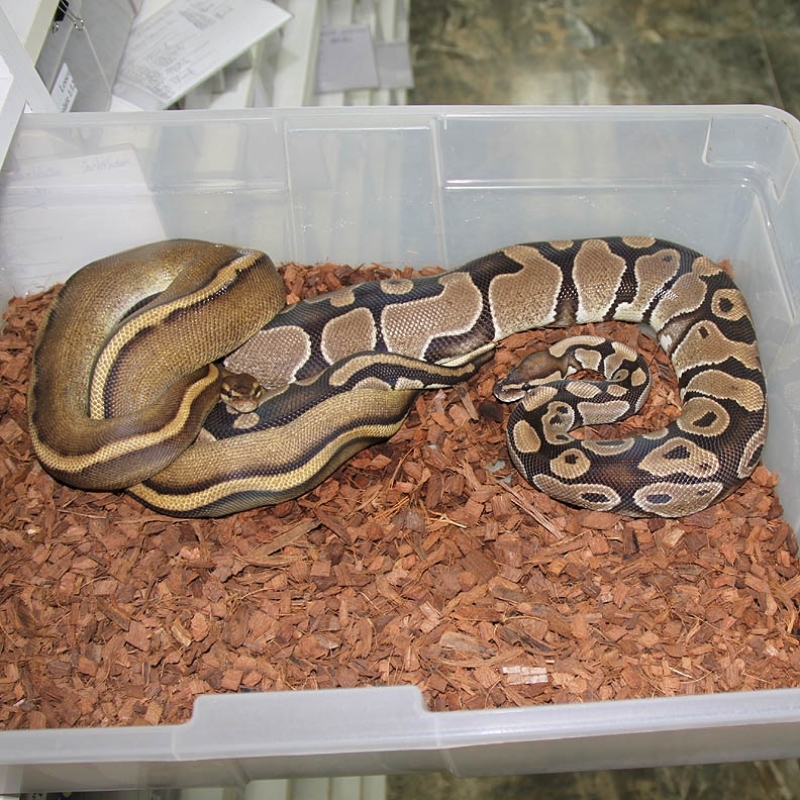 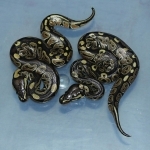 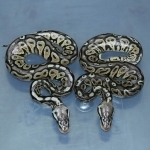 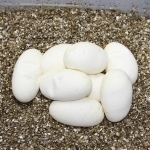 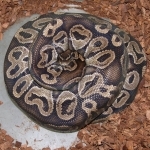 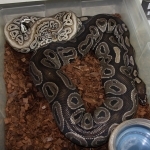 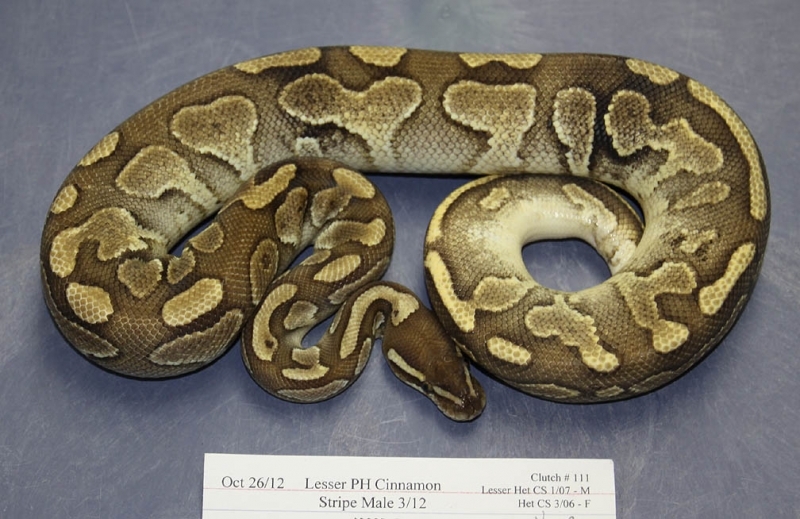 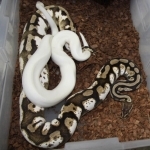 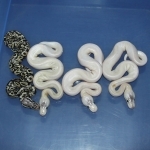 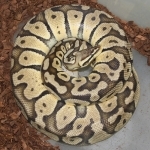 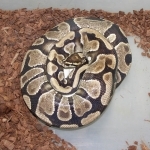 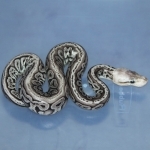 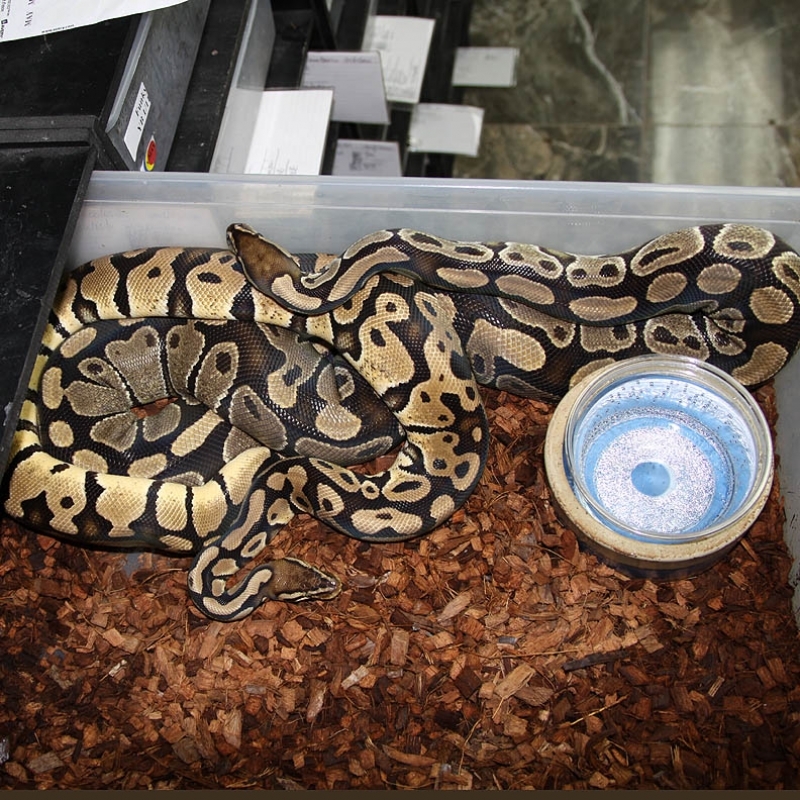 Description: Leopard Pied 1/11 x Red Axanthic 1/07. Description: Pastel DH GG/GS 1/11 x Pastel Lesser DH GG/GS 1/10. 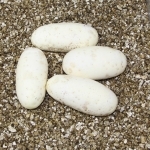 Description: Ivory HRA 1/12 x HRA 13/06. 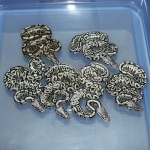 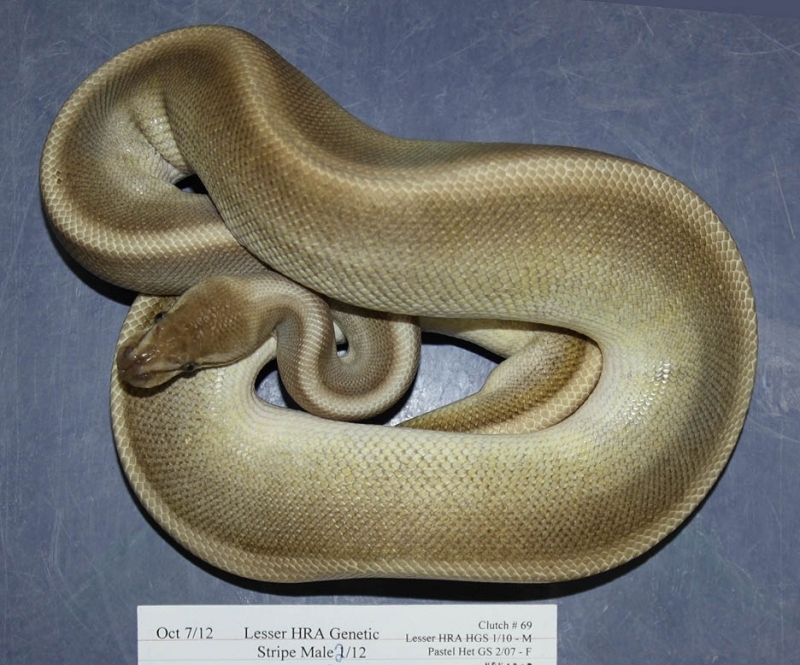 Description: POG RA 1/11 x Lesser Het RA/OG 1/11. 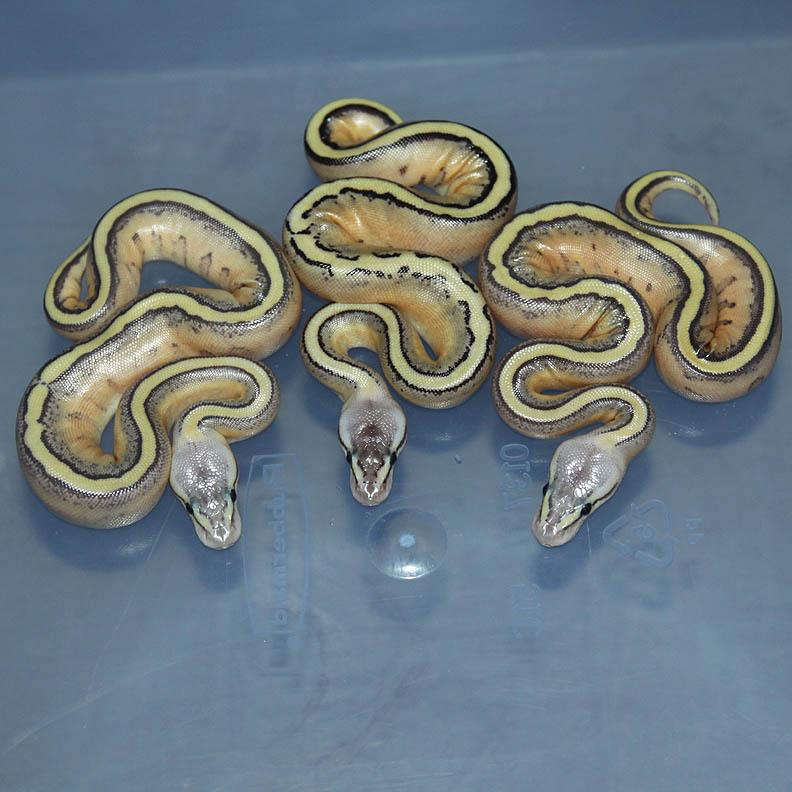 Description: Black Stripe Genetic Stripe Het Lavender 1/12 x Het Lavender 50% Possible Het Genetic Stripe 1/11. 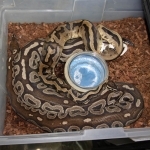 In the 2010/2011 breeding season my Lavender from EBN (BHB Bloodline) was a picky breeder. 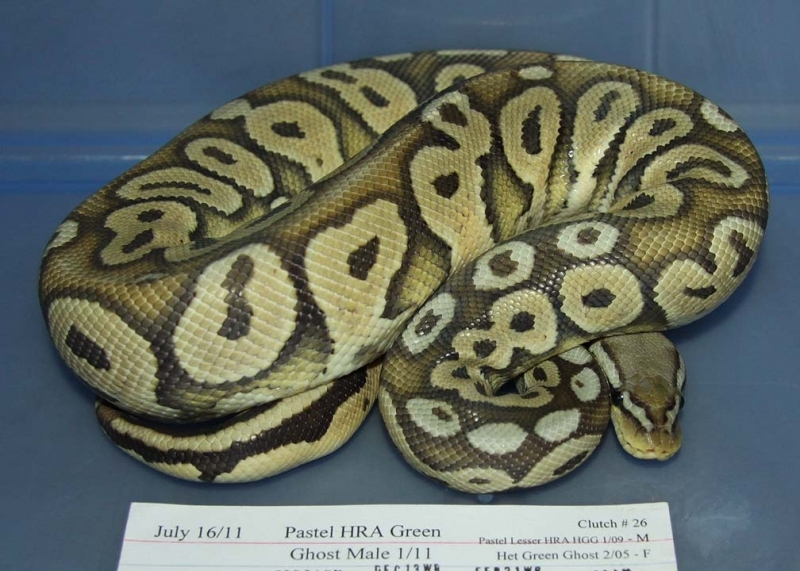 He would only breed 100% het Genetic Stripe females for whatever strange reason (the next season he was a great breeder). 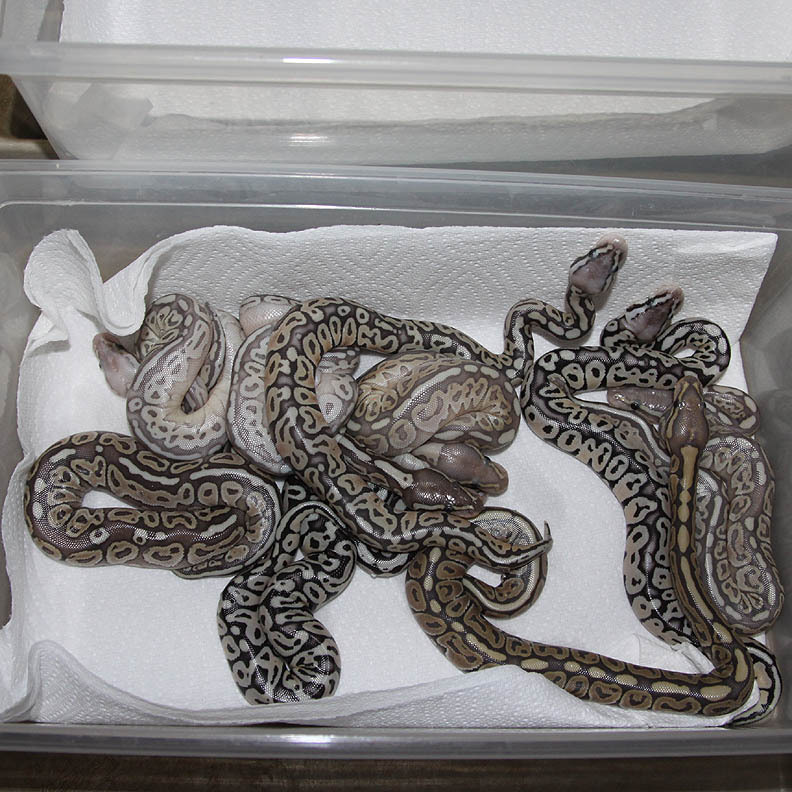 I just wanted to produce Het Lavenders so I didn't mind giving up a few Het GS females to produce het Lavenders. 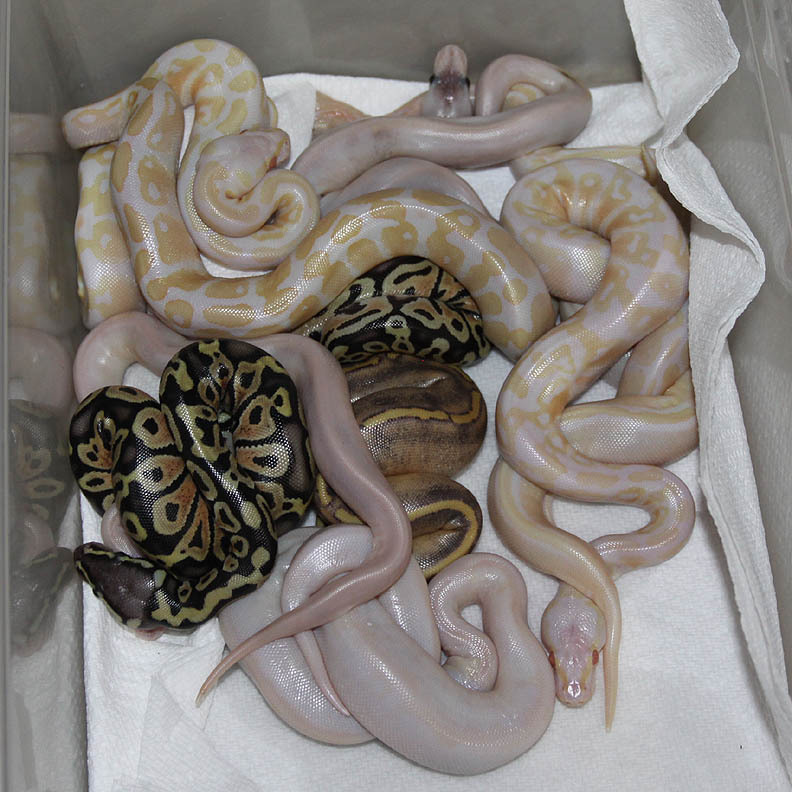 Well, I'm glad that I did! 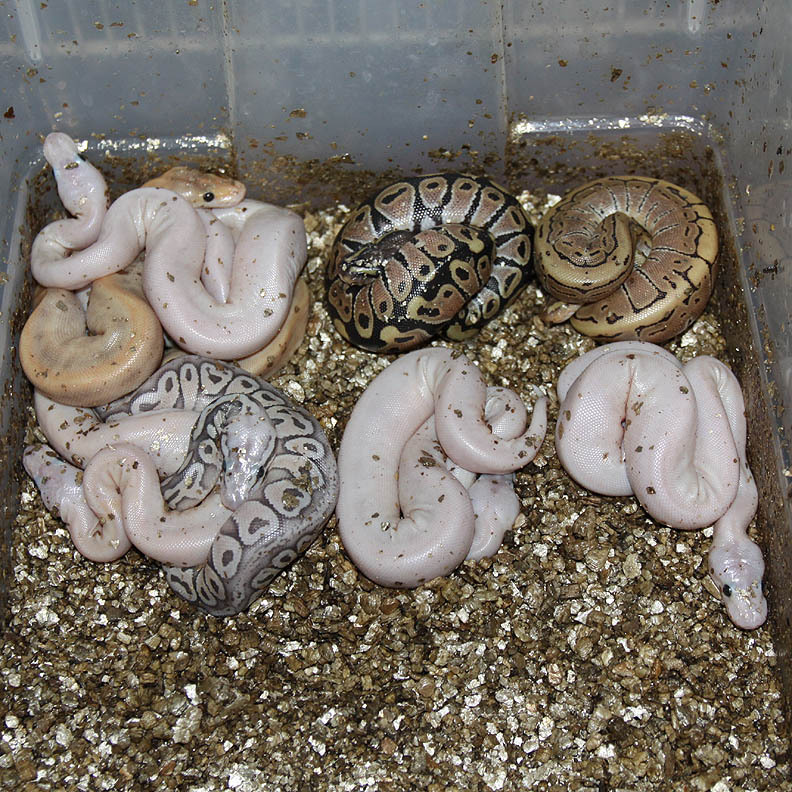 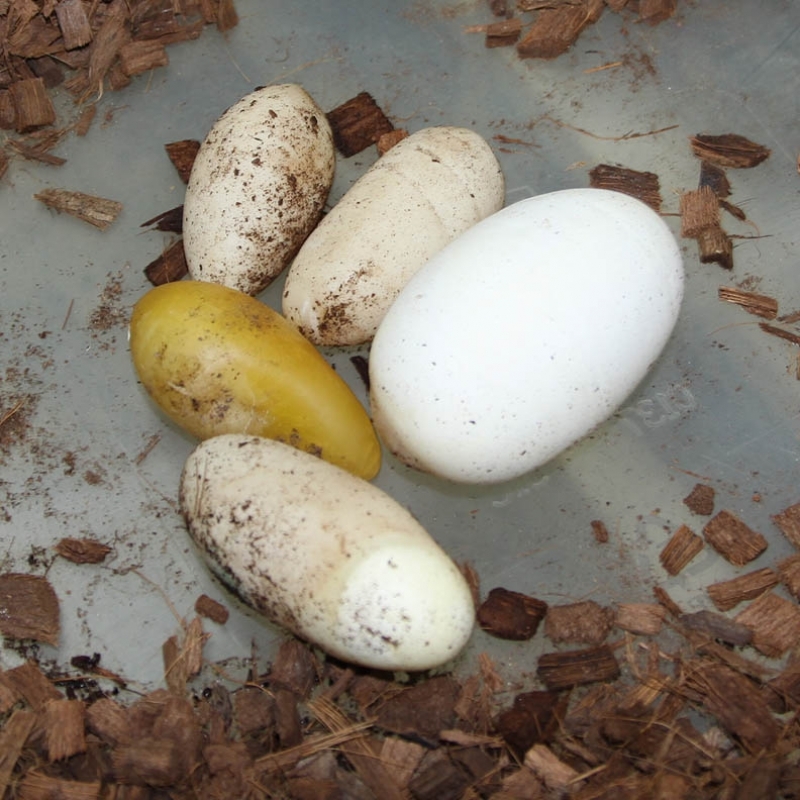 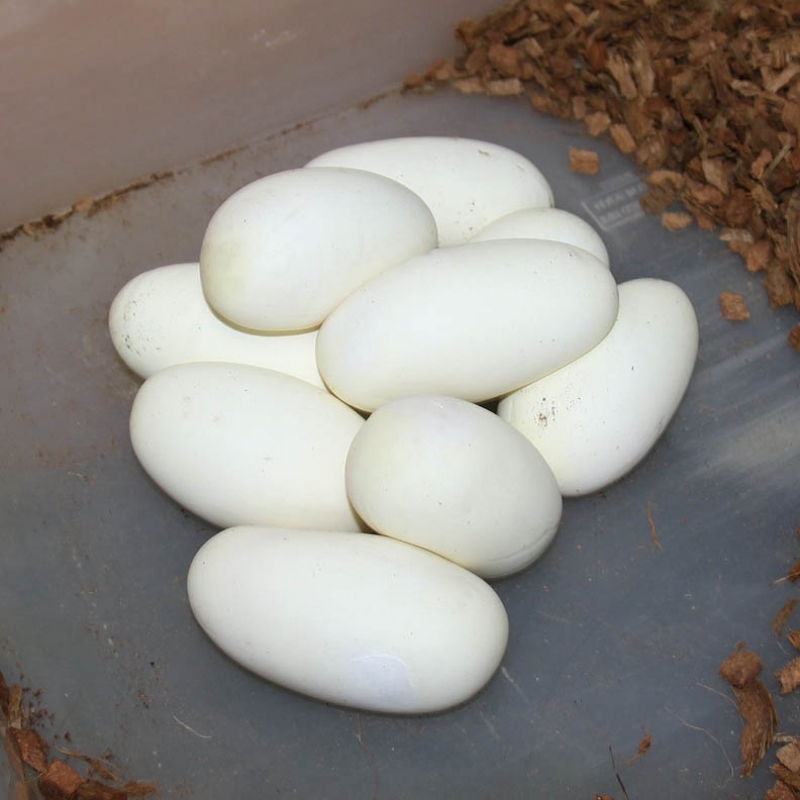 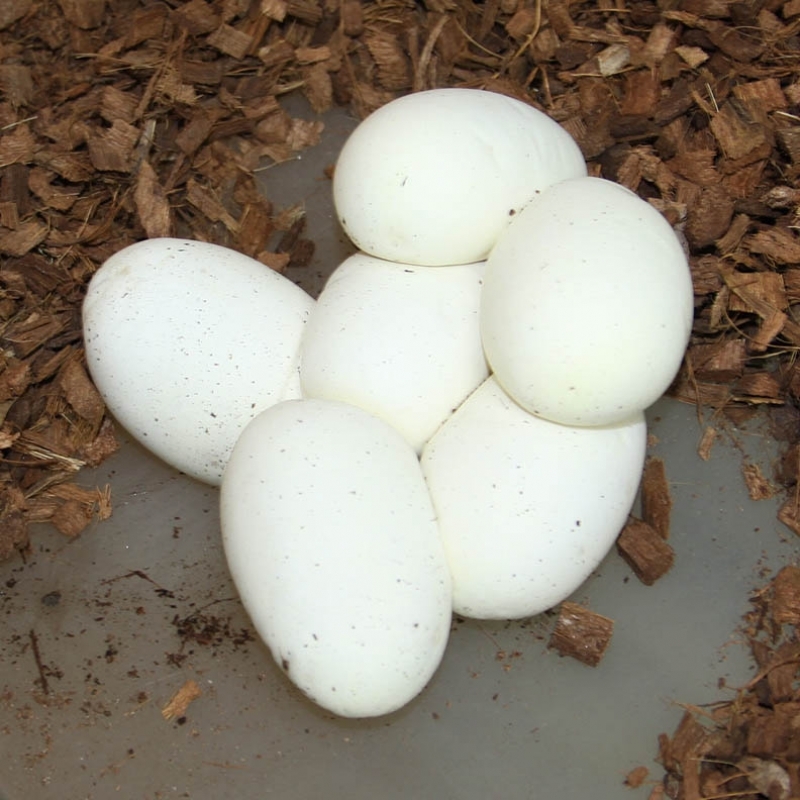 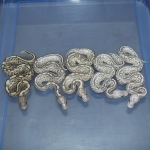 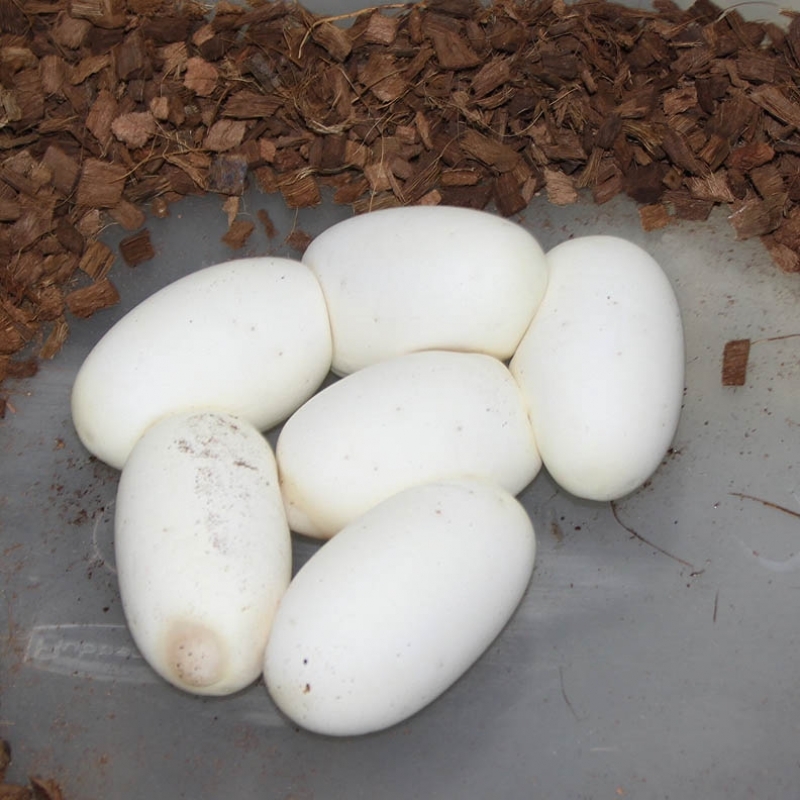 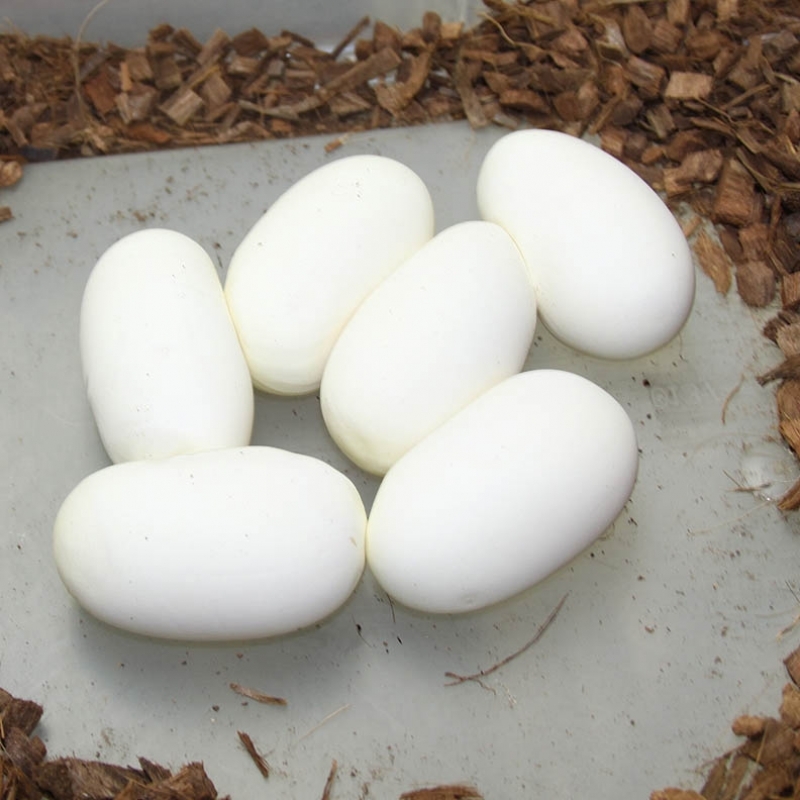 That year I produced 5 Het Lavenders 50% possible Het GS females out of 3 clutches. 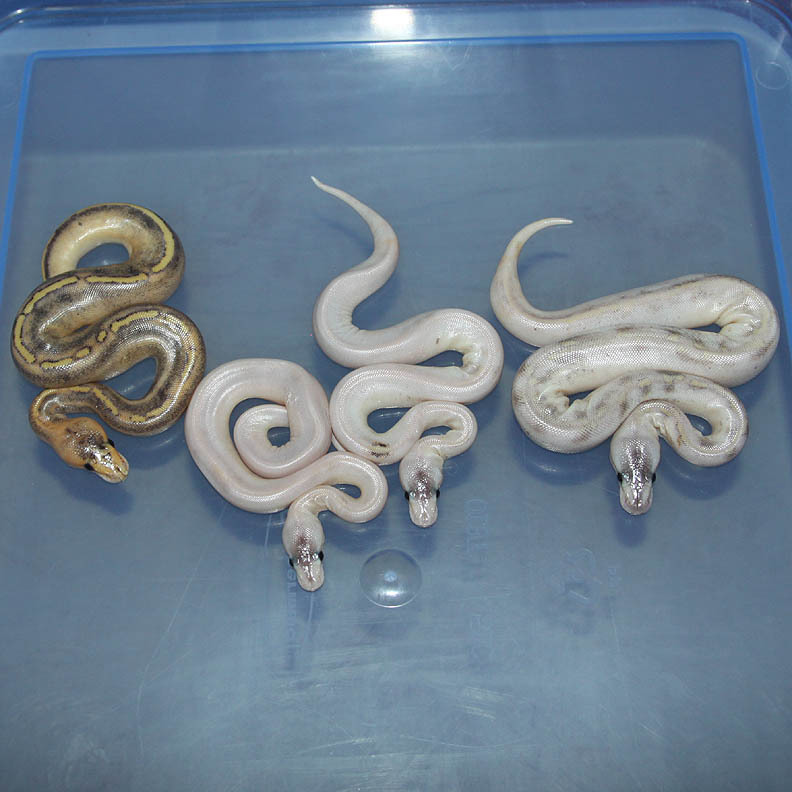 All 5 are gravid this year!! 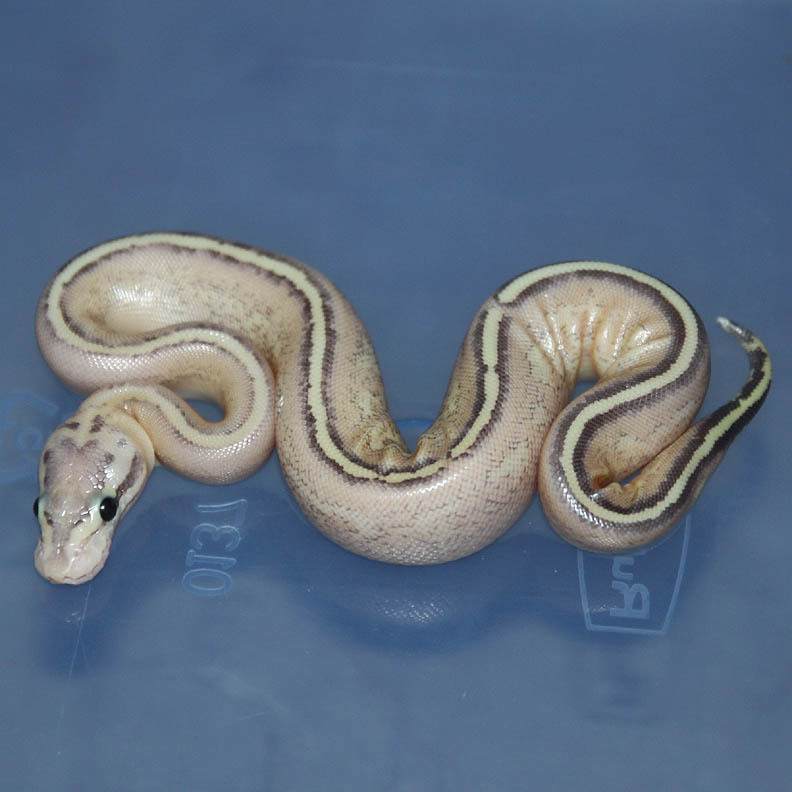 My Lavender Genetic Stripe project originated from a Pastel Lavender Het Genetic Stripe from Ralph Davis. 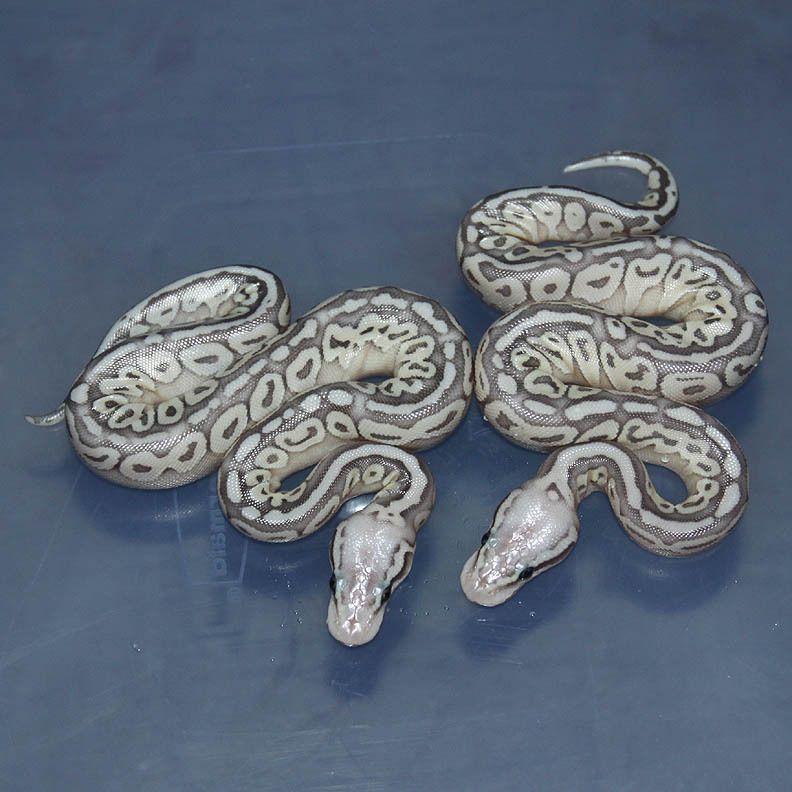 These girls are great as they are BHB line Lavenders so if they prove out as double hets I can produce outcrossed Lavender Genetic Stripes! Description: Lesser Genetic Stripe HRA 1/12 x Genetic Stripe 5/10. 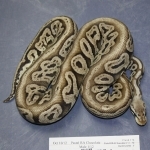 Description: Pastel Pin Champ HRA/OG 1/12 x POG 3/06. 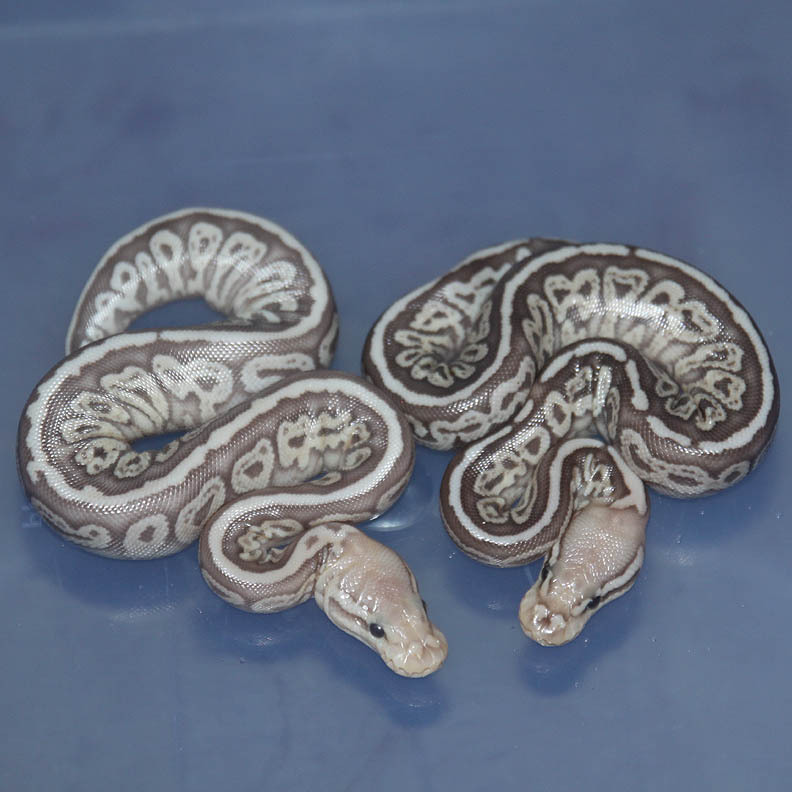 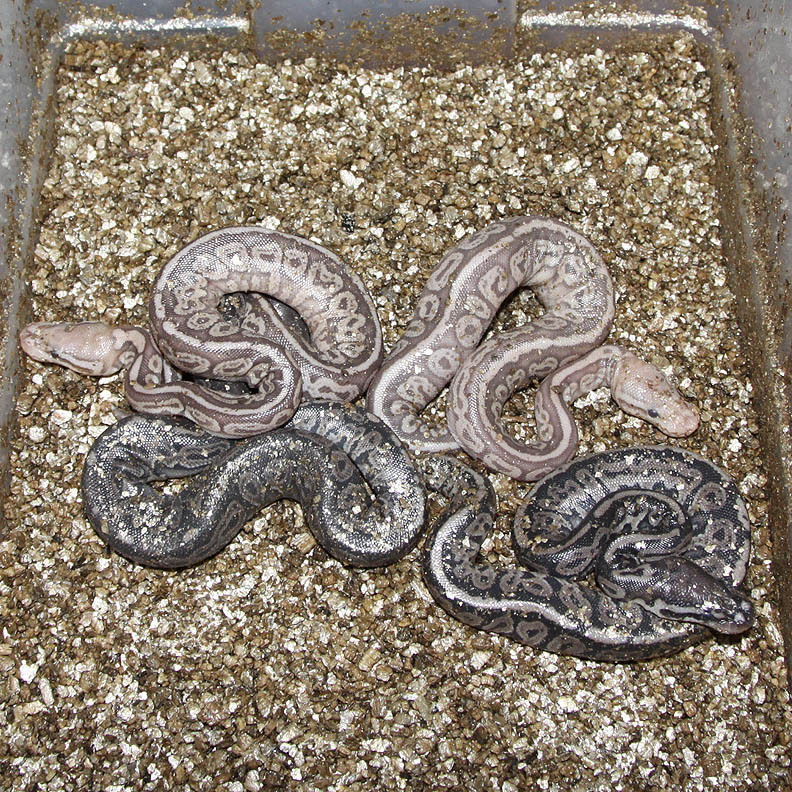 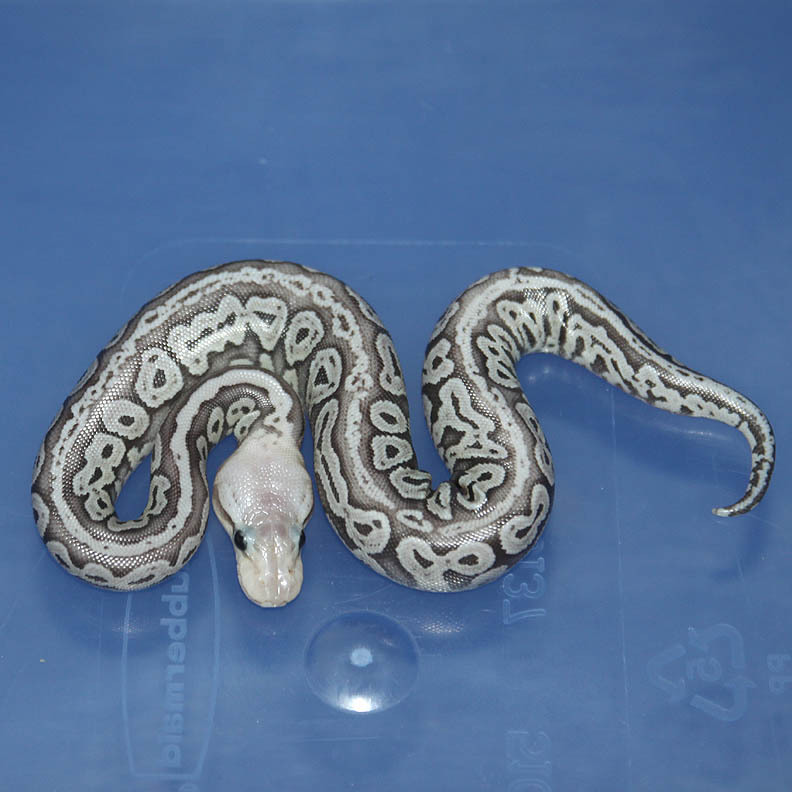 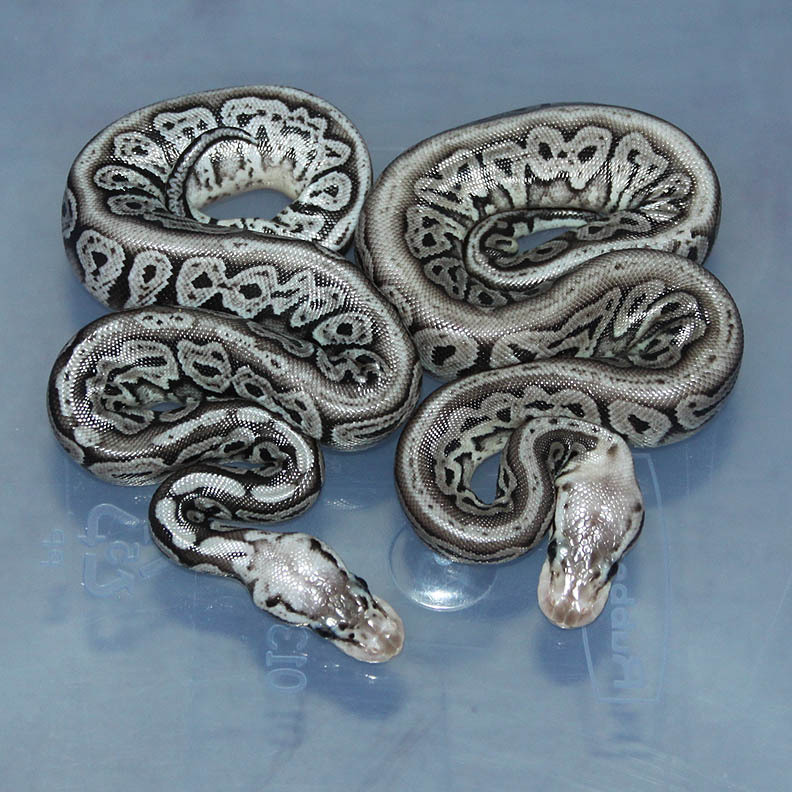 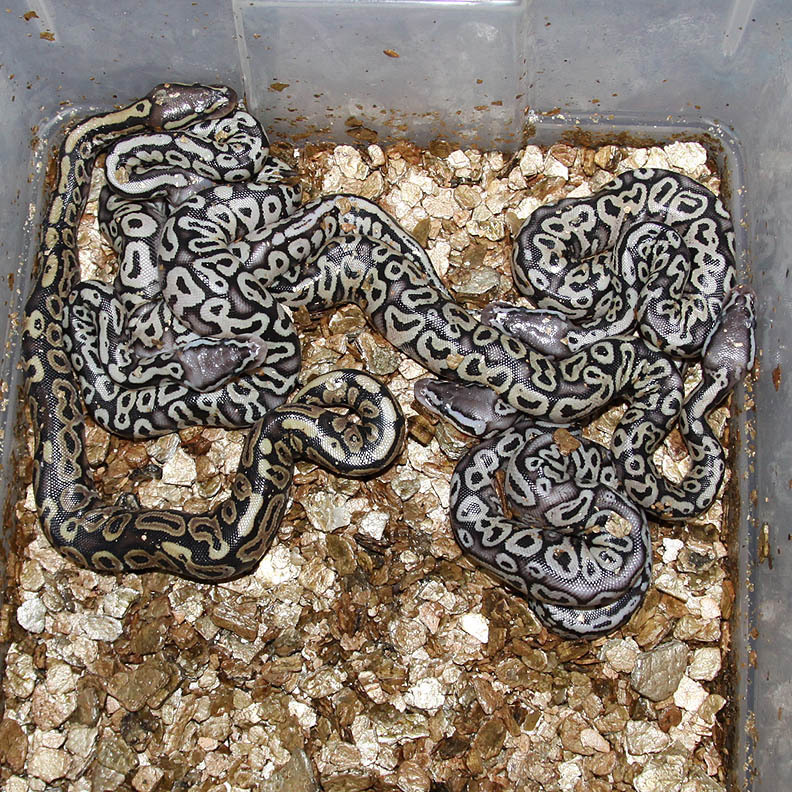 Description: Black Stripe Genetic Stripe Het Lavender 1/12 x Het Lavender 6/10 JW. 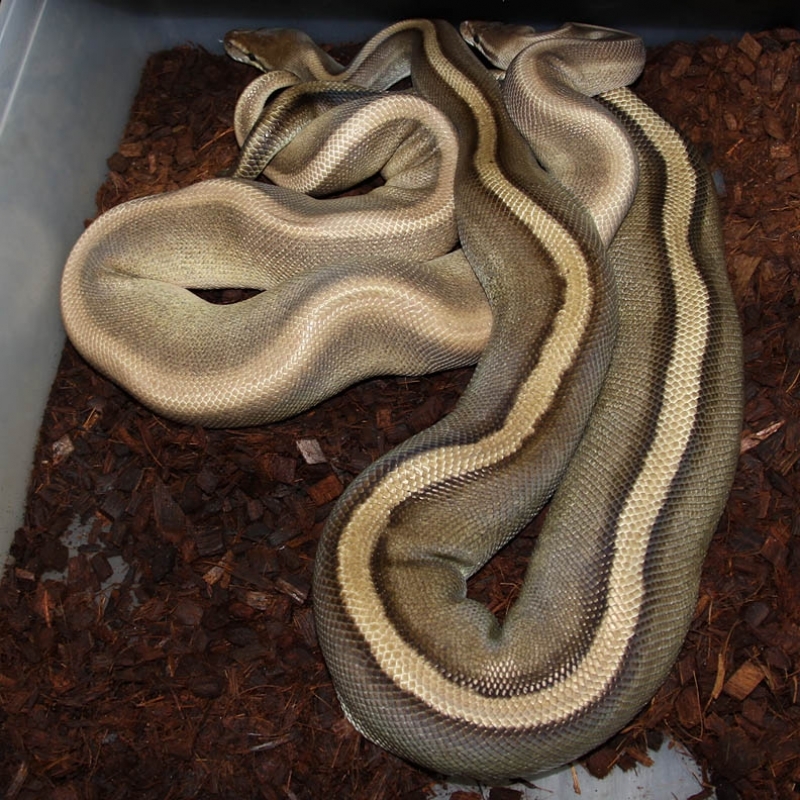 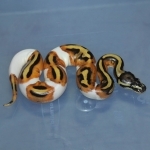 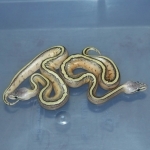 Description: Lesser Genetic Stripe HRA 2/12 x Het RA/GS 1/09. 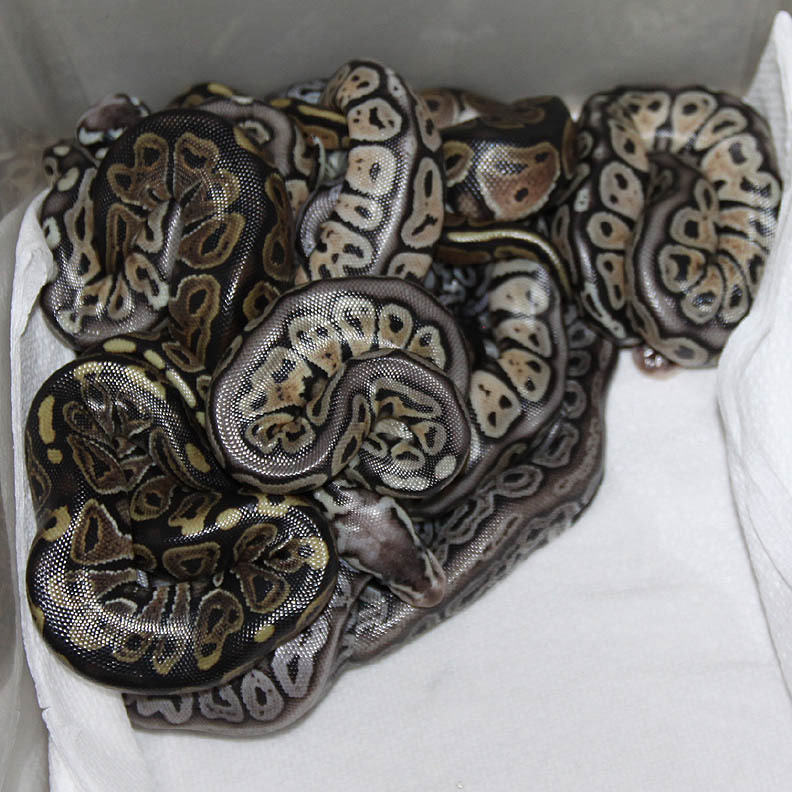 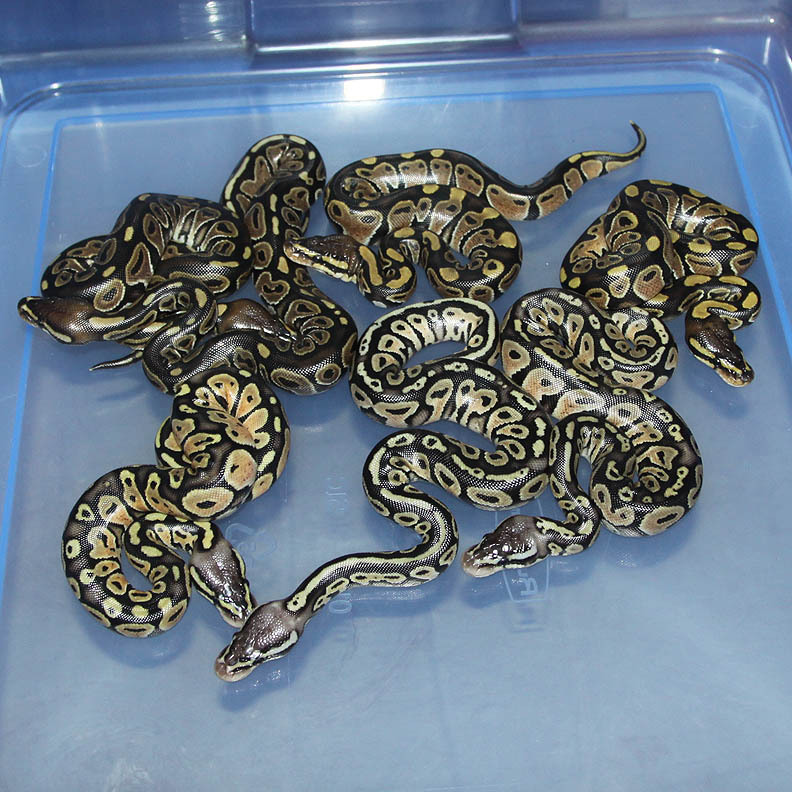 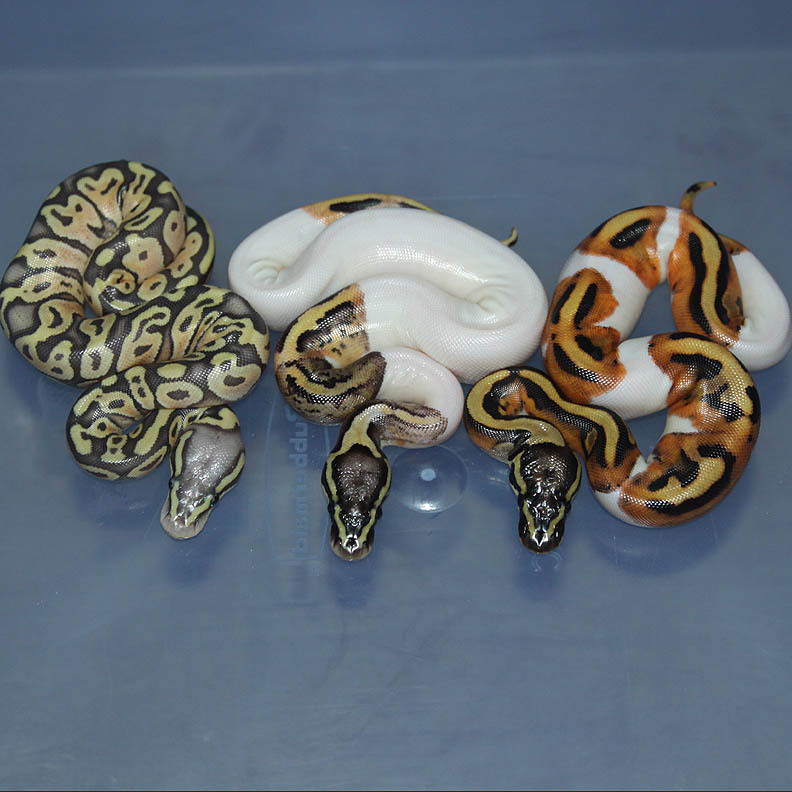 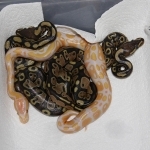 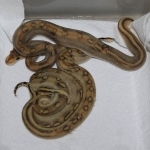 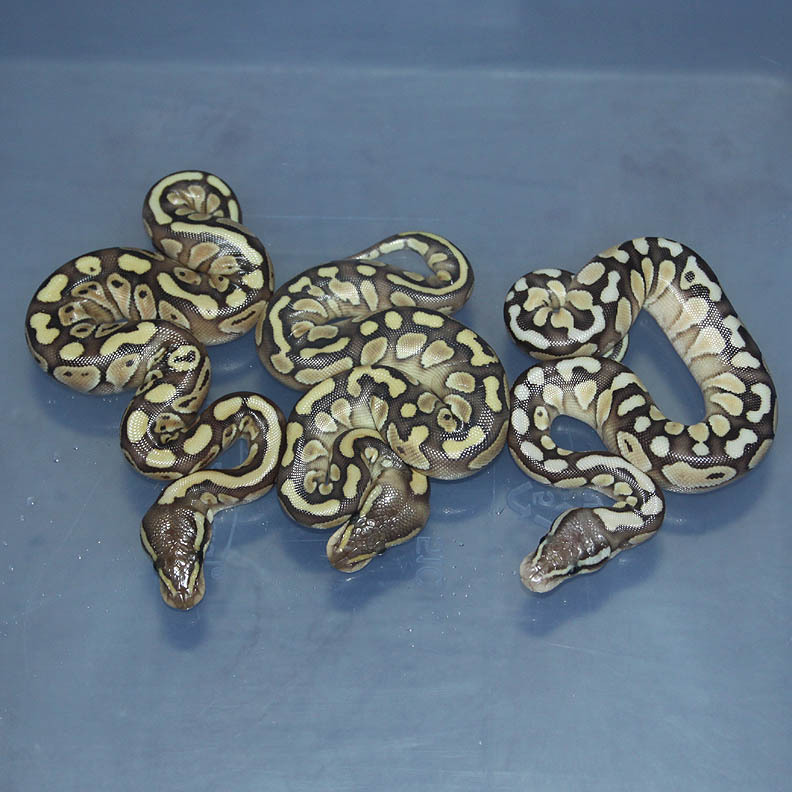 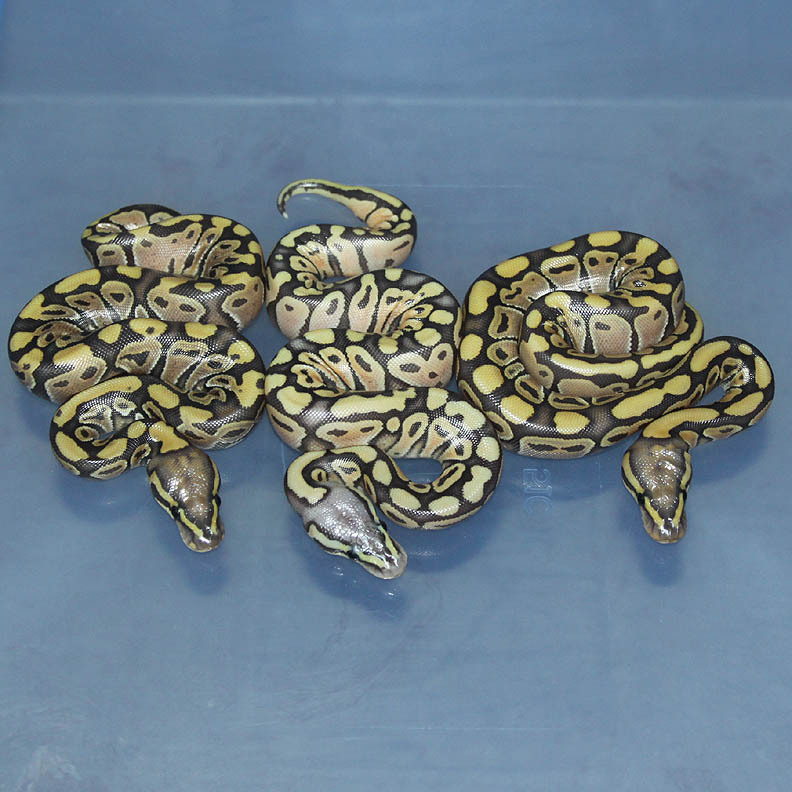 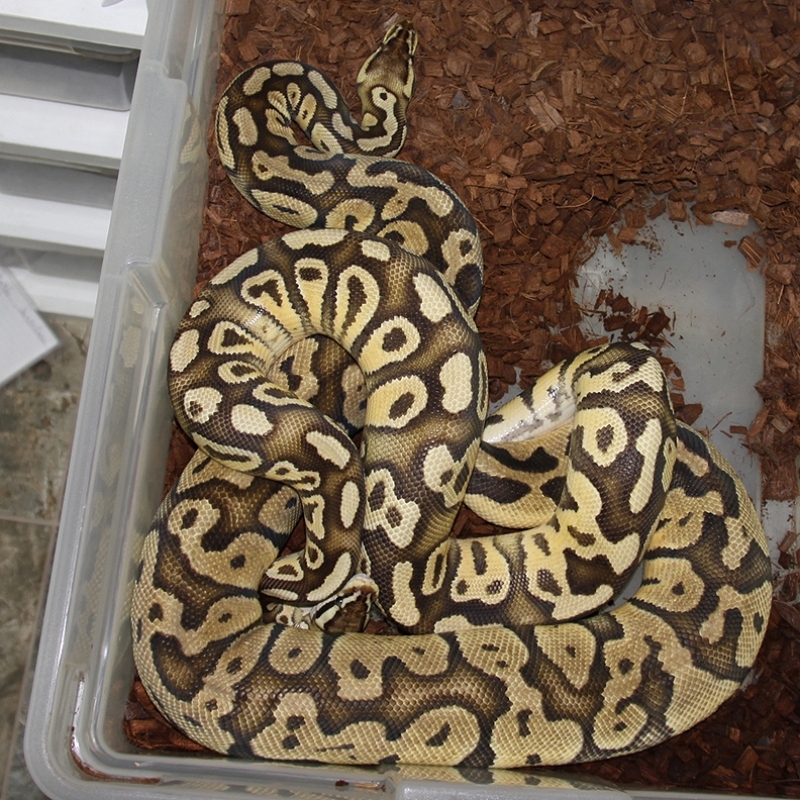 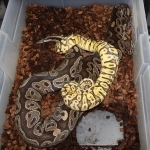 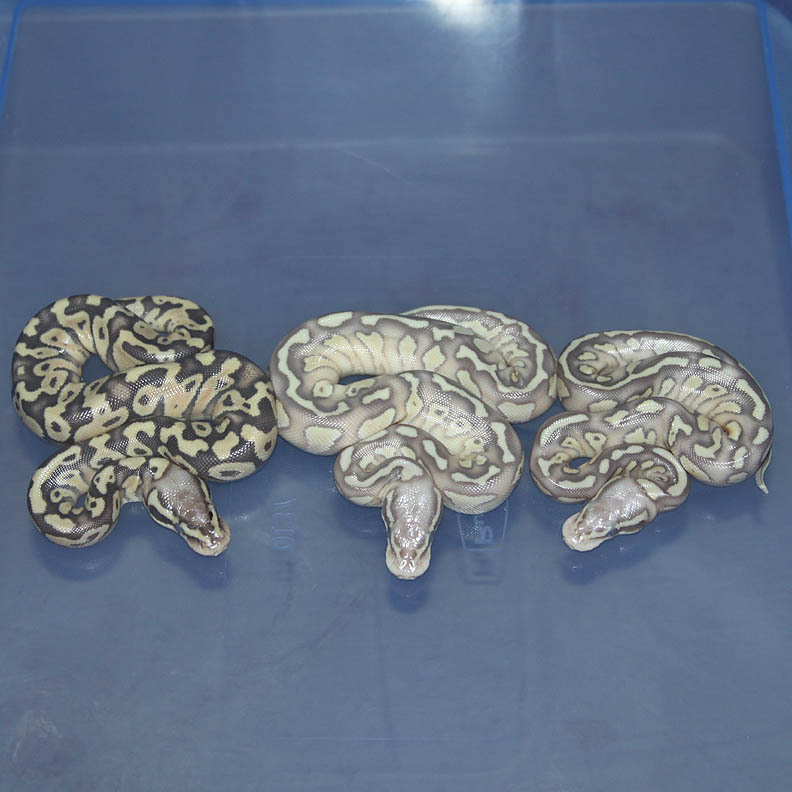 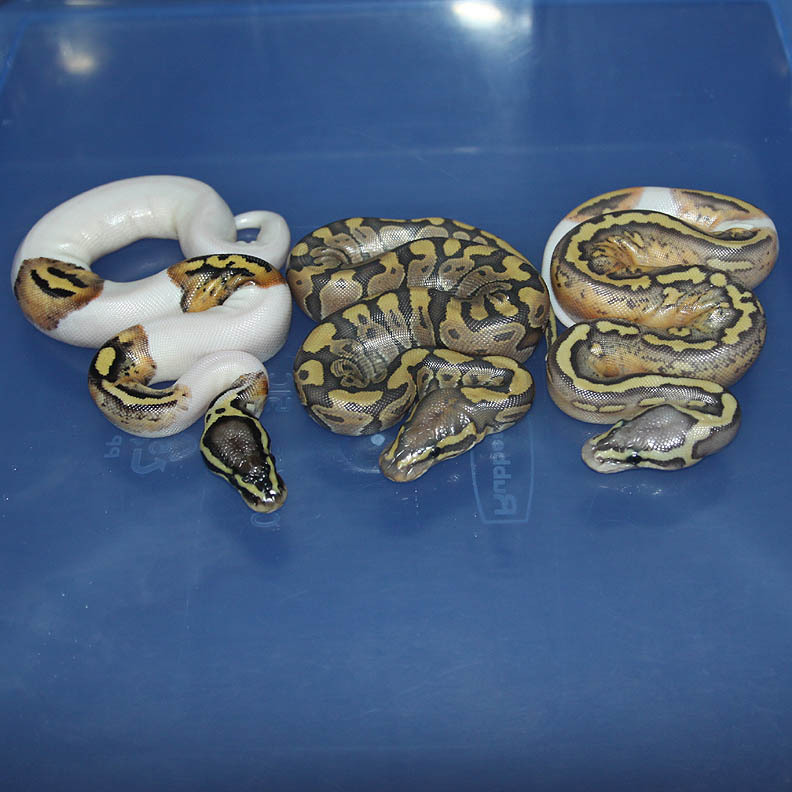 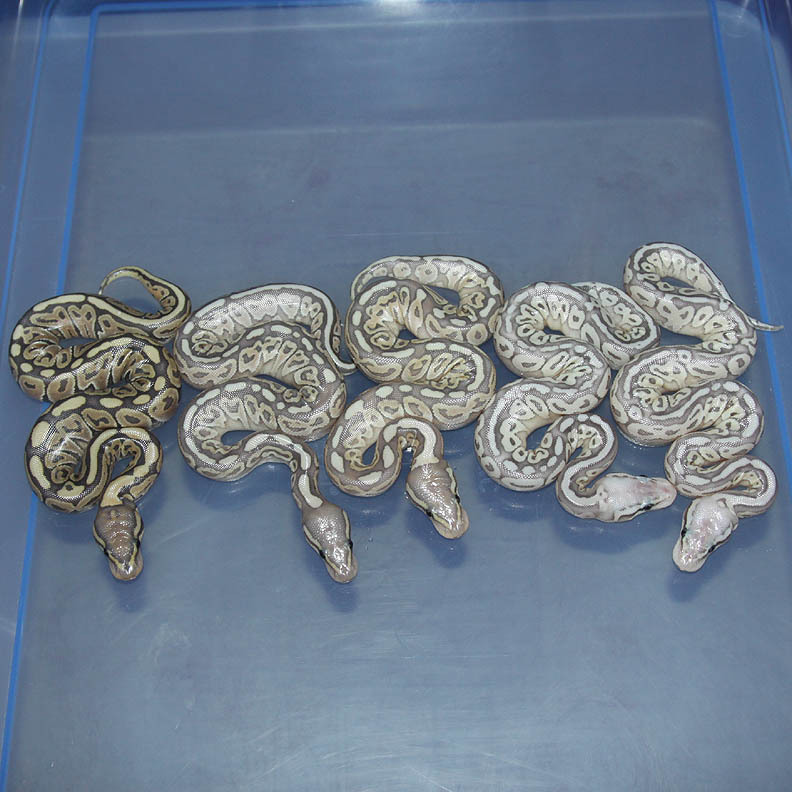 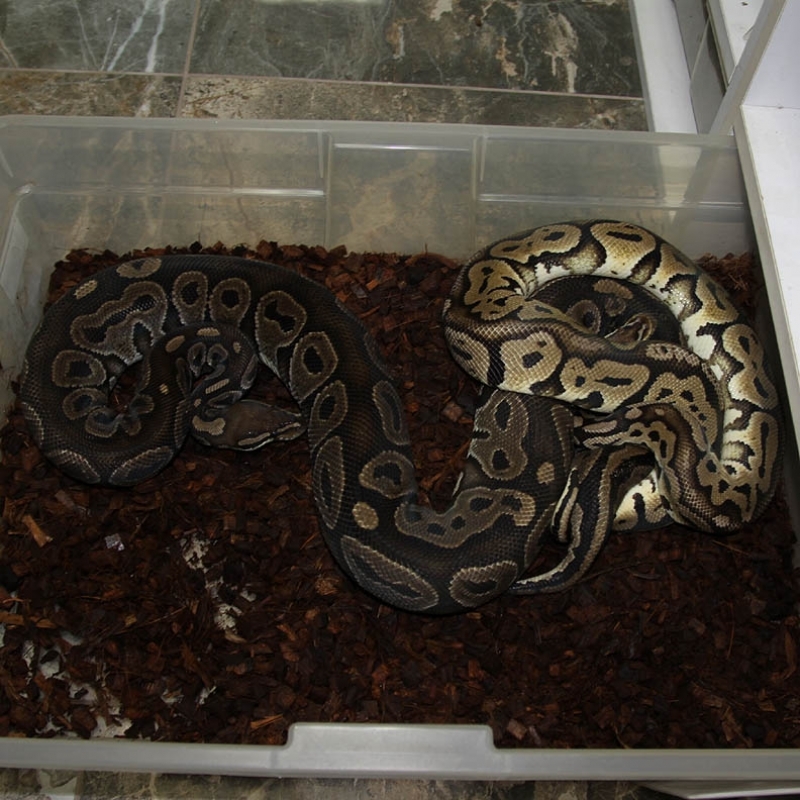 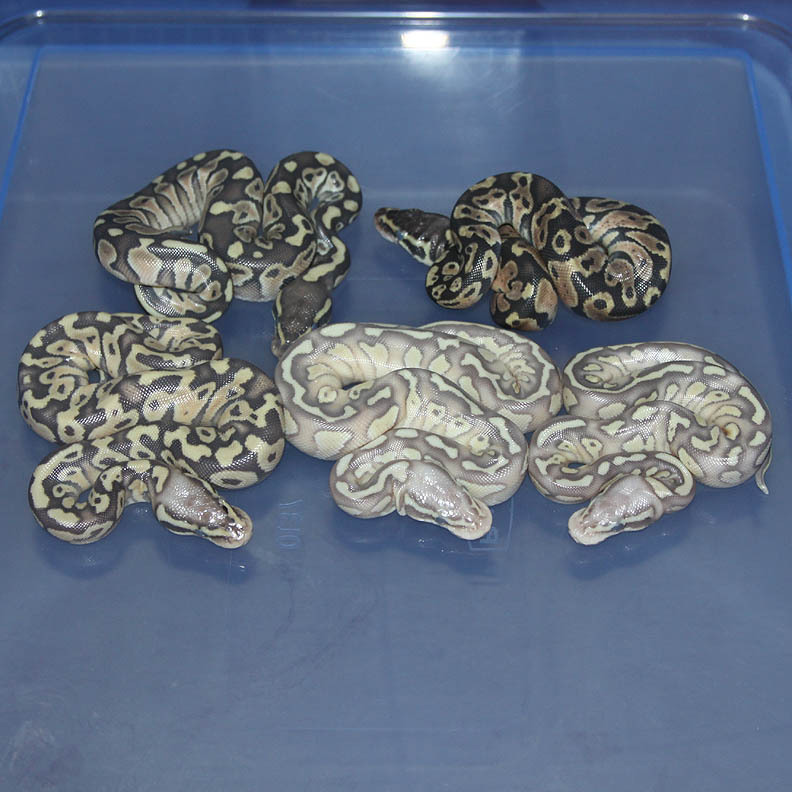 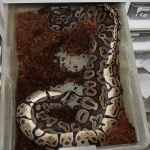 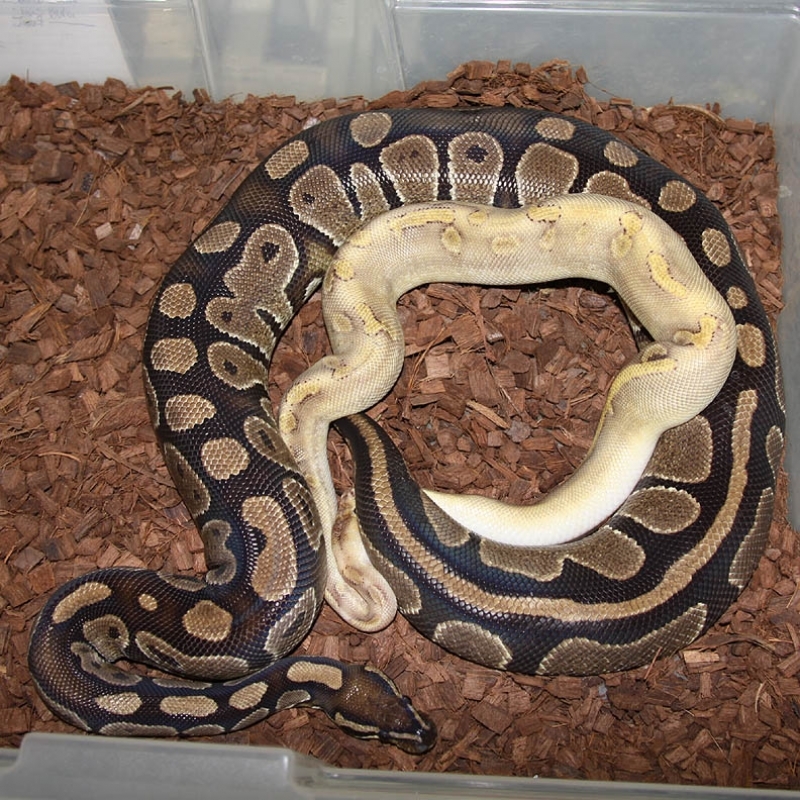 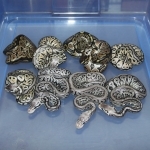 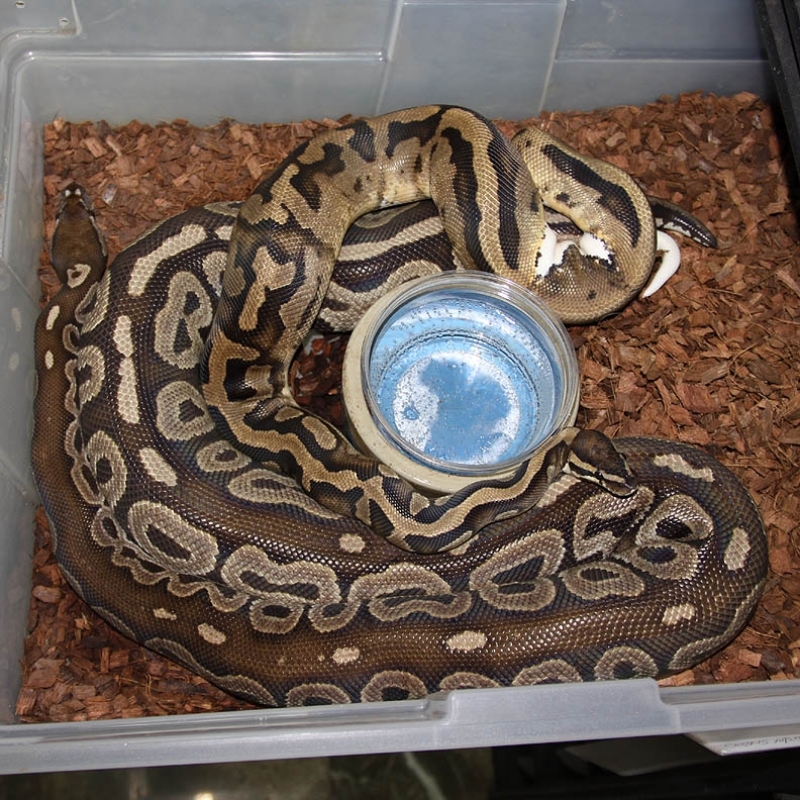 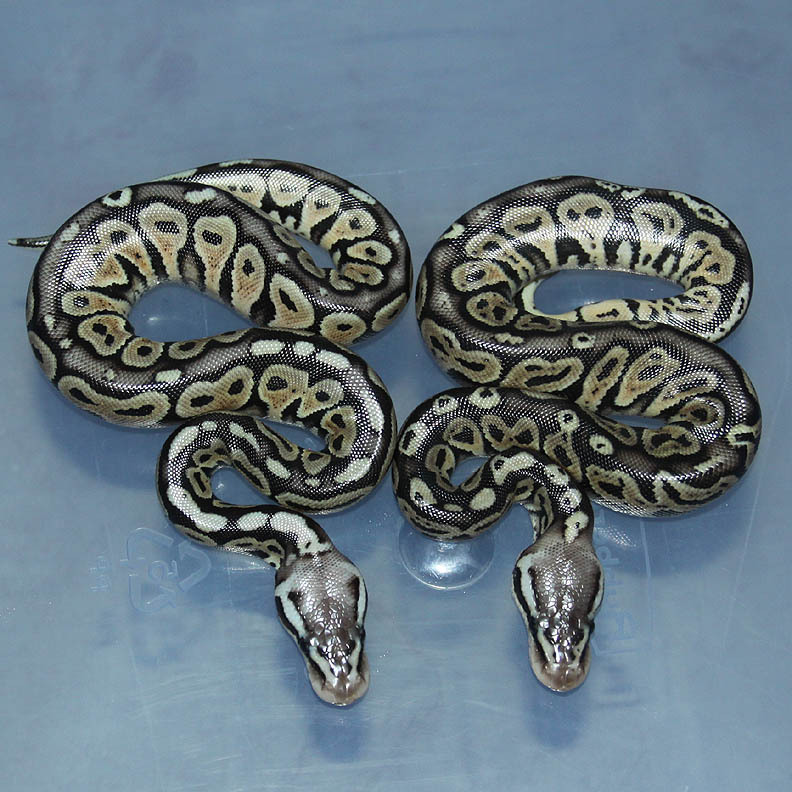 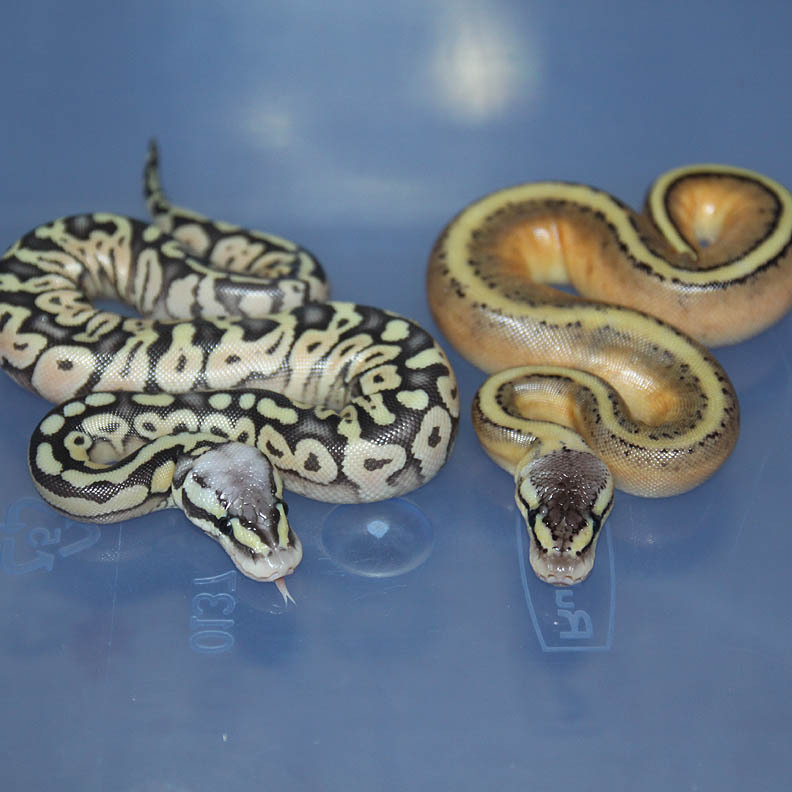 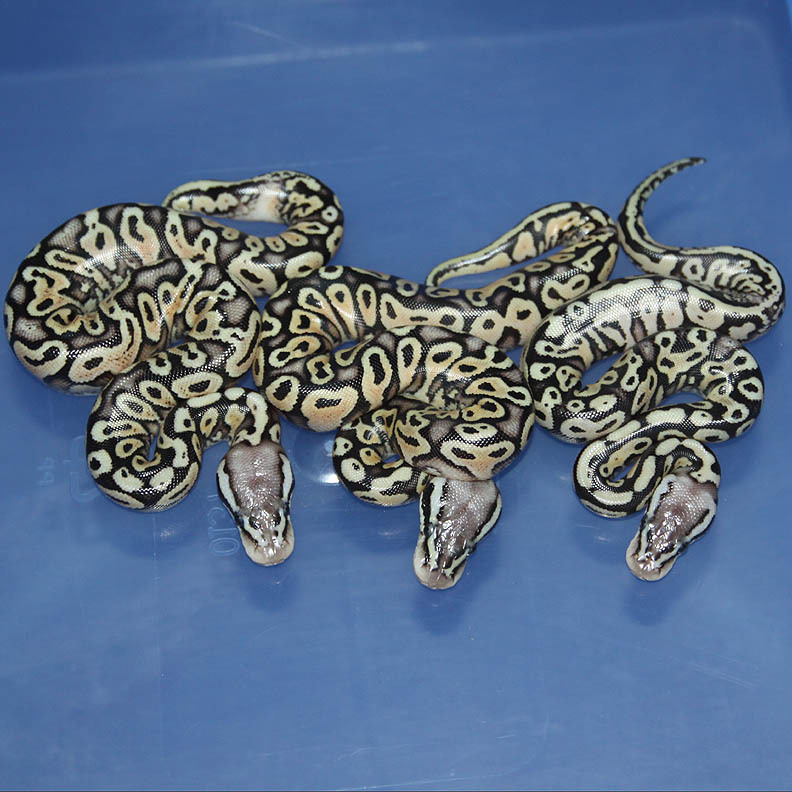 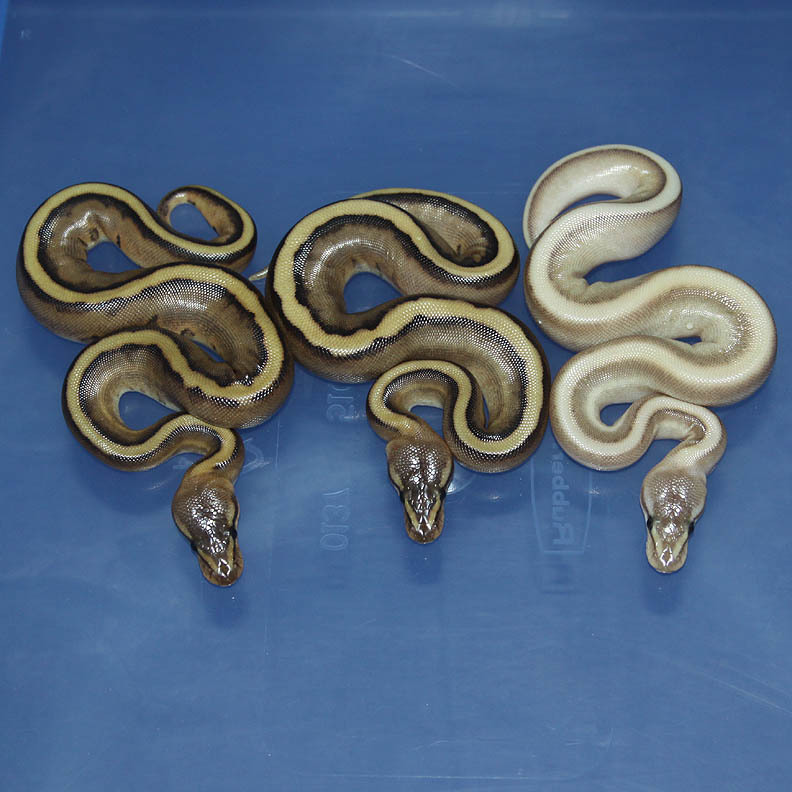 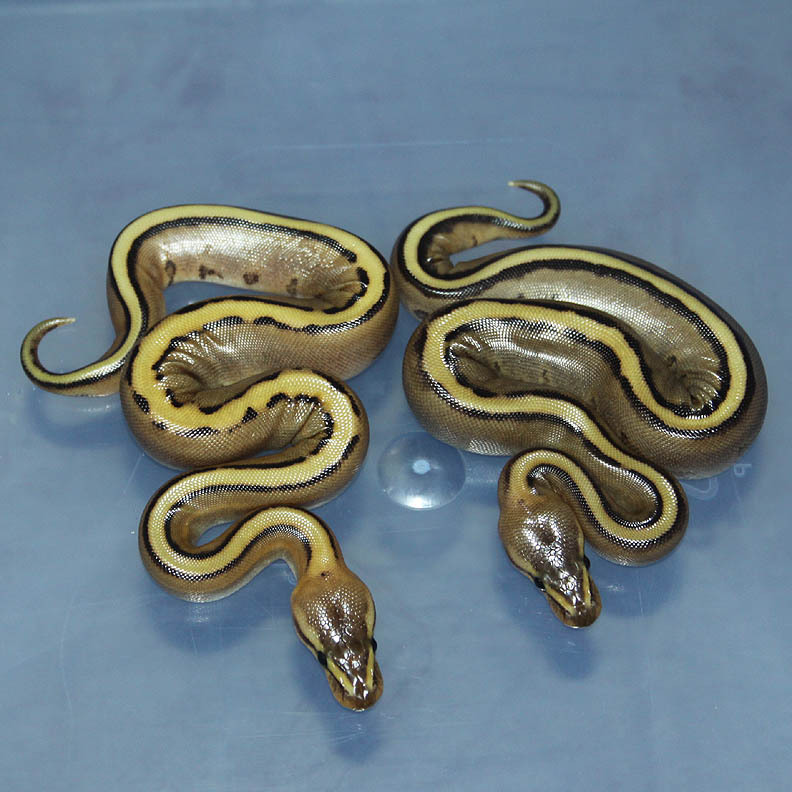 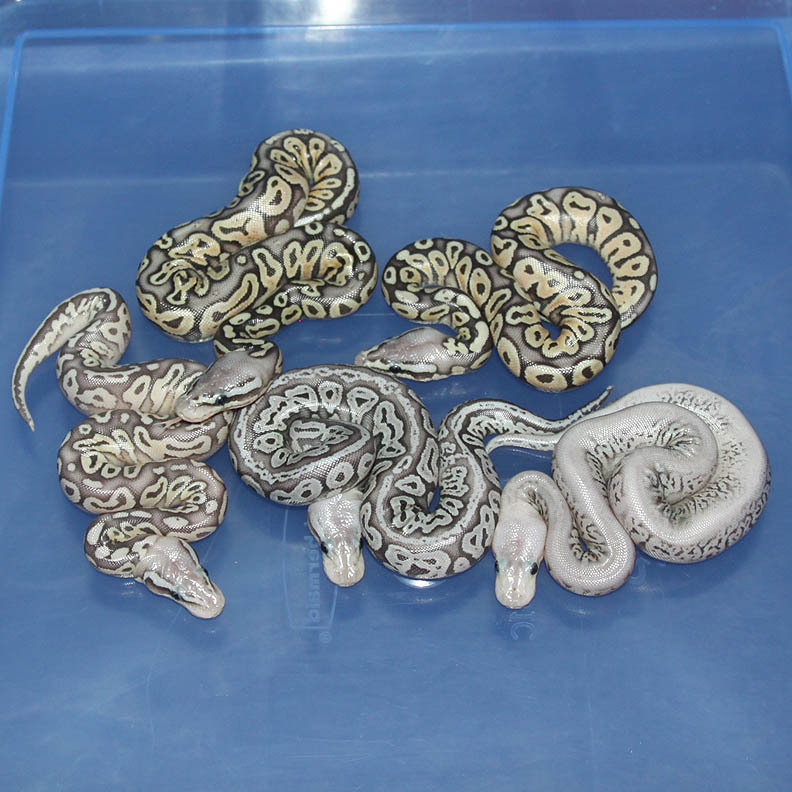 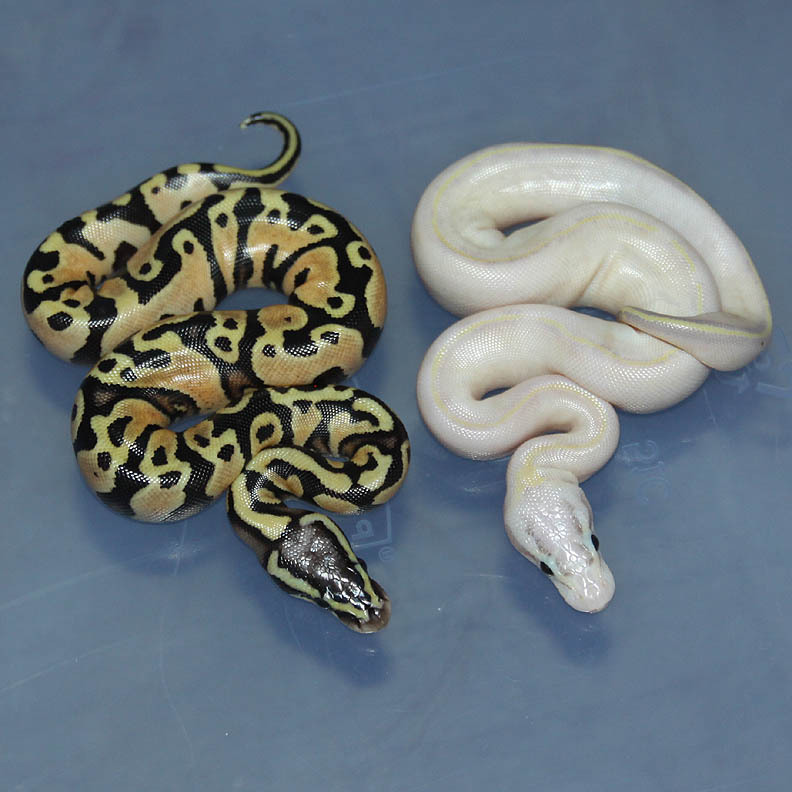 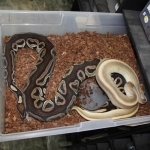 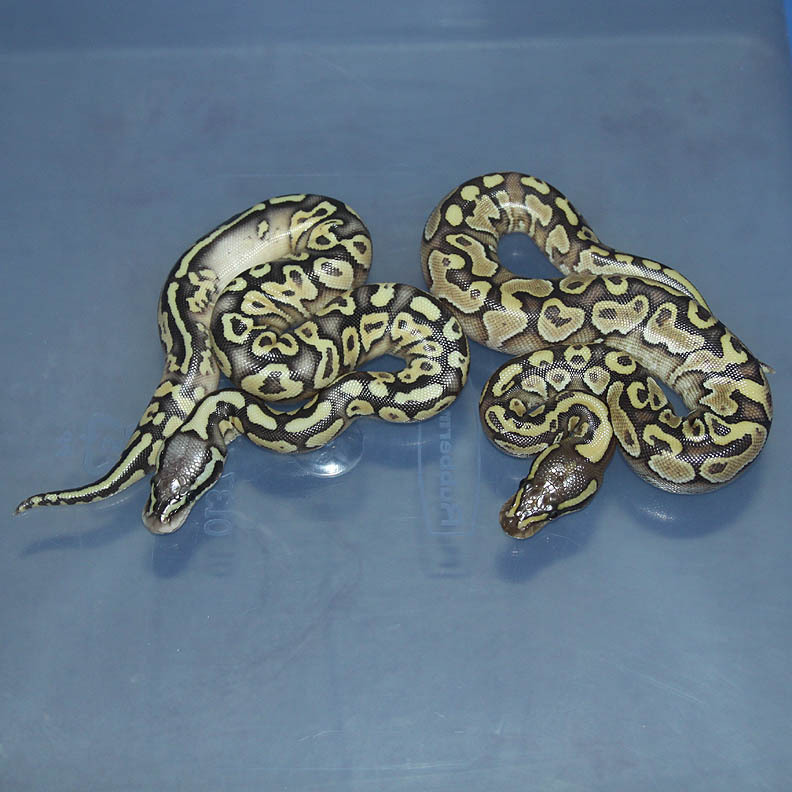 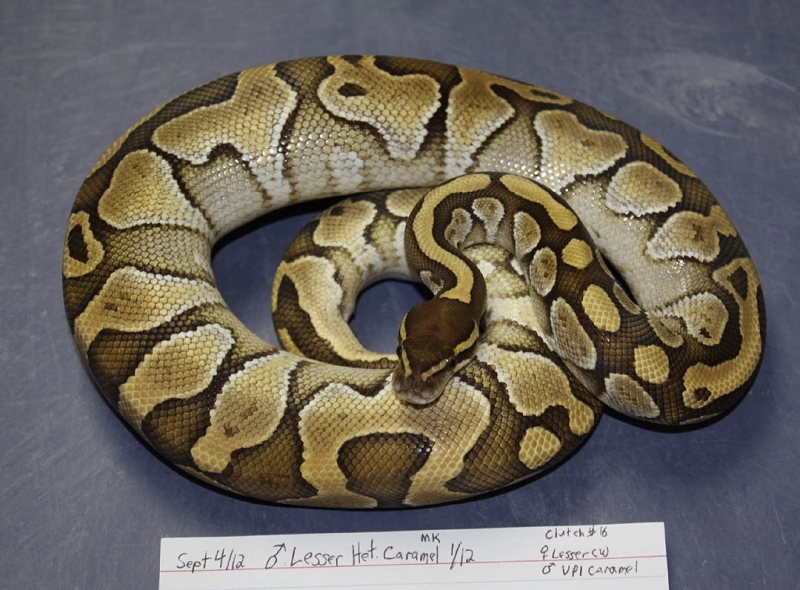 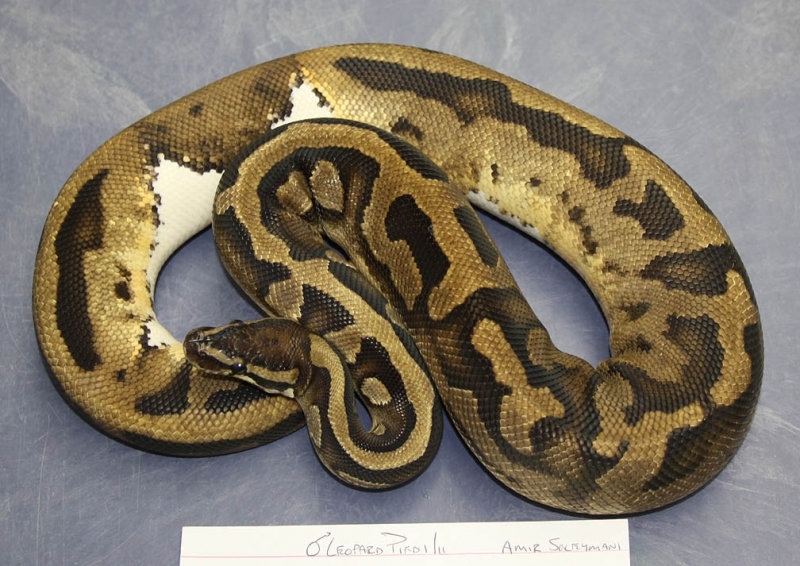 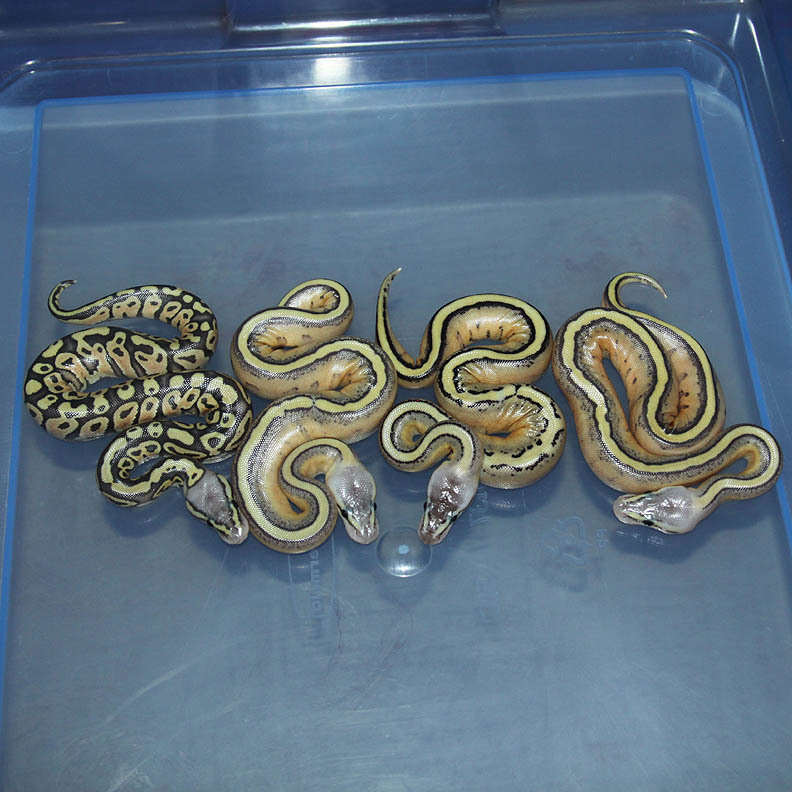 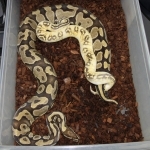 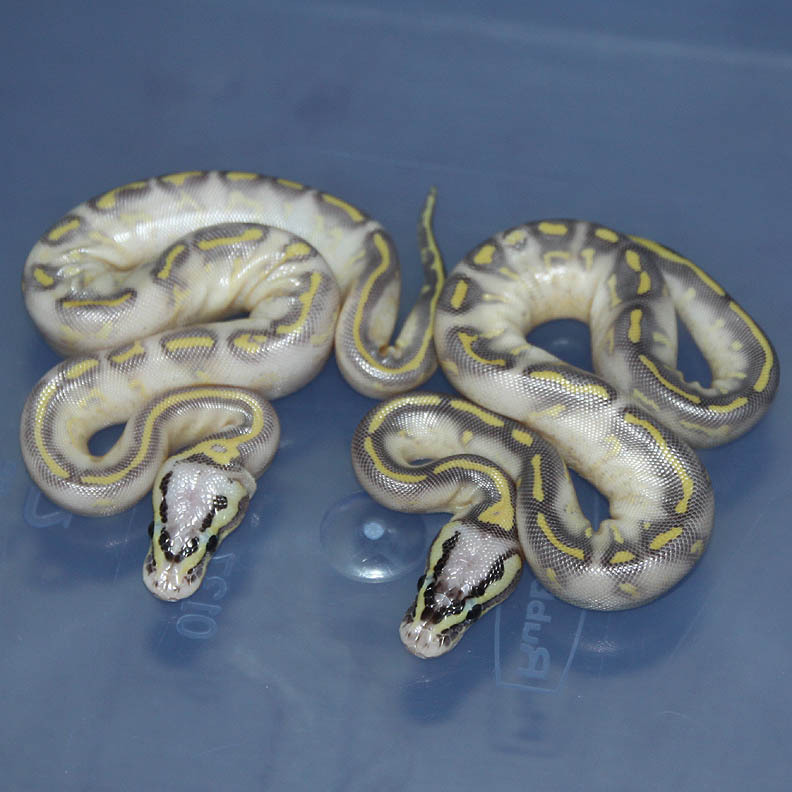 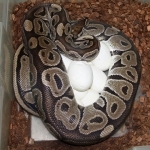 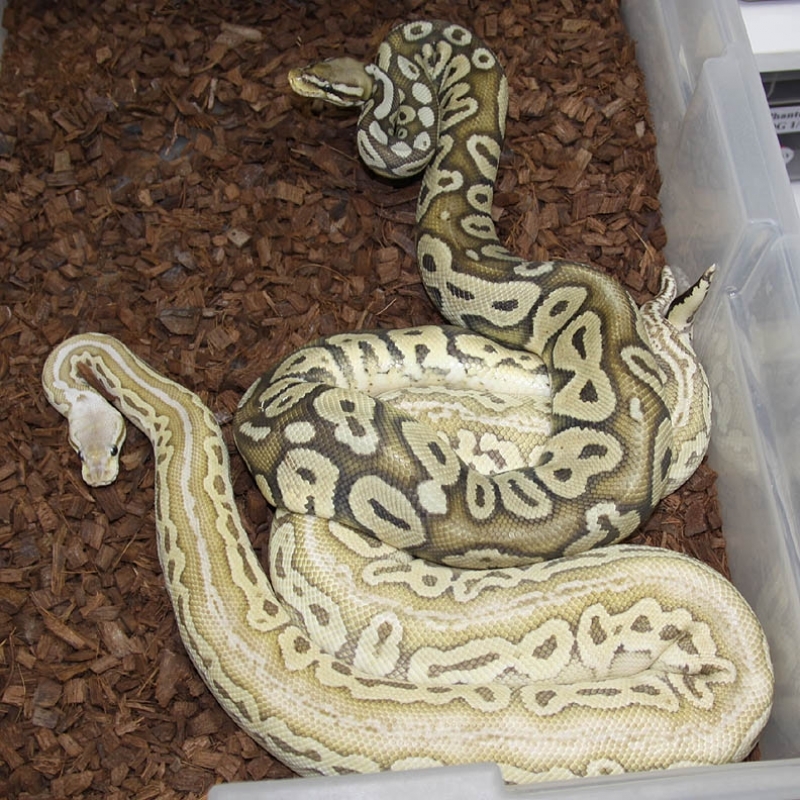 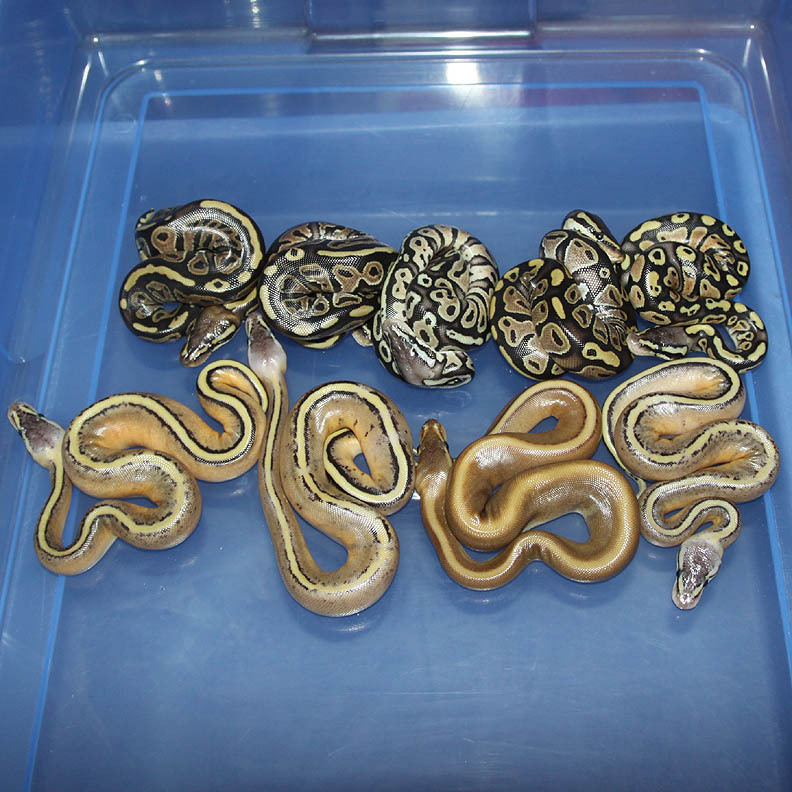 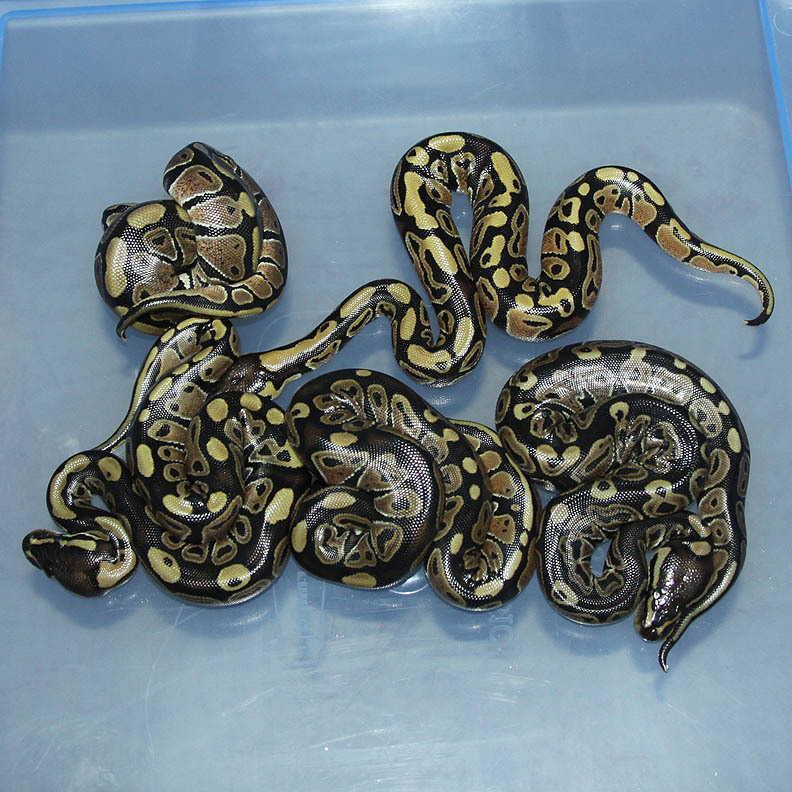 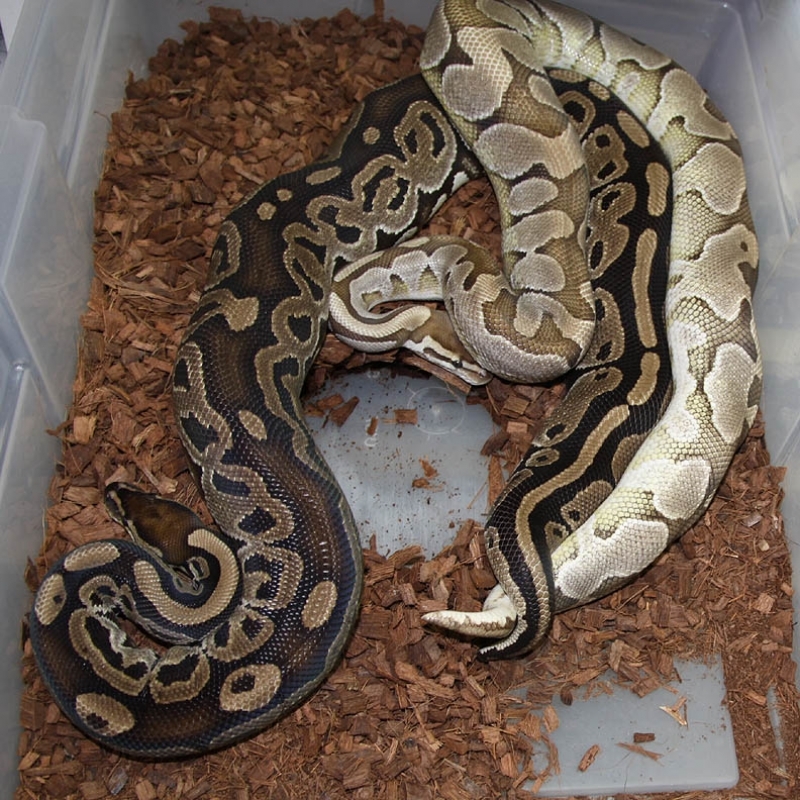 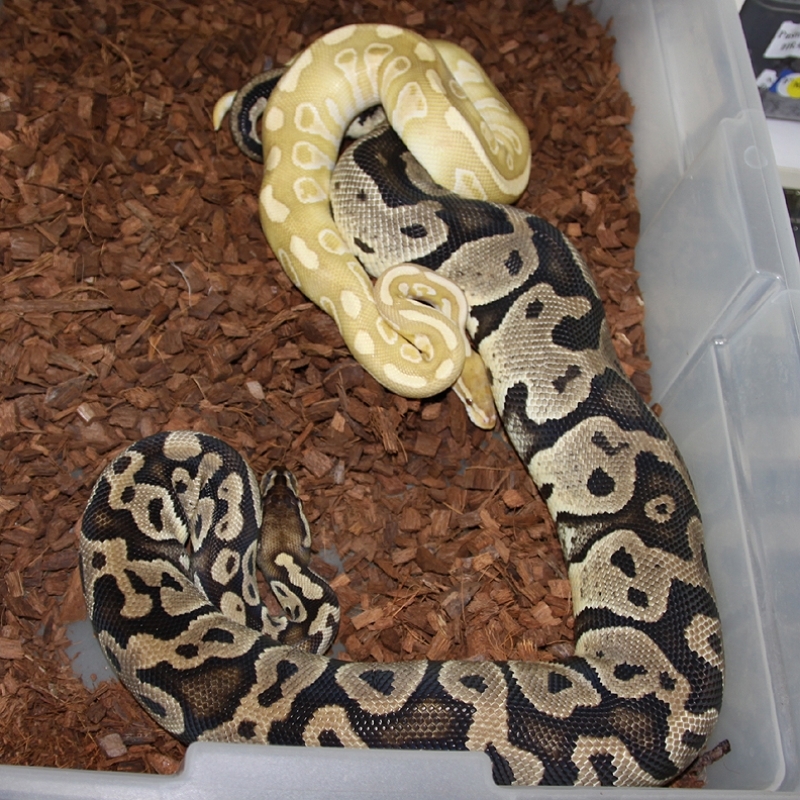 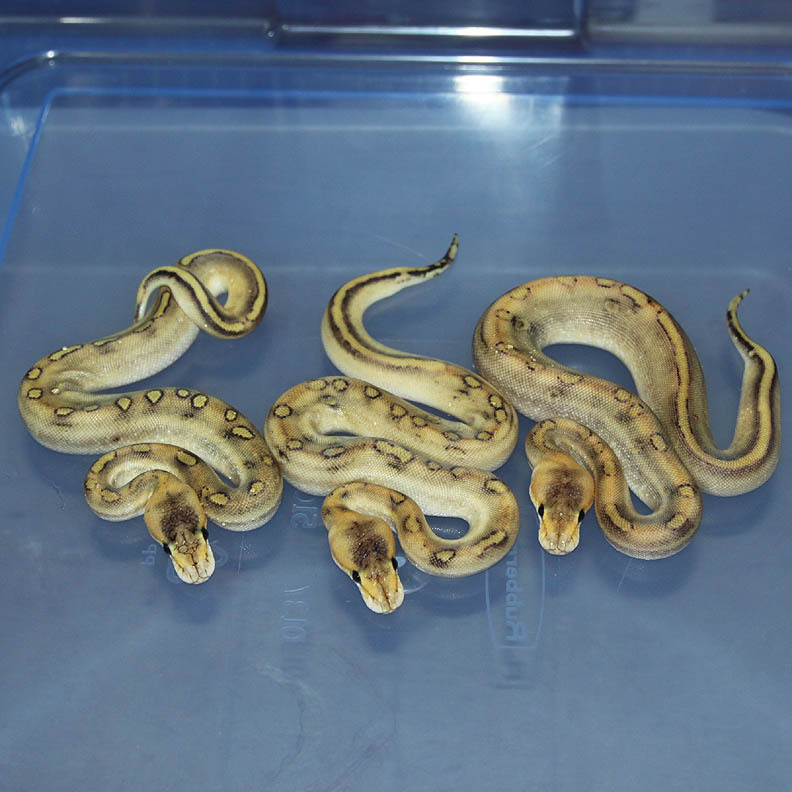 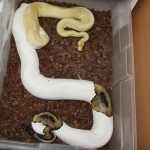 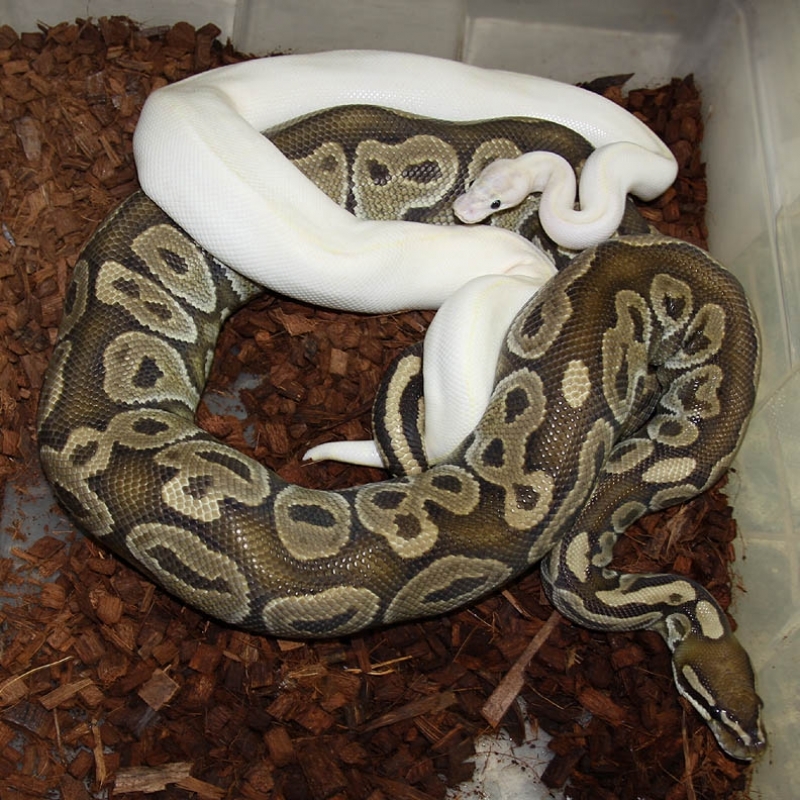 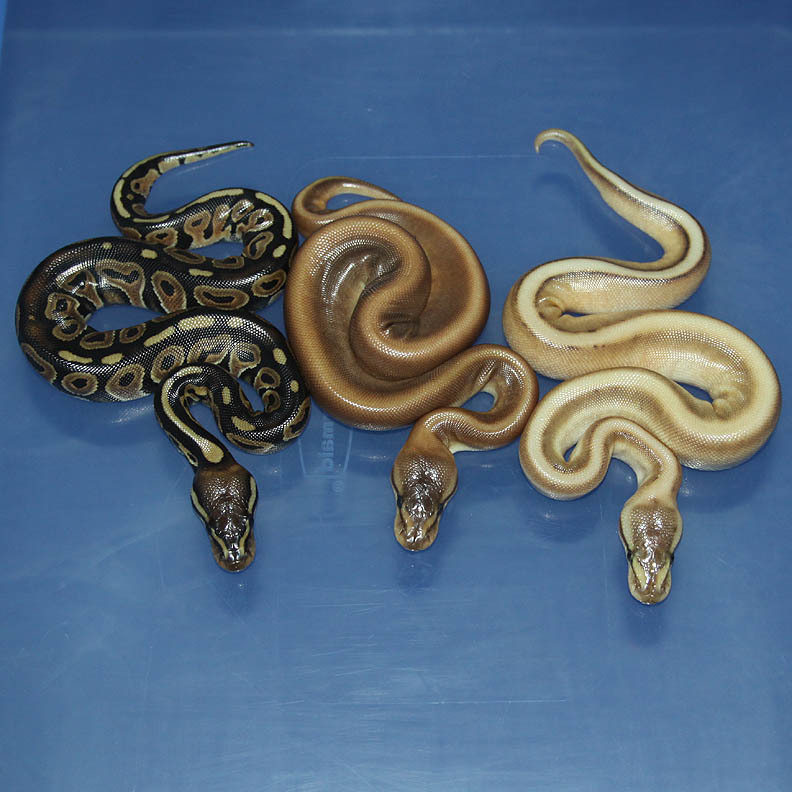 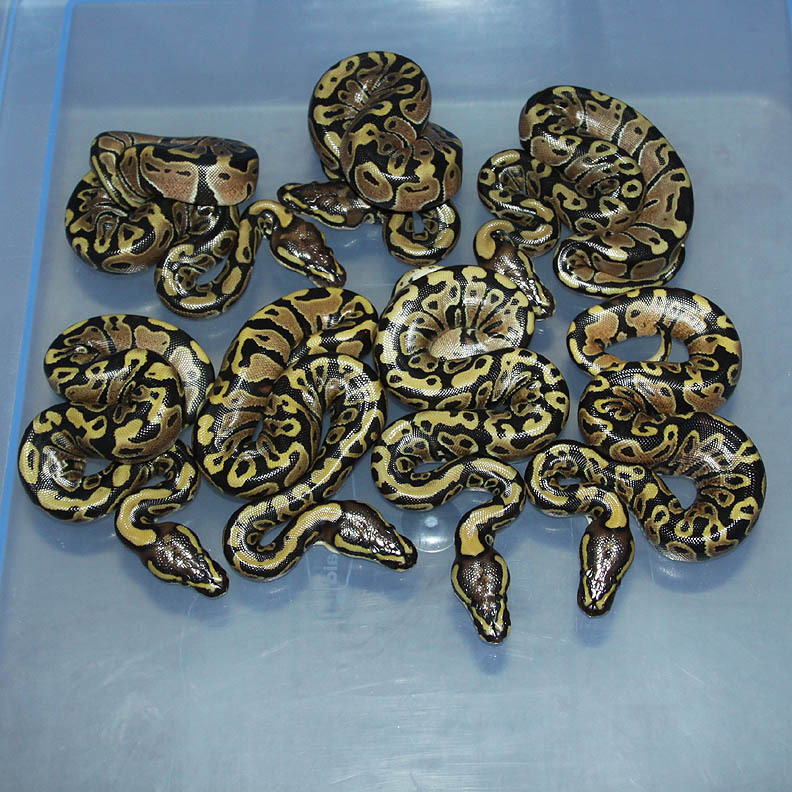 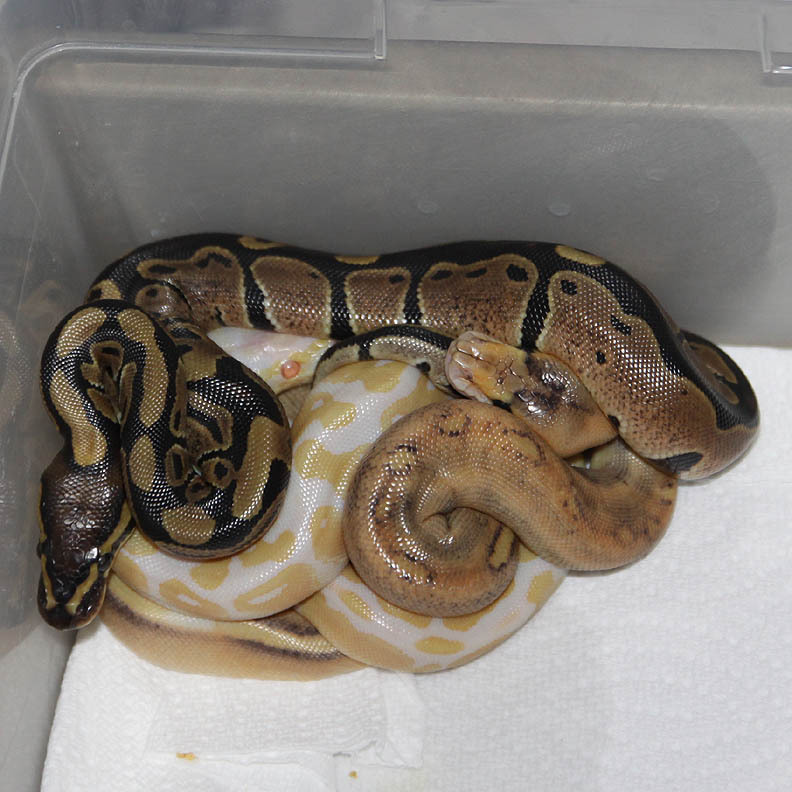 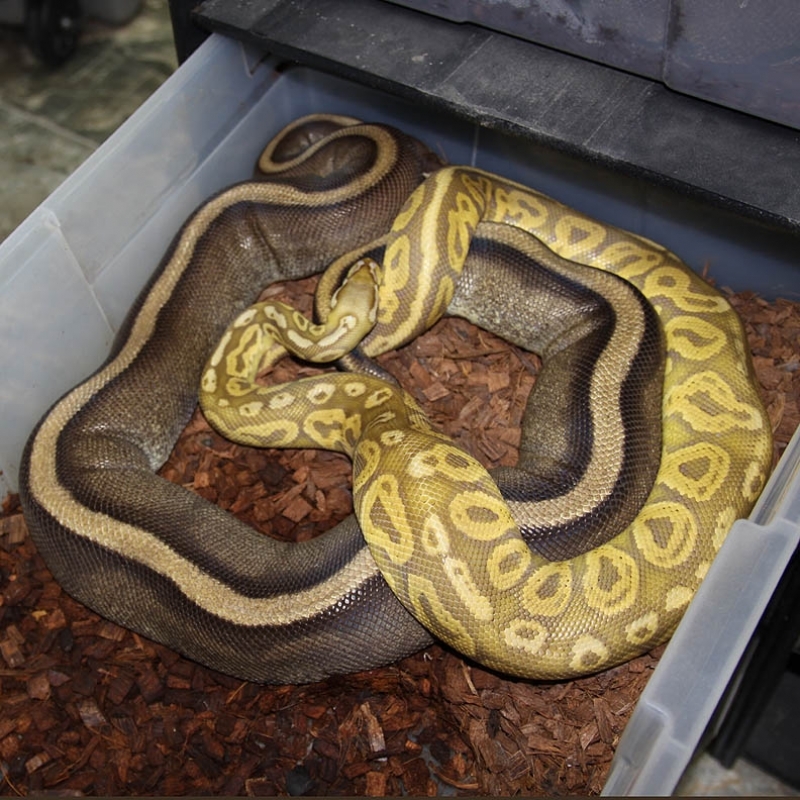 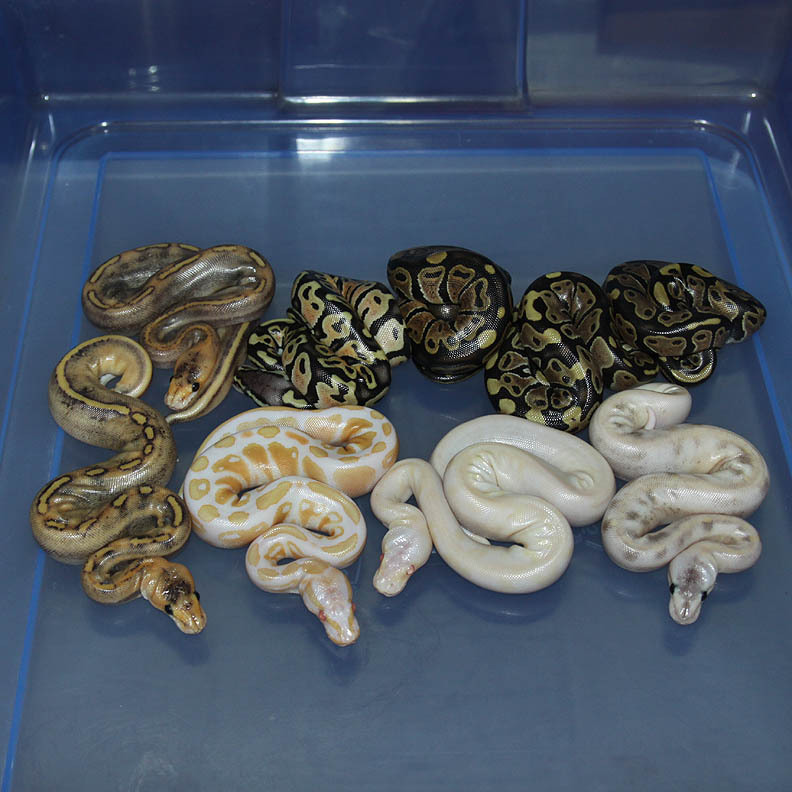 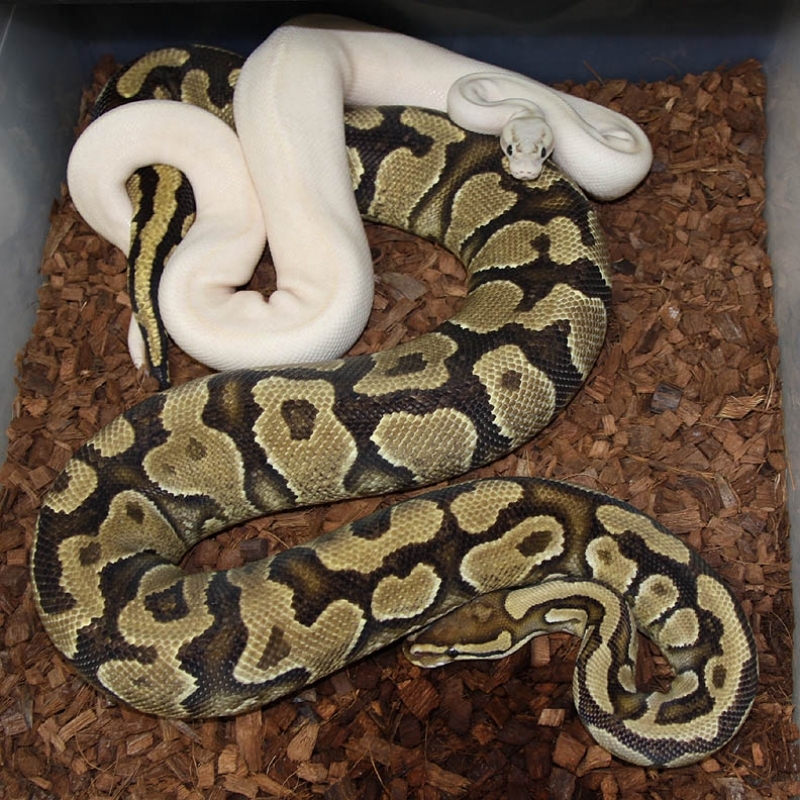 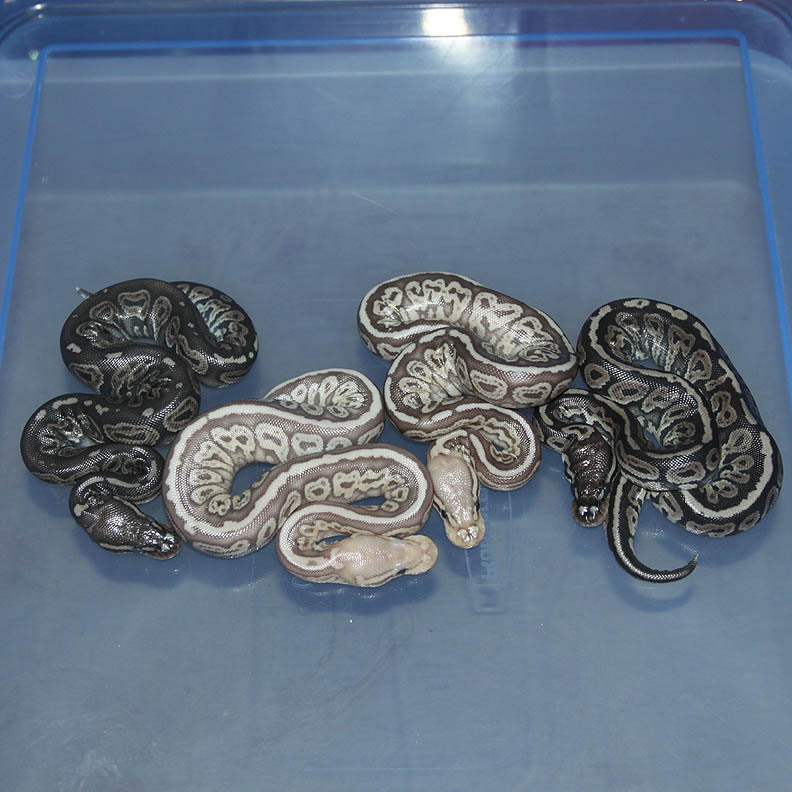 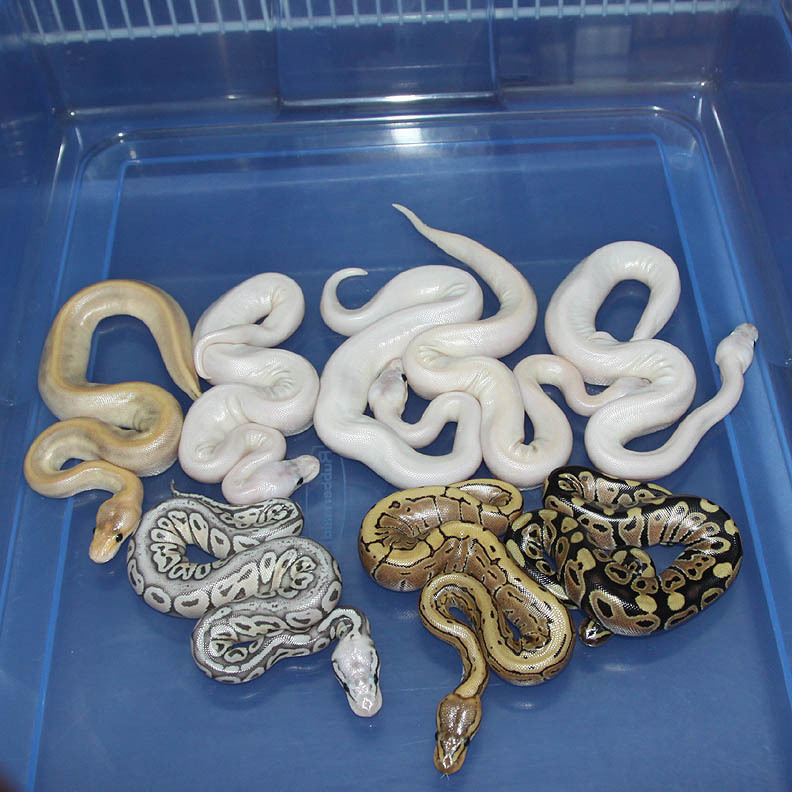 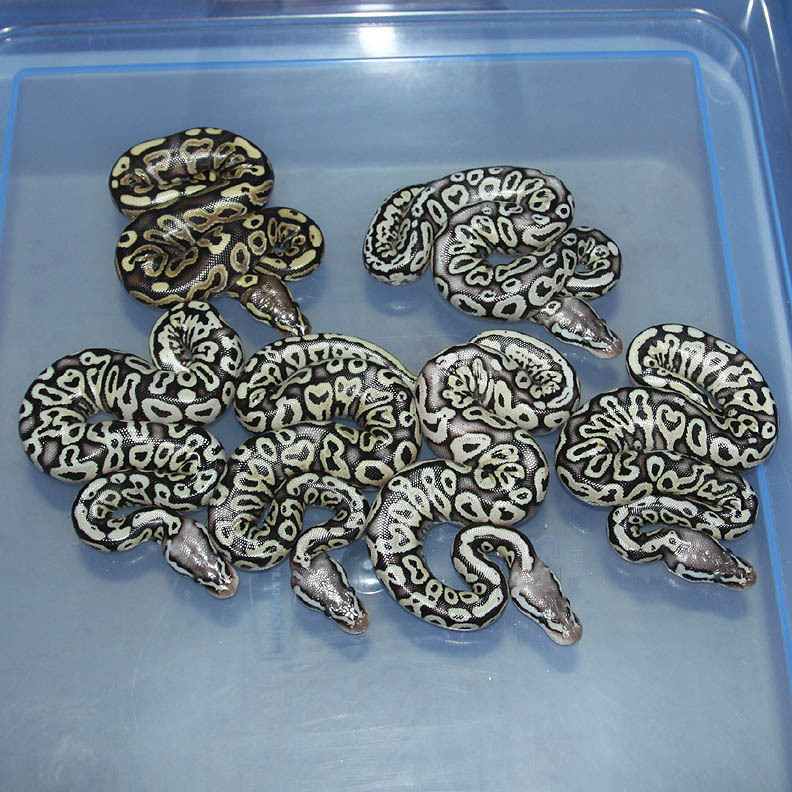 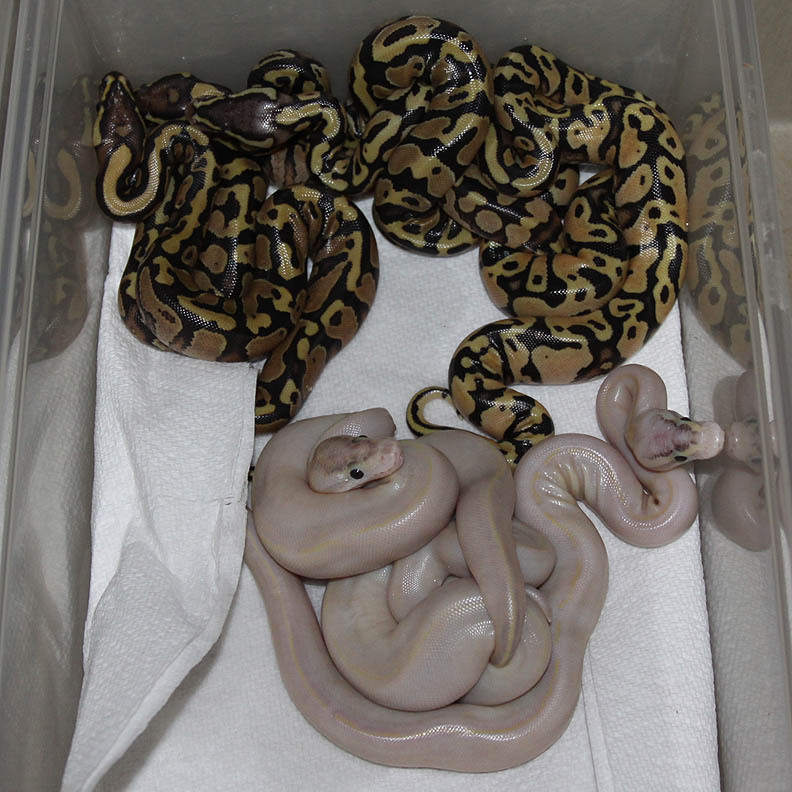 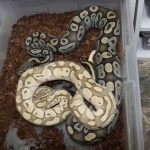 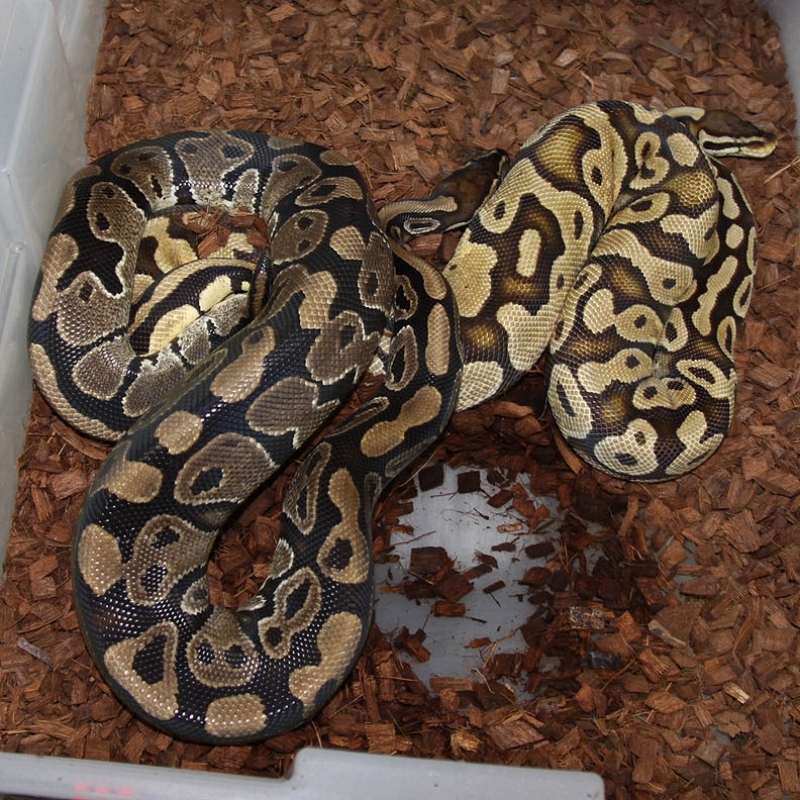 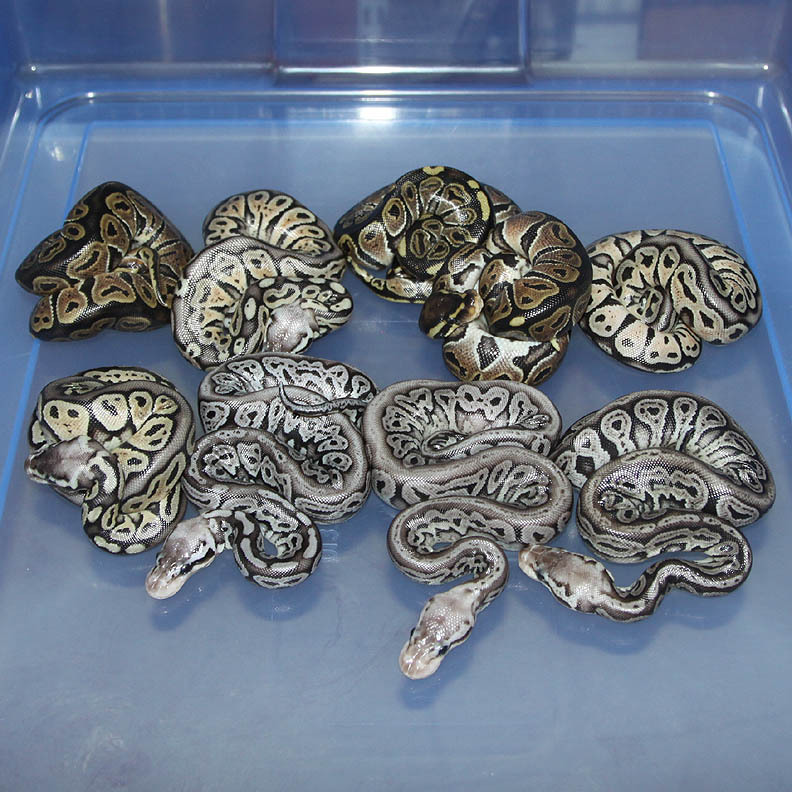 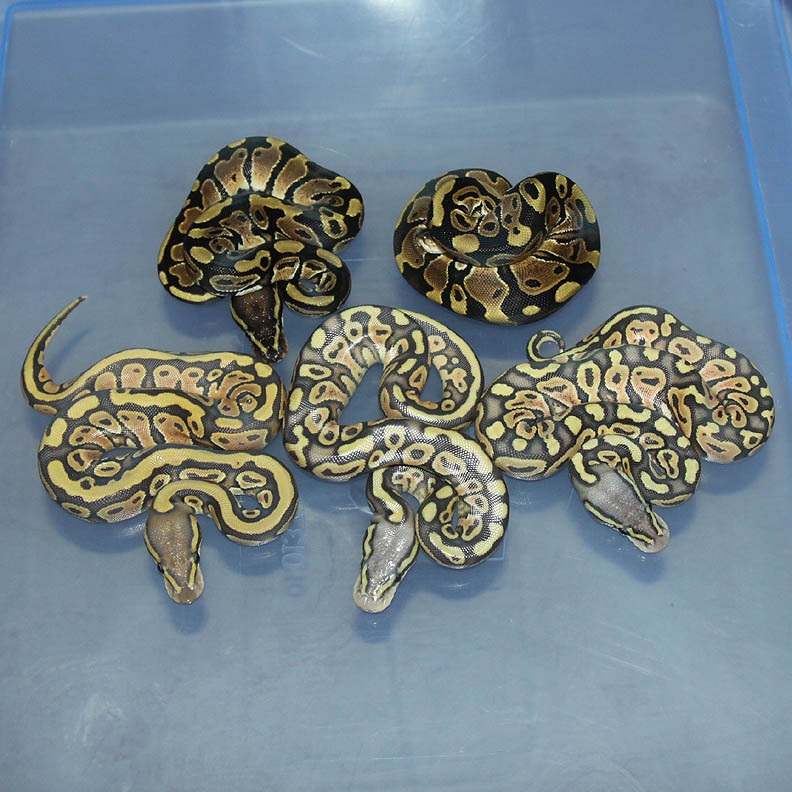 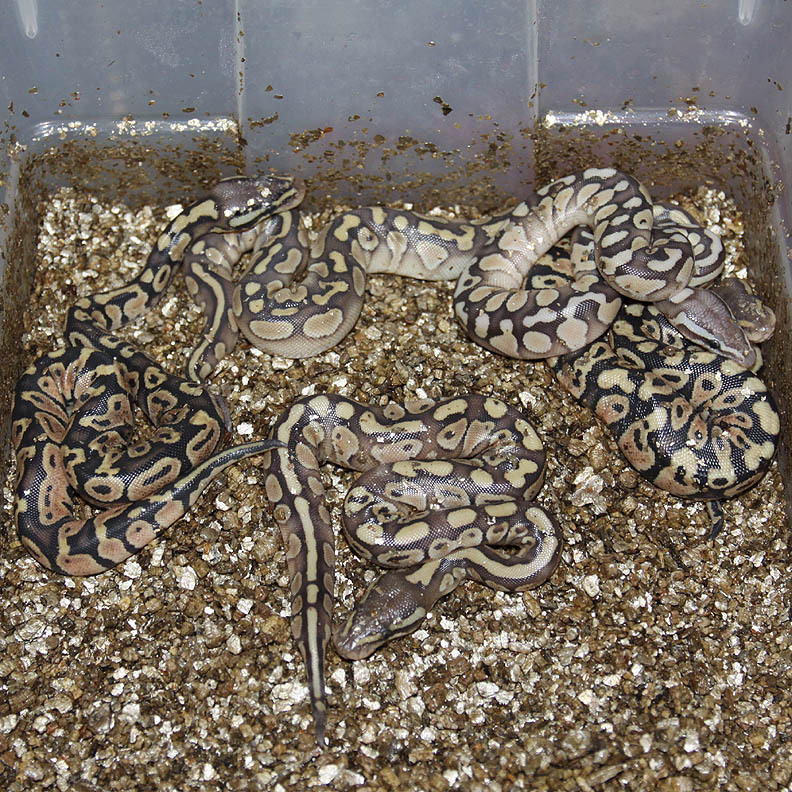 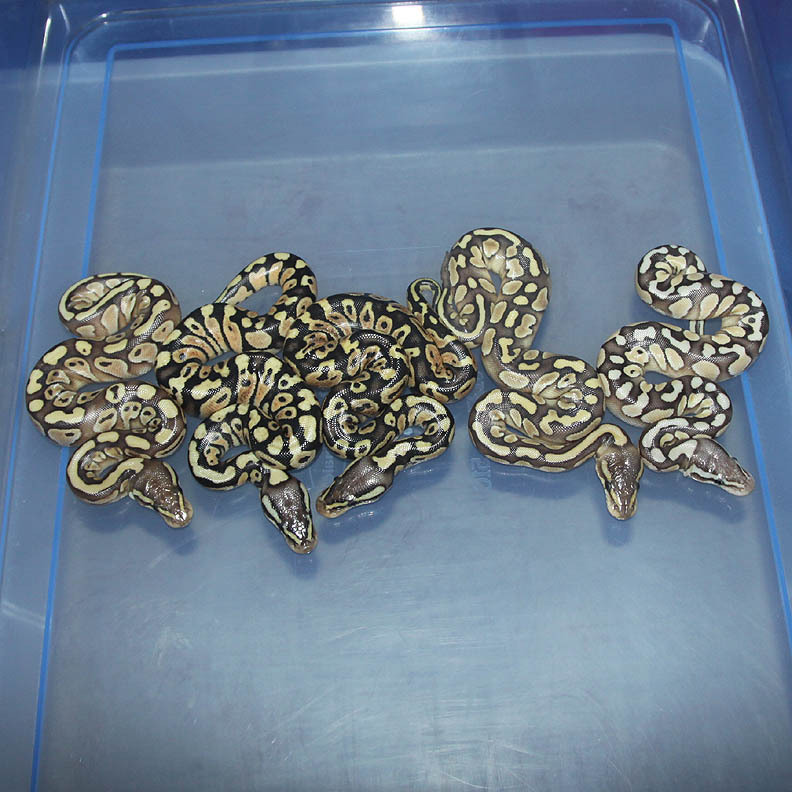 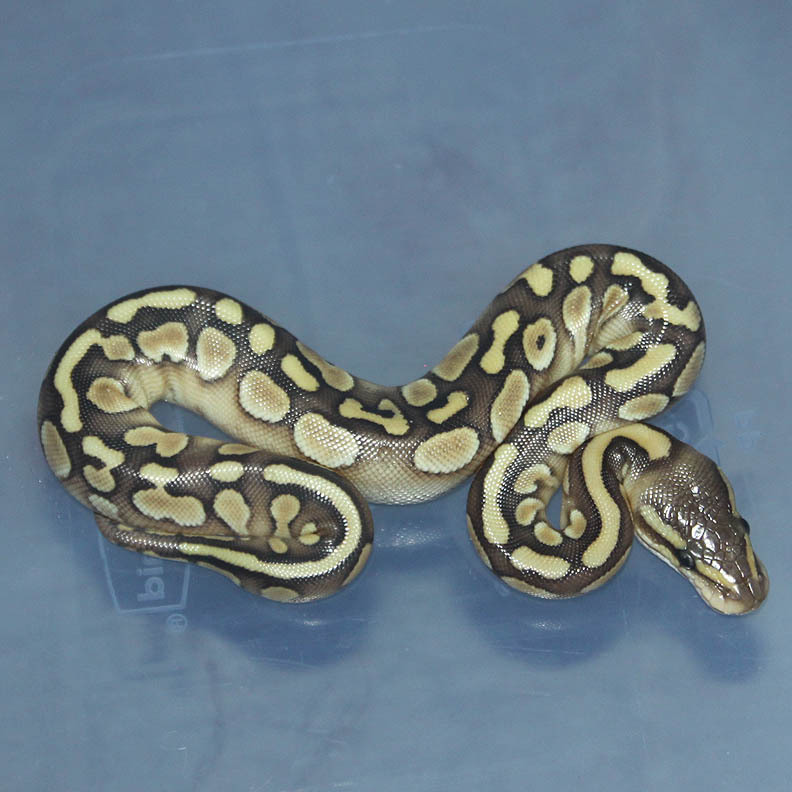 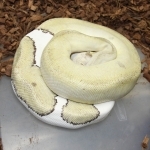 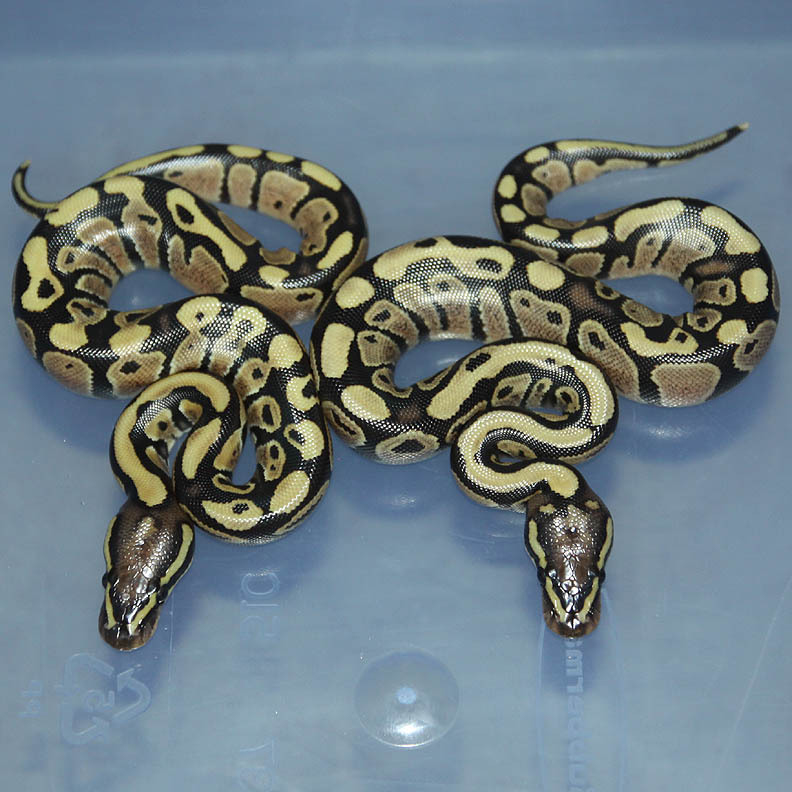 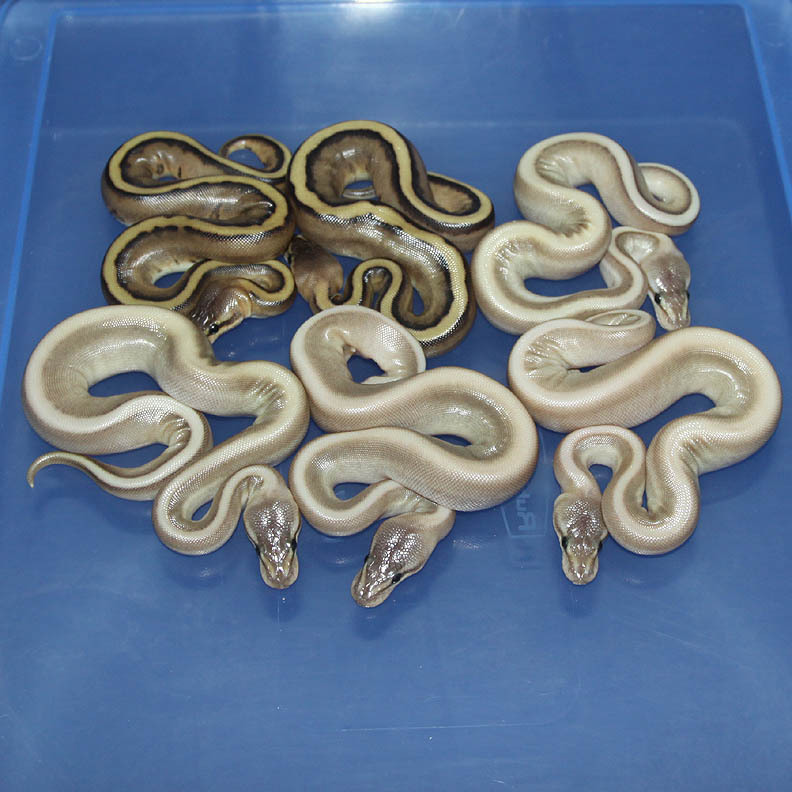 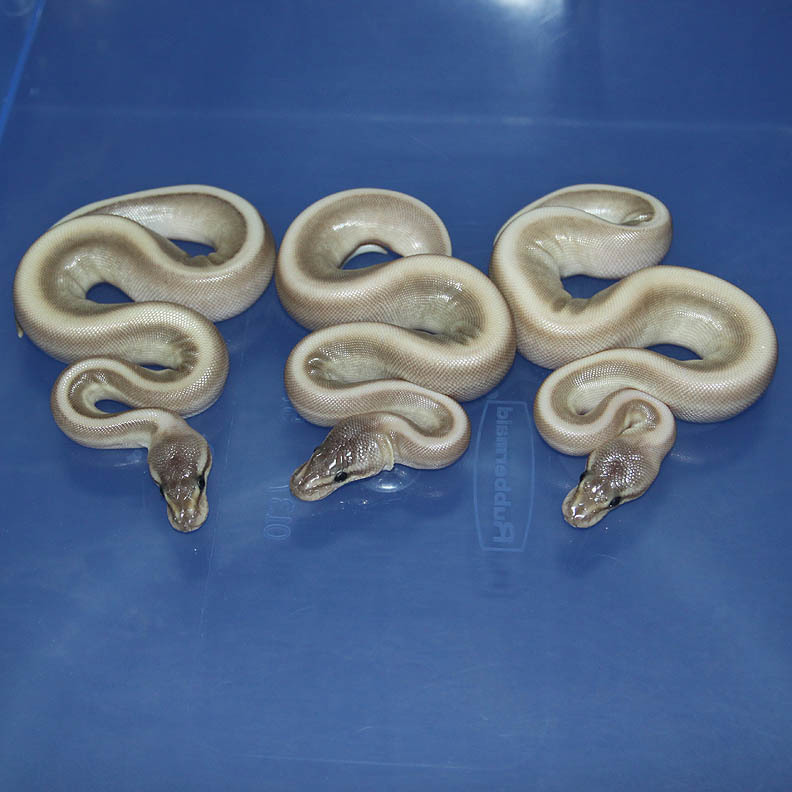 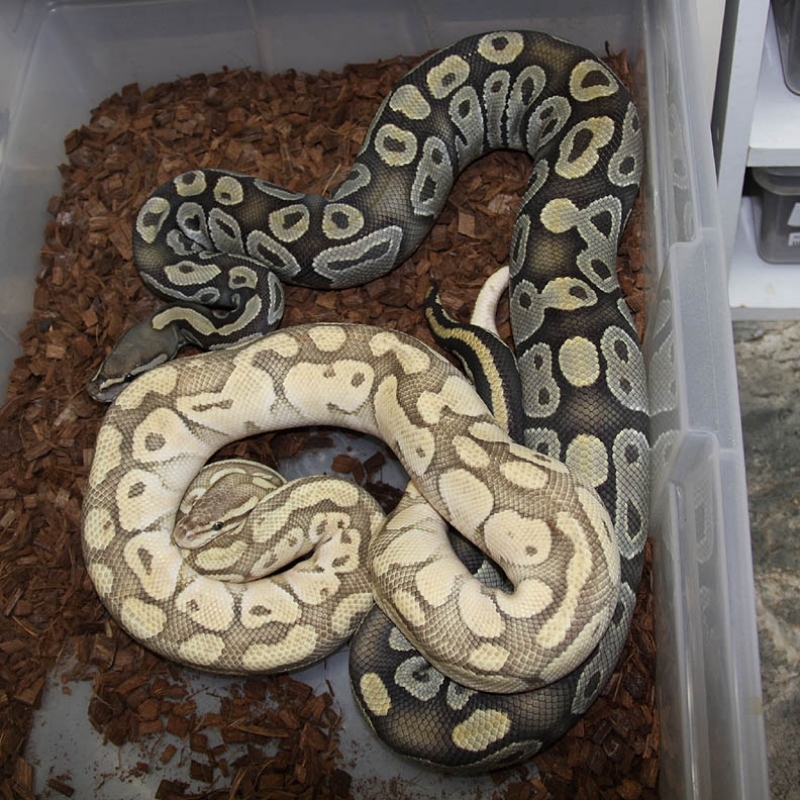 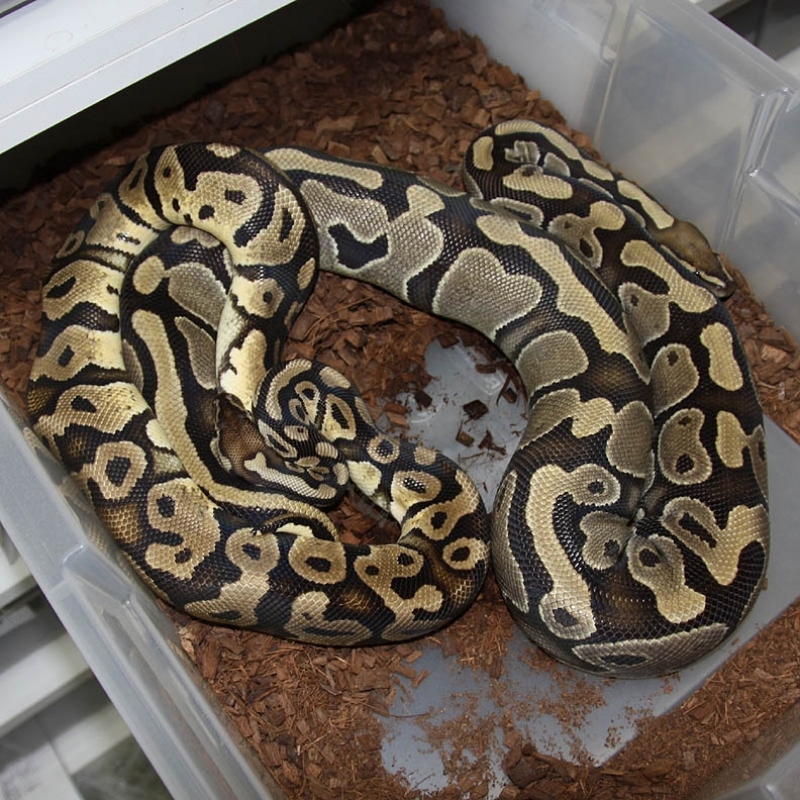 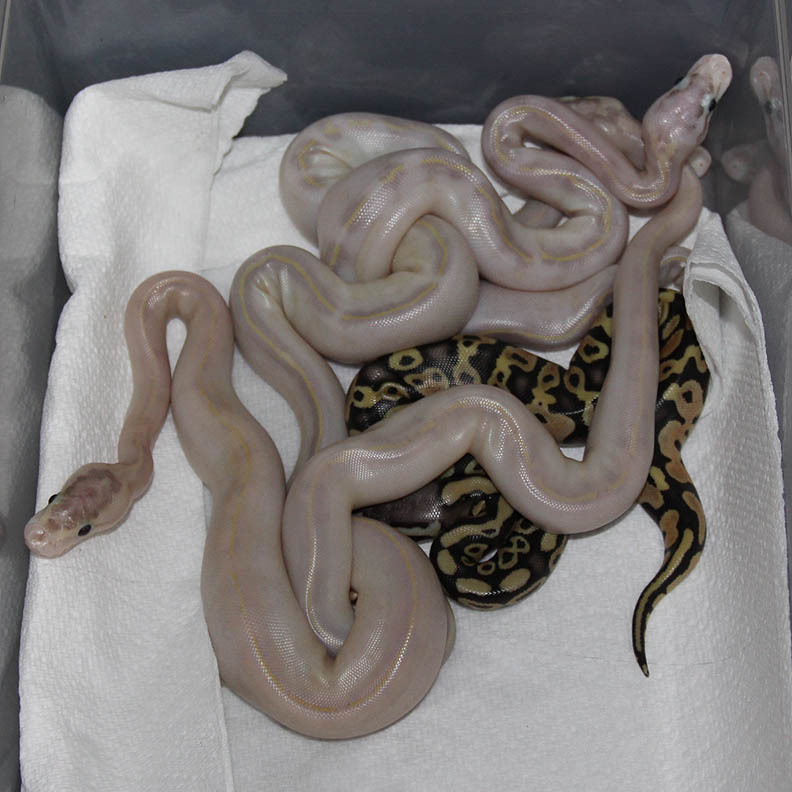 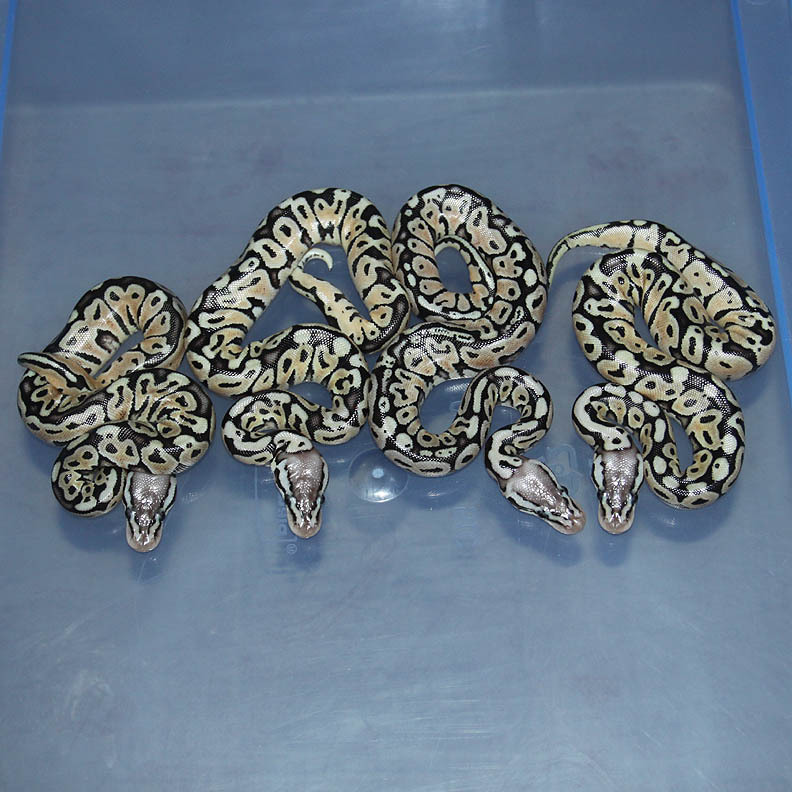 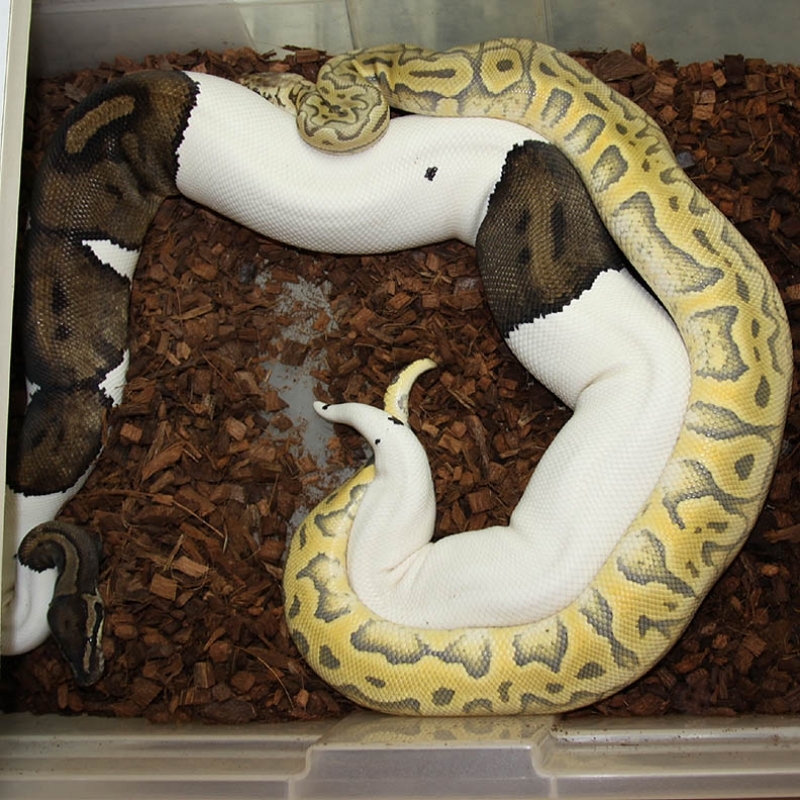 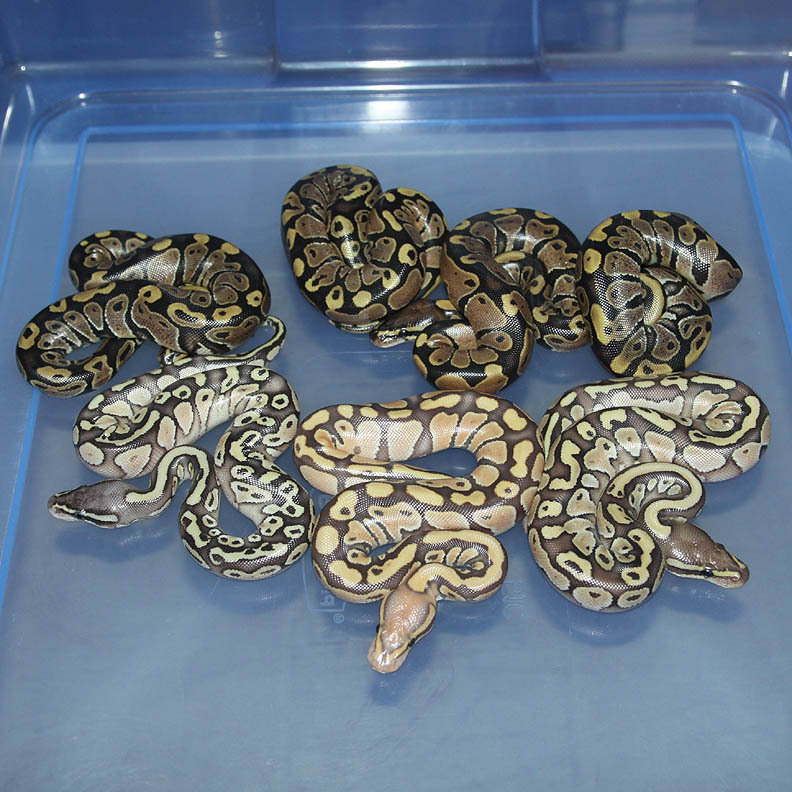 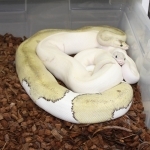 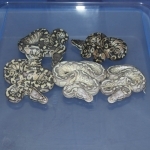 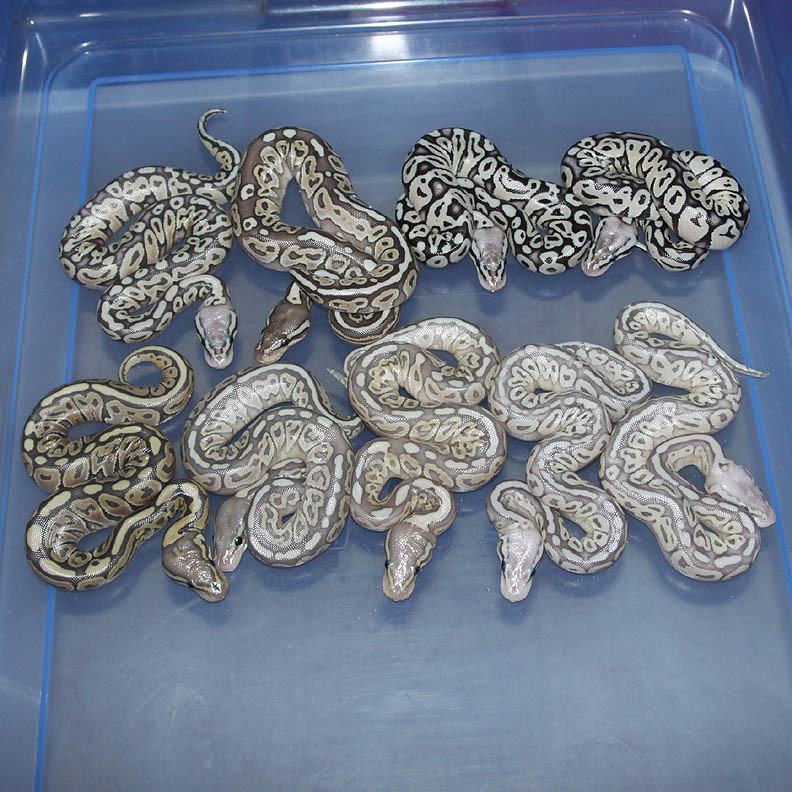 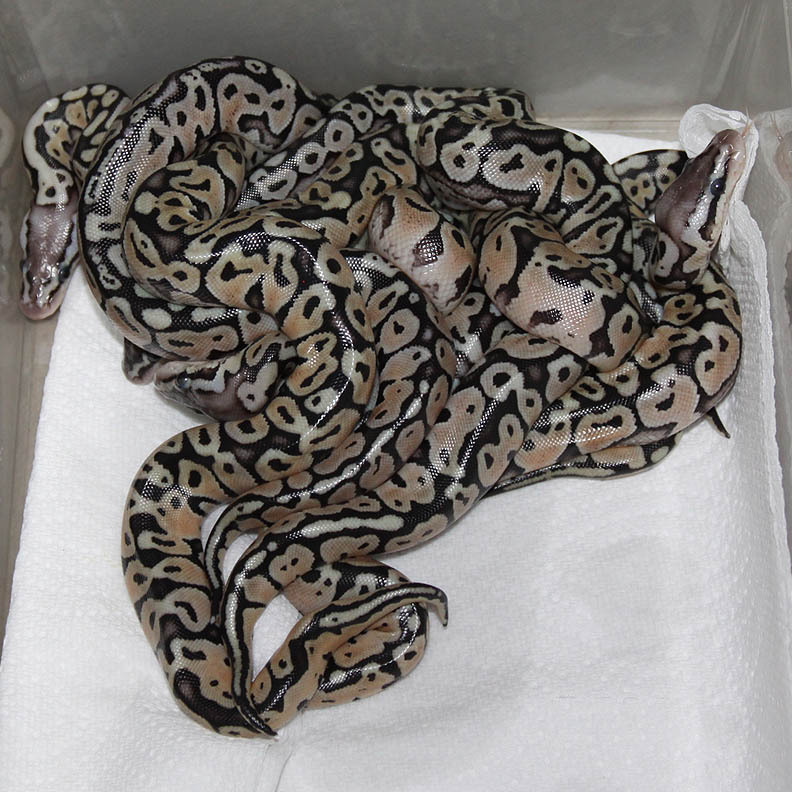 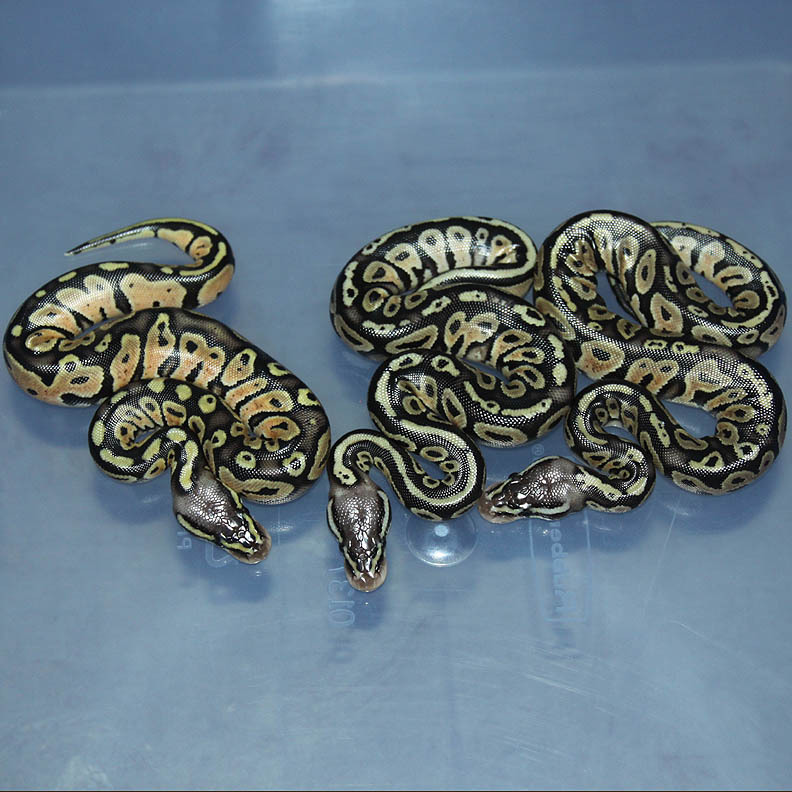 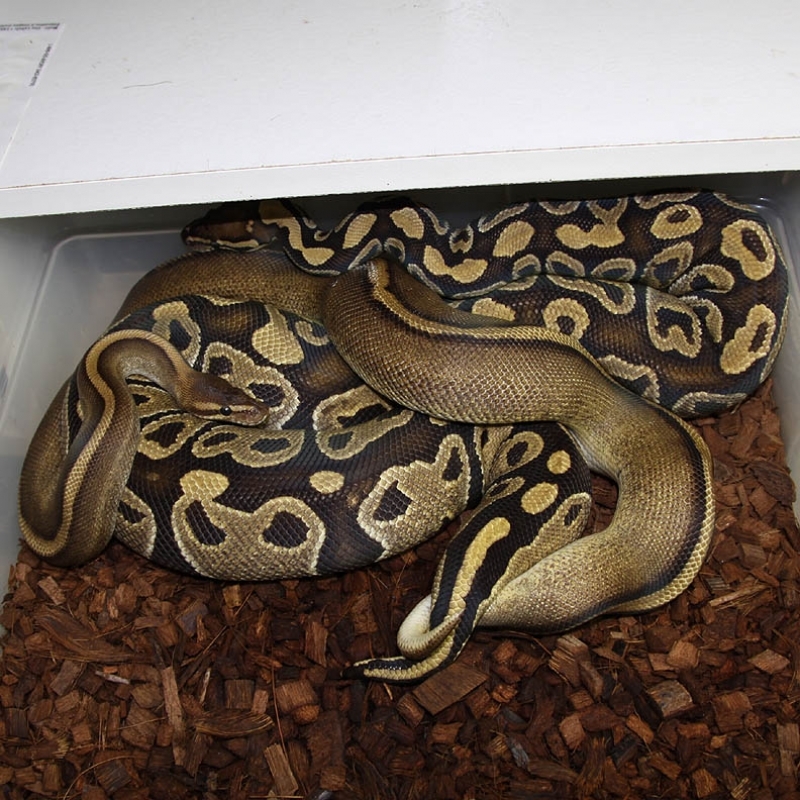 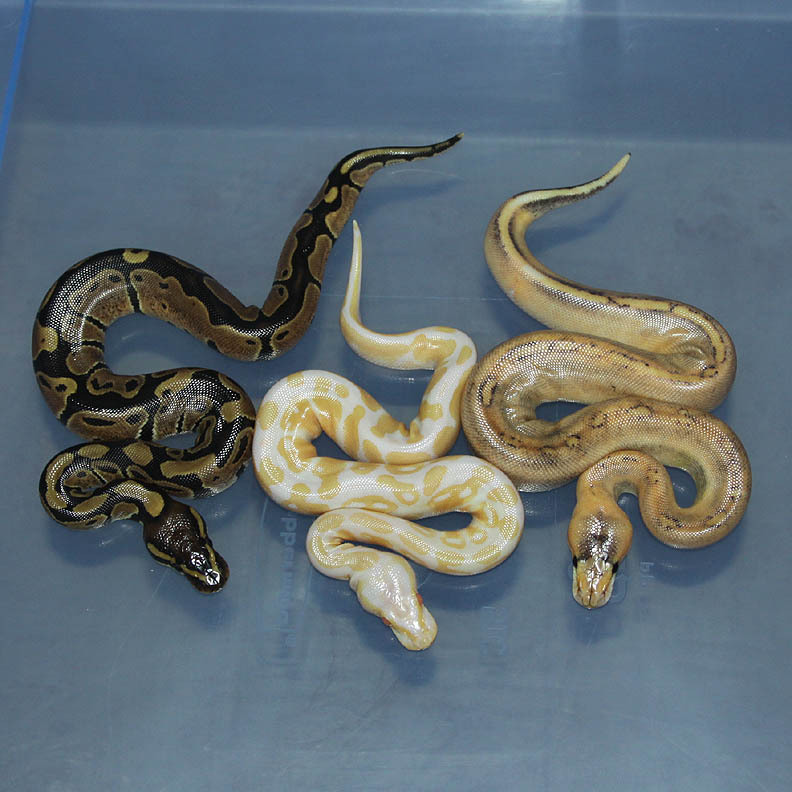 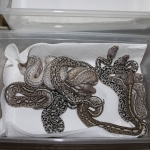 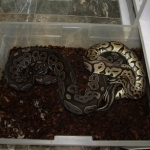 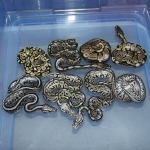 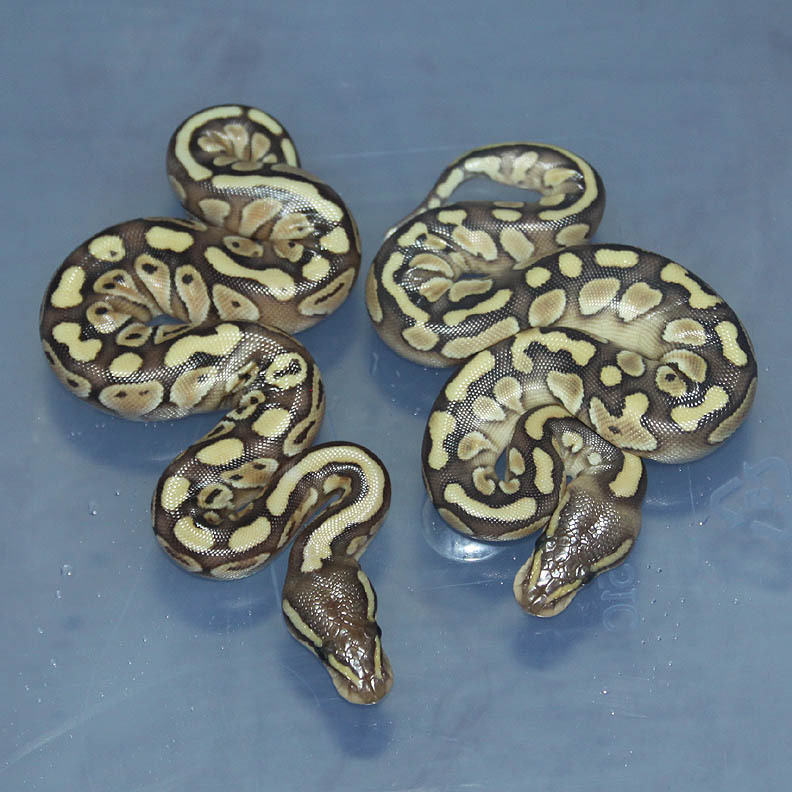 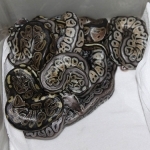 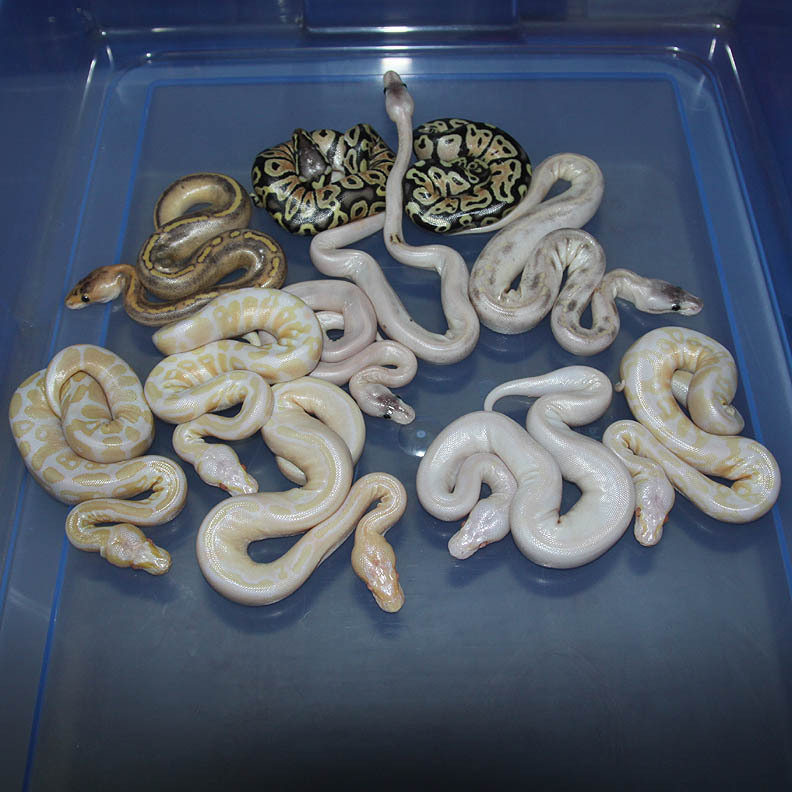 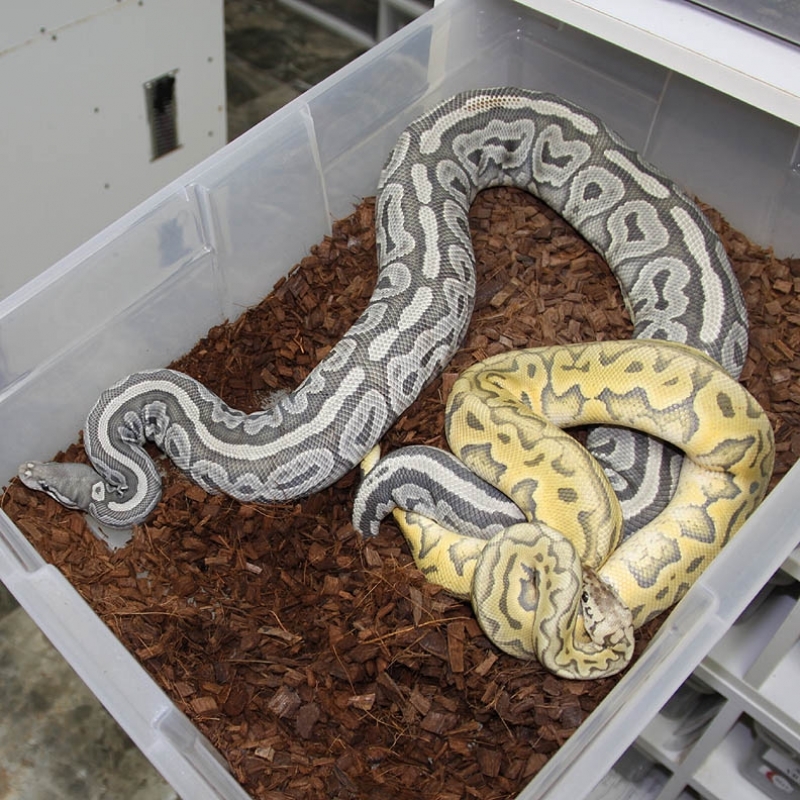 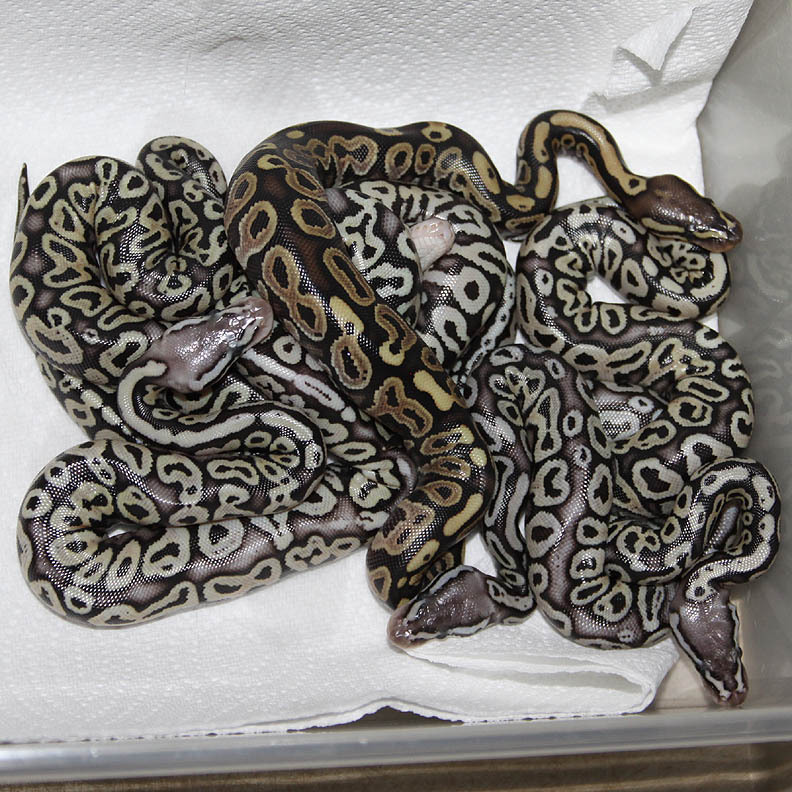 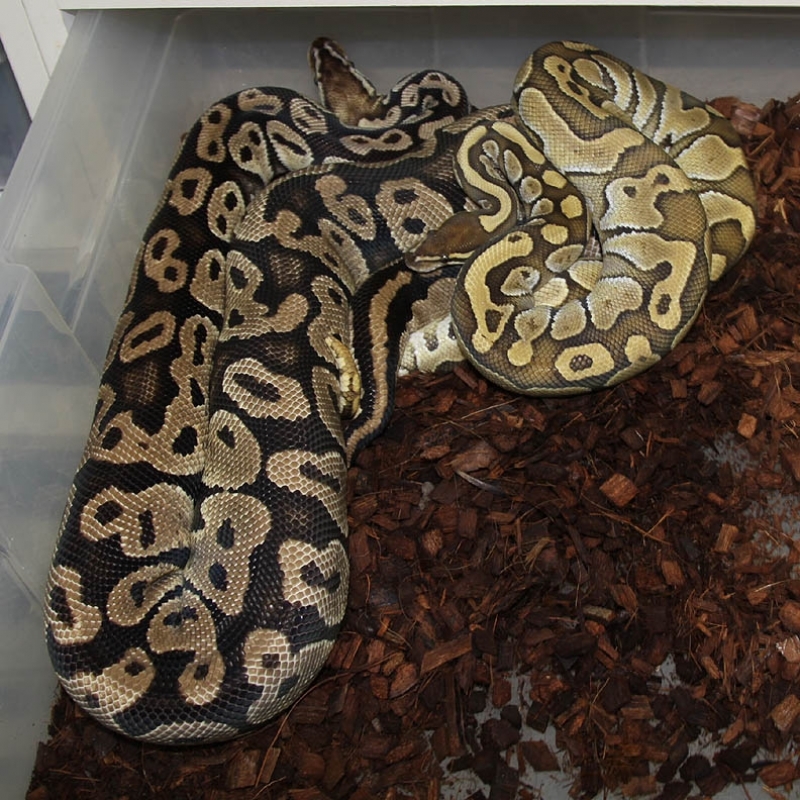 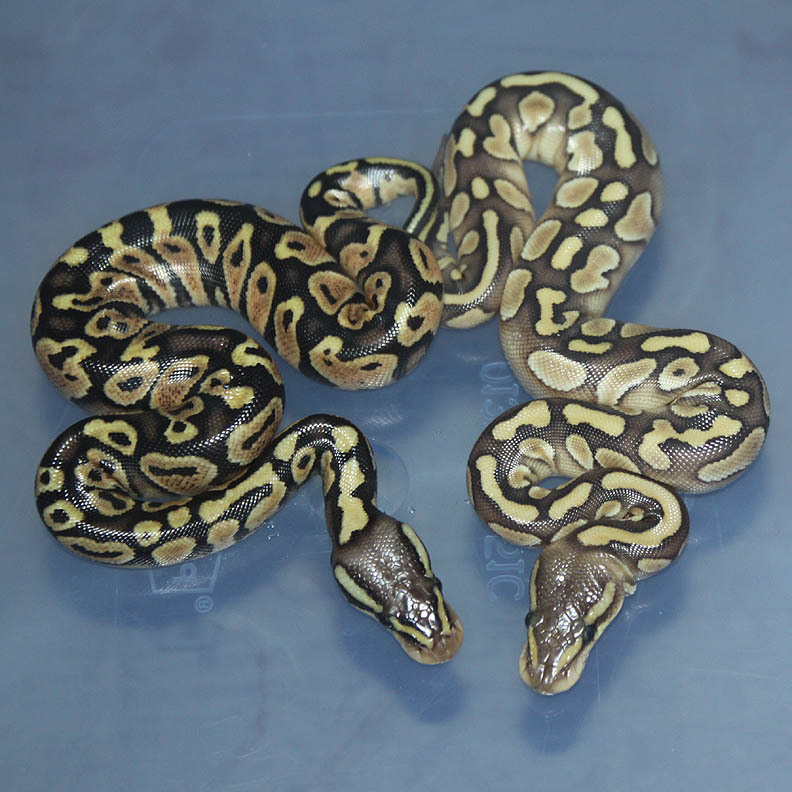 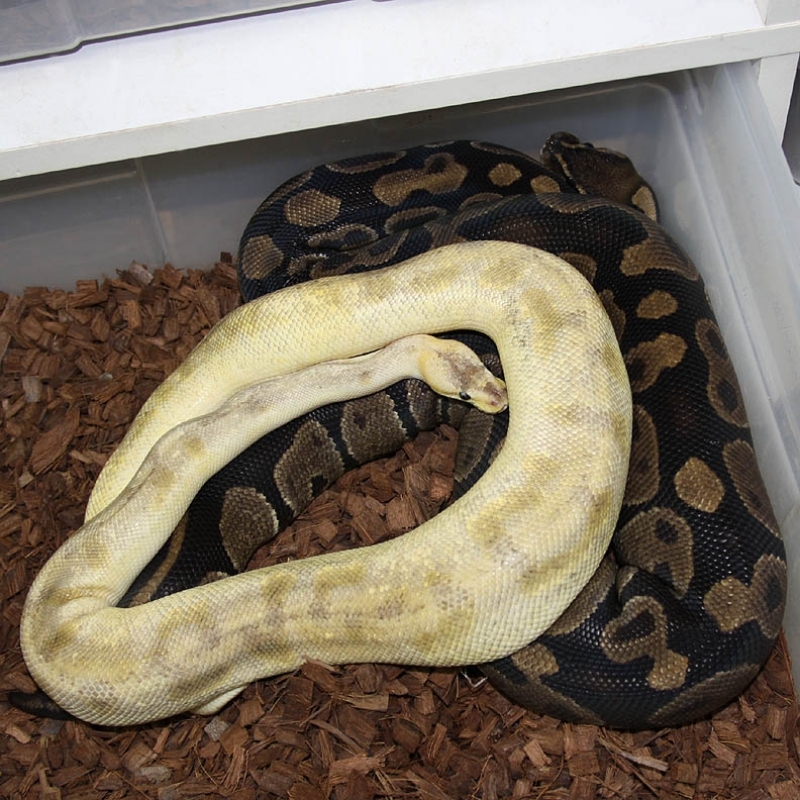 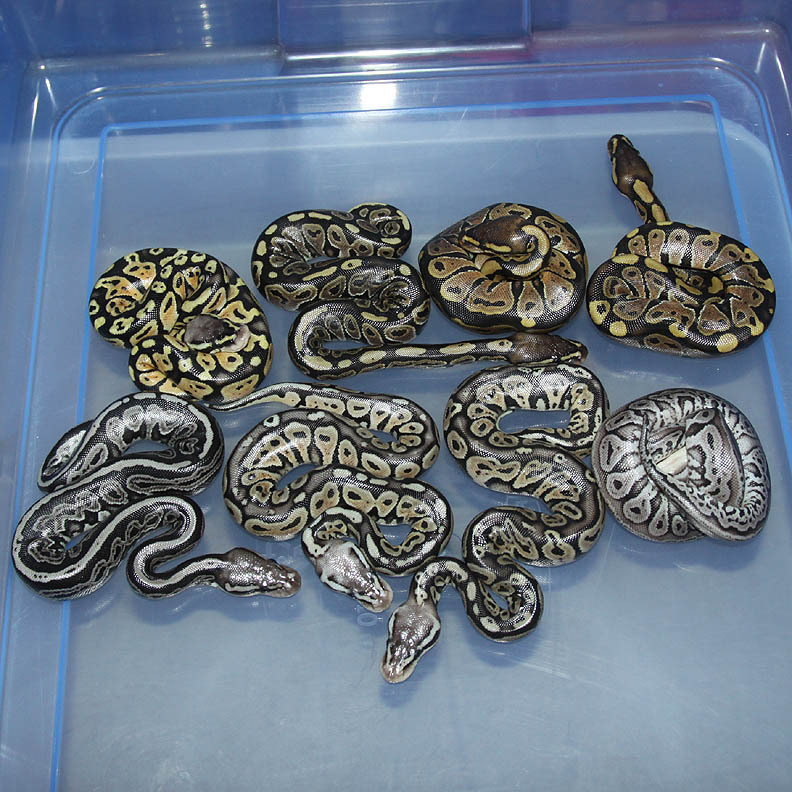 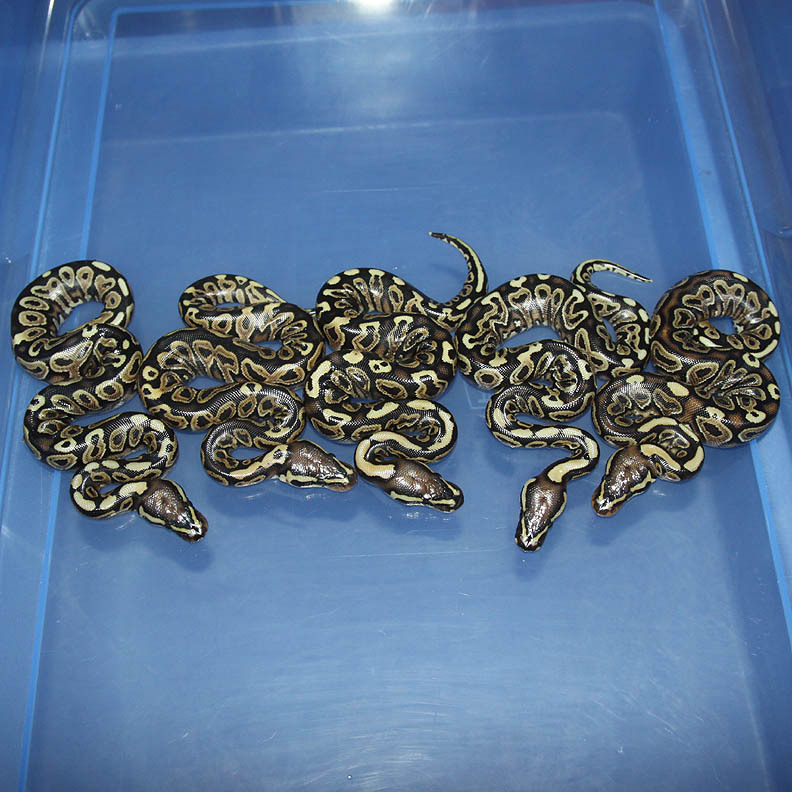 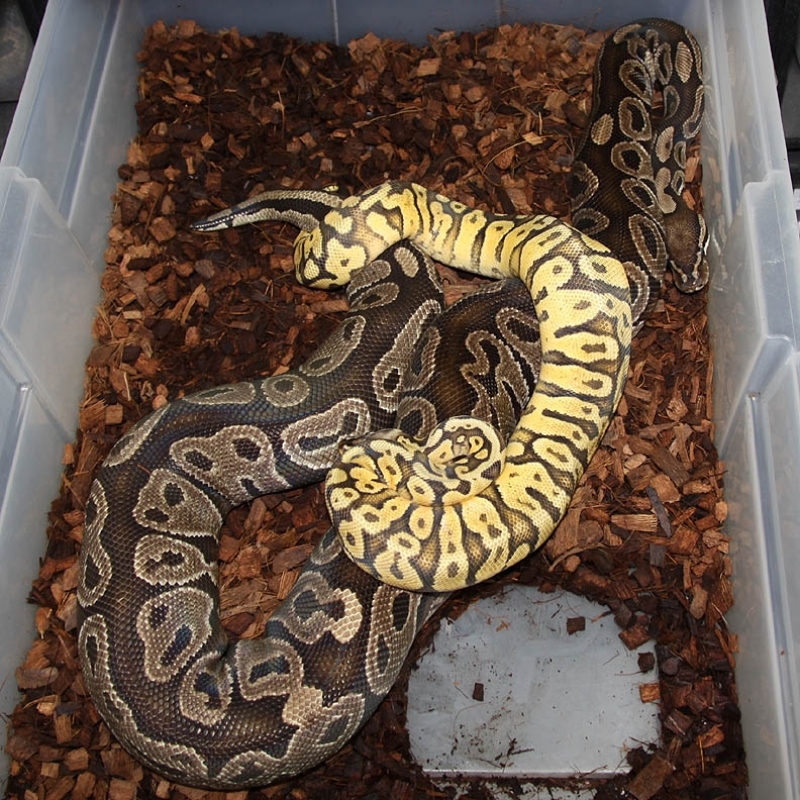 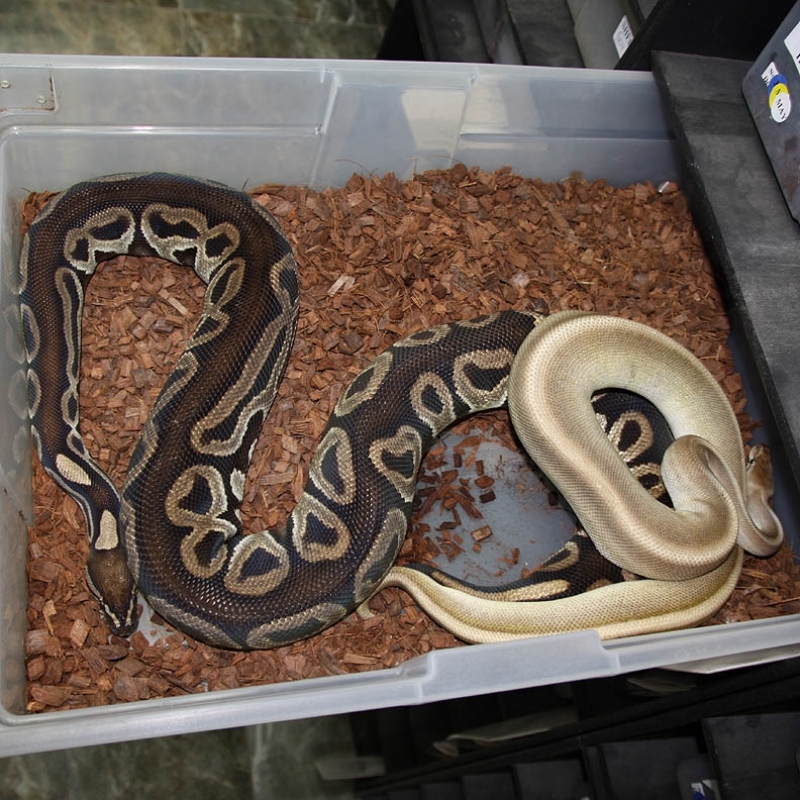 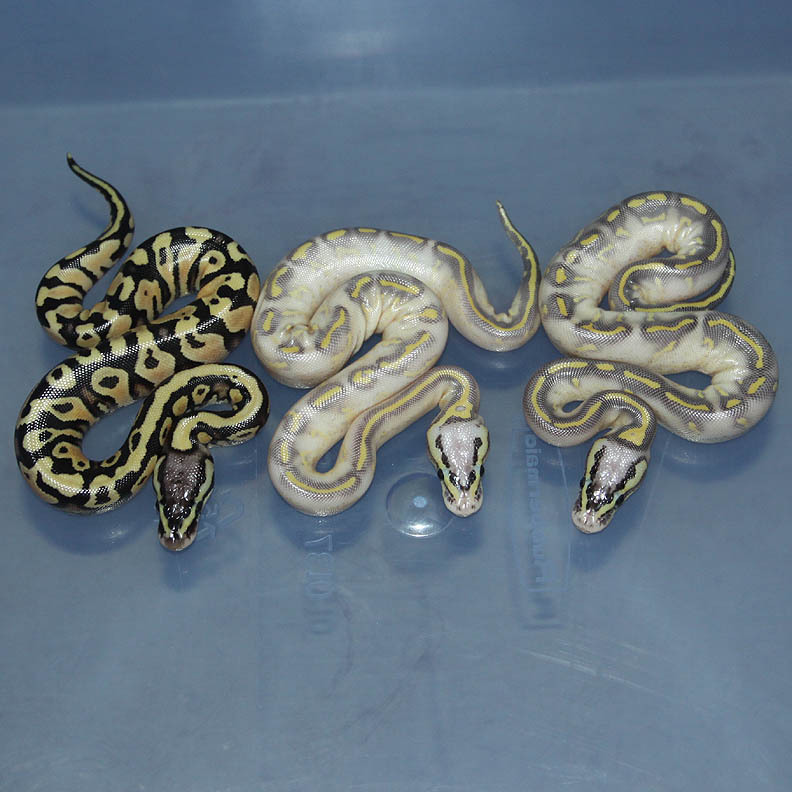 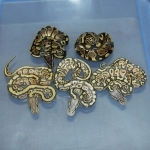 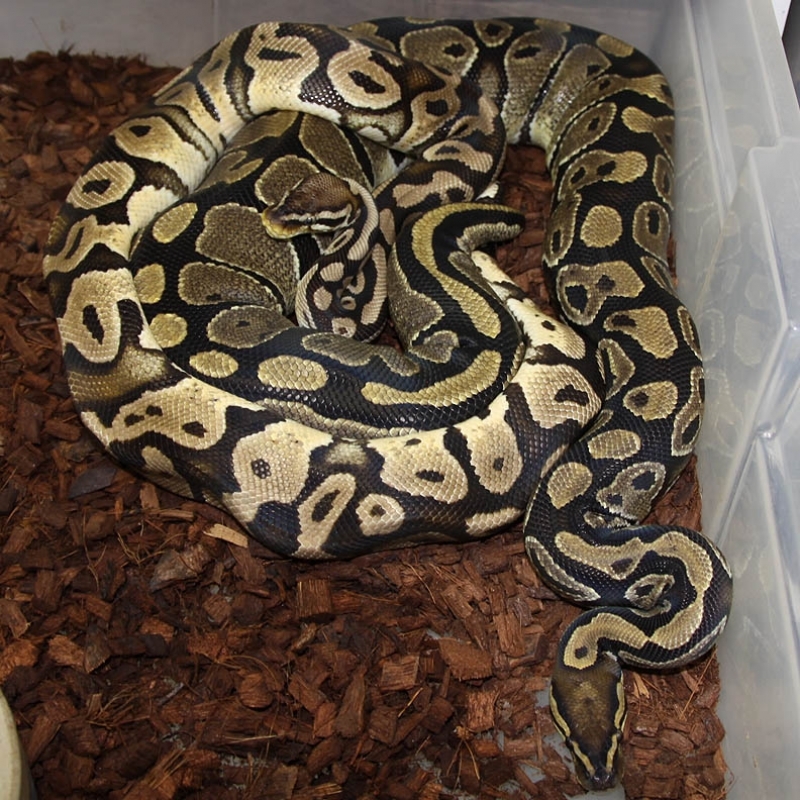 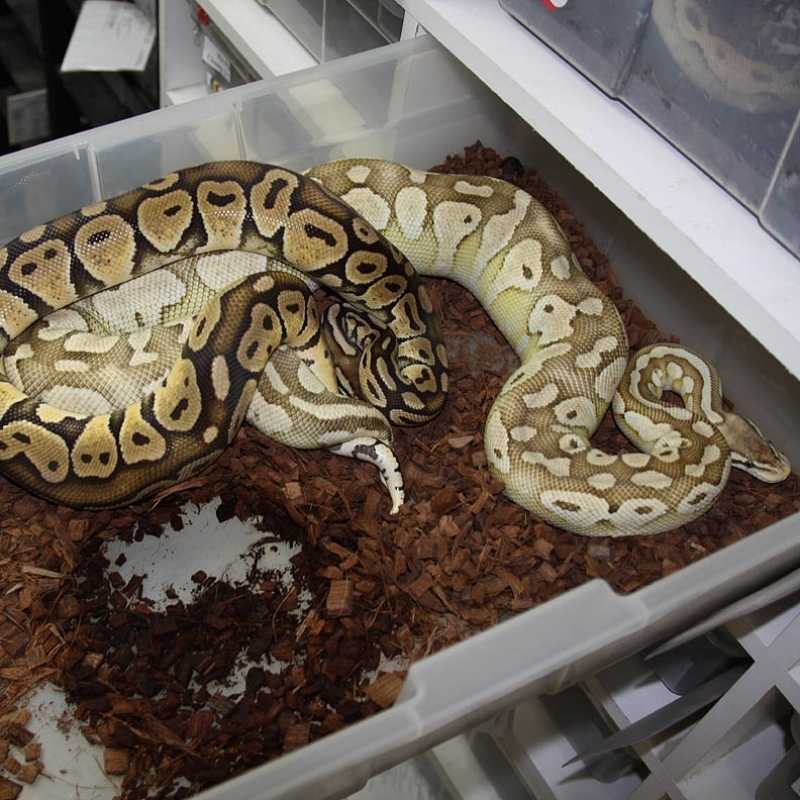 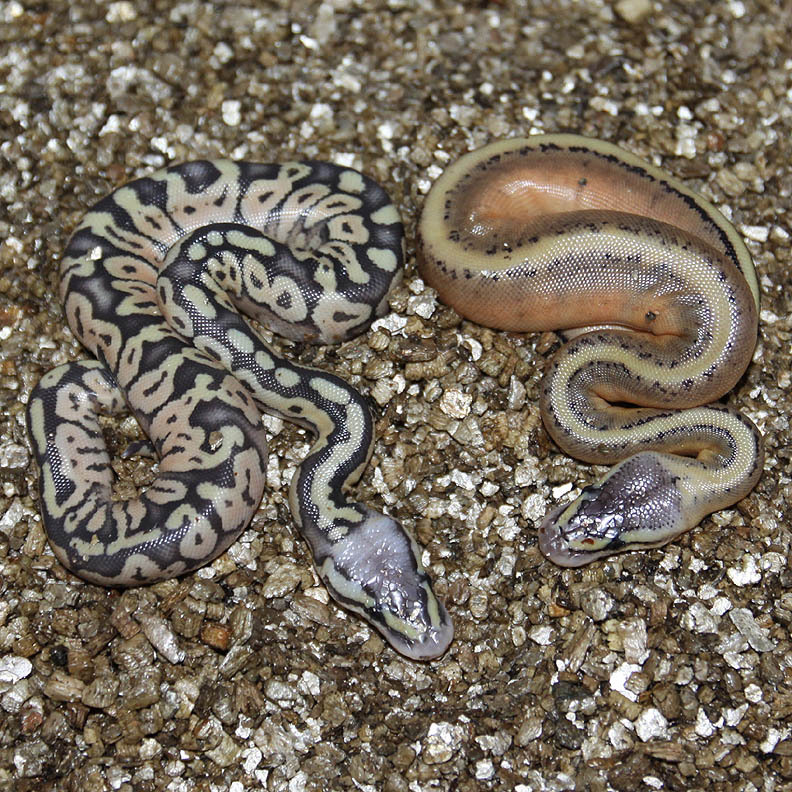 Description: Pastel Green Ghost HRA 1/11 x Pastel Lesser Red Axanthic Het Green Ghost 1/11. 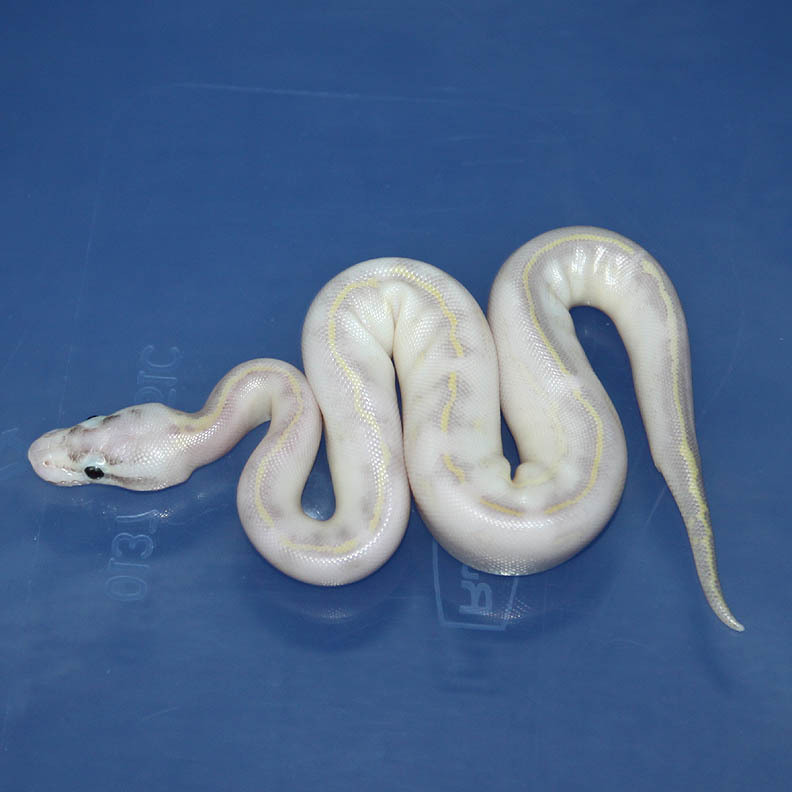 Description: Pastel Ivory 1/11 x HY YB 1/09. 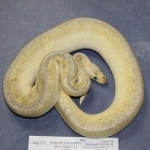 Description: Lesser Ivory 1/12 x Pastel Sugar 1/10 Henry. 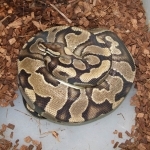 Description: Lesser Het Caramel 1/12 x Pastel Het Caramel 2/06. 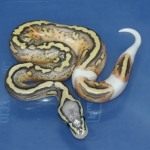 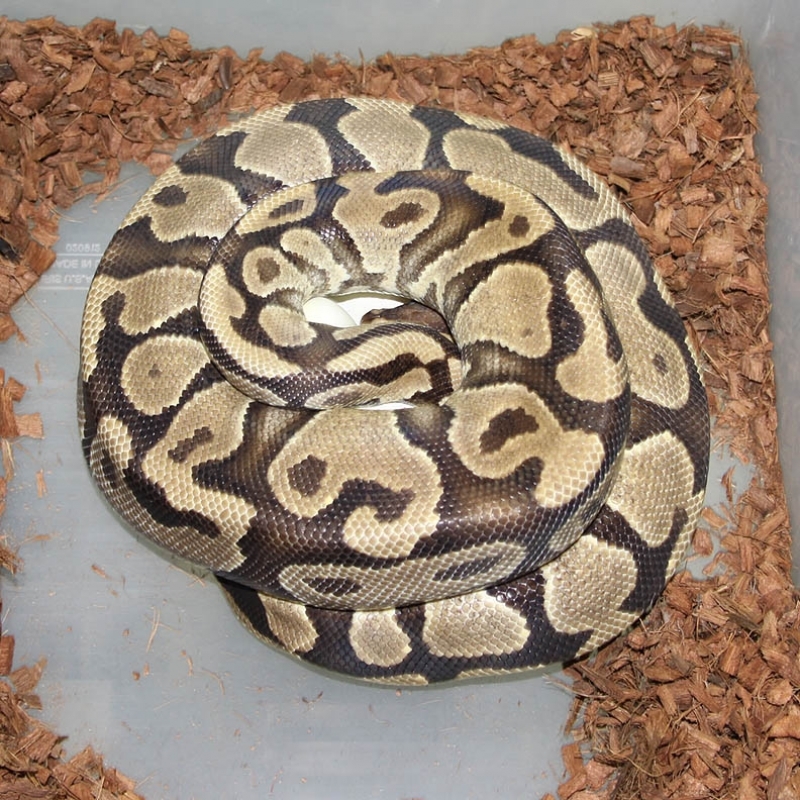 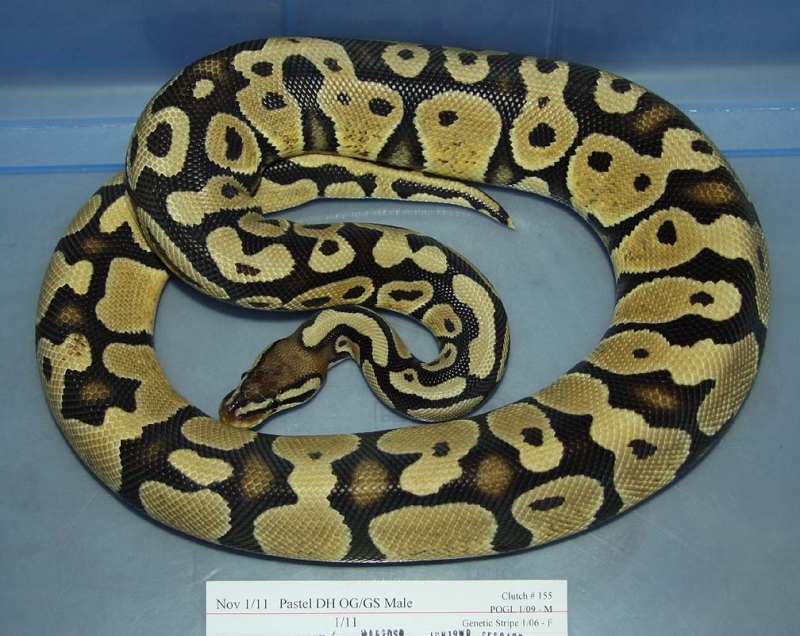 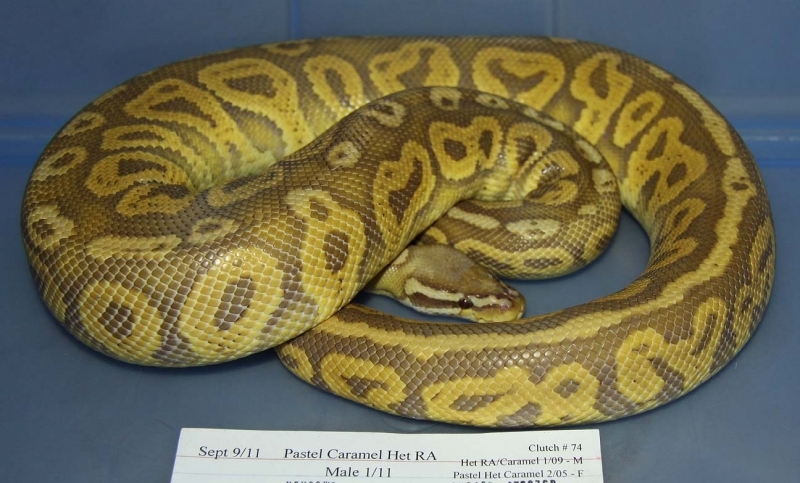 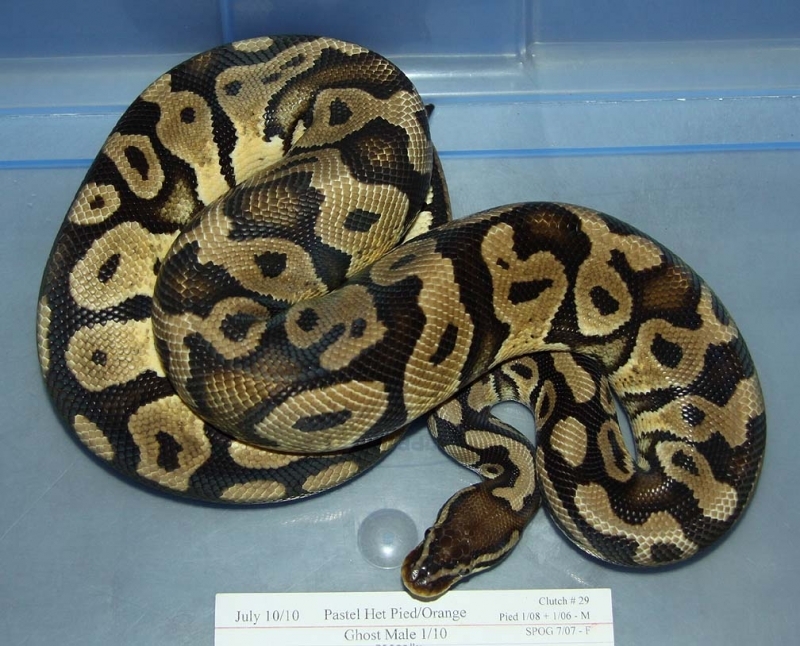 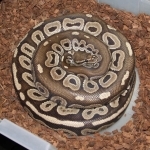 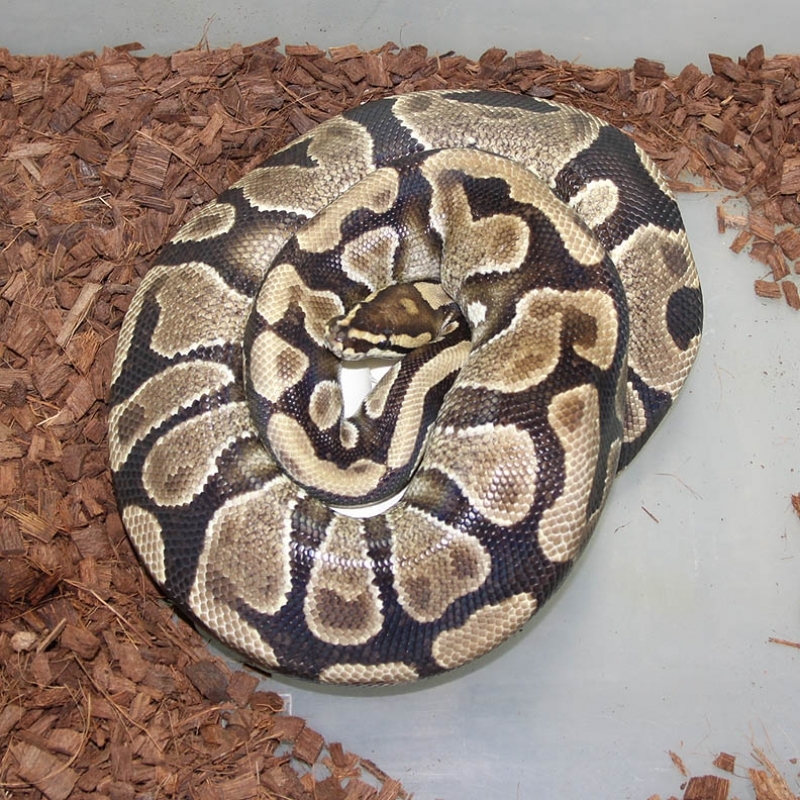 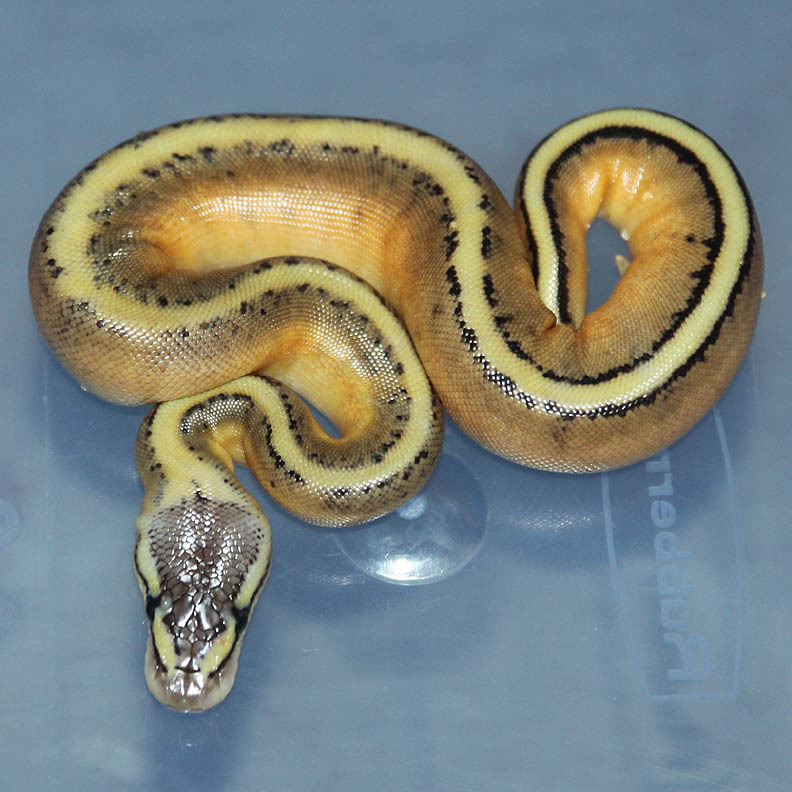 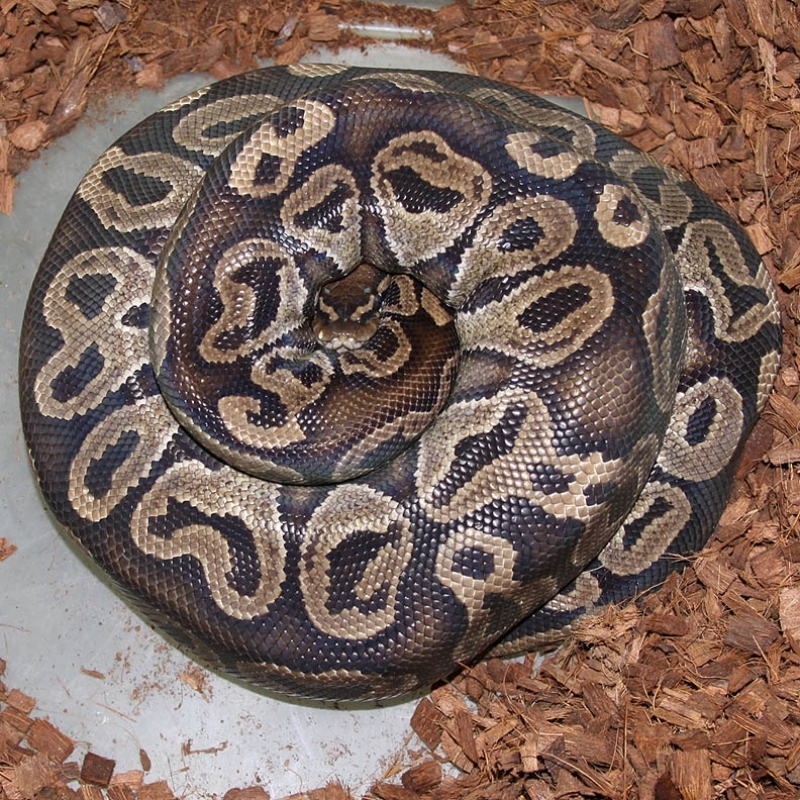 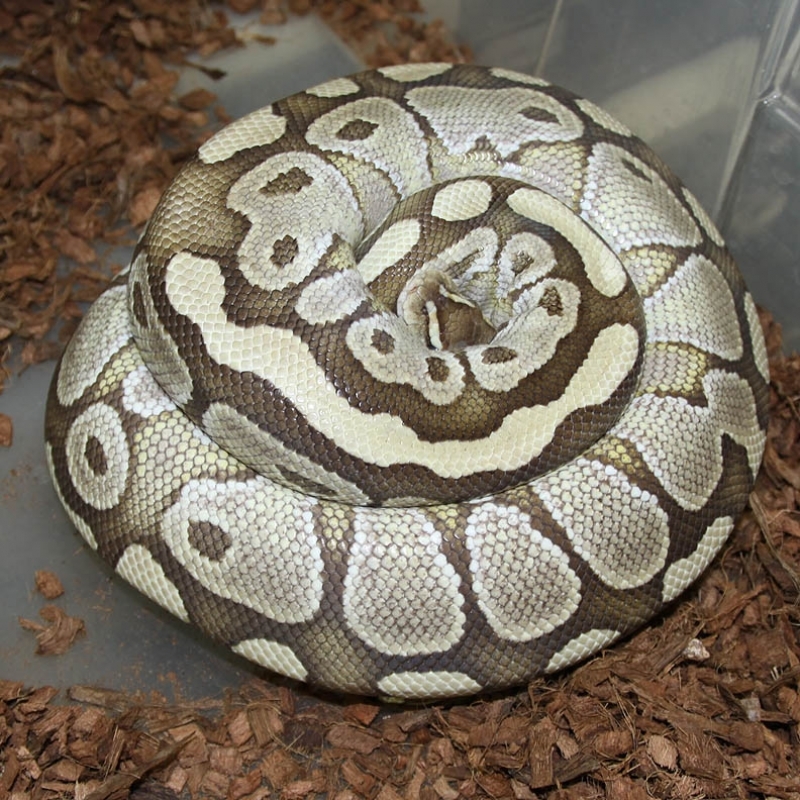 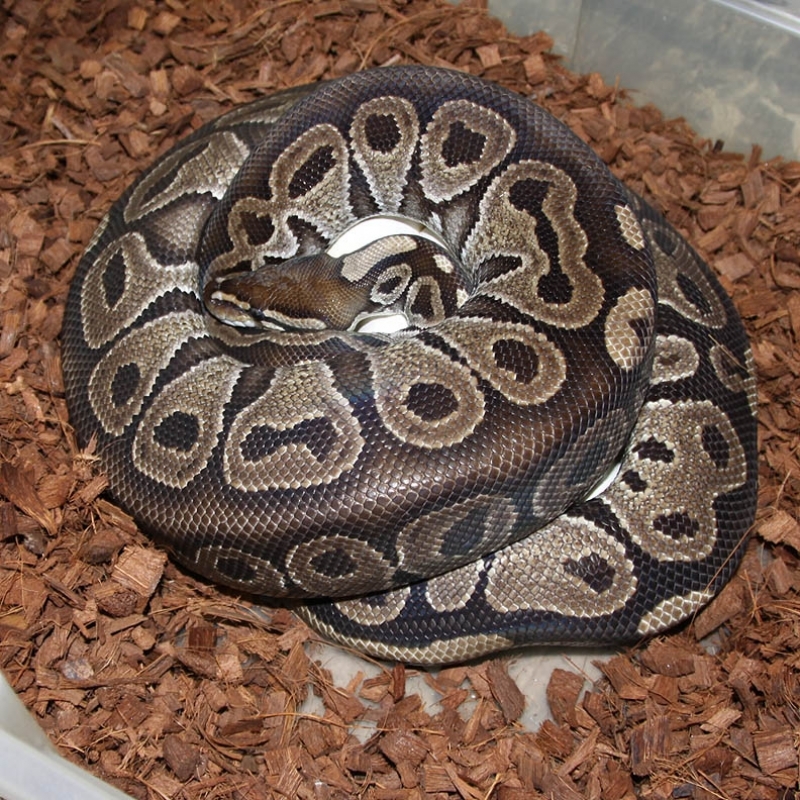 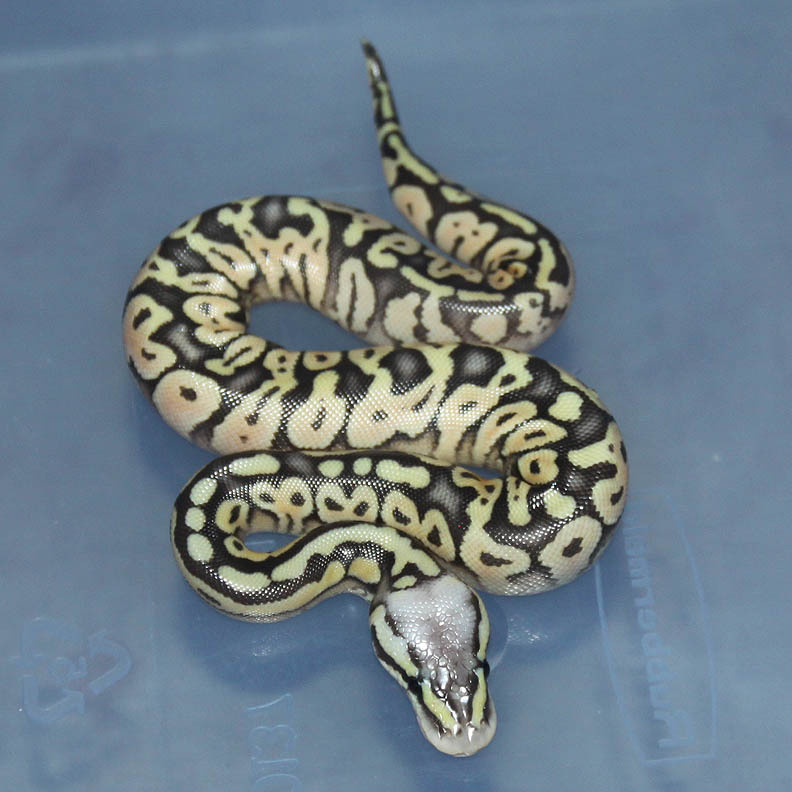 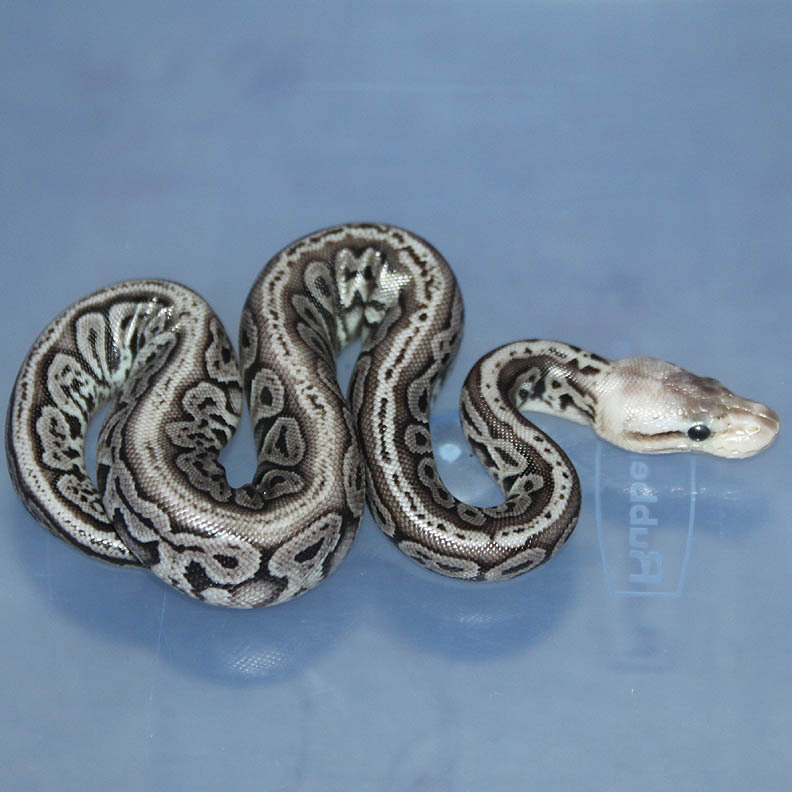 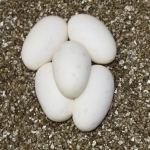 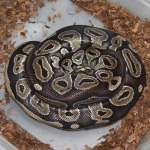 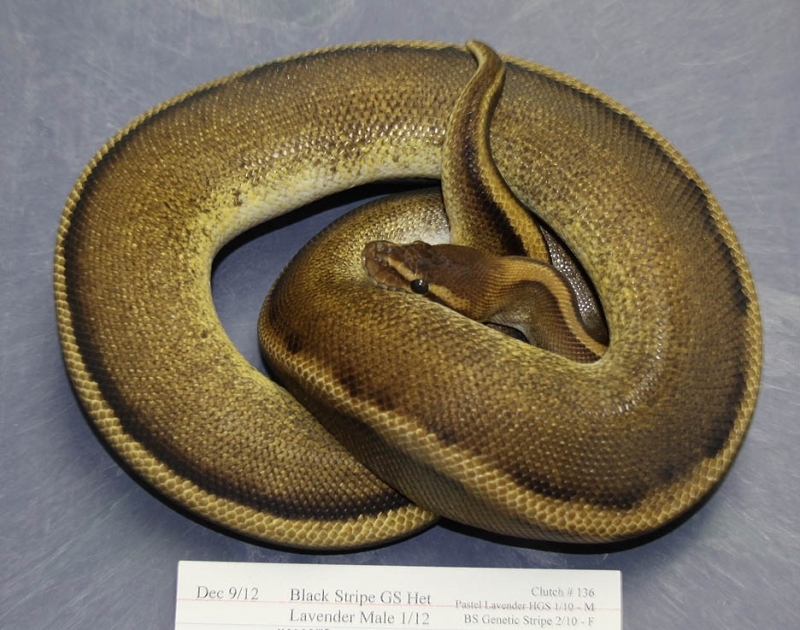 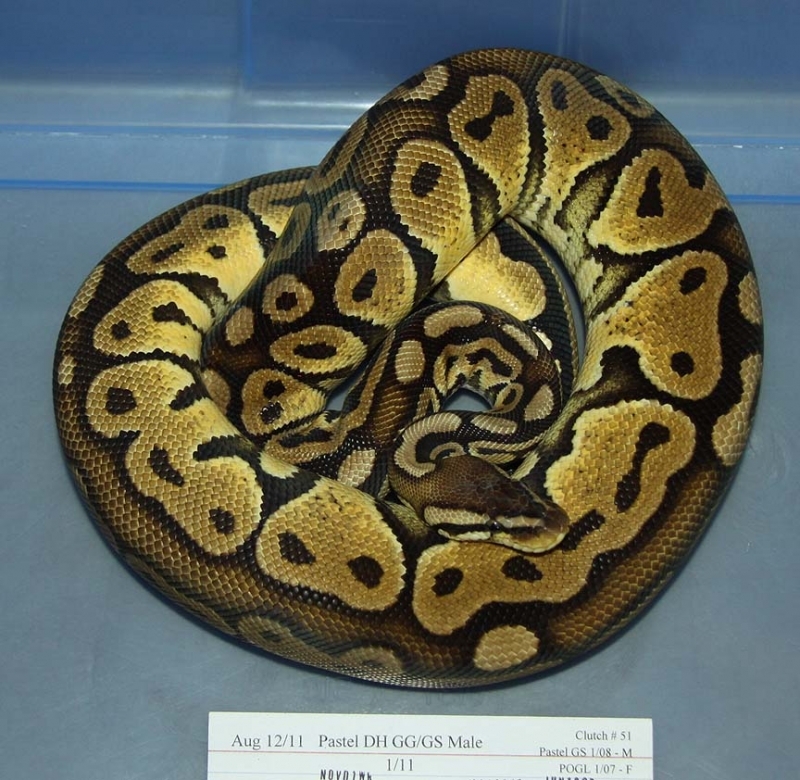 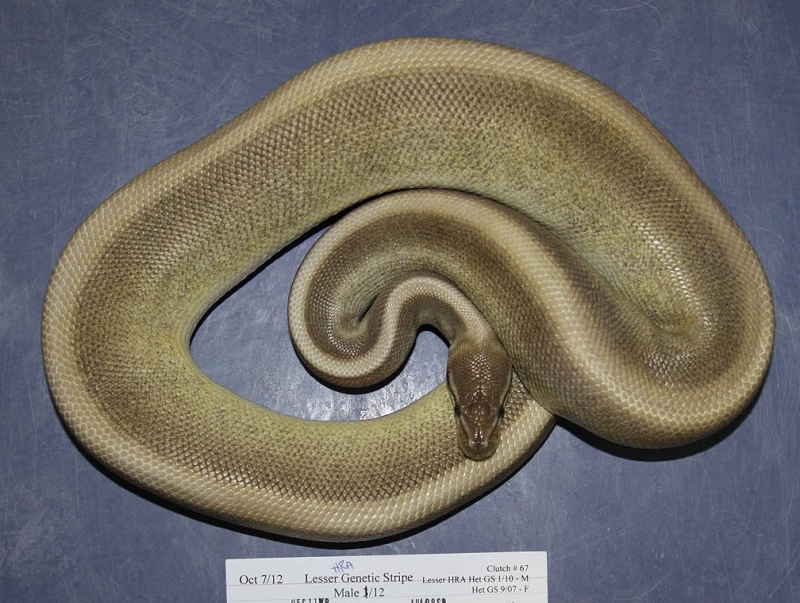 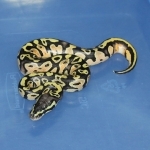 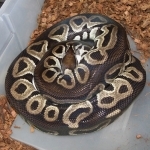 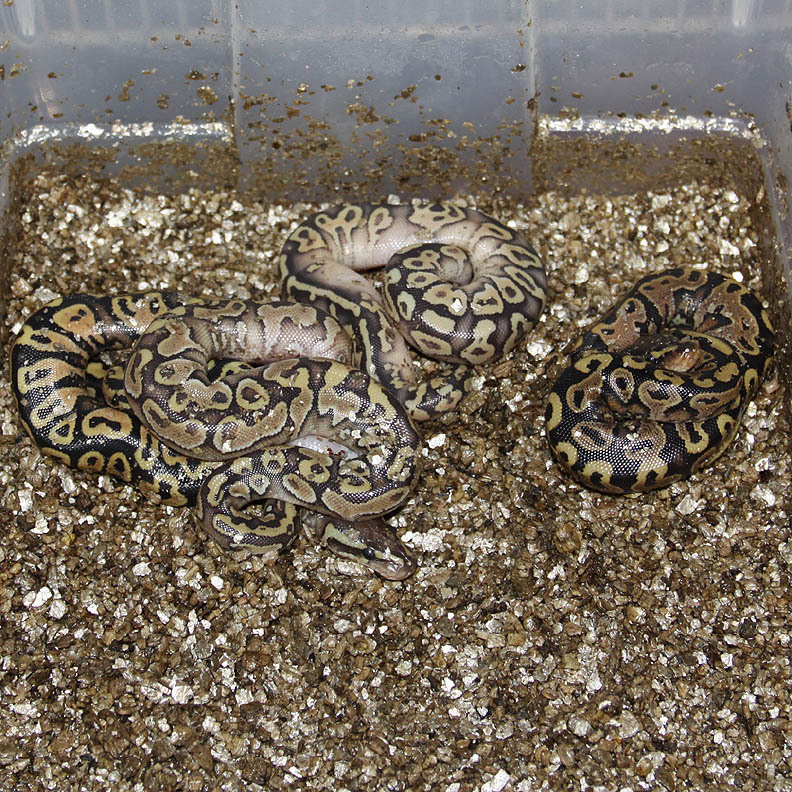 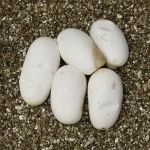 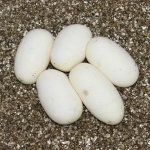 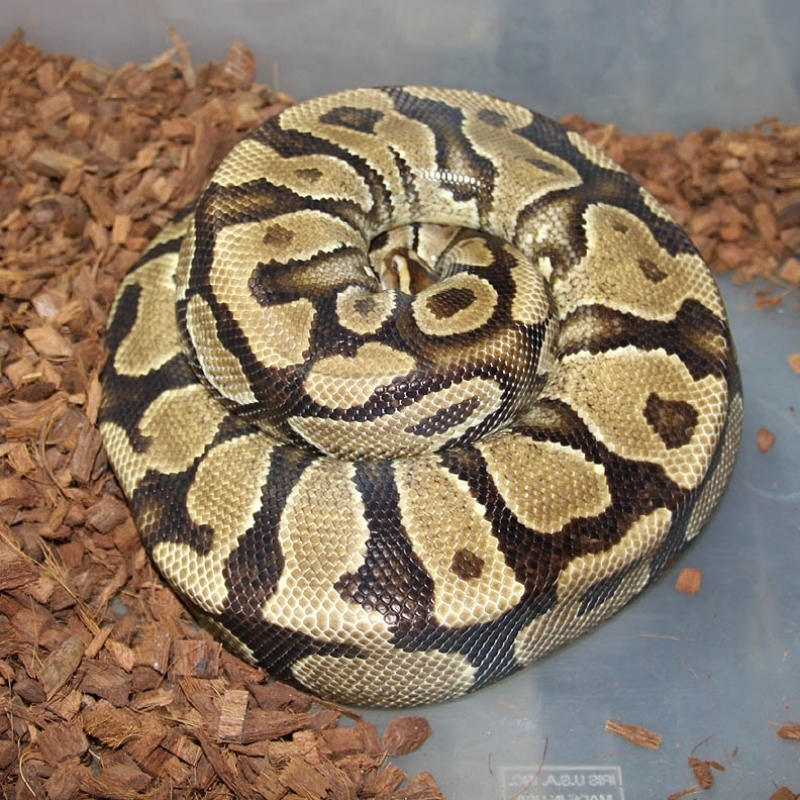 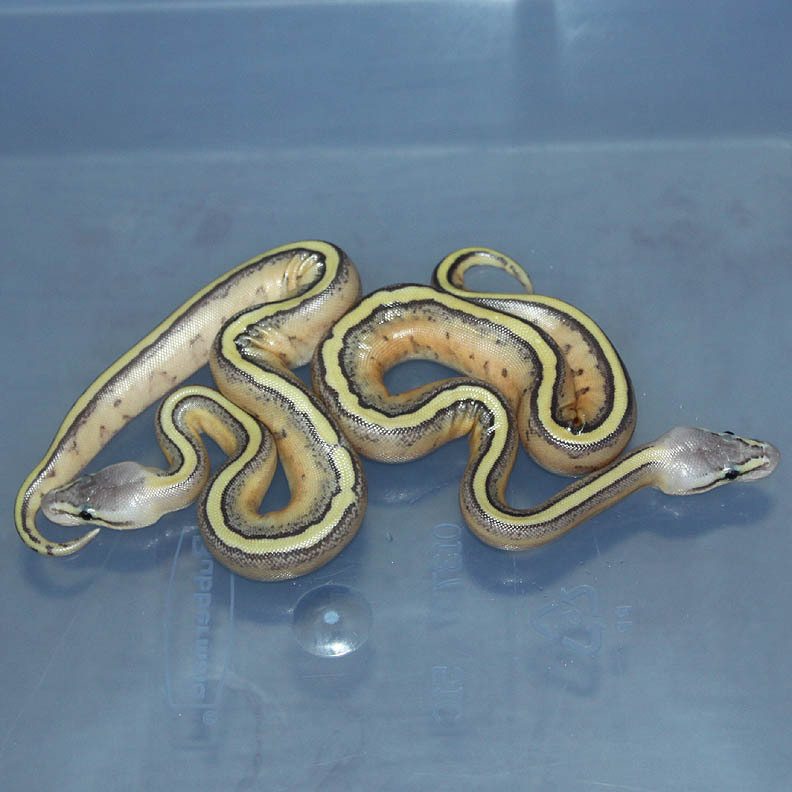 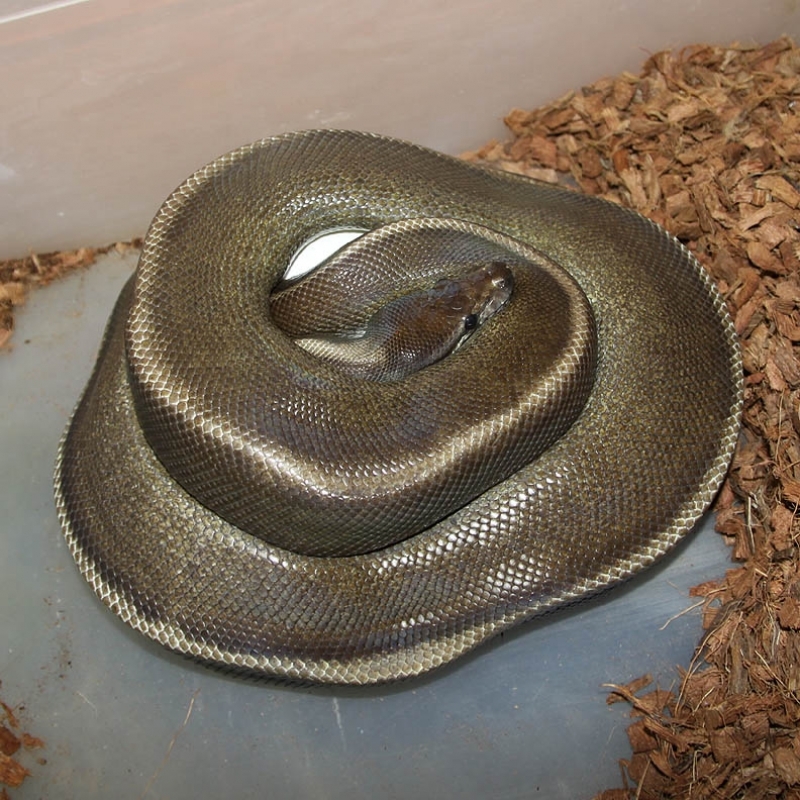 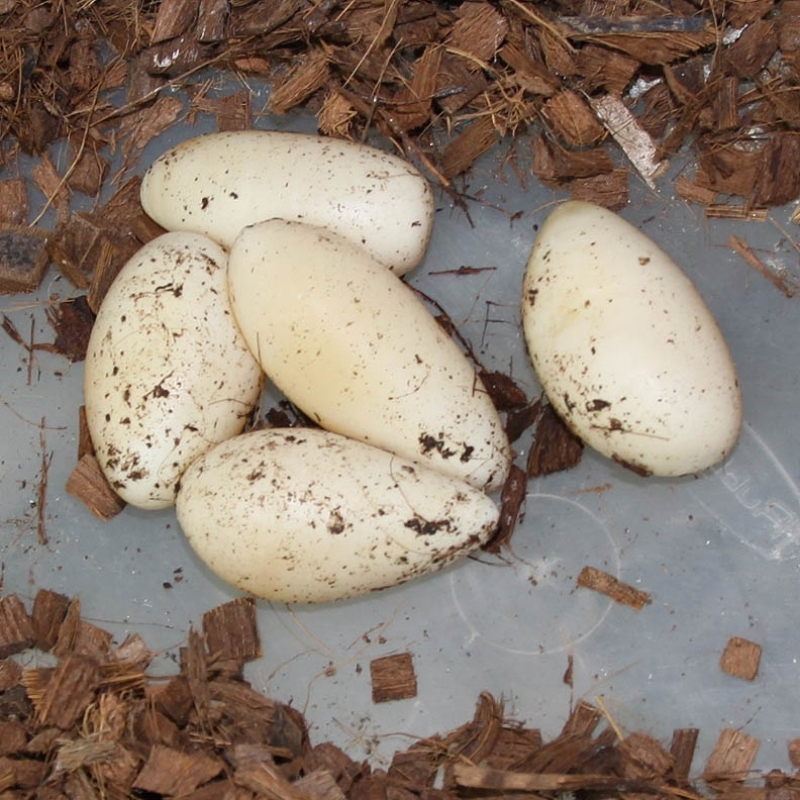 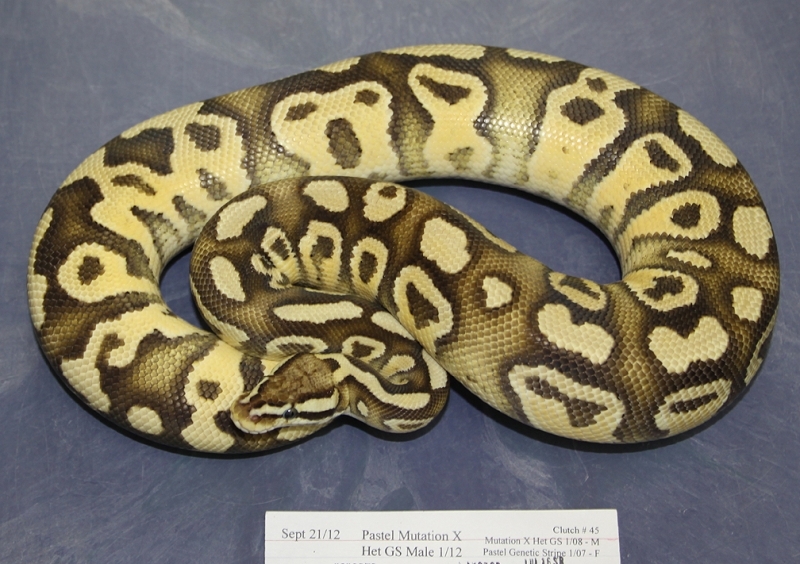 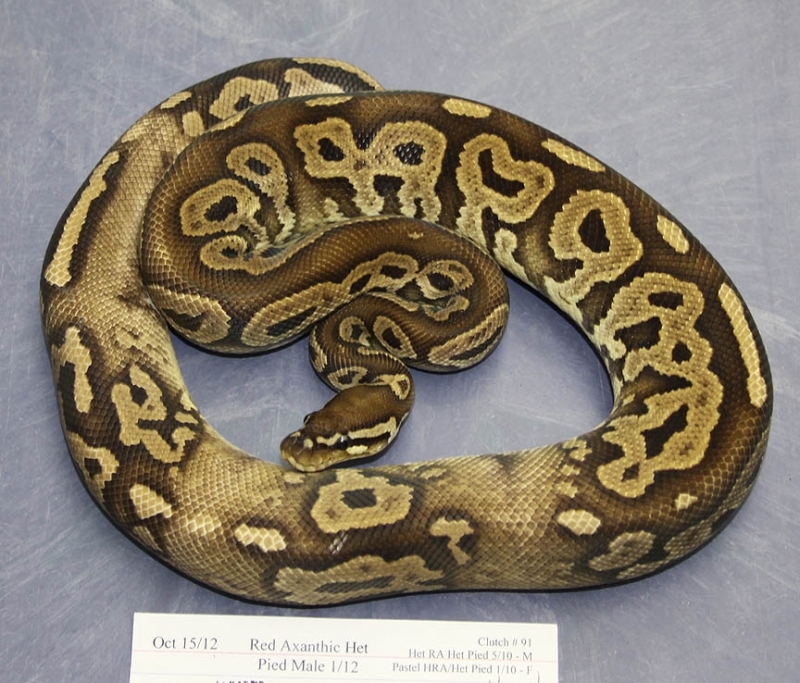 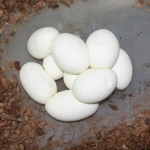 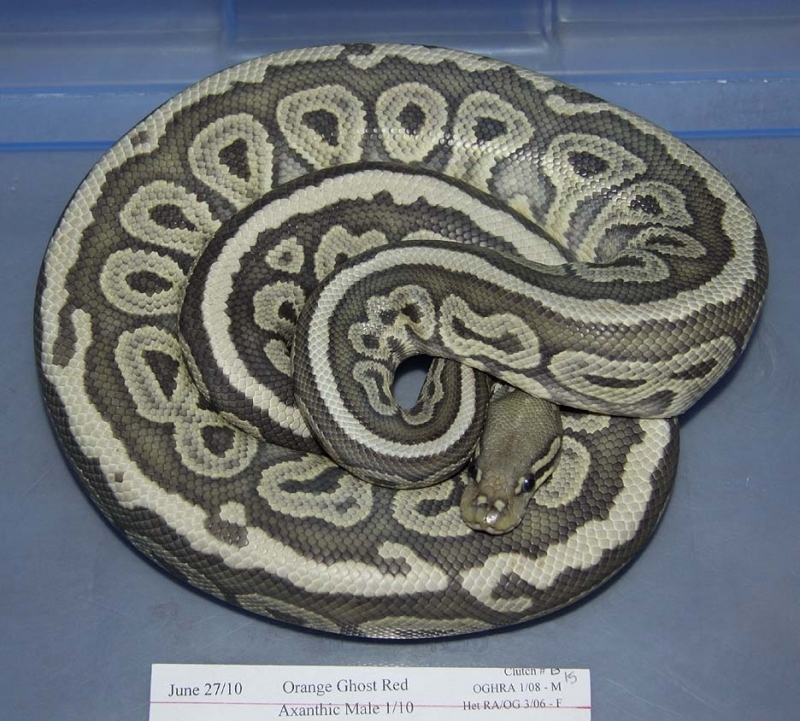 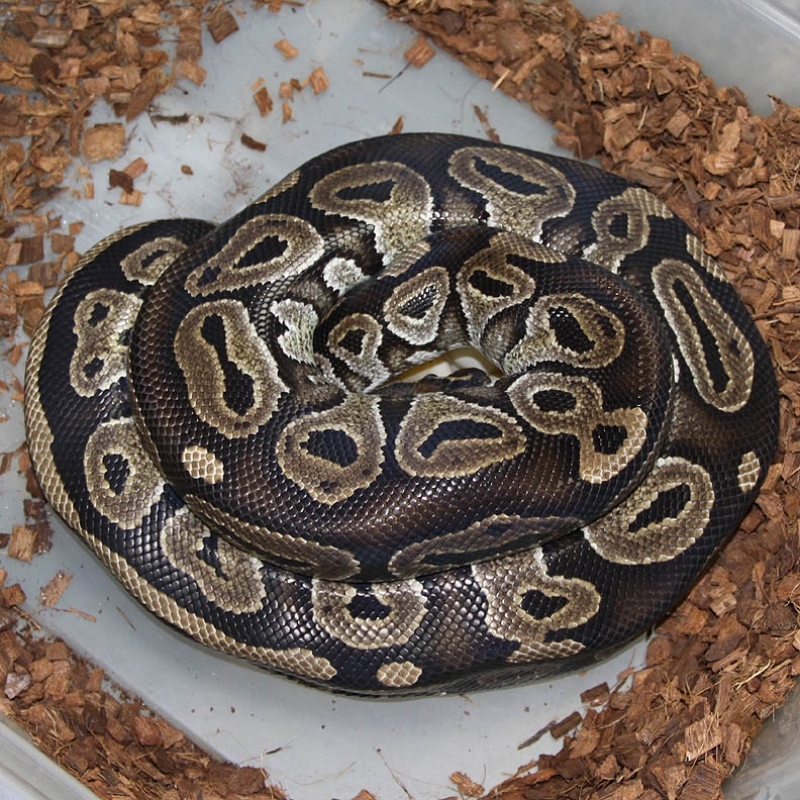 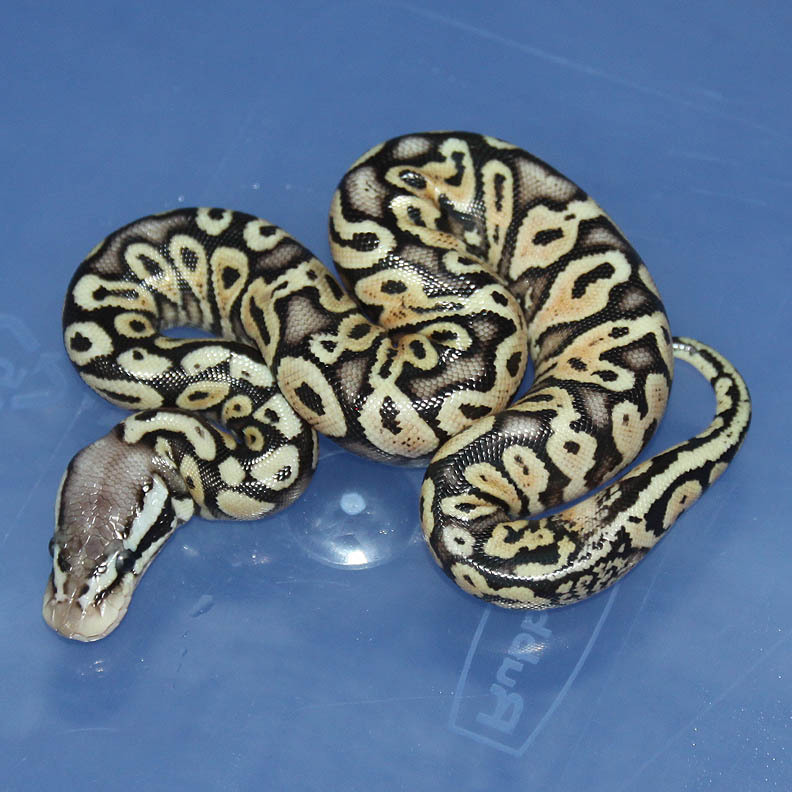 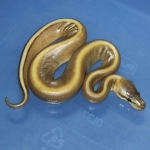 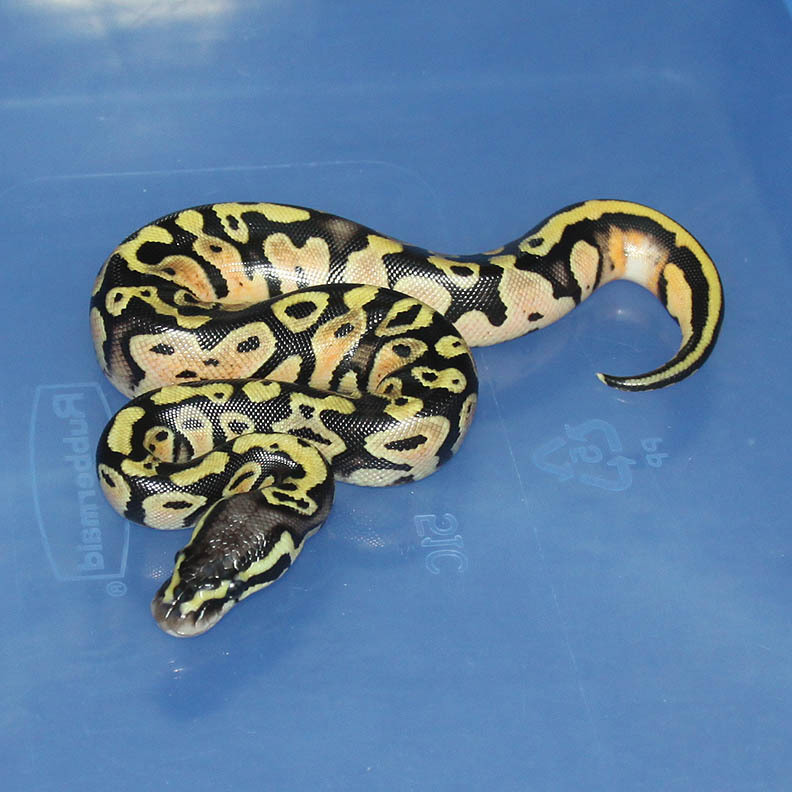 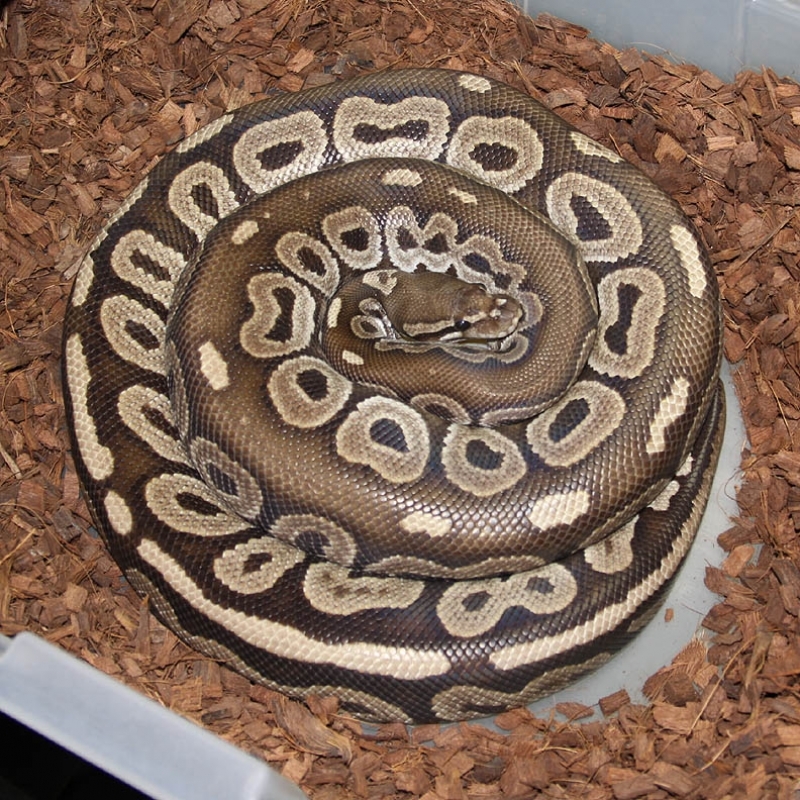 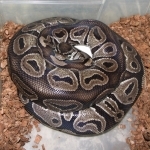 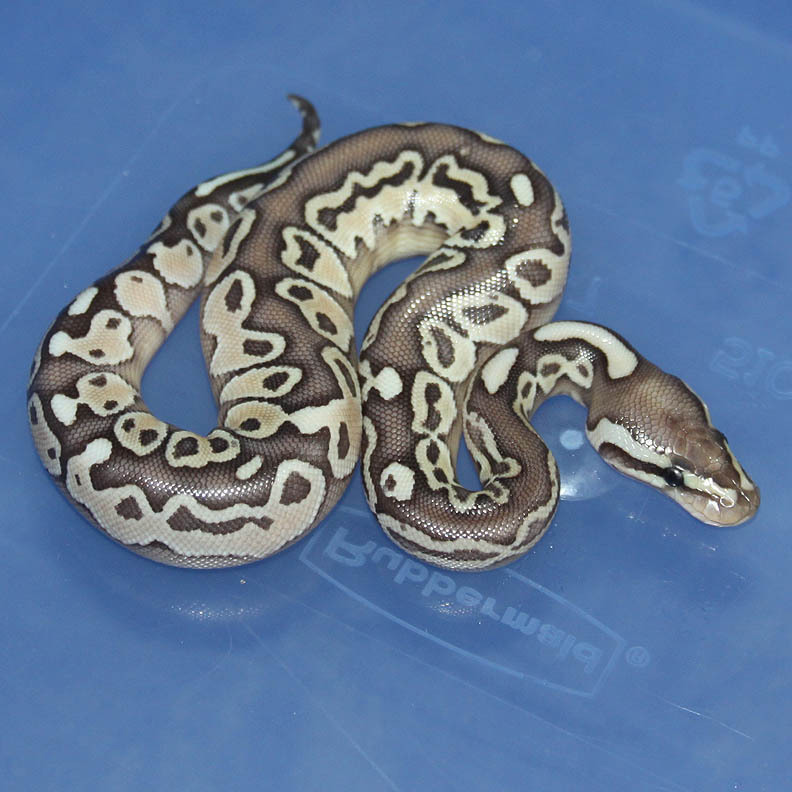 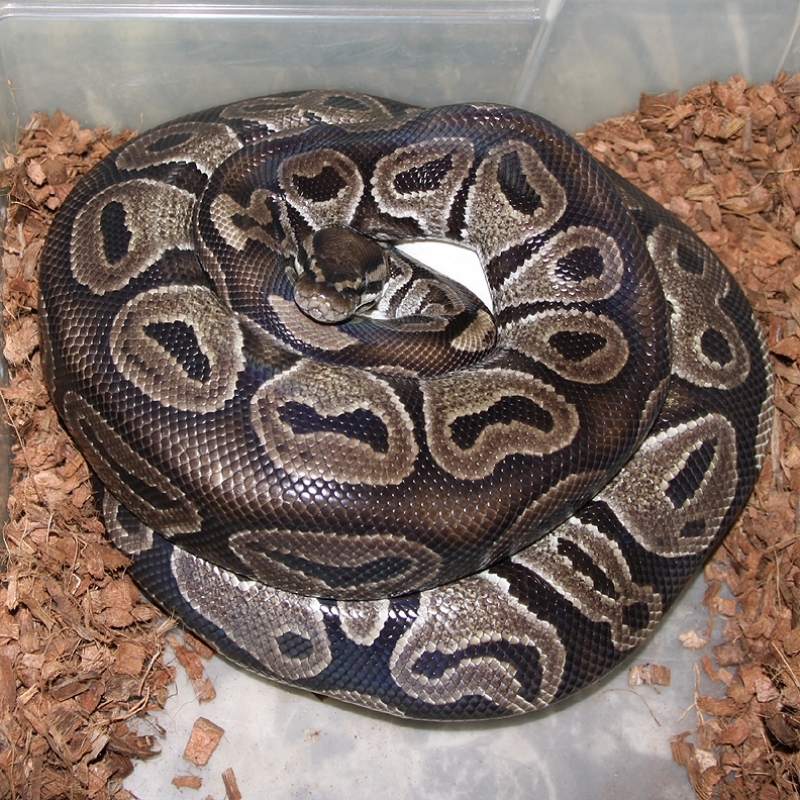 Description: Lesser Banded 1/10 x Het RA/Banded 2/11. 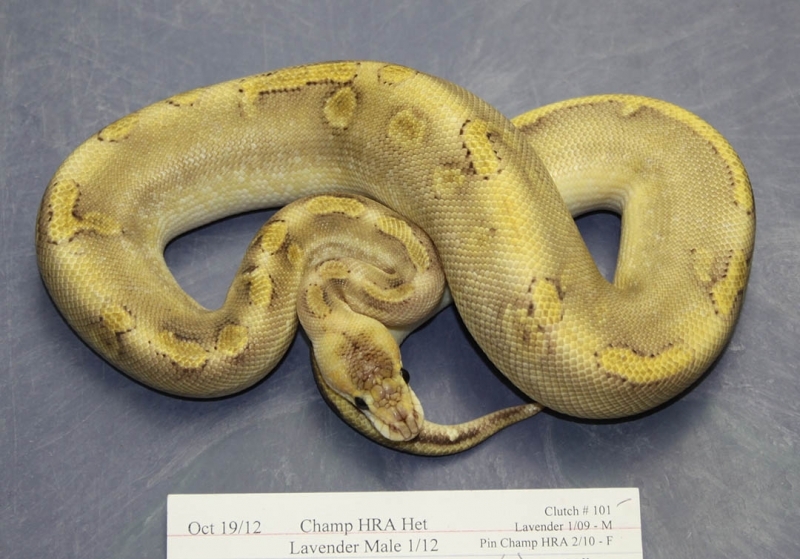 Description: Champagne HRA Het Lavender 1/12 x Het Lavender 2/09 KGB. 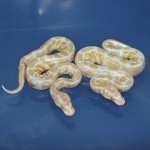 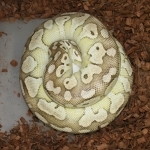 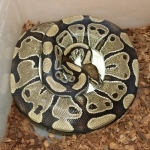 Description: Super Pastel Puzzle 1/12 x Pied 2/06. 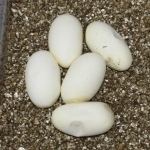 Description: Red Axanthic Pin Champagne 2/12 x Pied 10/11. Description: Red Axanthic Orange Ghost 1/10 x Super Pastel Champagne PHOG 1/11. 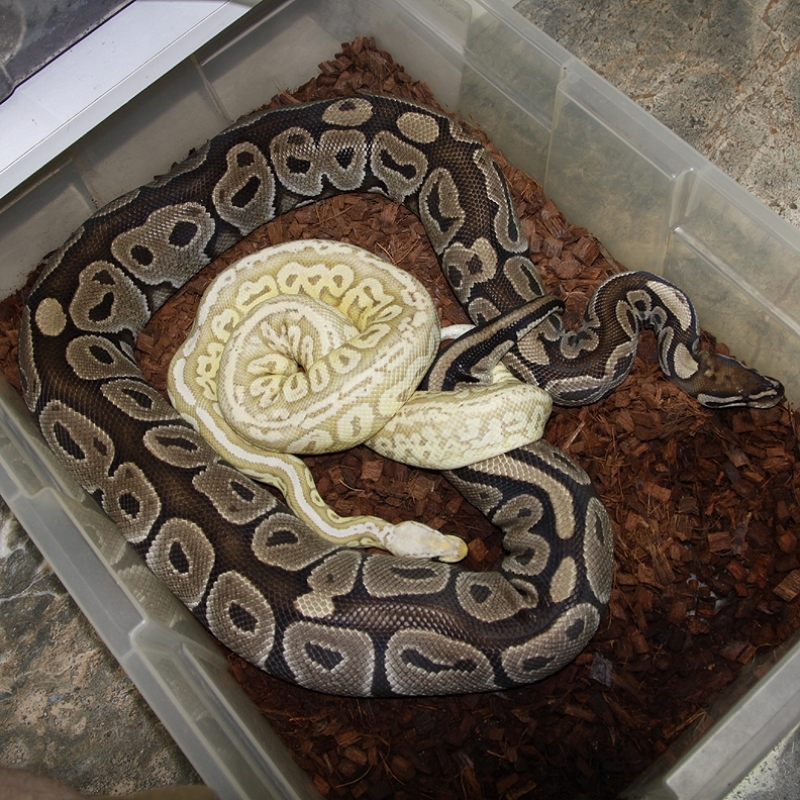 This should prove if the SP Champ is a Het Orange Ghost or not. 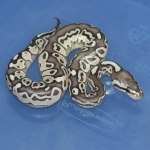 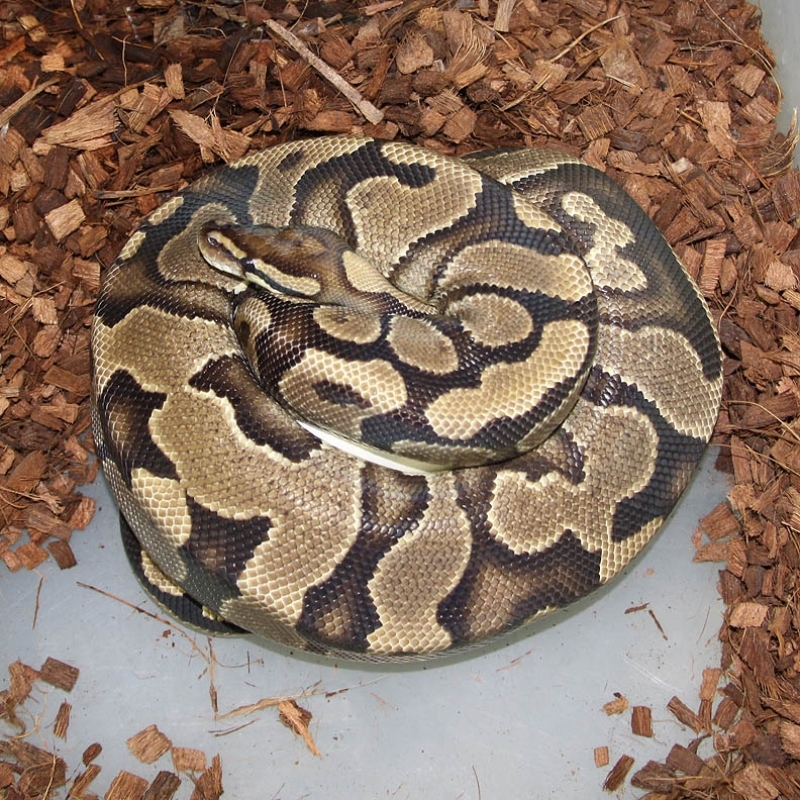 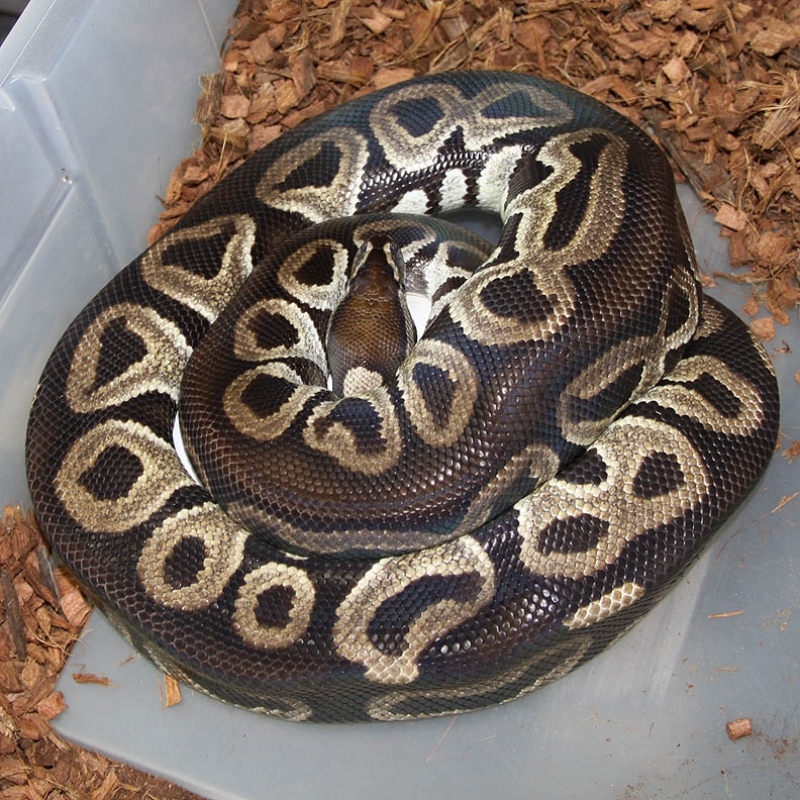 Description: Red Axanthic Het Pied 1/12 x Het RA Het Pied 13/10. 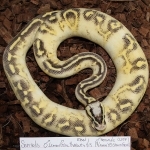 This guys is a really nice Ringer! 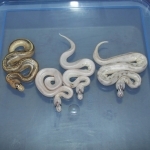 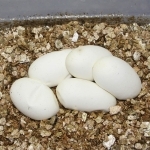 Description: DH OG/Pied 1/10 x Pastel DH OG/Pied 3/11. 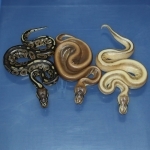 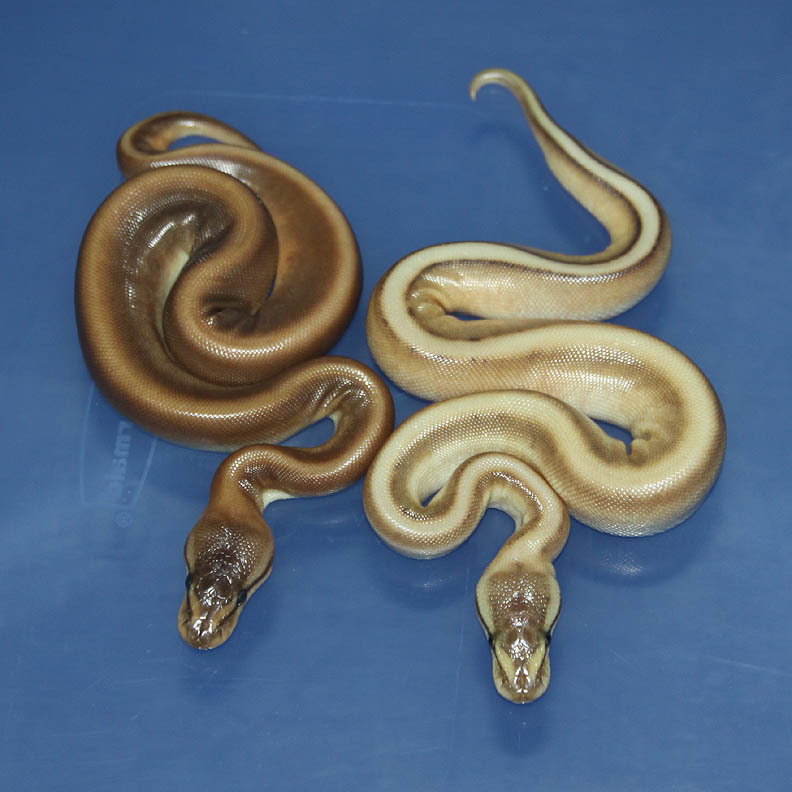 Description: Pastel Red Axanthic Caramel 1/11 x Het Red Axanthic Het Caramel 1/09. 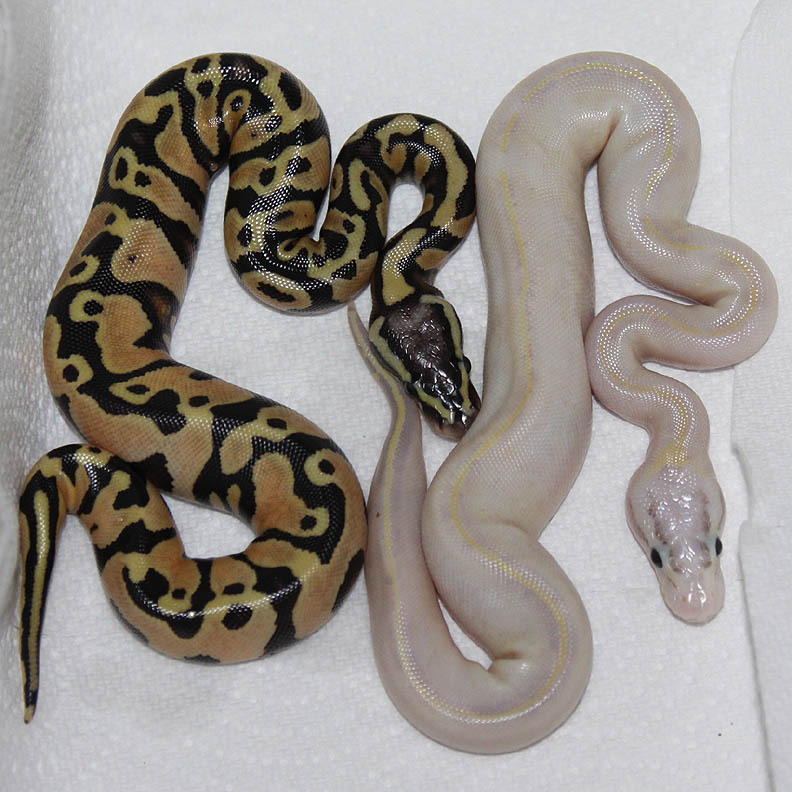 These guys are really nice!! 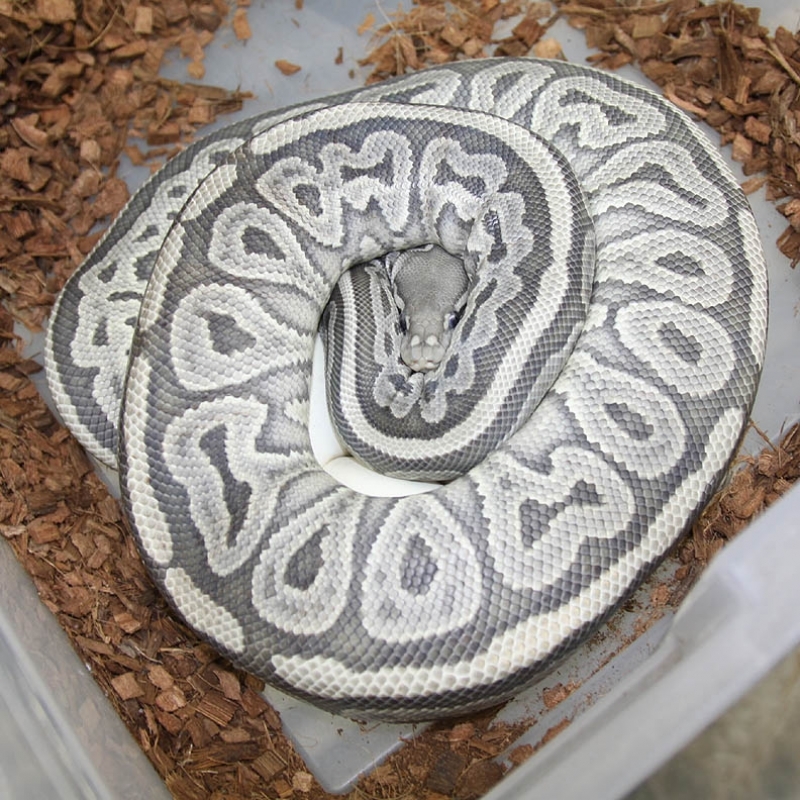 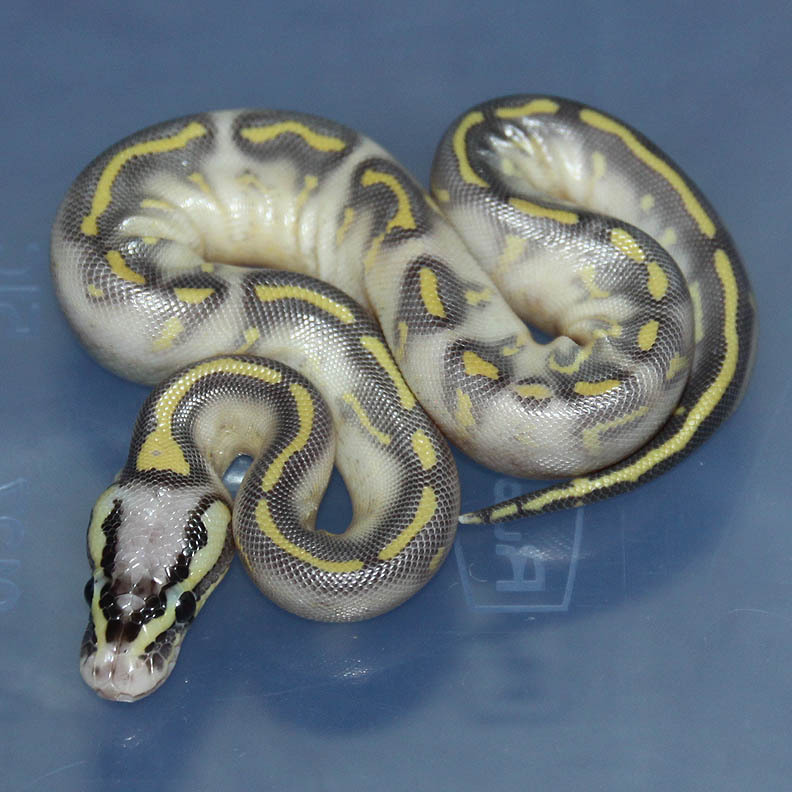 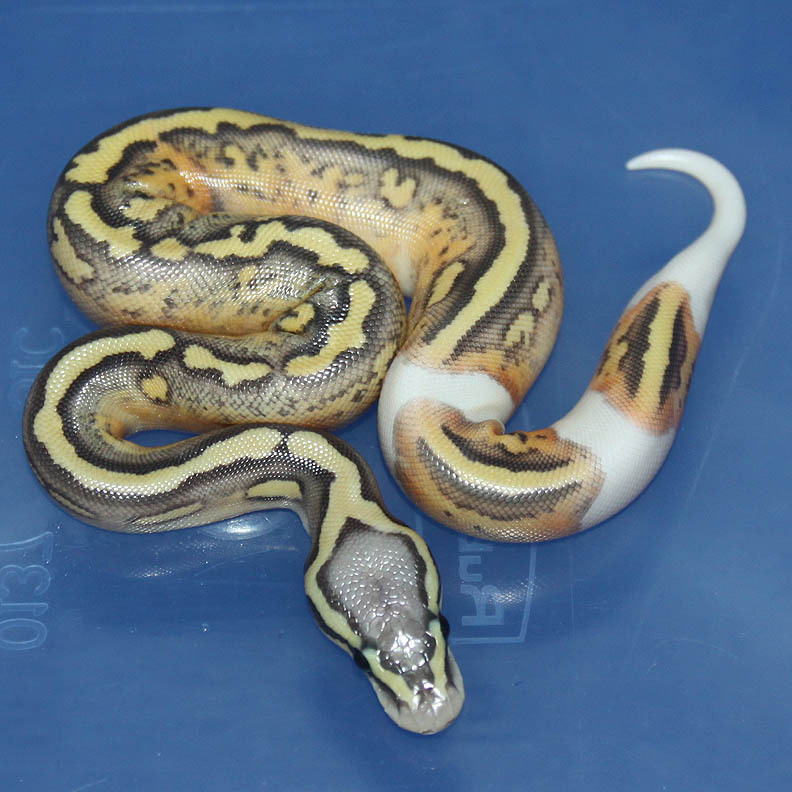 Description: Mutation X Pastel Het Genetic Stripe 1/12 x Super Pastel Het Genetic Stripe 4/10. 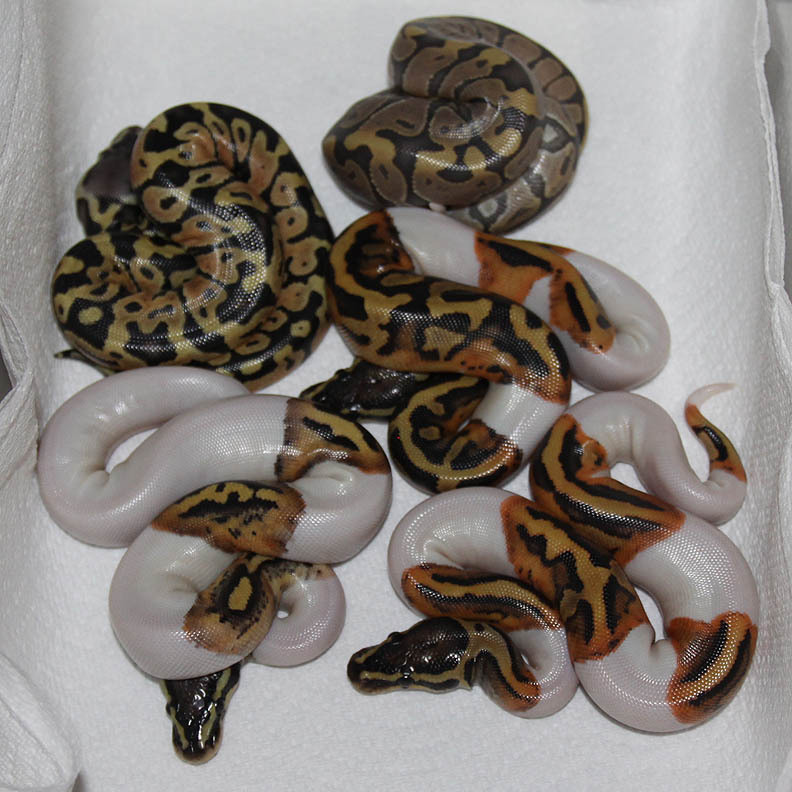 Description: Pastel Red Axanthic Chocolate 1/12 x Het Red Axanthic 9/06. 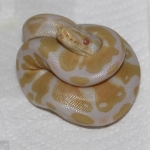 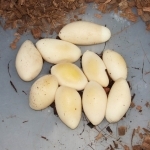 Description: Lesser Caramel 1/12 x Pastel Pos Double Het Albino/Caramel 2/09. This Pastel Pos DH Albino/Caramel female is a remnant from trying to prove out my original 1998 Het Caramels. 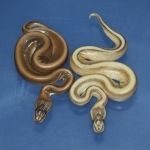 In 1998 I purchased a pair of 100% Het Caramels from Kevin McCurley of New England Reptile Distributors (NERD Inc) in the USA for $10,000 US funds. 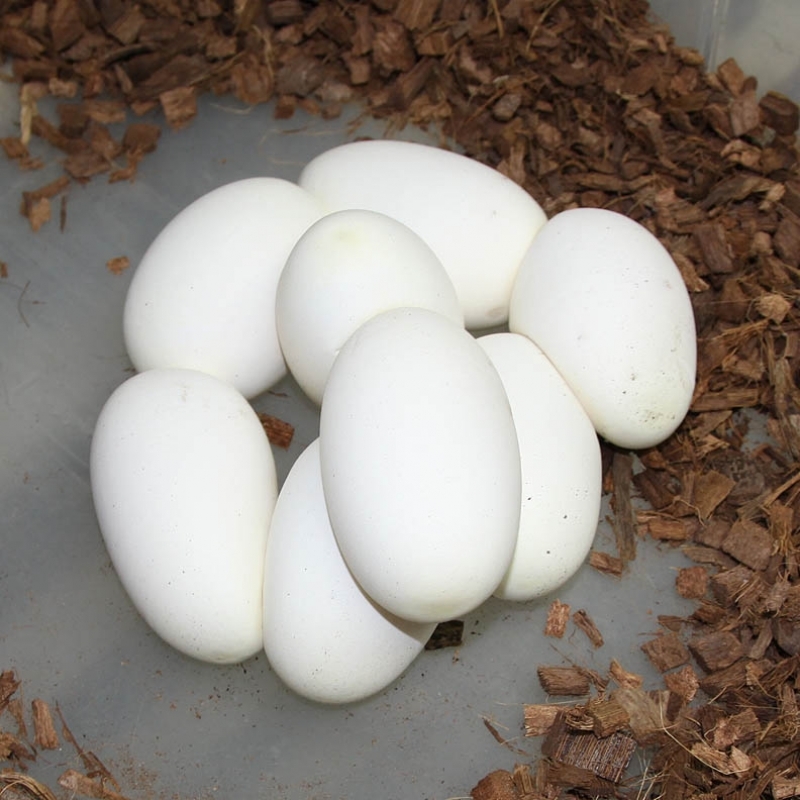 Well, I never produced Caramels out of those animals. I did produce Albinos though. 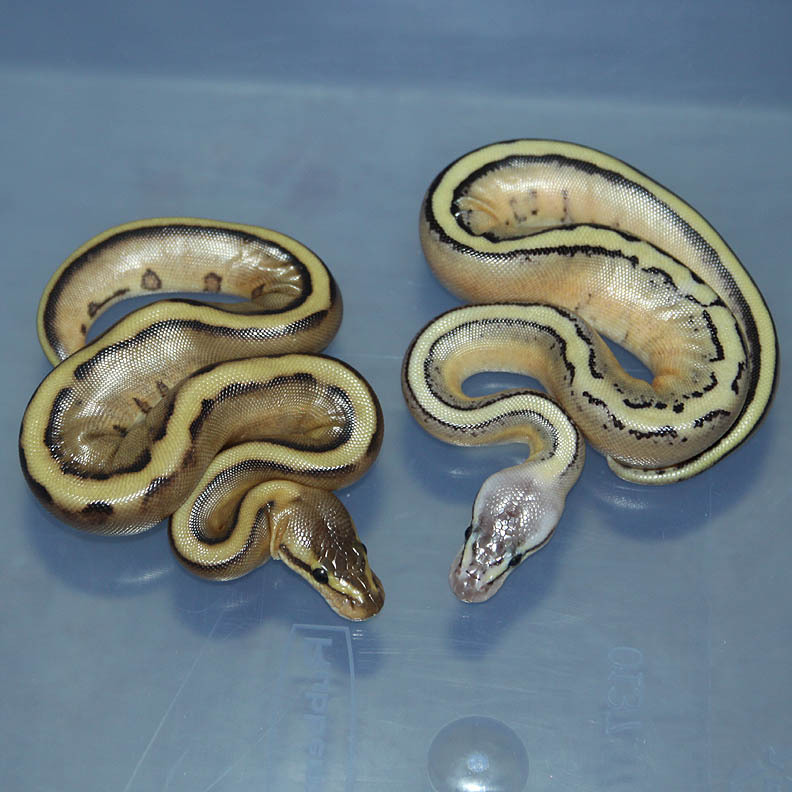 1) Bred the original pair of 100% Het Caramels together 2 years in a row with no Caramels. 2) Purchased a Pastel Het Caramel male from TSK and bred him to the Het Caramel female from NERD 2 years in a row and didn't produce any Caramels. 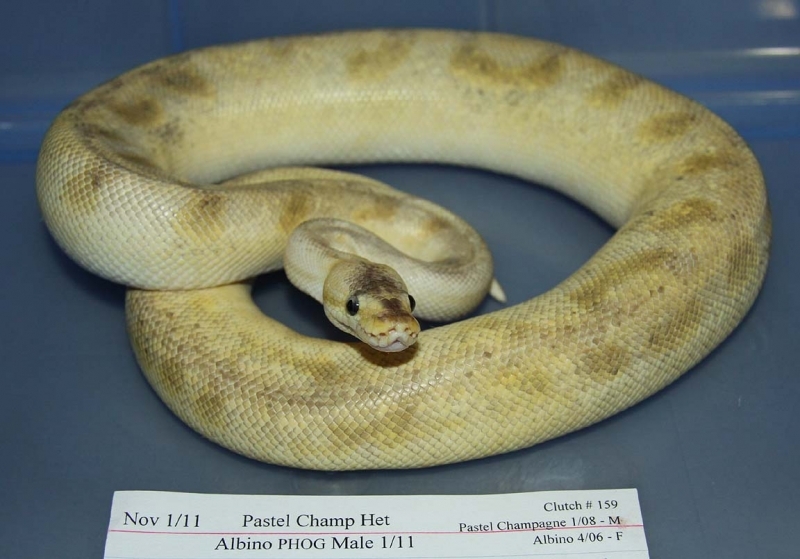 The Pastel Het Caramel from TSK Inc produced Caramels when bred back to his offspring and other legitimate Caramel stock. 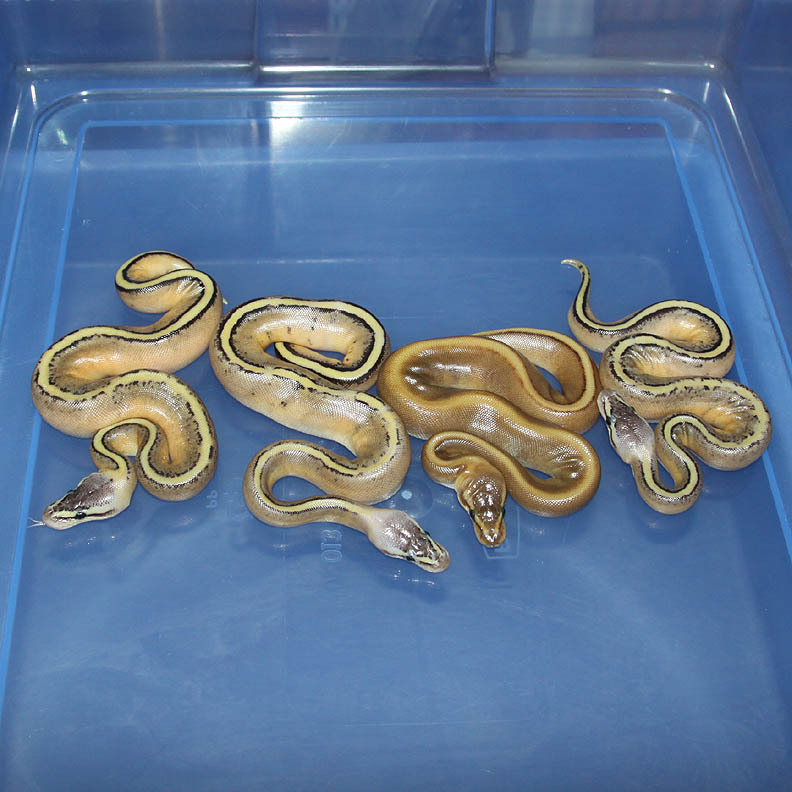 3) Purchased a Caramel male in 2006 from Mark and Kim Bell and bred him to the 1998 Het Caramel female from NERD and again never produced Caramels.